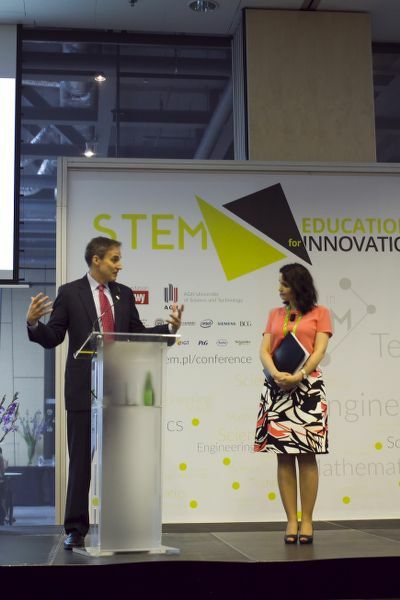 What is STEM? 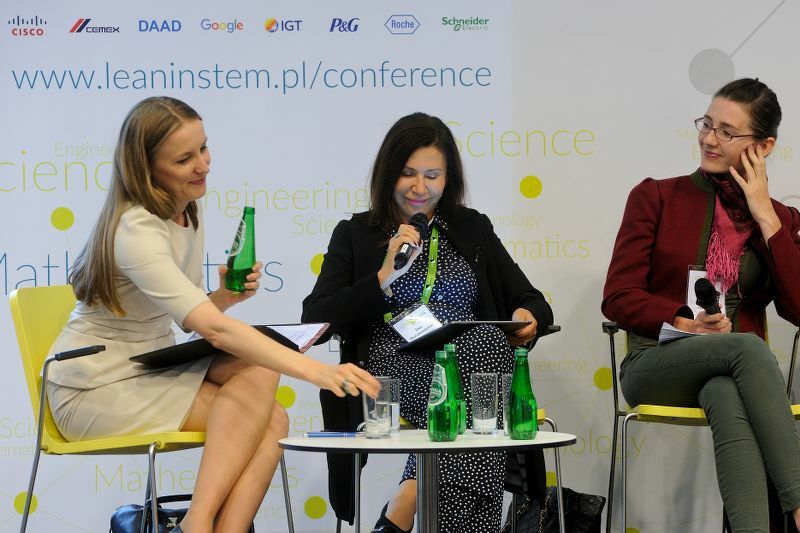 Science, Technology, Engineering, and Mathematics, an area through which the educational and professional path leads to the broadly-understood science, technological industry and the interface of research and industry. 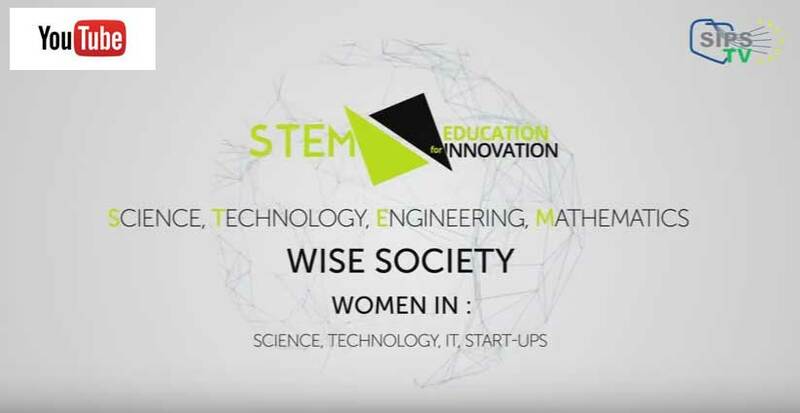 It is precisely at this interface where the most interesting things happen – innovative solutions to problems, both the great civilisational ones and the smaller ones, related to everyday challenges. 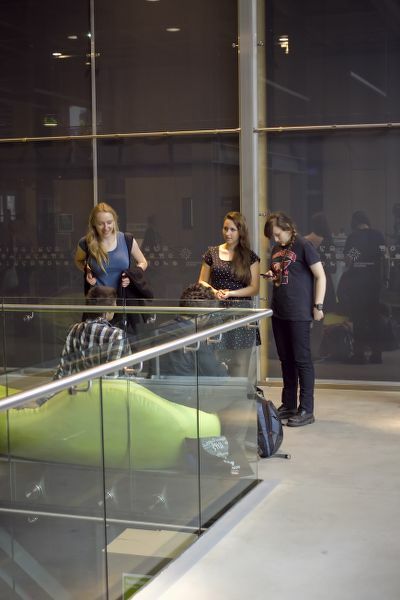 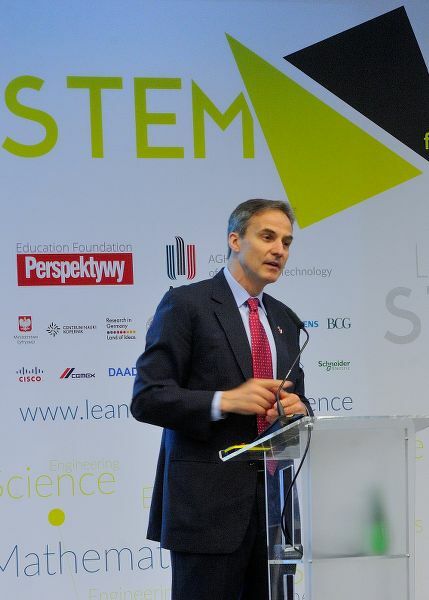 The debate on STEM focuses on the question about making young people feel passionate about such subjects as mathematics, physics, chemistry, and computer science, about the quality of such education, about the sense of studying engineering or science. 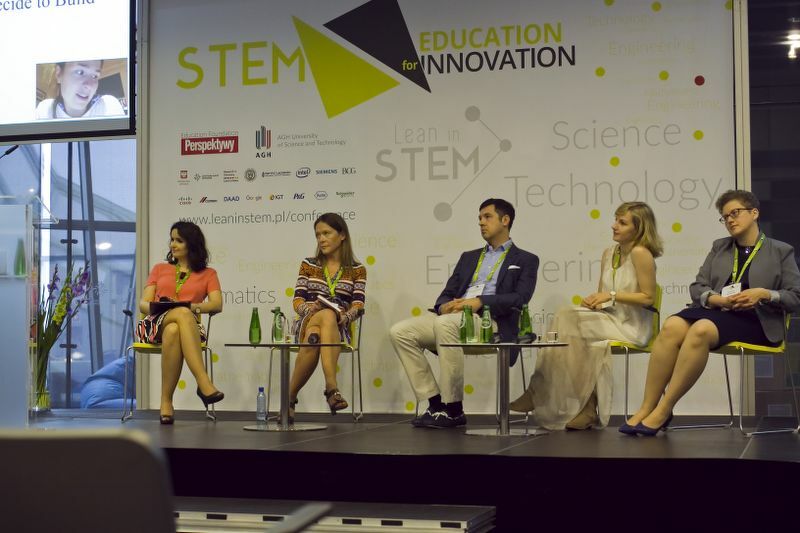 The challenges related to building a career in ICT, in the technological industry, in science. 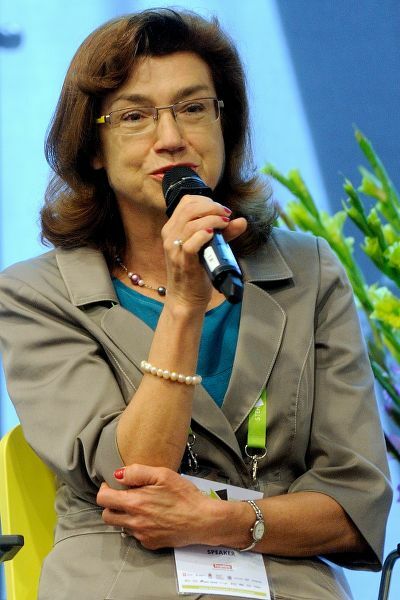 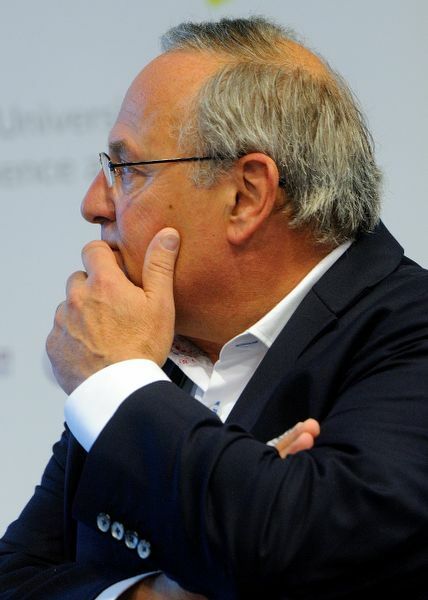 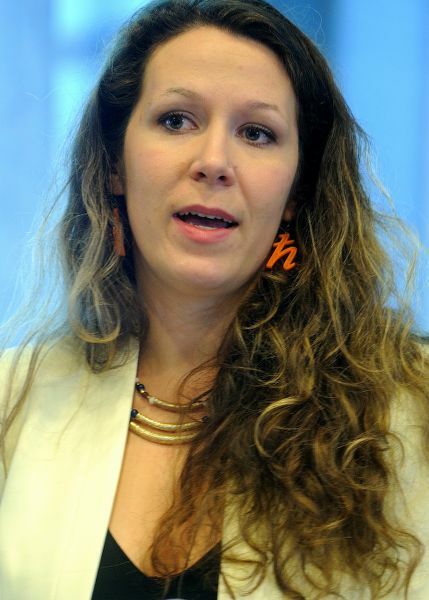 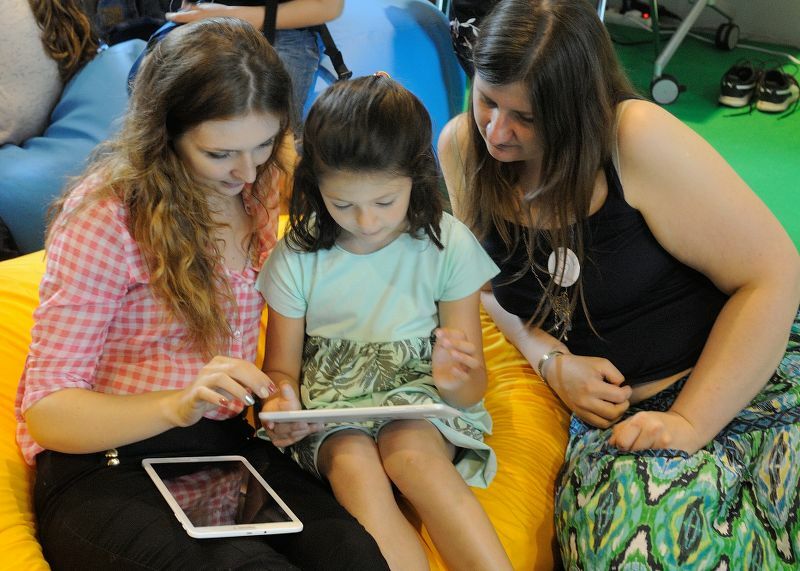 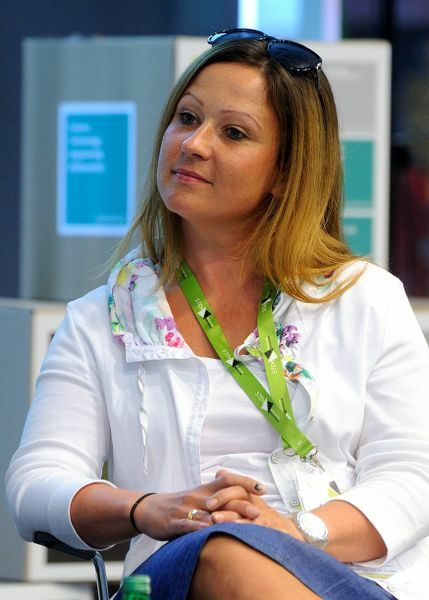 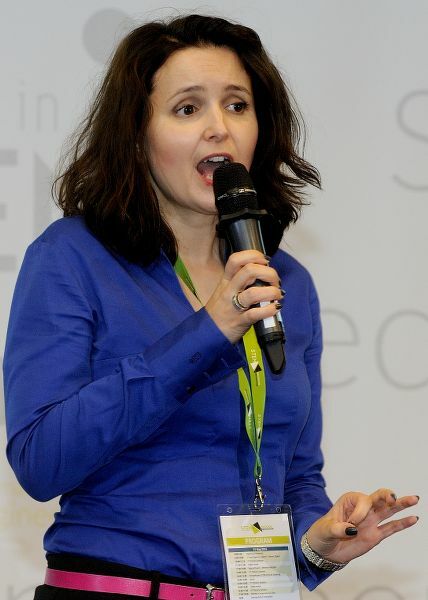 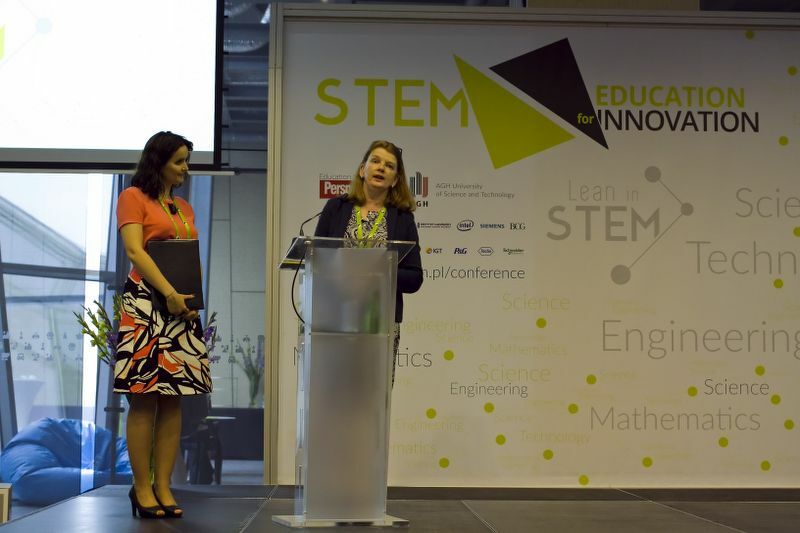 And on the awareness of the fact that in order for the world to develop properly, in order for wise, knowledge-oriented, digitally competent, but not overwhelmed with technological progress societies to flourish, we must look after the whole process of educating and inspiring young people in the STEM area, from the primary school all the way through further education until positioning on the labour market, and answer the challenges related to creation of e.g. 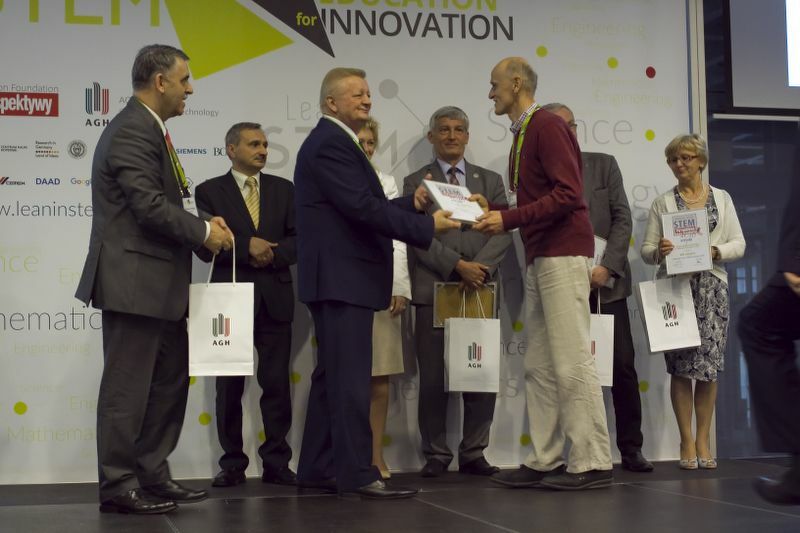 innovative, technology-based start-ups. 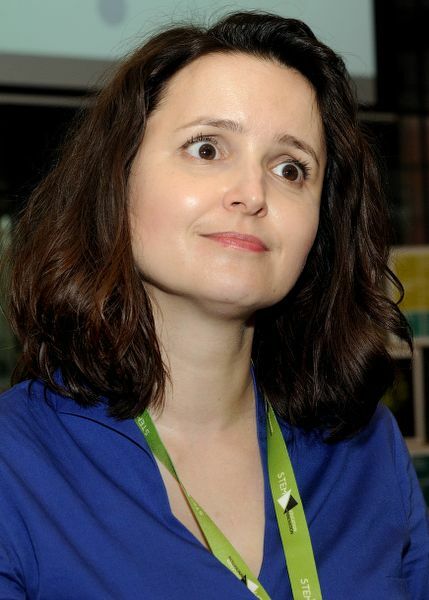 "Leaking pipeline". 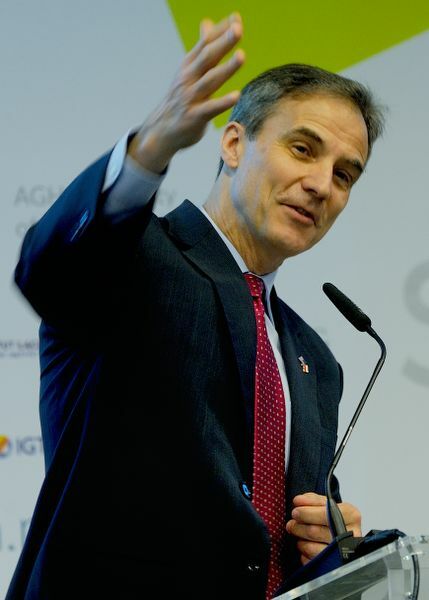 The Americans call this system of communicating vessels a “pipeline”". 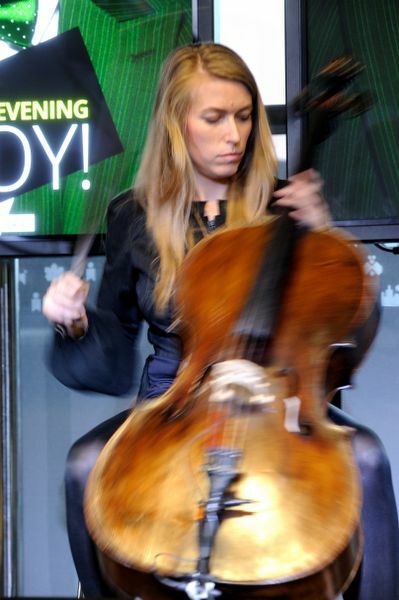 Sometimes the “pipeline” may be leaky and this we may lose potential talent at individual stages. 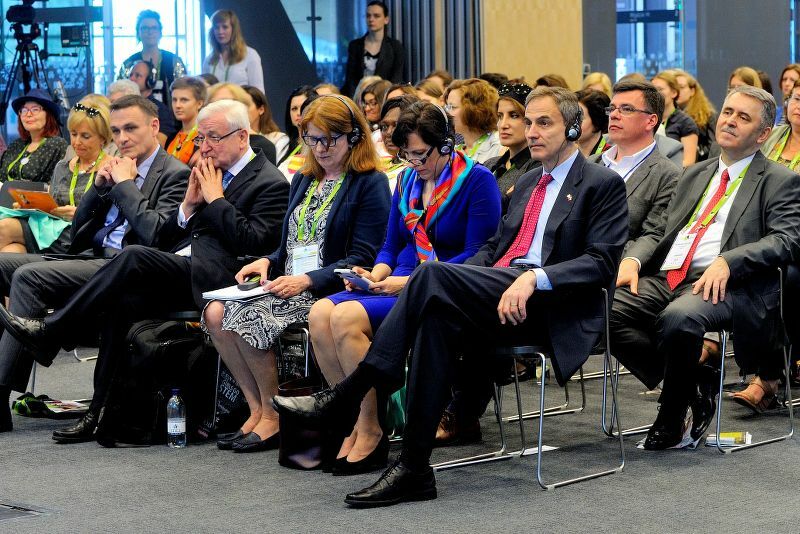 This happens in the case of women. 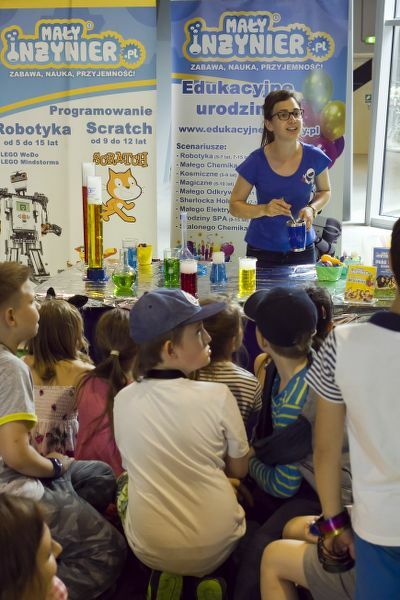 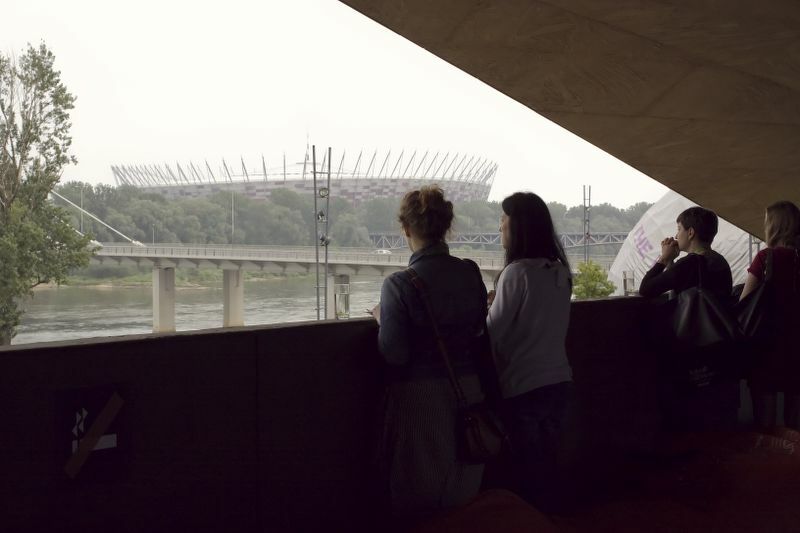 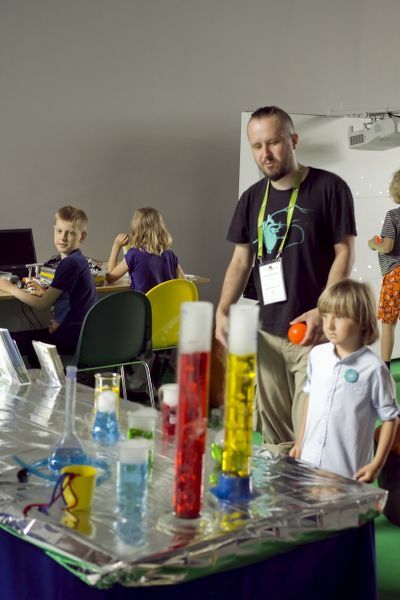 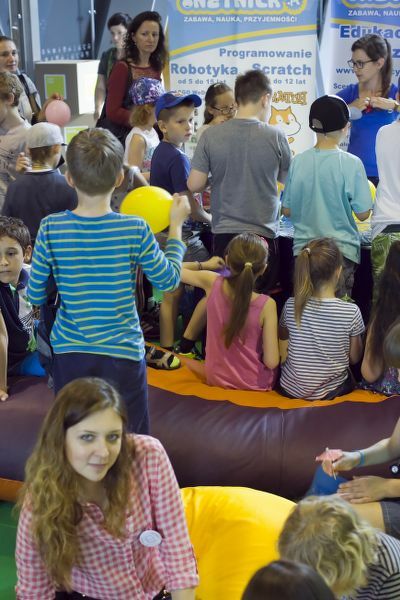 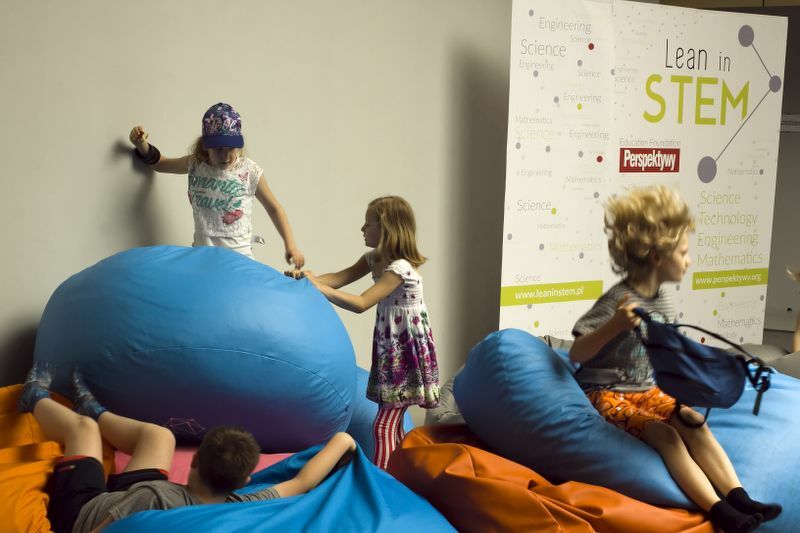 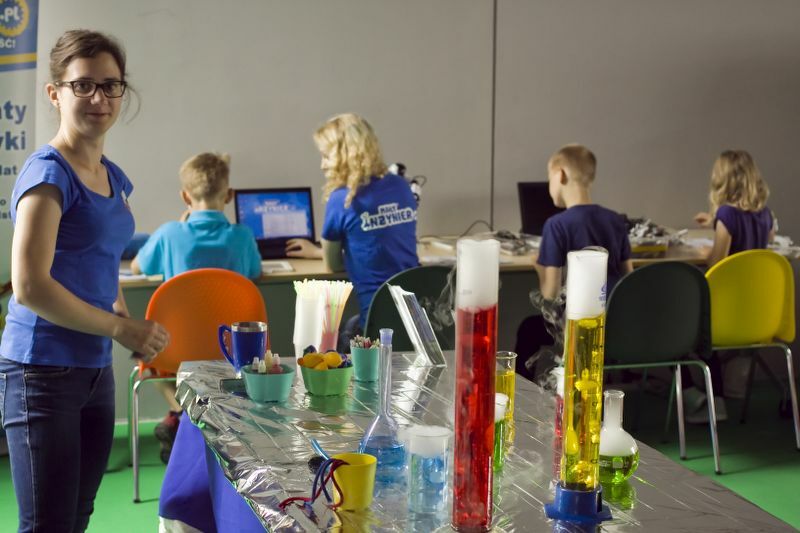 Their loss of interest in science education, their smaller participation less in engineering studies and less activity in professional careers in the STEM-related areas is a systemic problem – not just in Poland or USA, but all over the world. 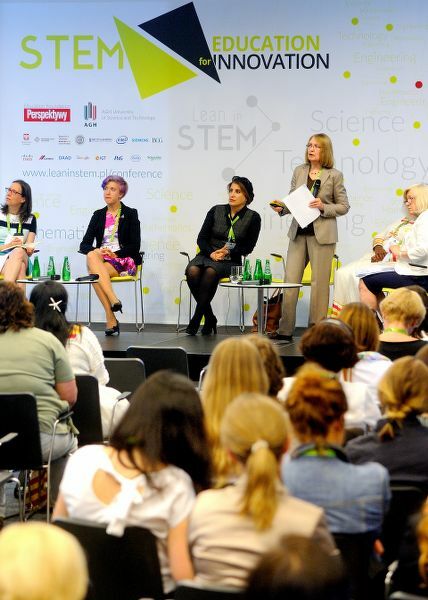 How to support women in STEM? 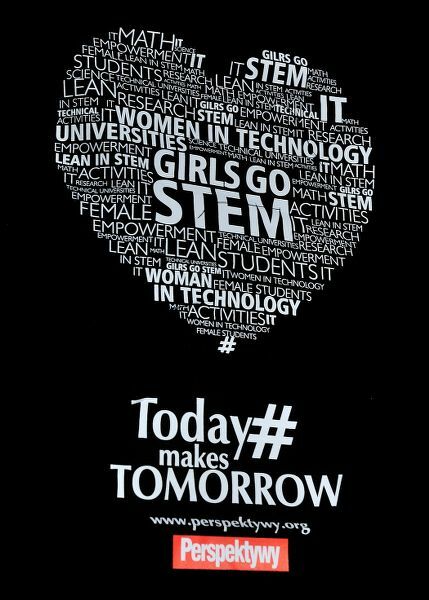 An important element of the STEM debate is a call to include girls and later women in this type of education and activity to larger extent. 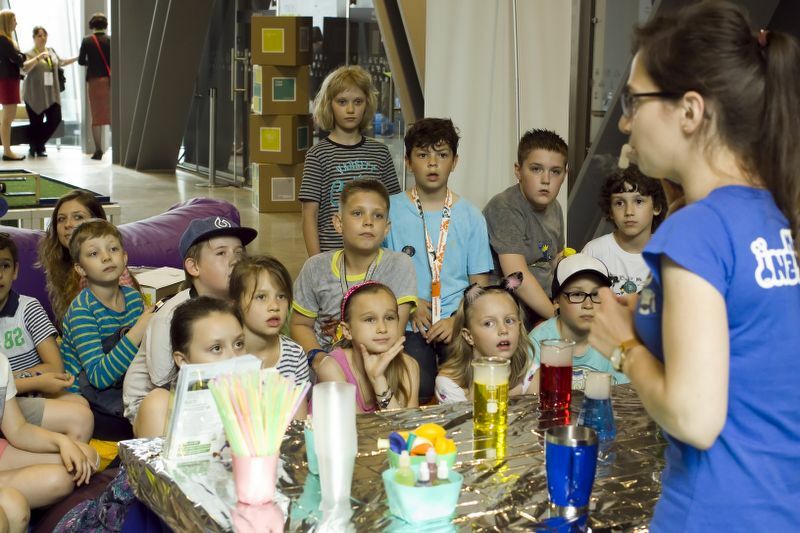 The traditional socialisation process causes them to often lose interest in scientific subjects quite early. 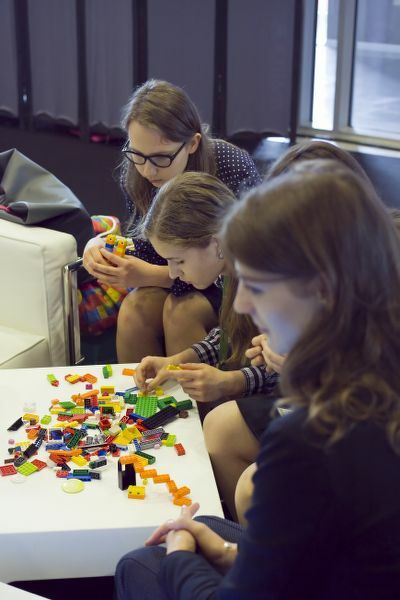 But this can be counteracted and girls may be encouraged to take interest in these challenges. 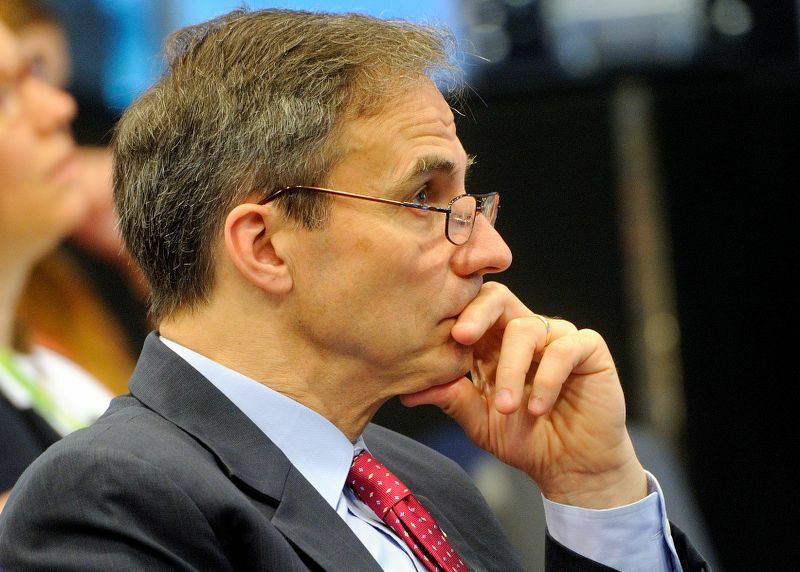 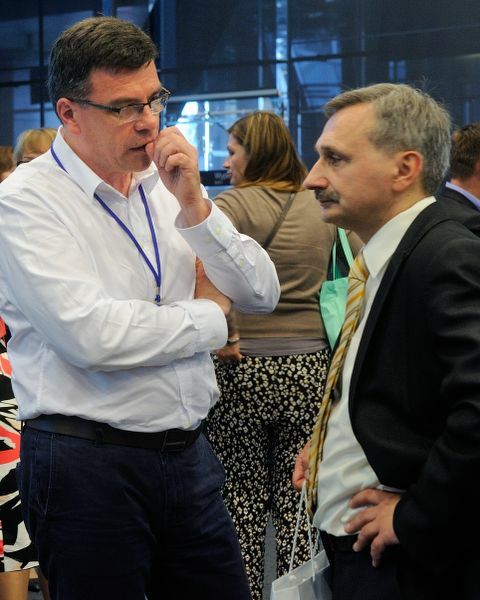 These efforts yield results, as proven e.g. 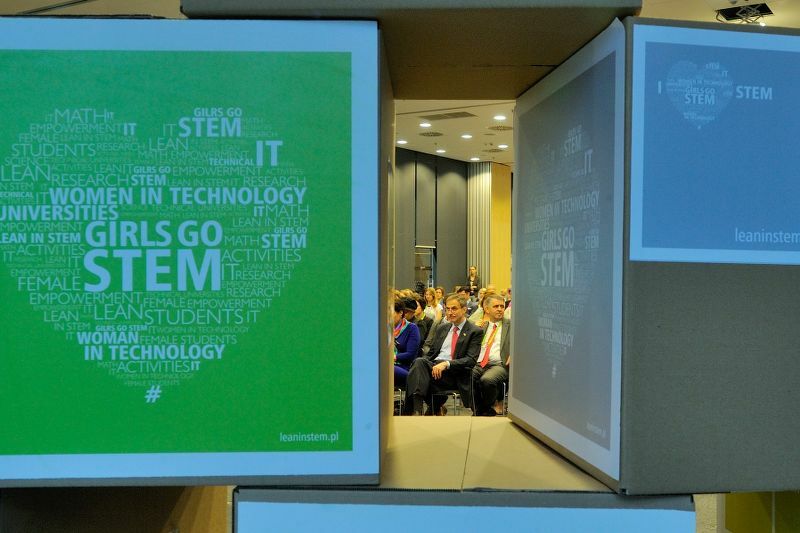 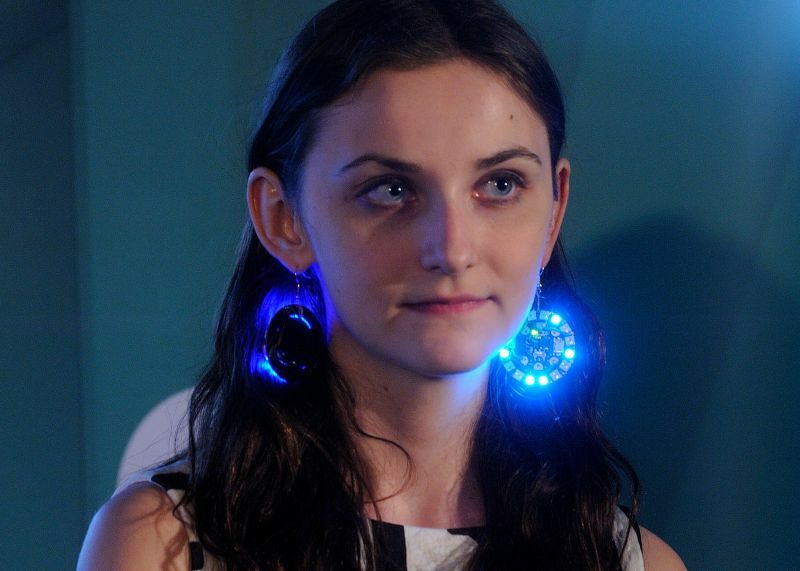 by the experiences from the “Girls as Engineers!” campaign. 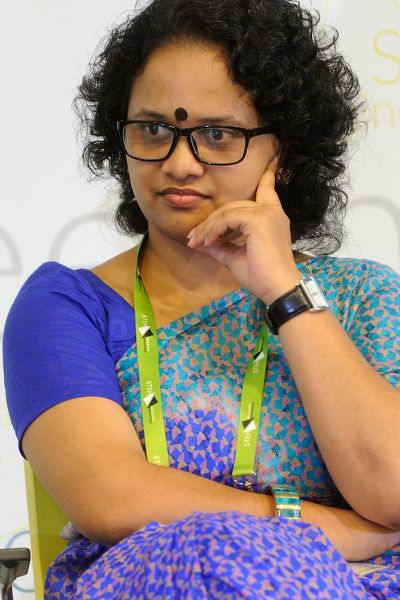 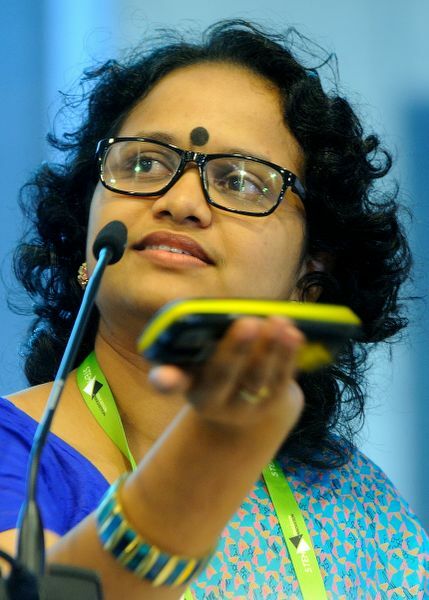 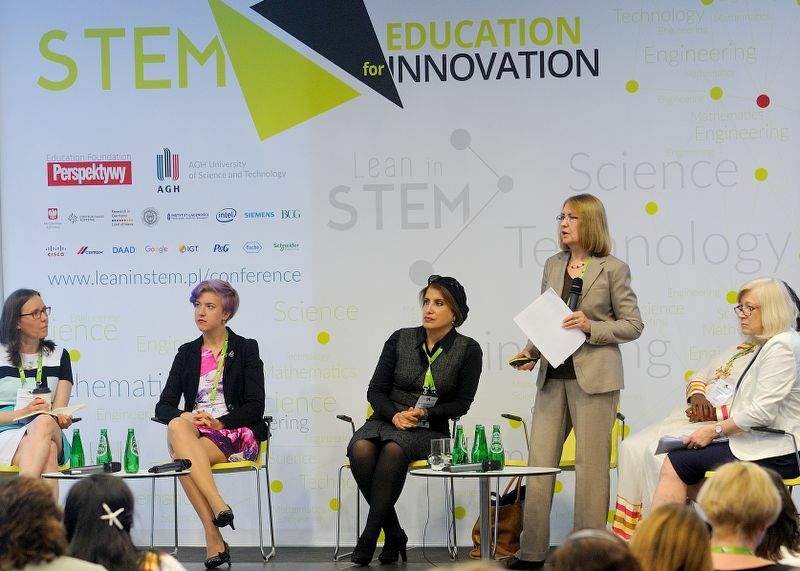 Science and technology need women. 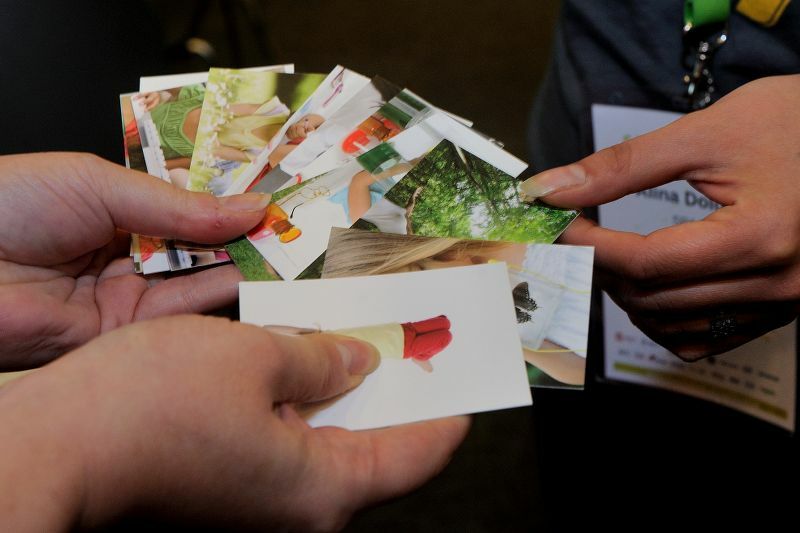 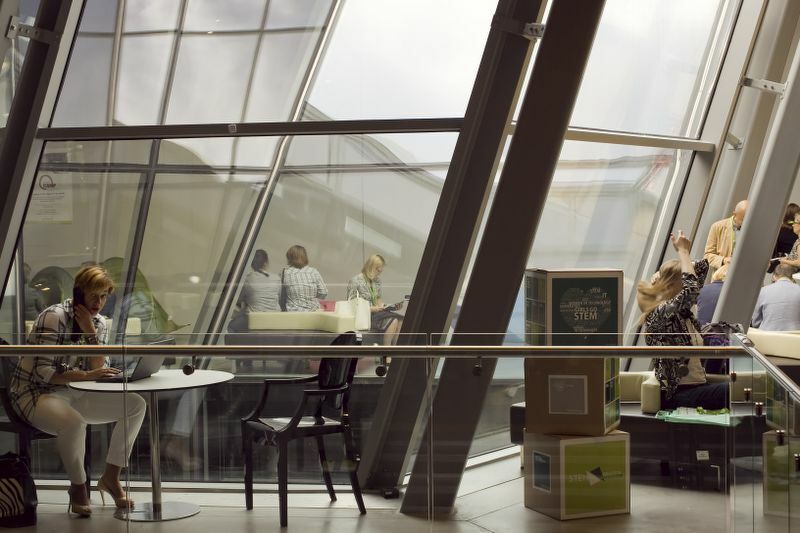 Only varied, balanced teams may create truly creative and new solutions. 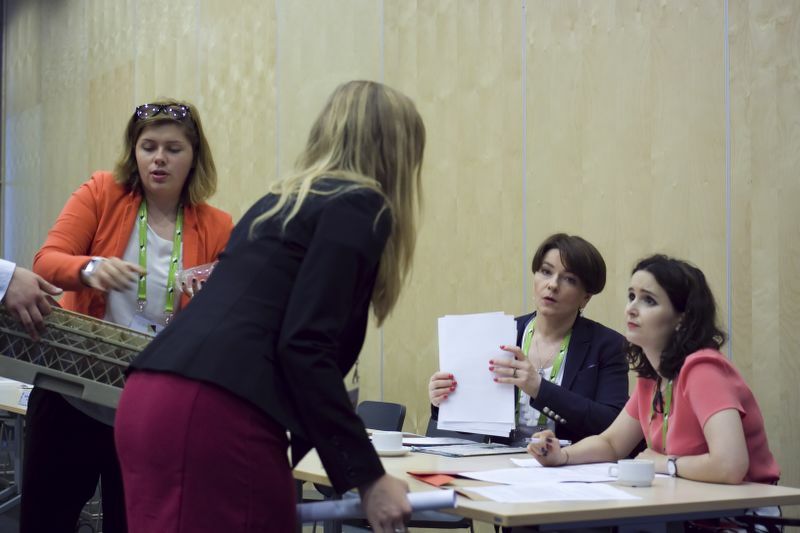 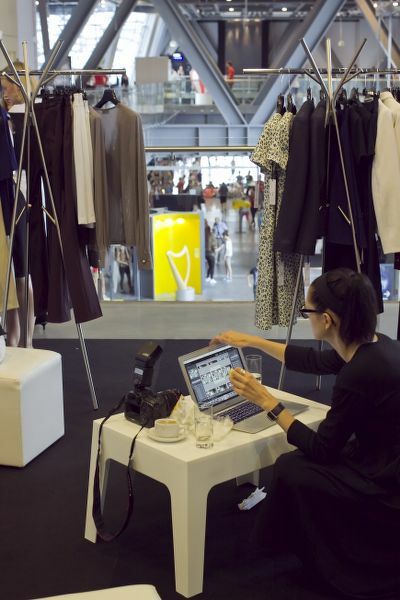 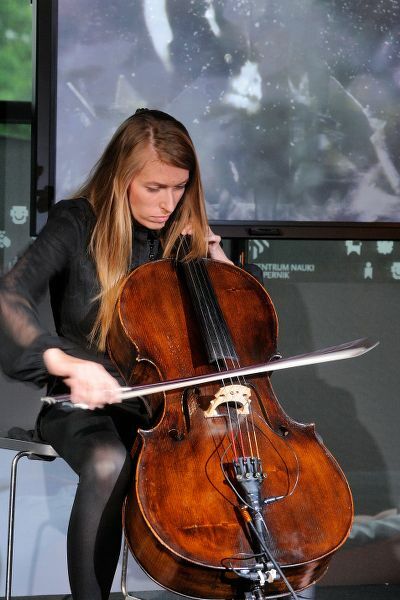 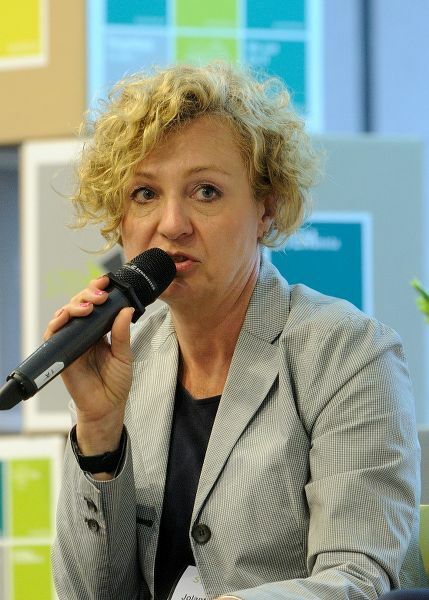 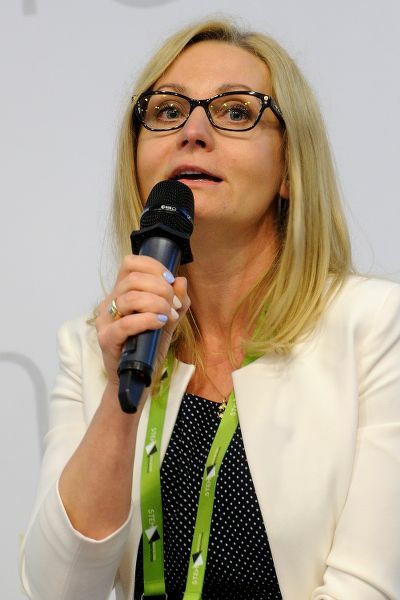 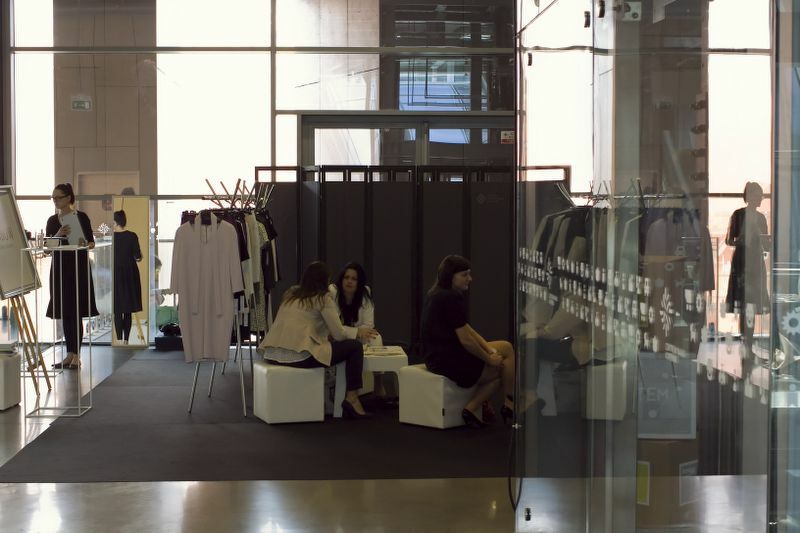 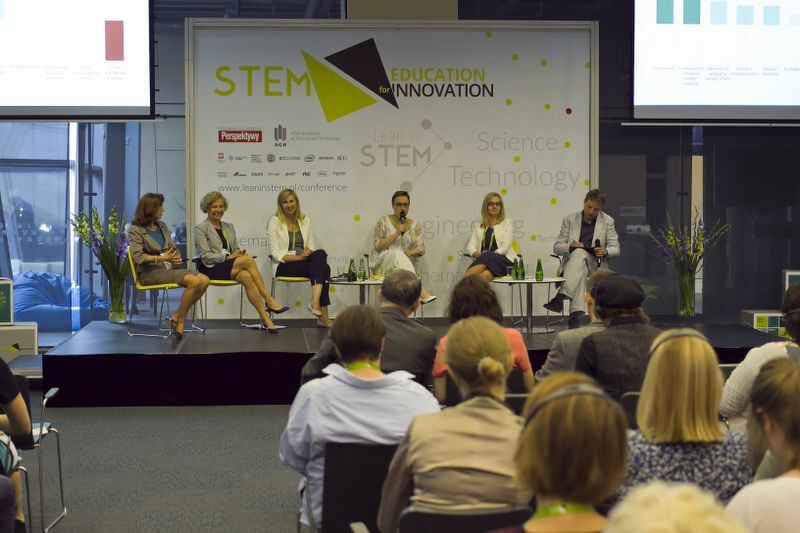 It is hard to talk about innovativity in a homogenous environment with only minimal participation of women (only 10% of professor in technological sciences and from few to about a dozen percent of technological companies’ employees are women). 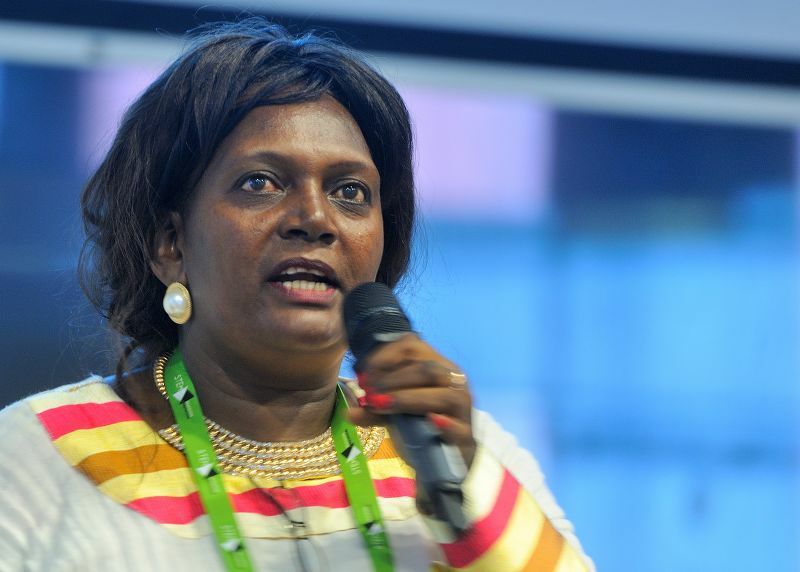 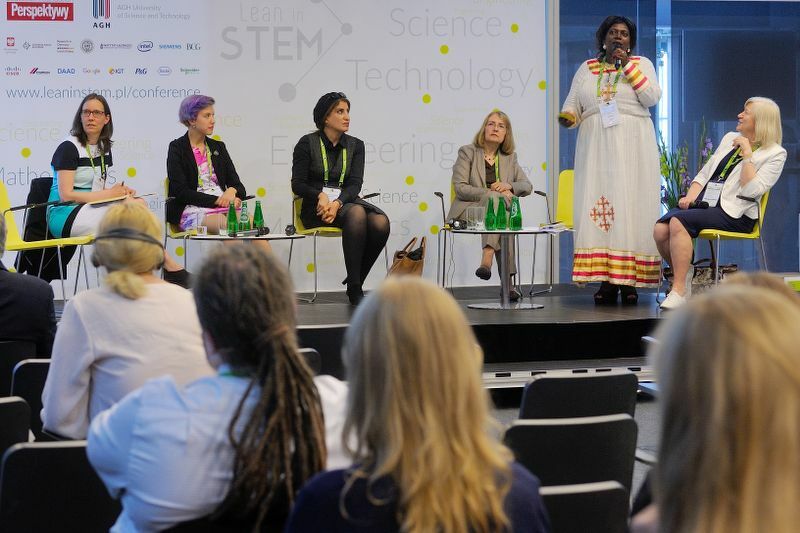 On the other hand, women need science and technology to take into account their needs and their point of view. 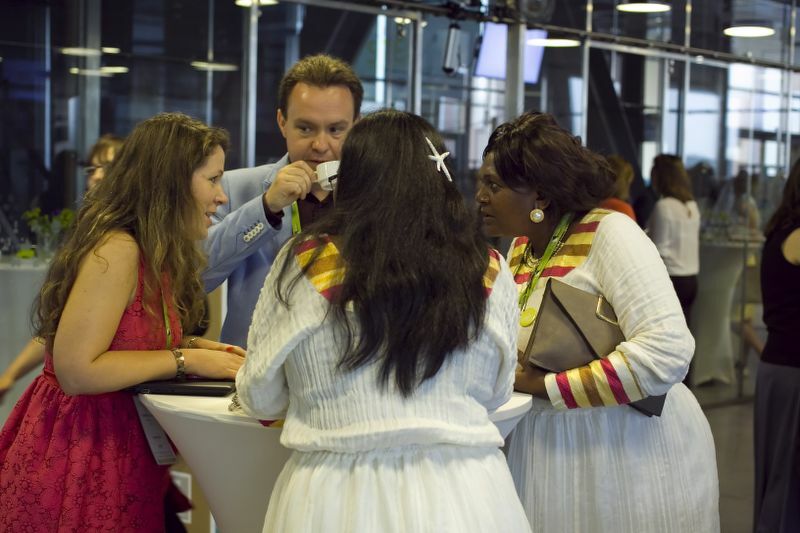 They often solved problems important strictly to women. 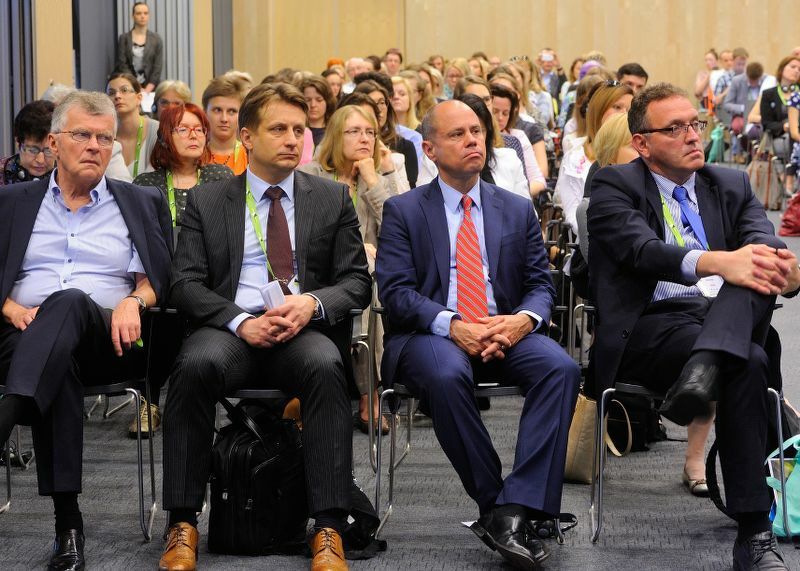 Without their active participation in creation of these solutions this will never be satisfactory. 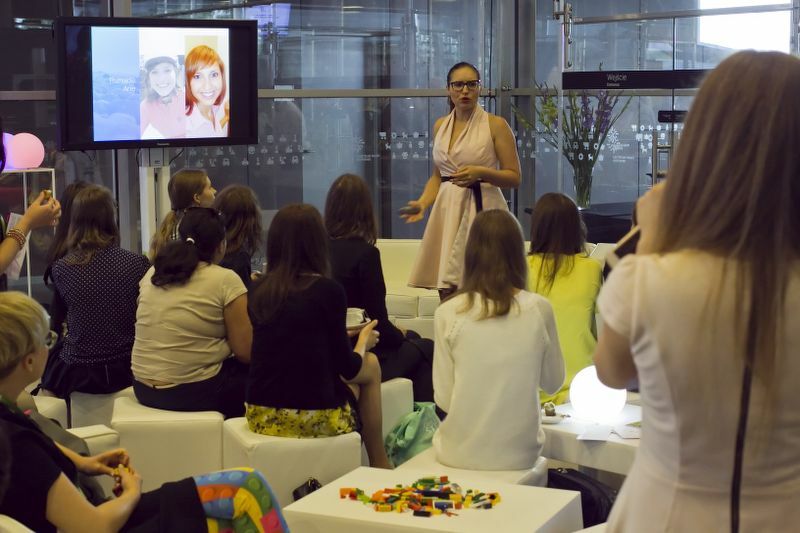 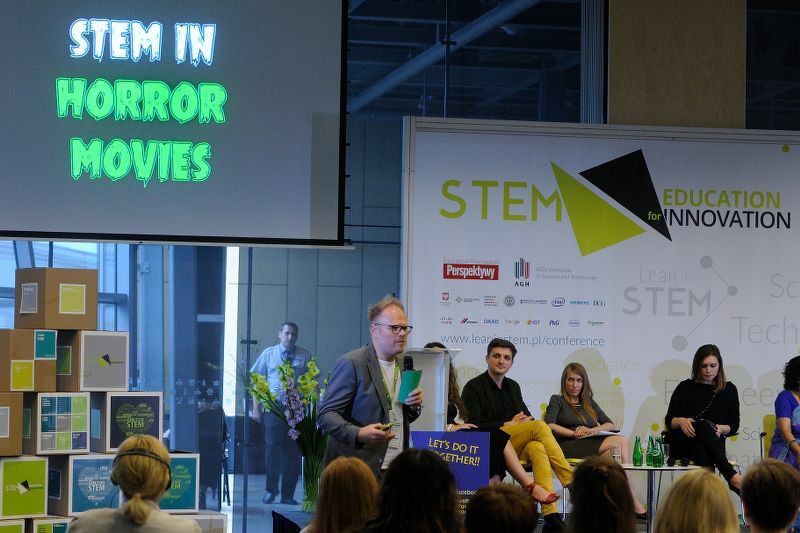 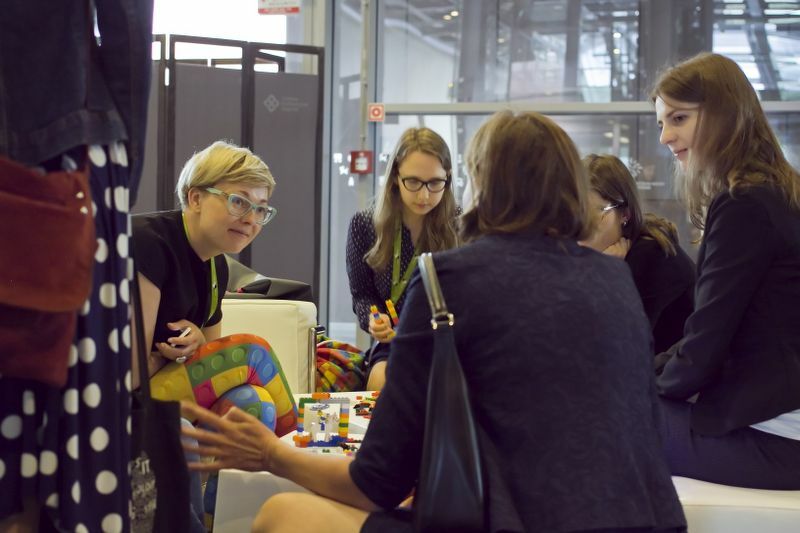 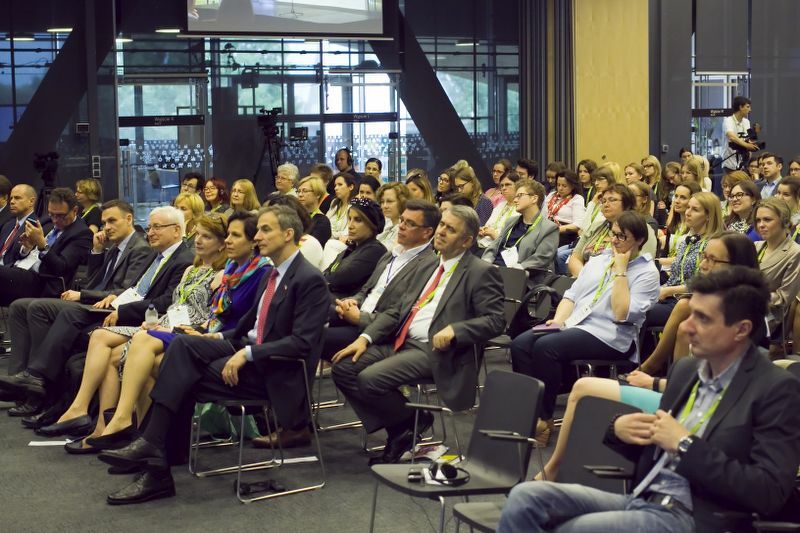 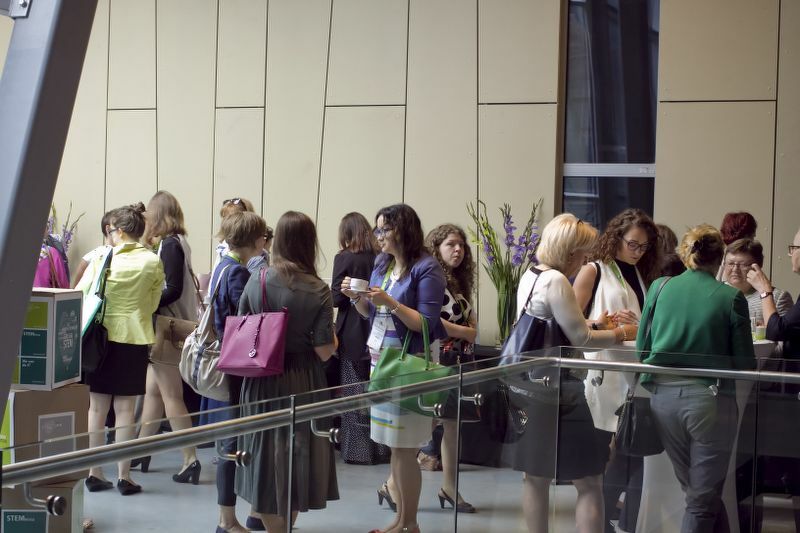 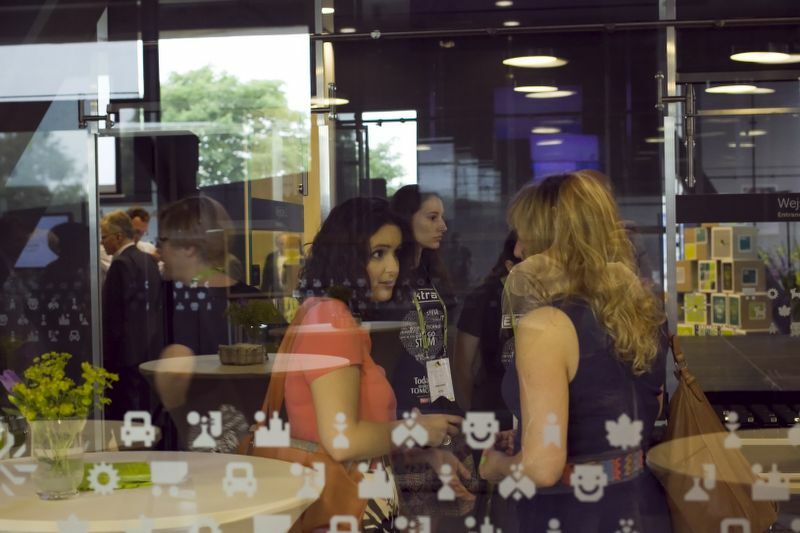 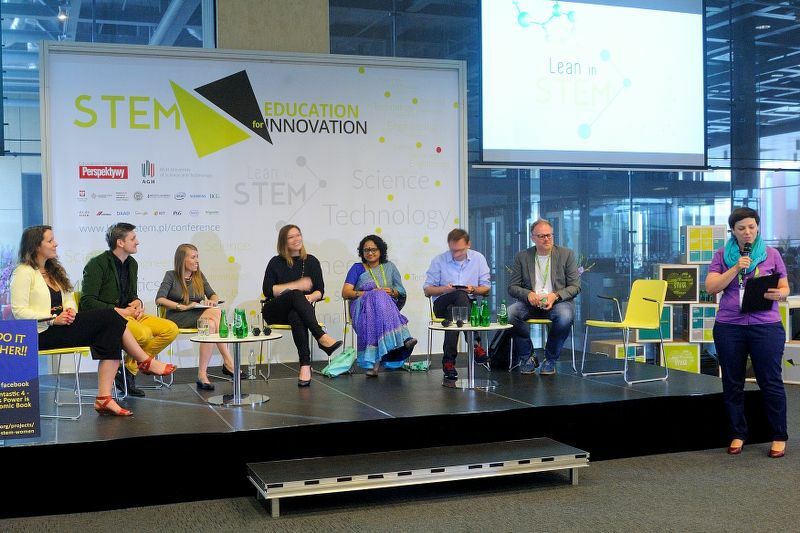 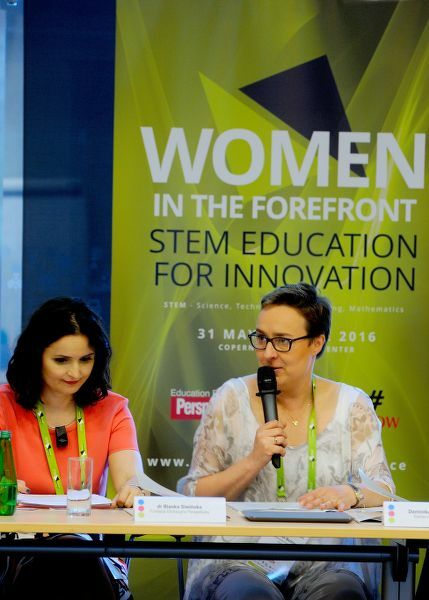 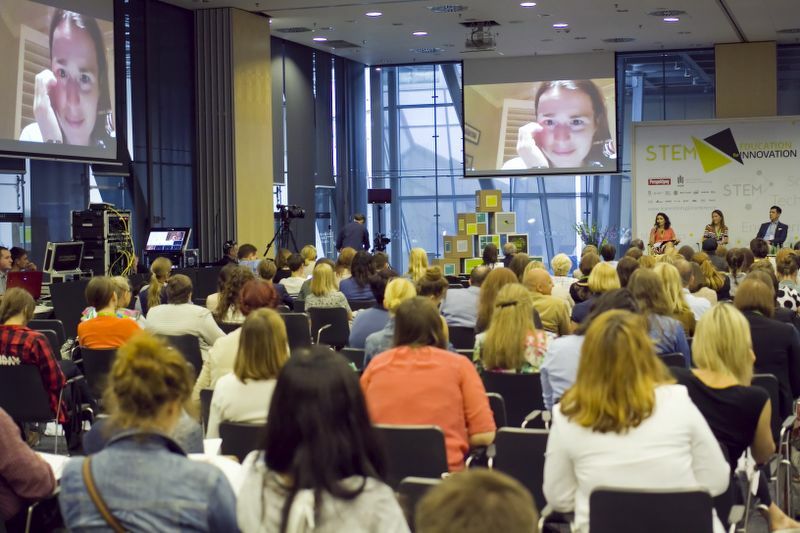 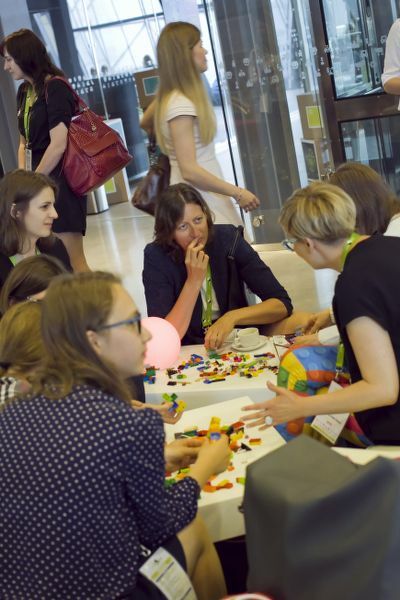 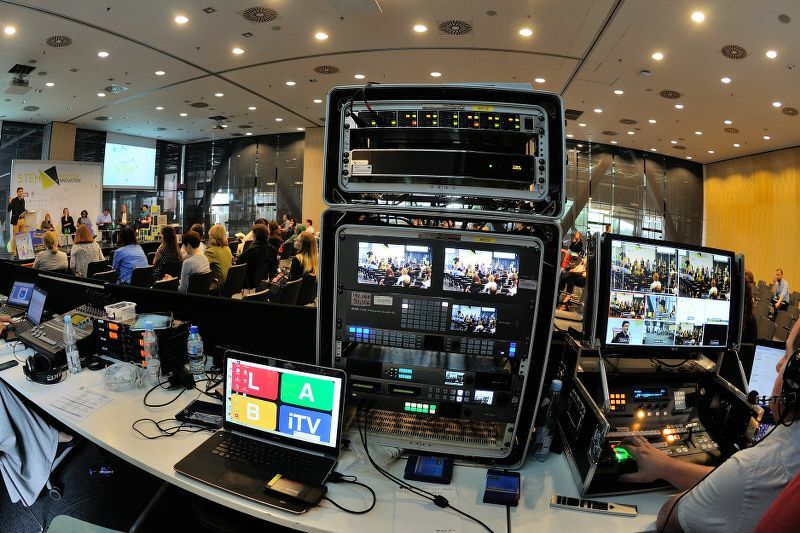 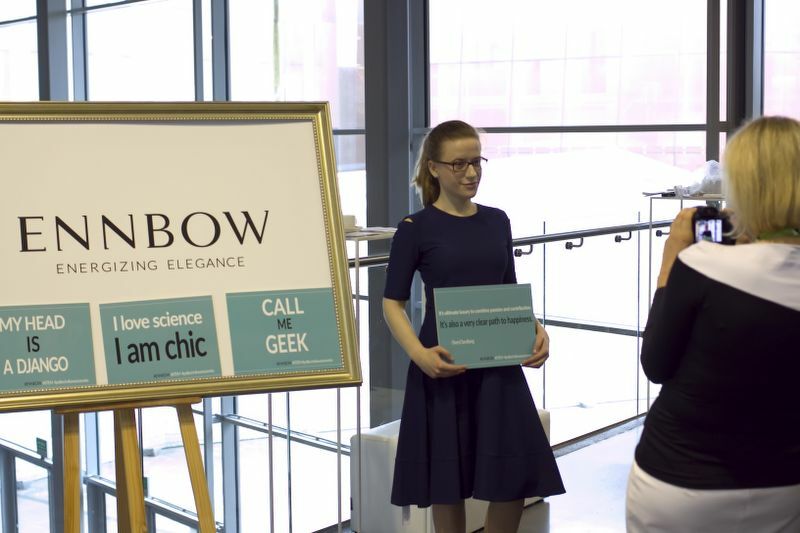 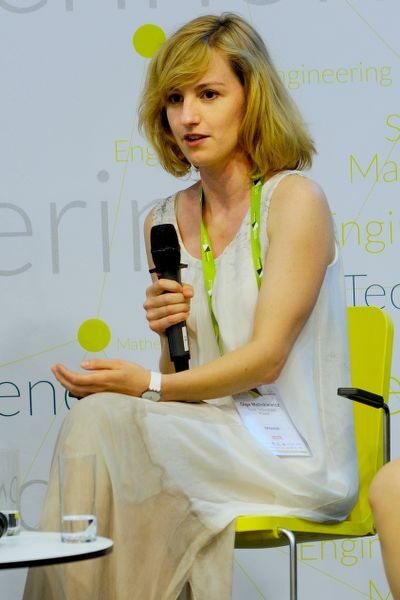 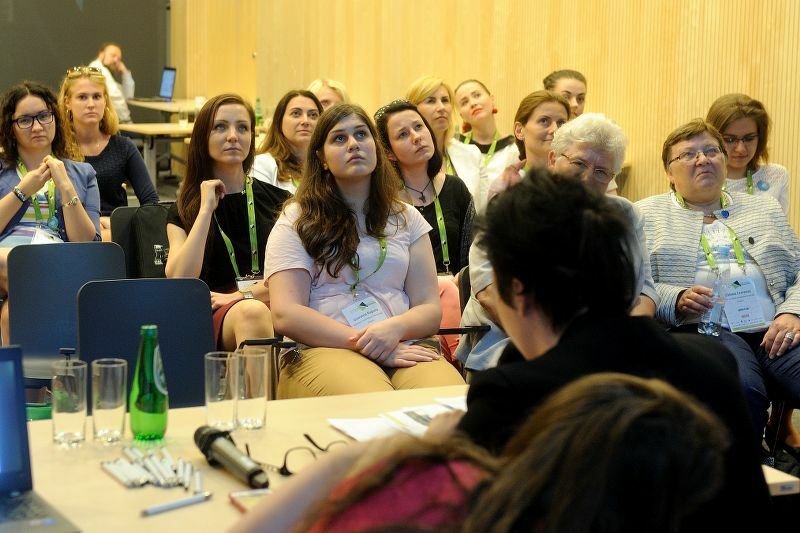 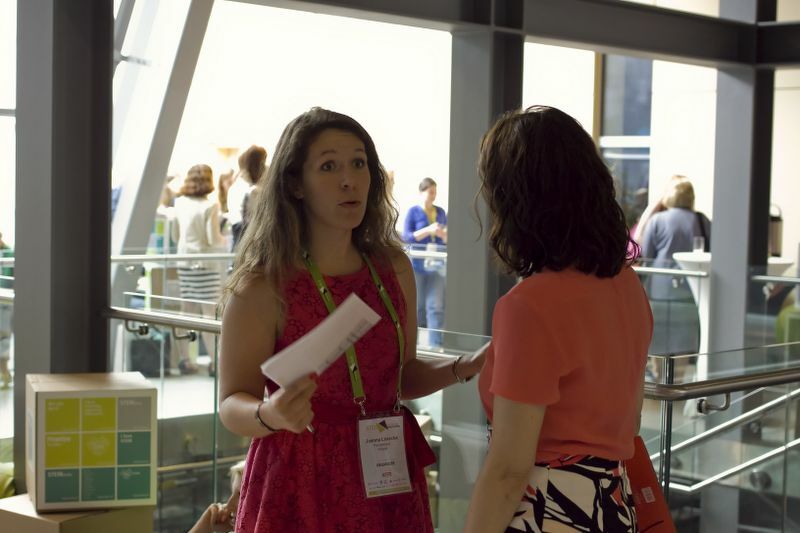 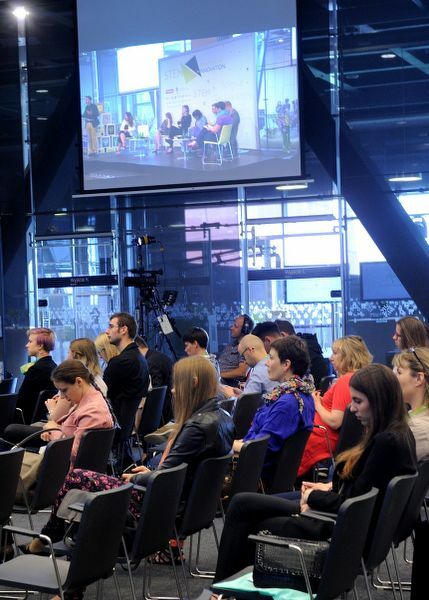 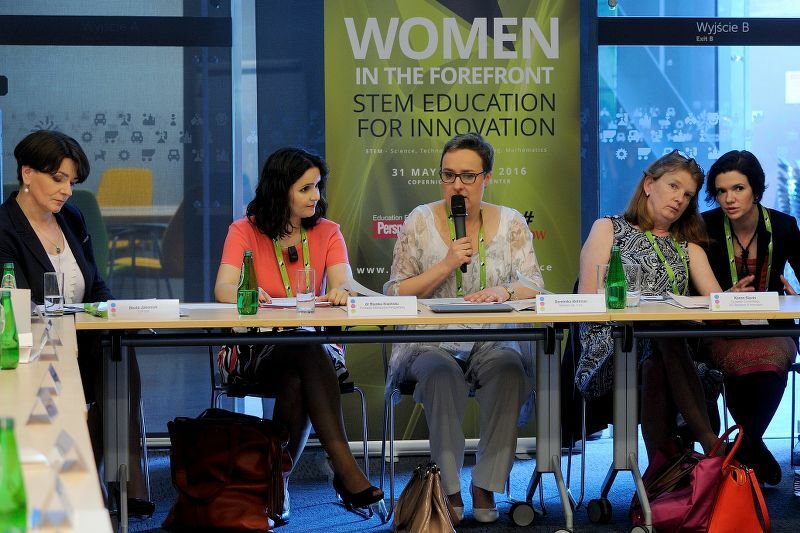 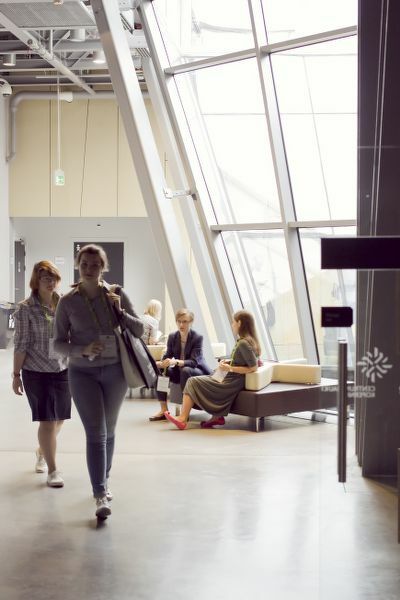 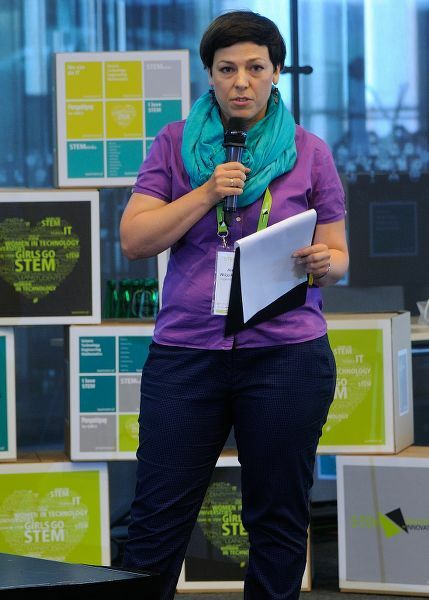 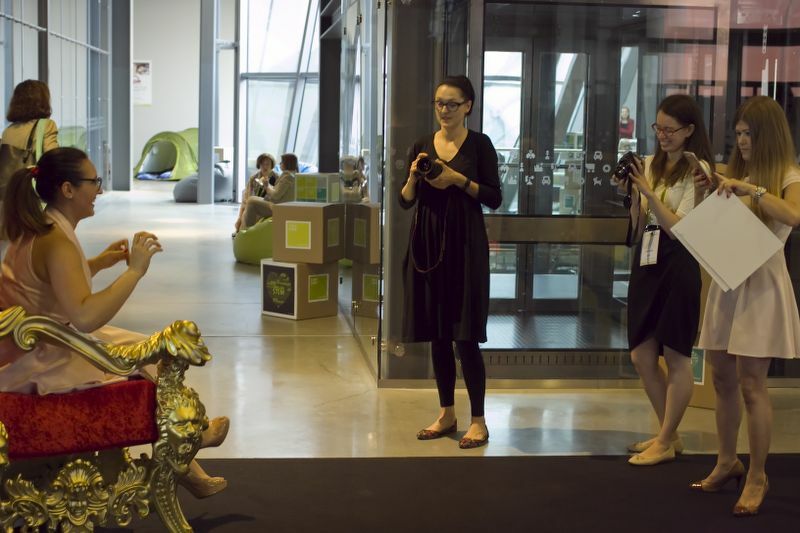 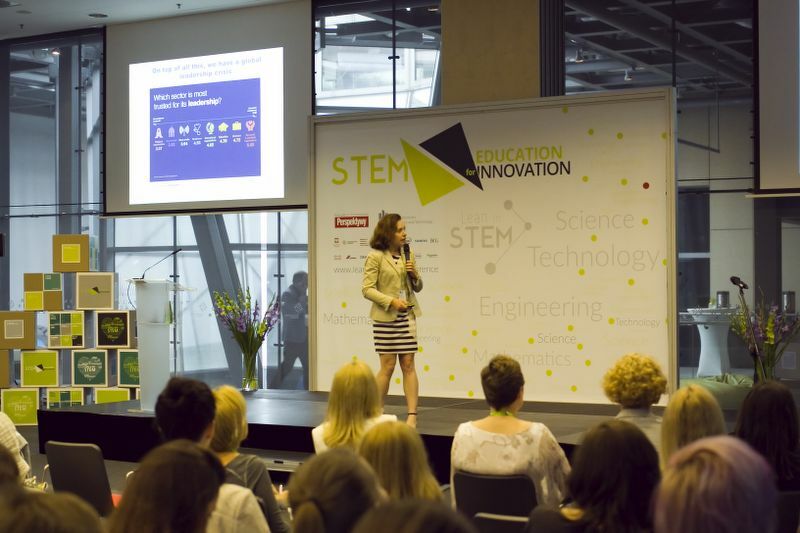 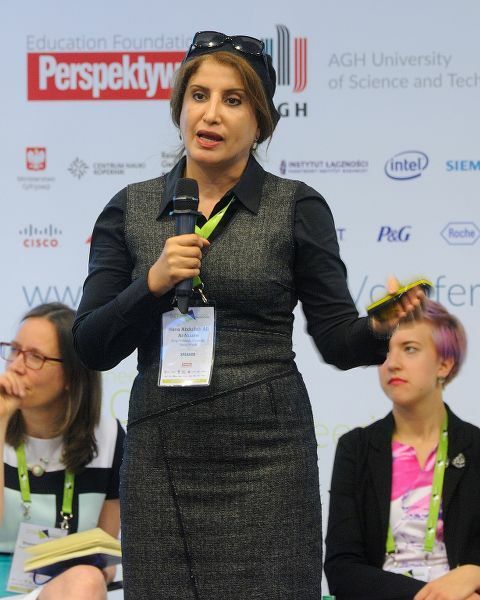 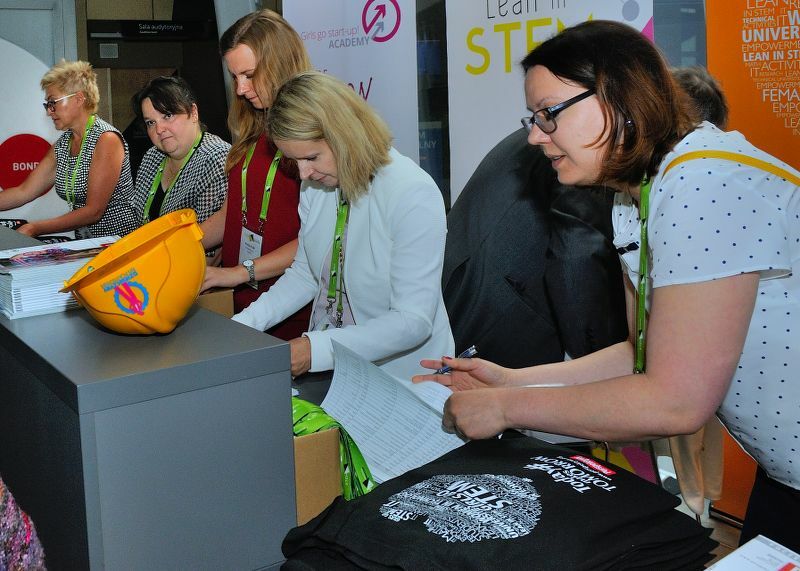 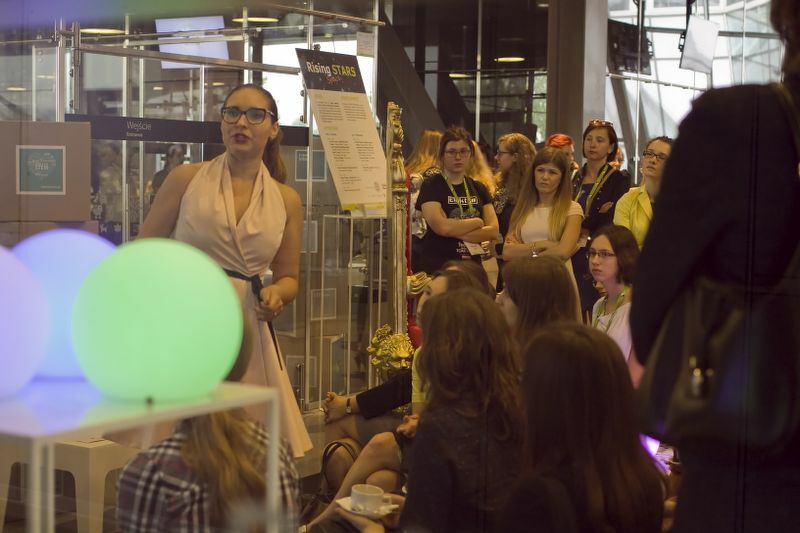 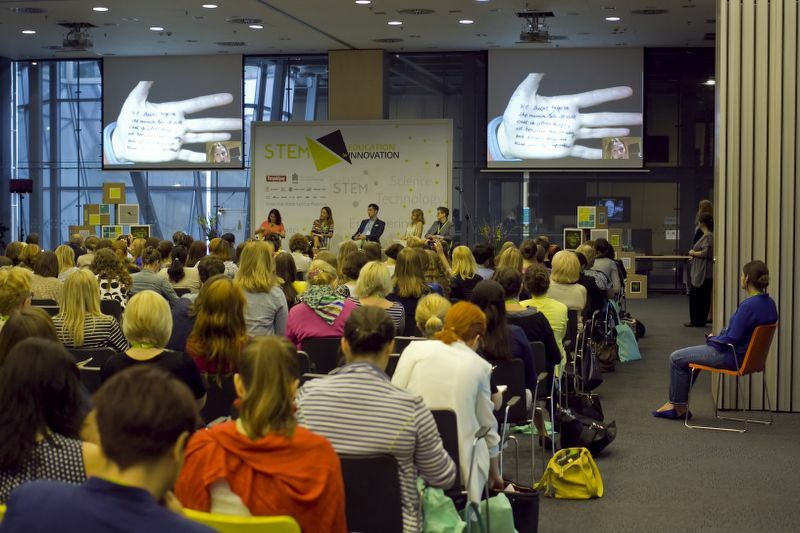 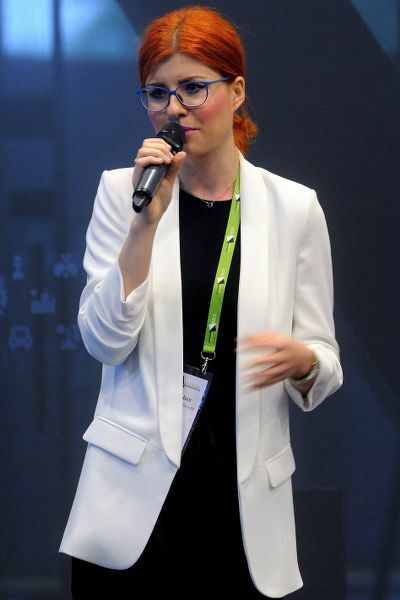 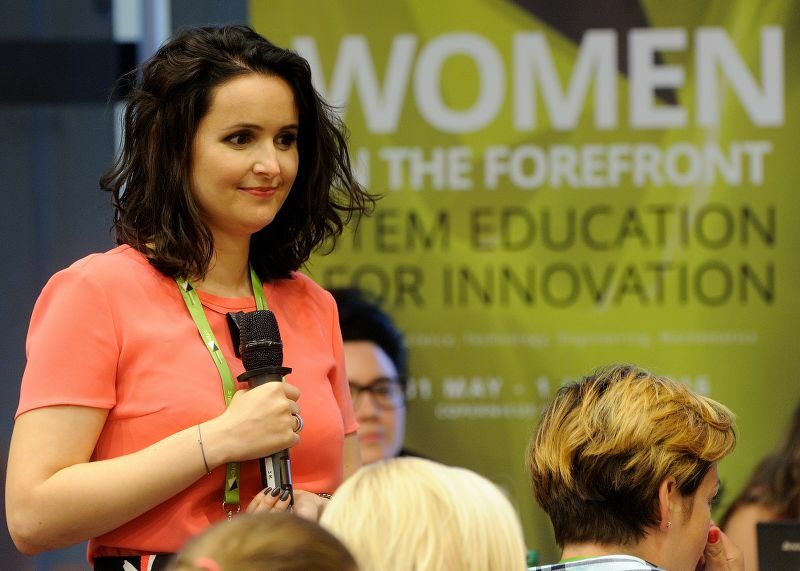 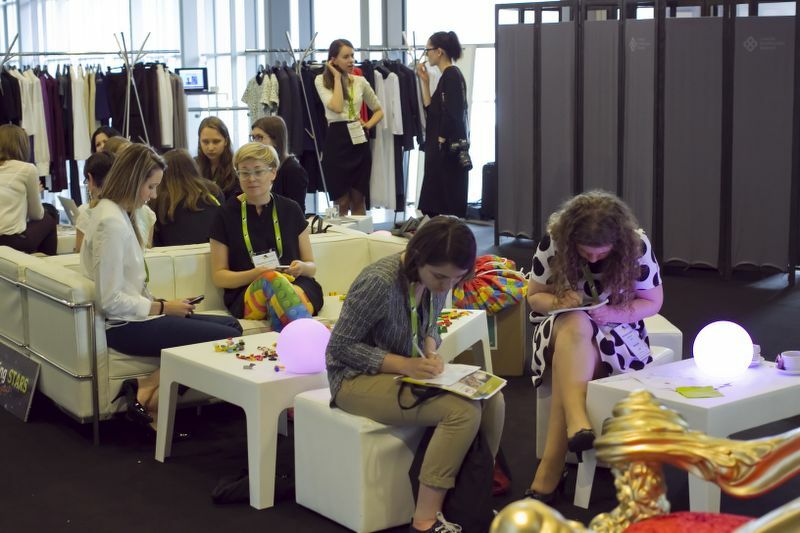 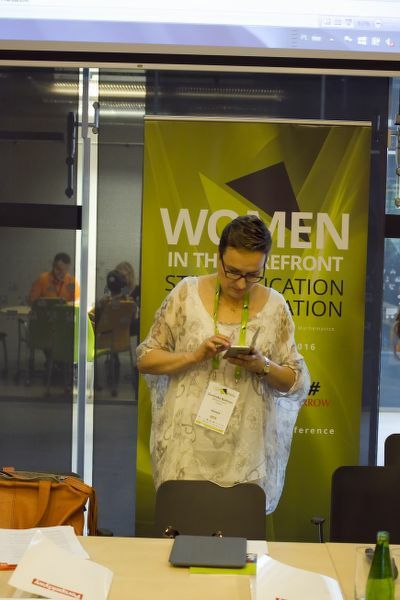 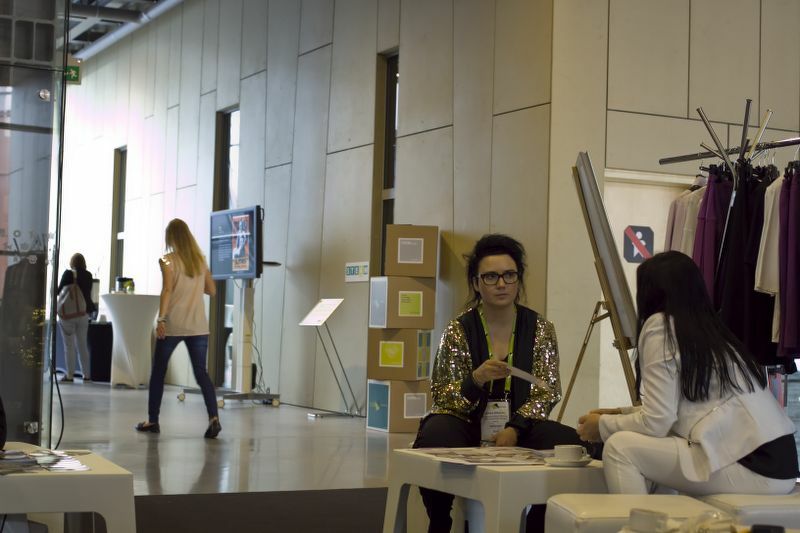 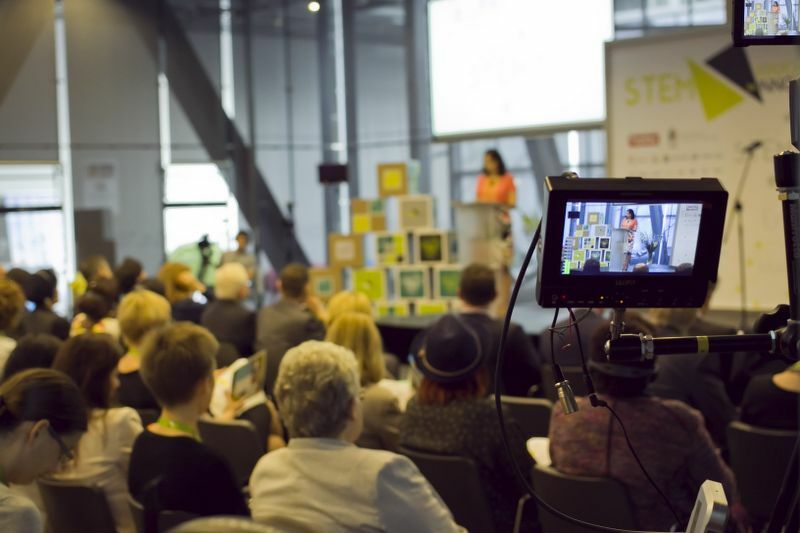 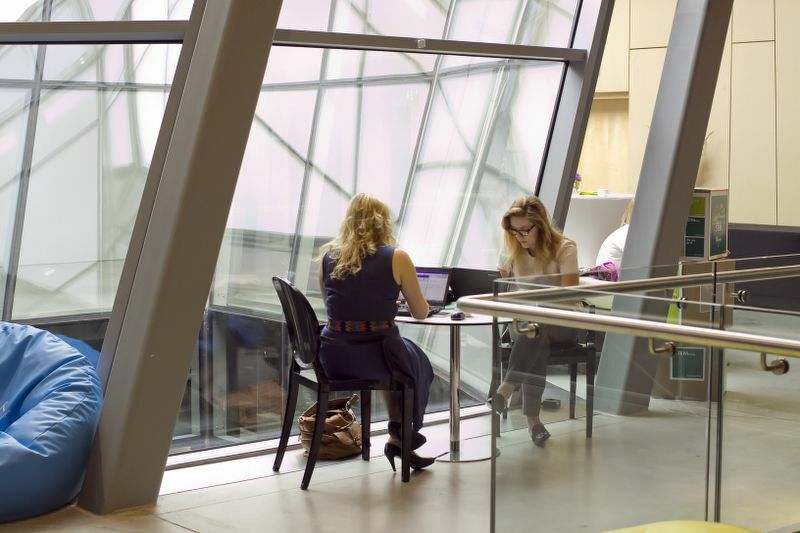 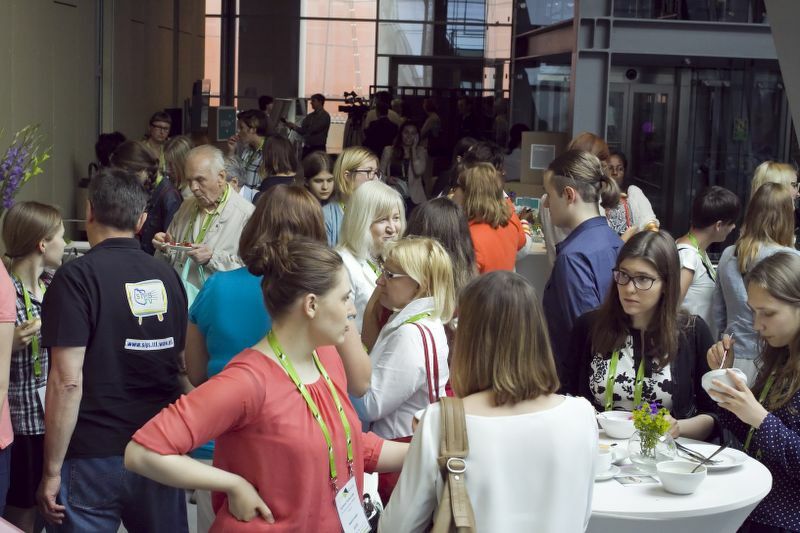 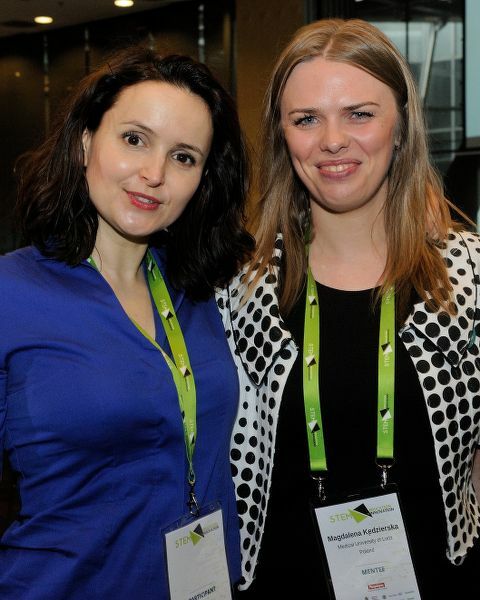 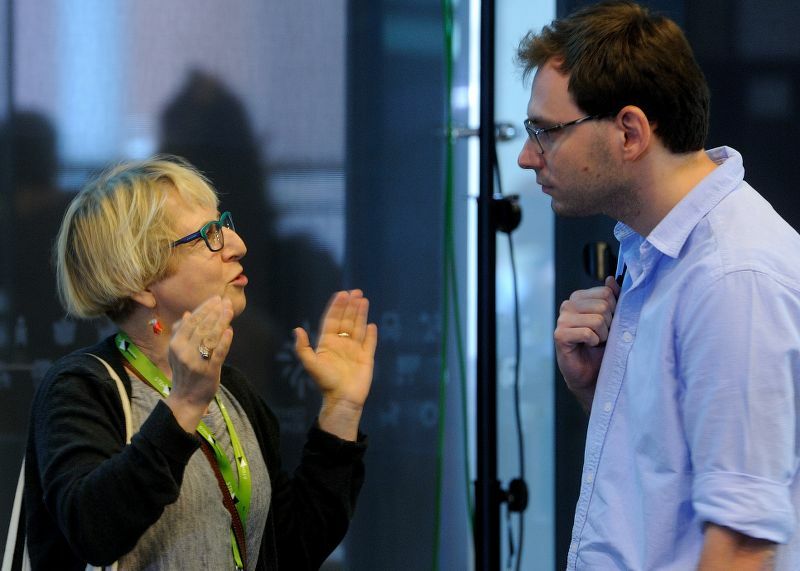 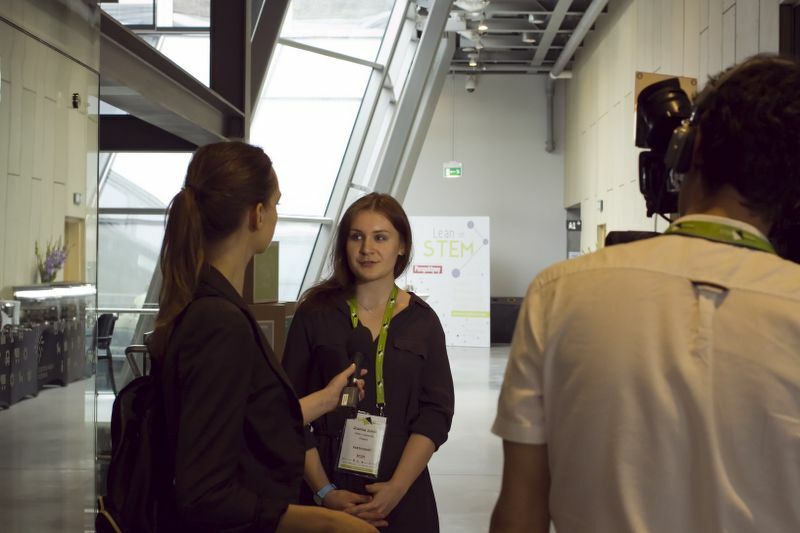 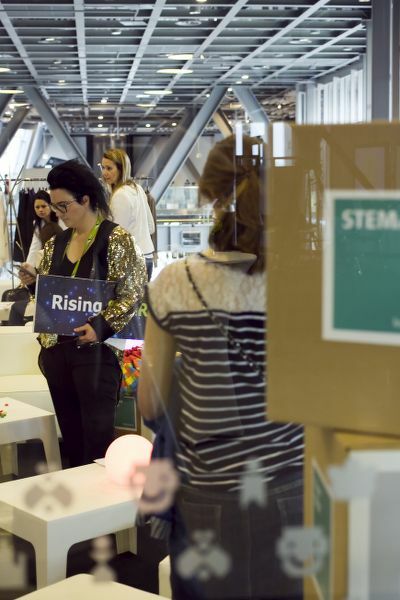 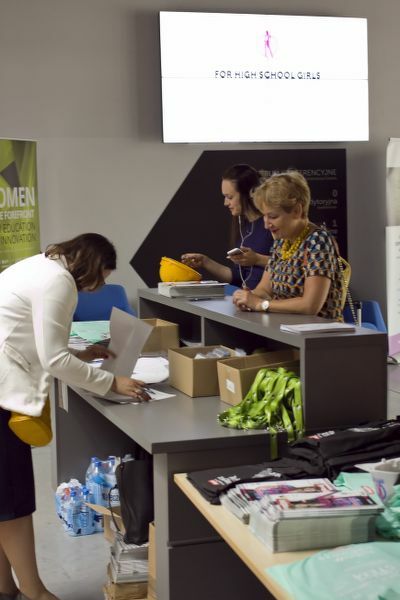 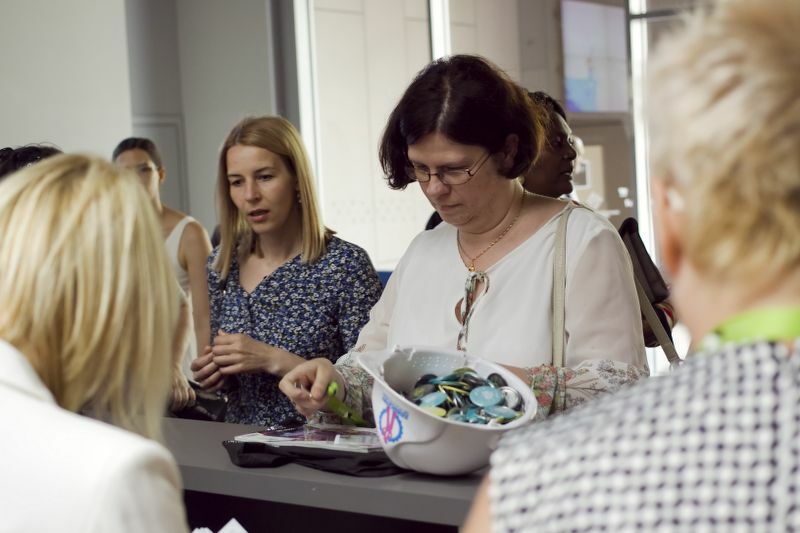 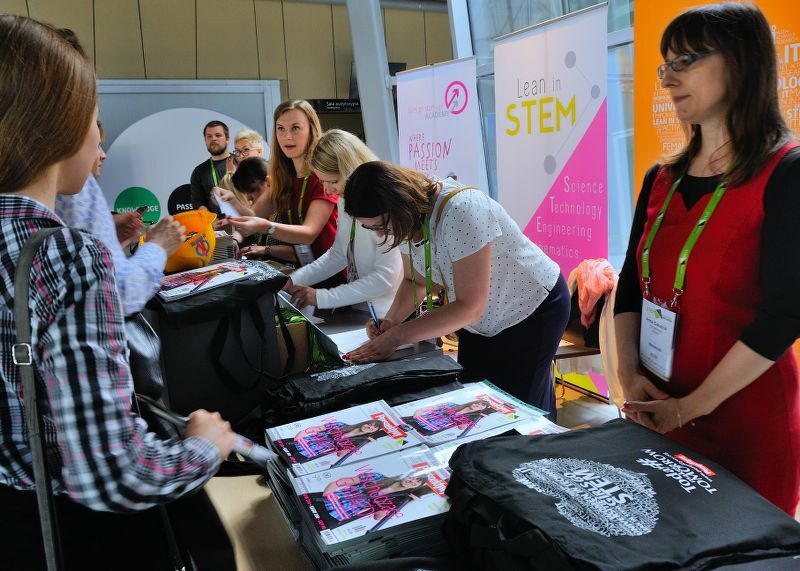 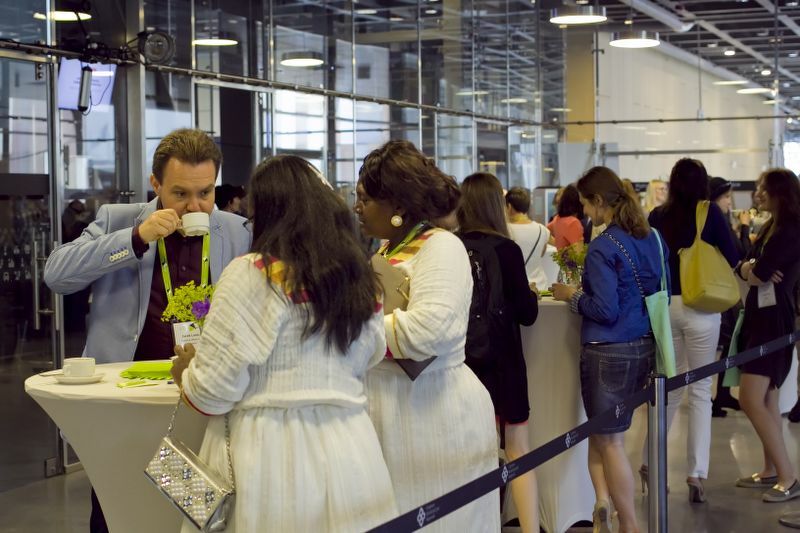 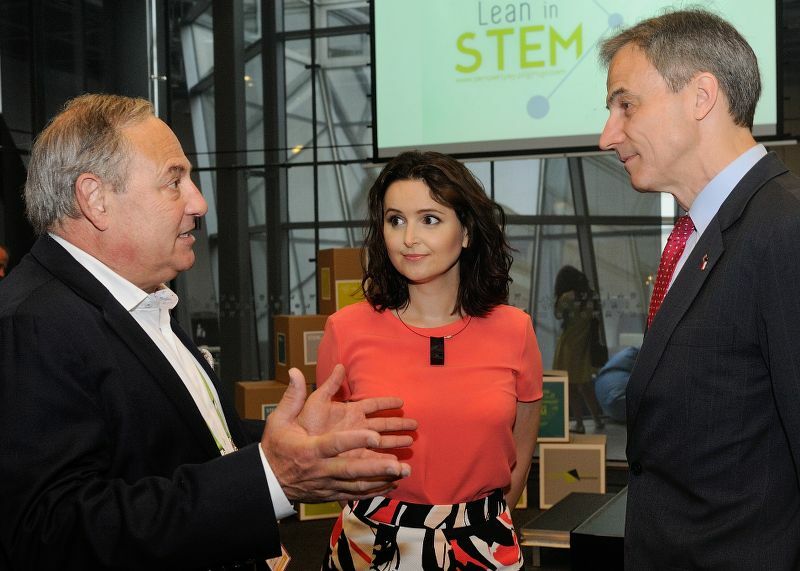 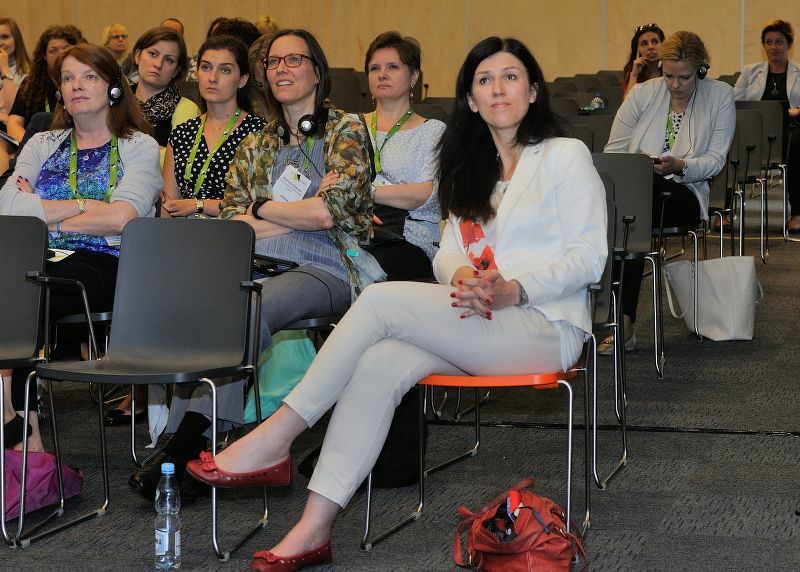 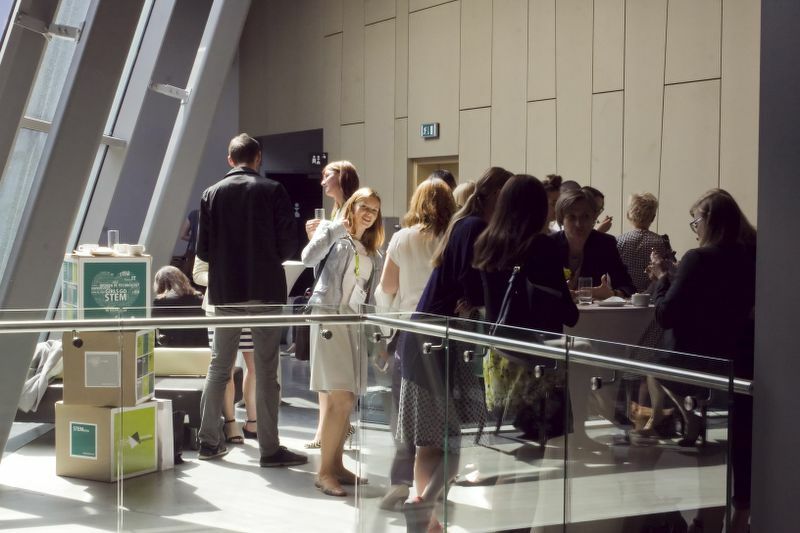 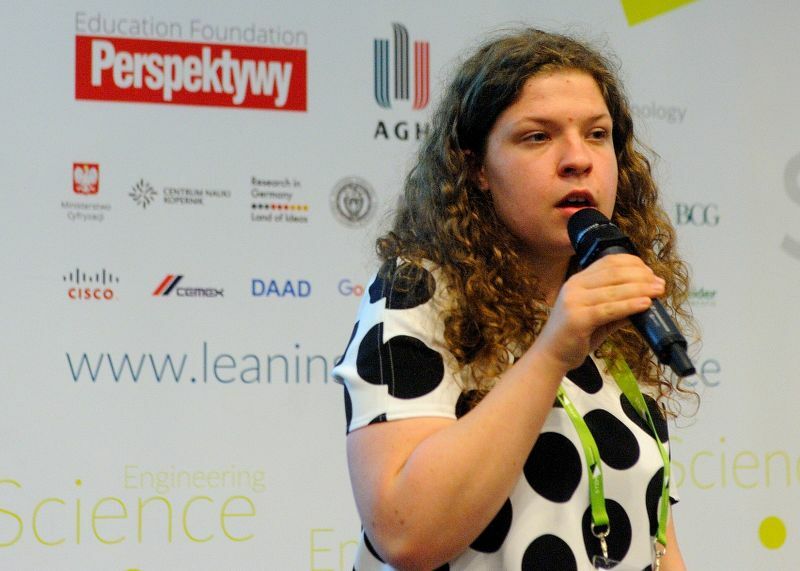 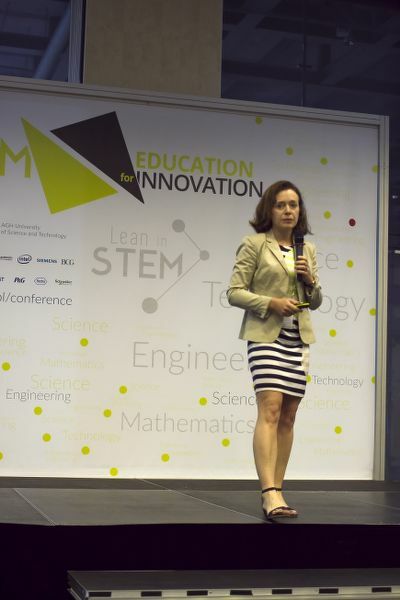 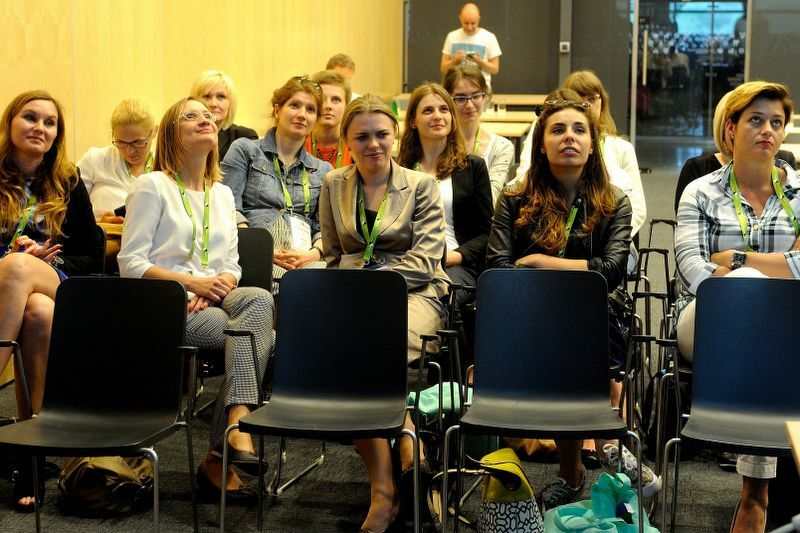 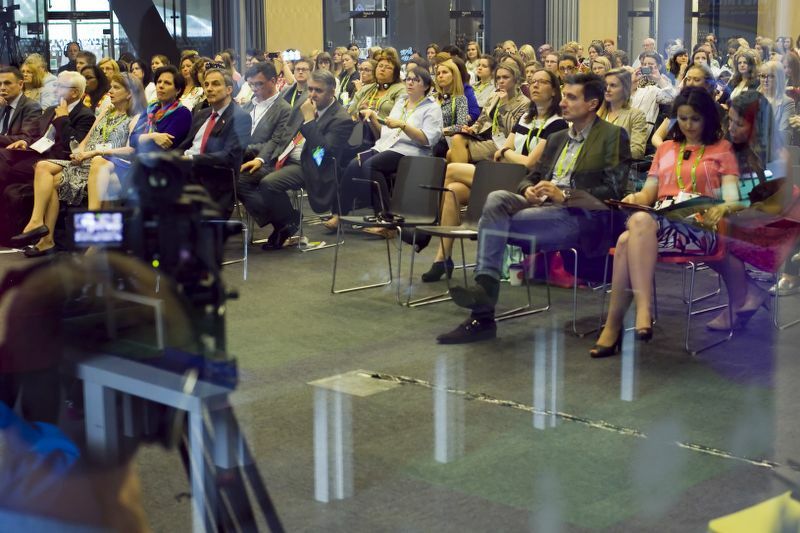 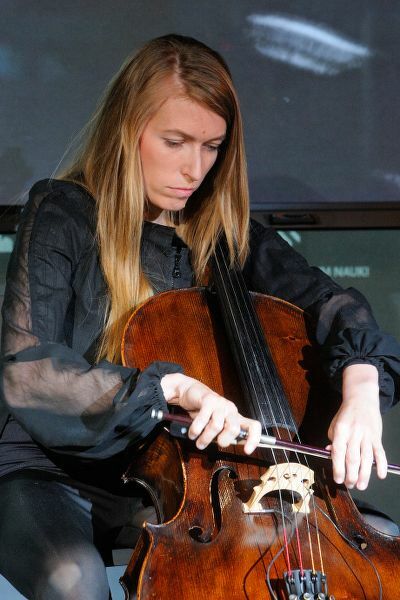 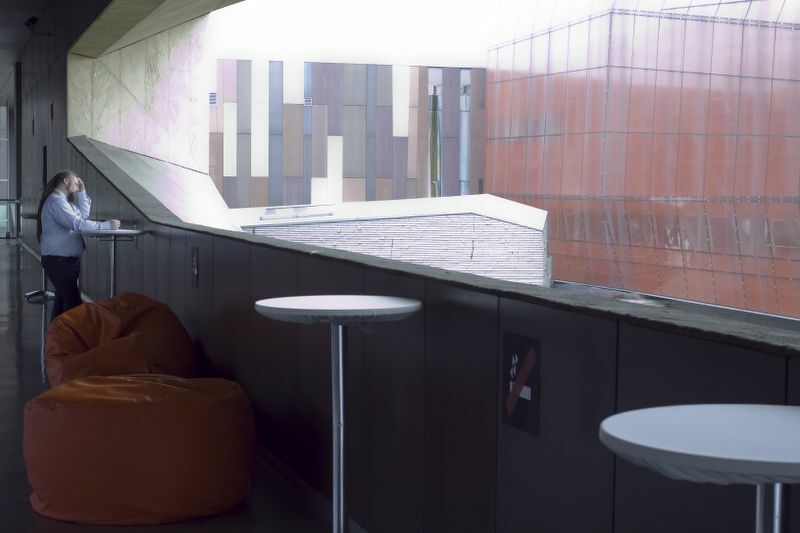 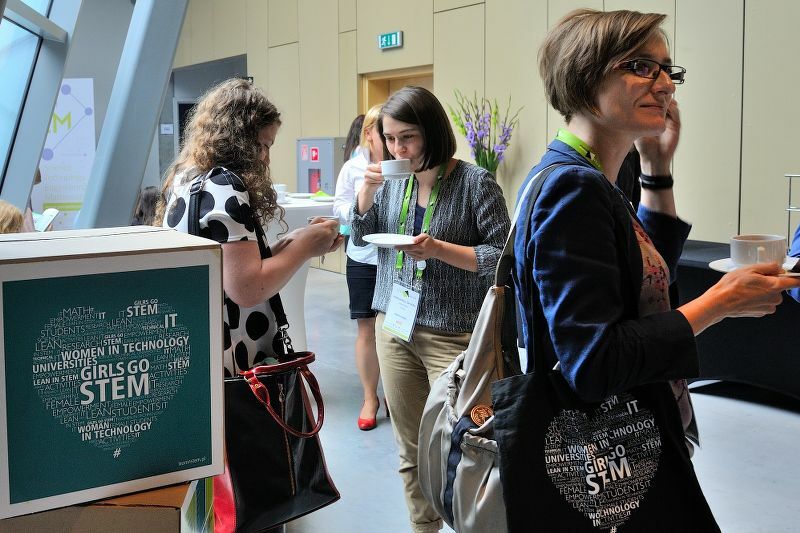 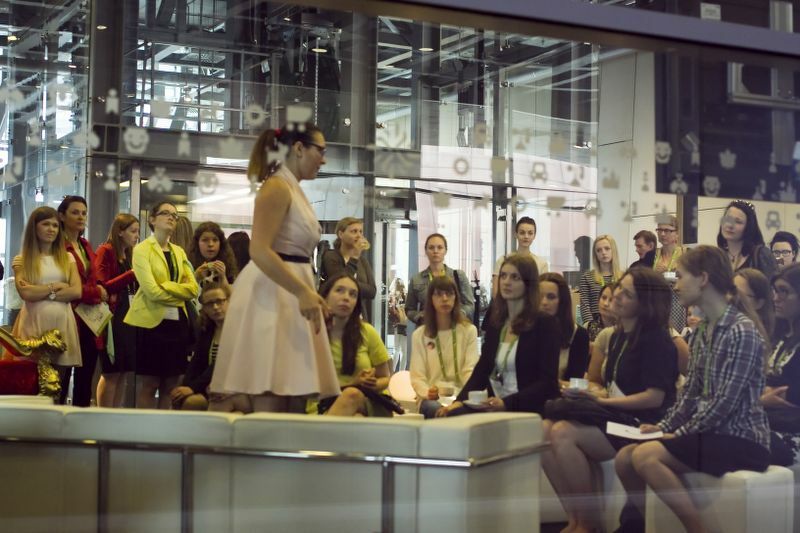 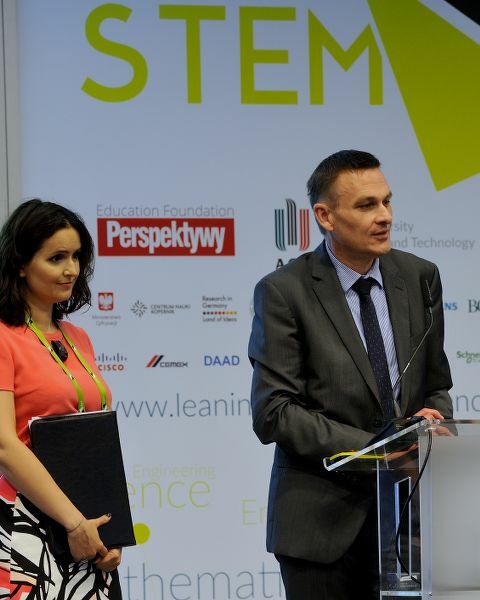 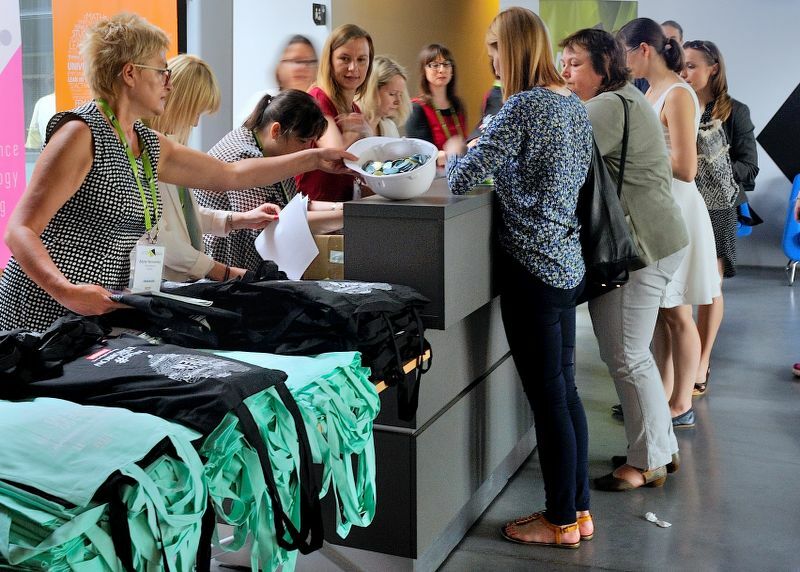 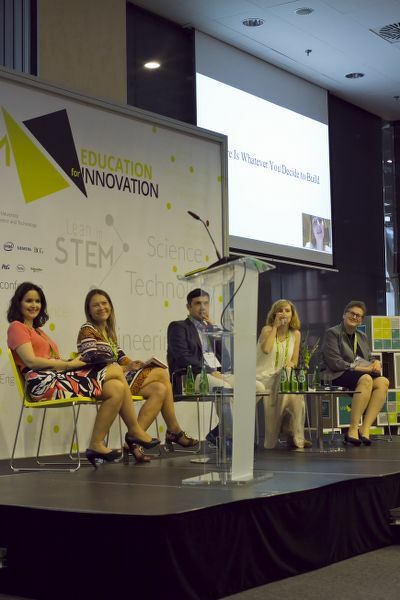 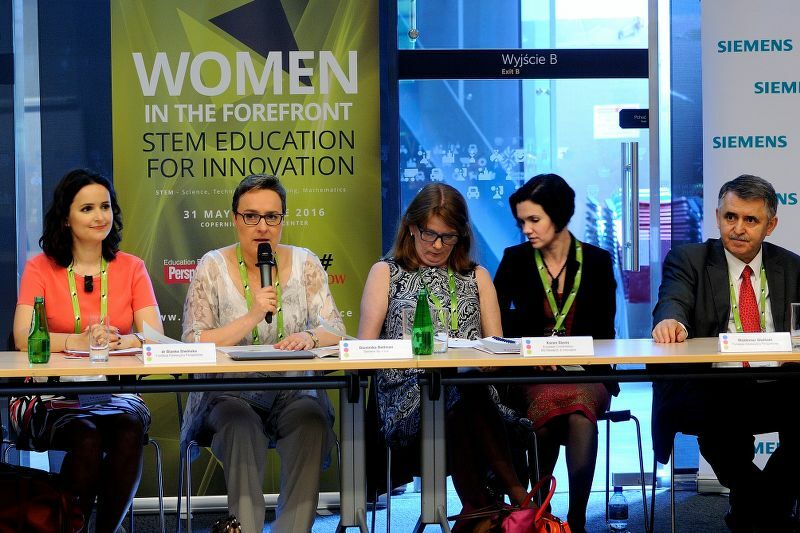 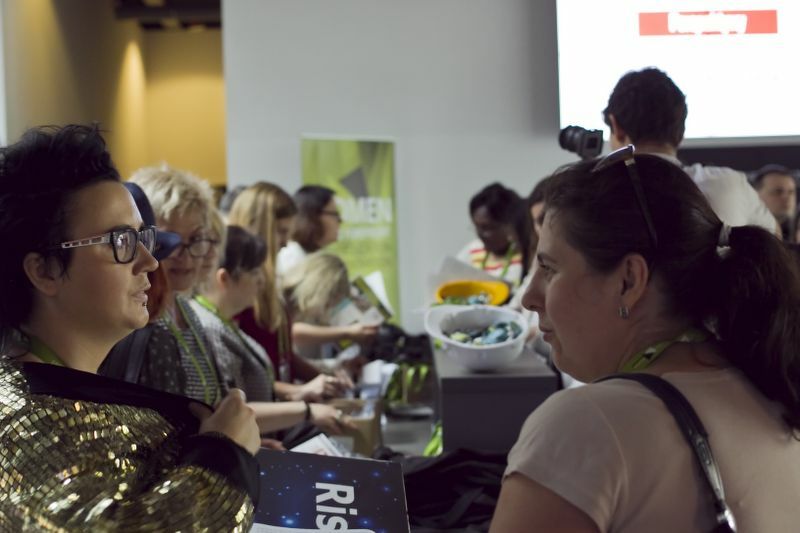 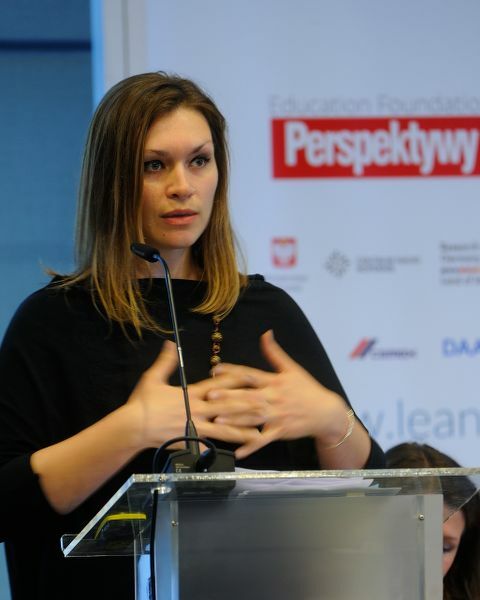 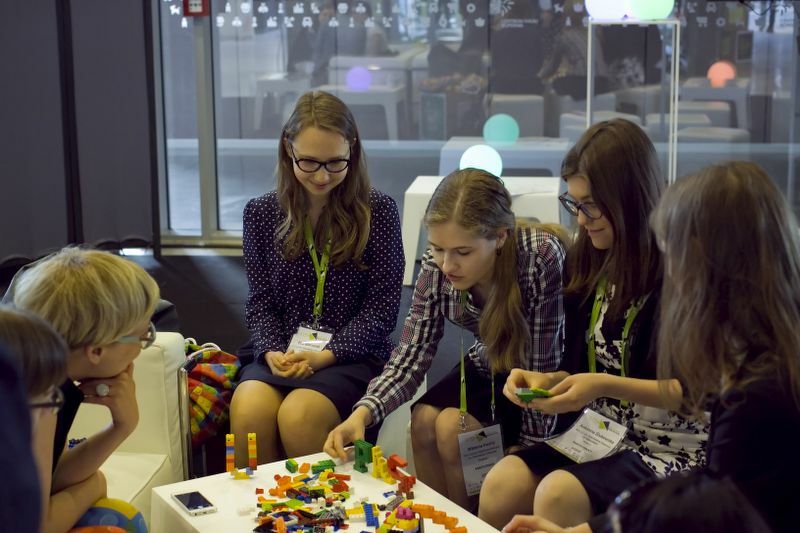 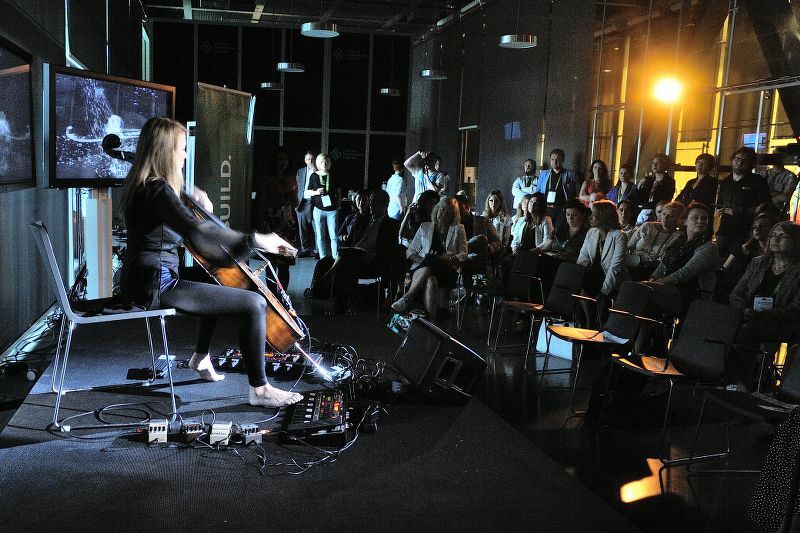 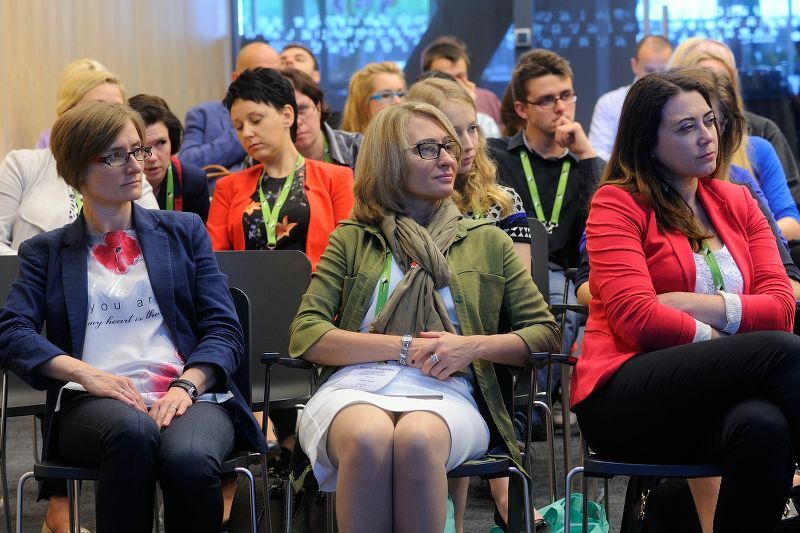 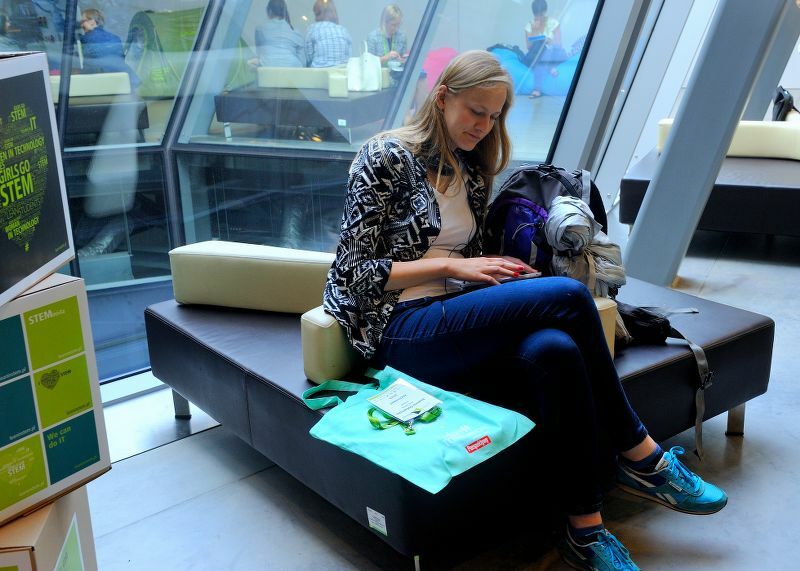 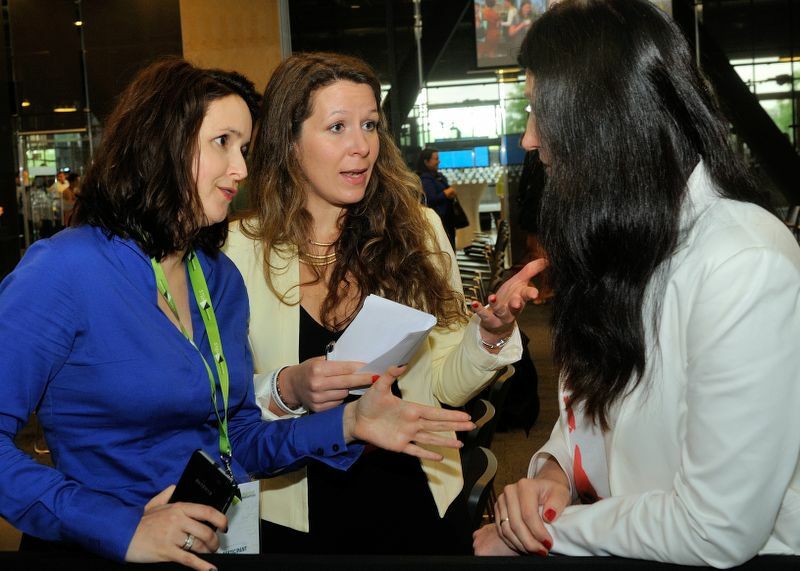 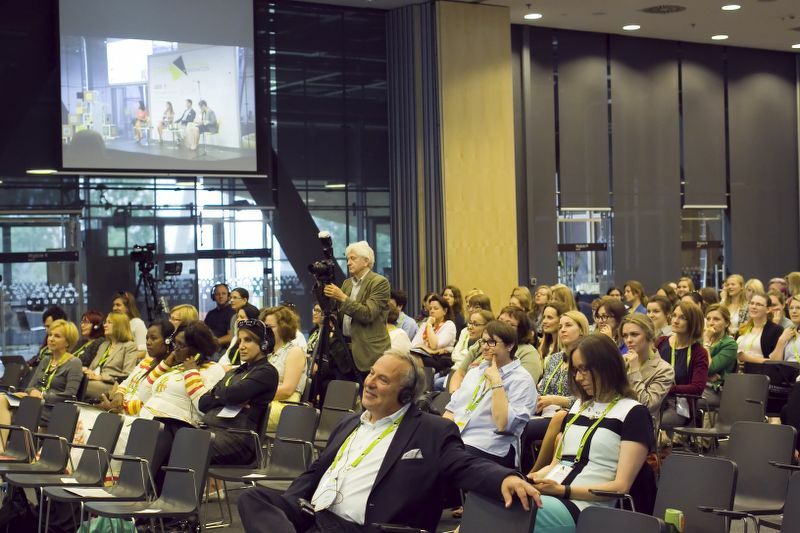 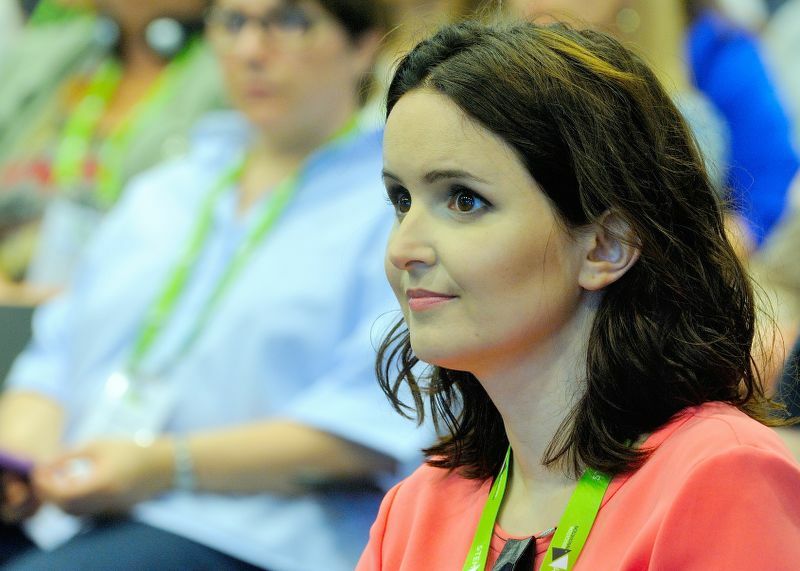 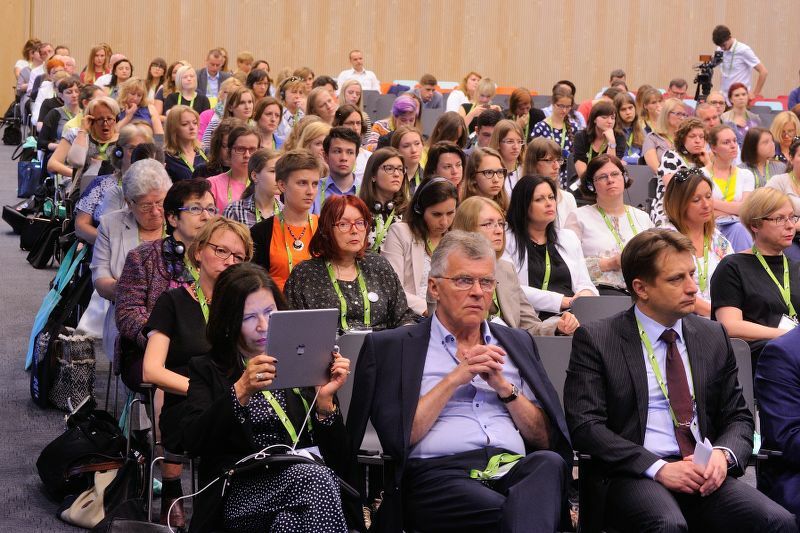 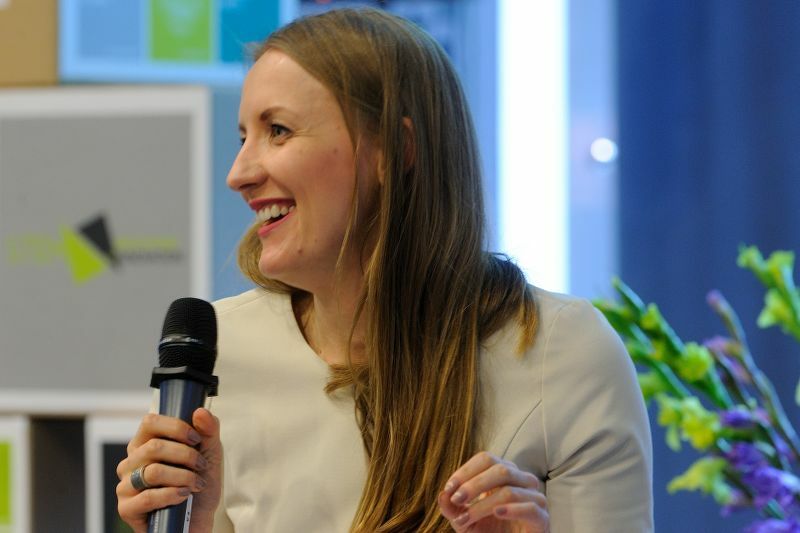 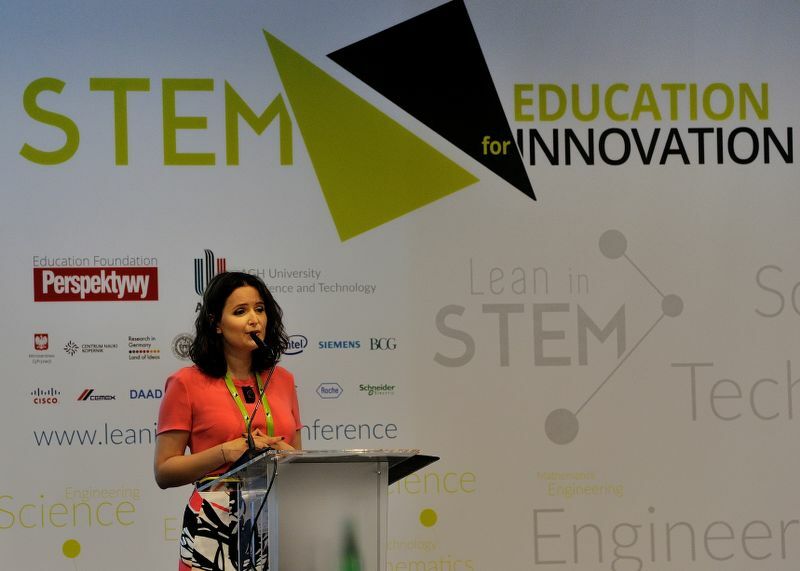 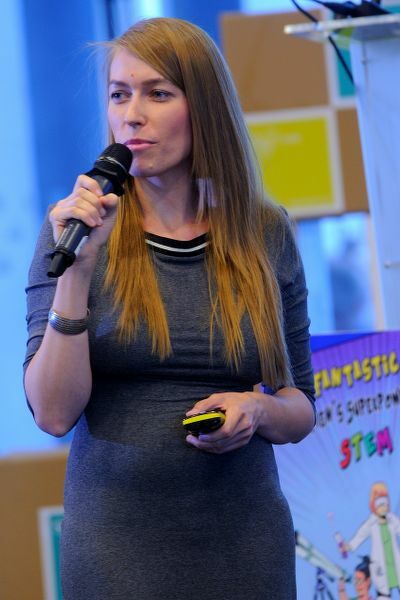 The "Lean in STEM" conference is the first attempt in Poland to answer the question how (and why?) 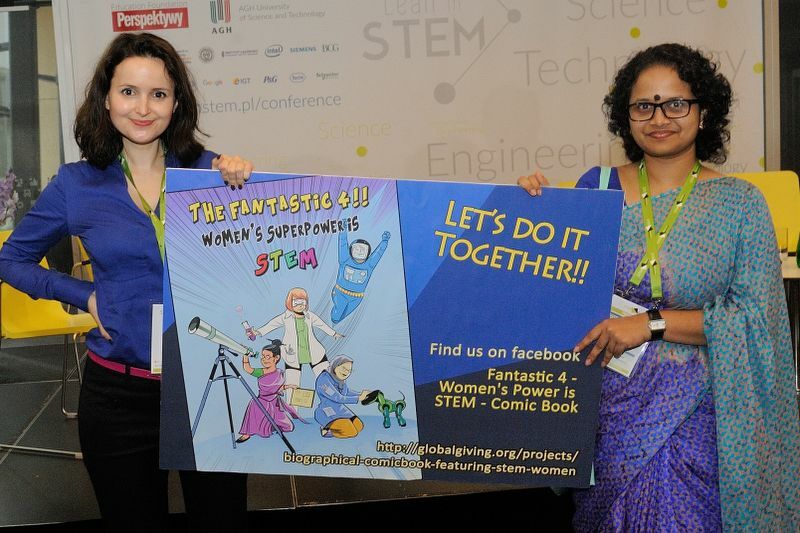 to support women in STEM. 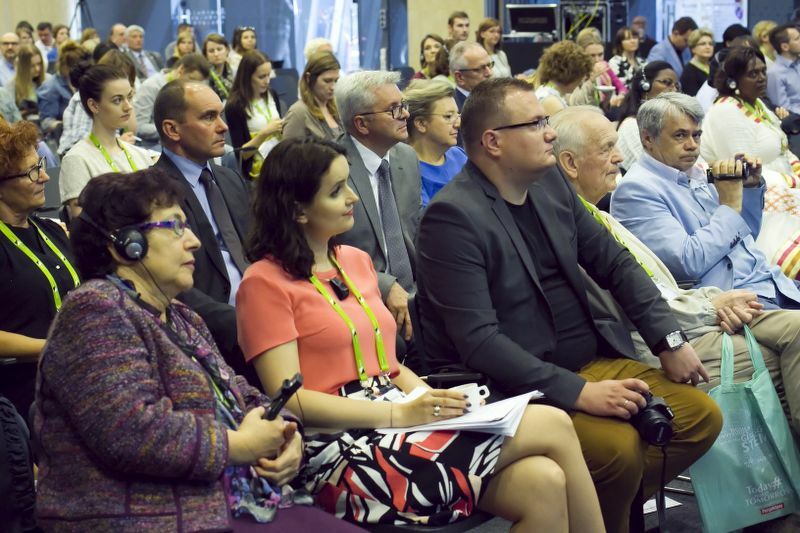 And why it is important to do so at all the available levels: citizen initiatives, state public policy in the area of education and social potential activation, and the strategy of socially responsible industry and business. 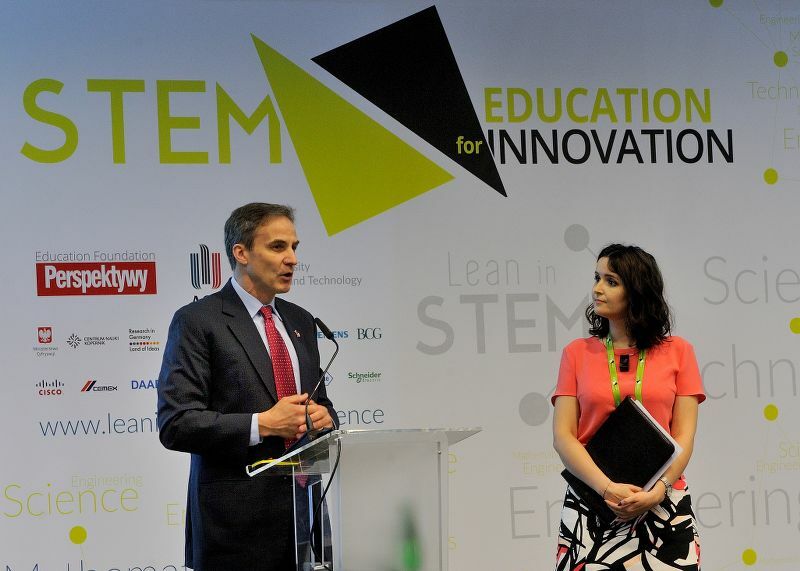 We will also debate on the importance of STEM education and the need for its prioritisation in the state’s policy. 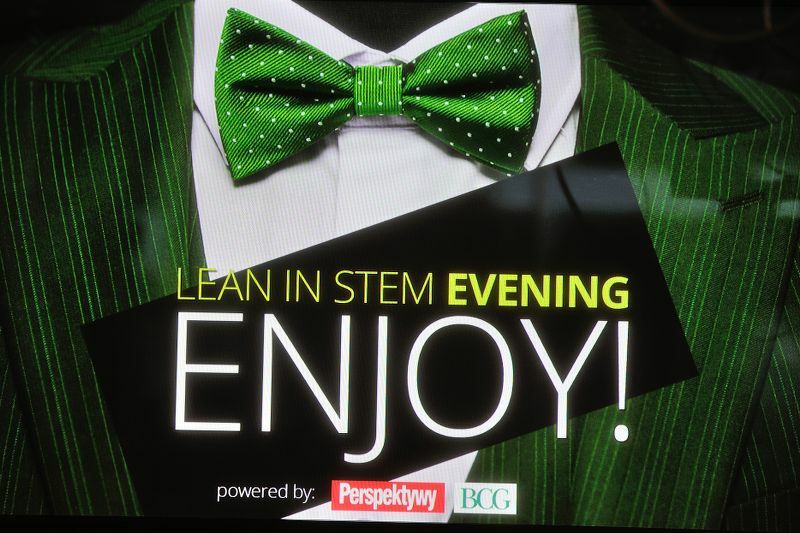 The event is part of the Lean in STEM projects. 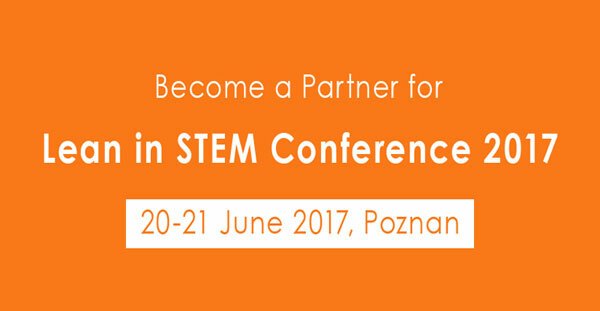 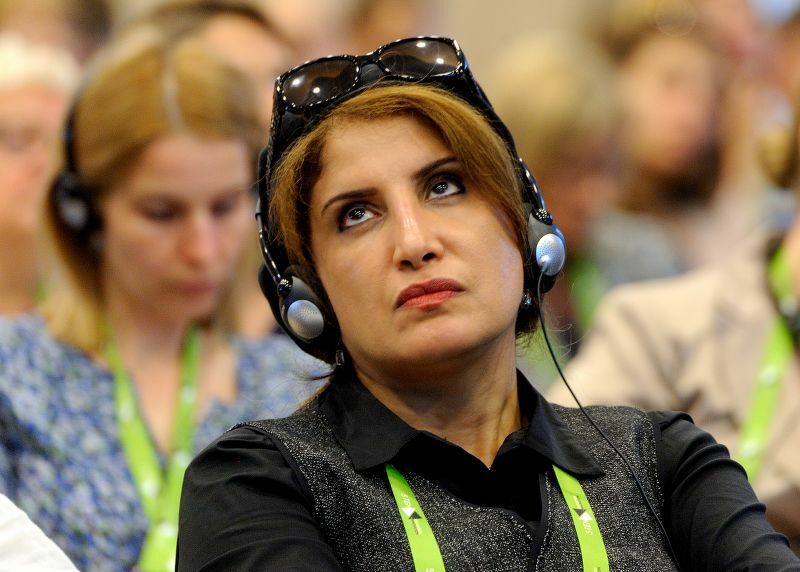 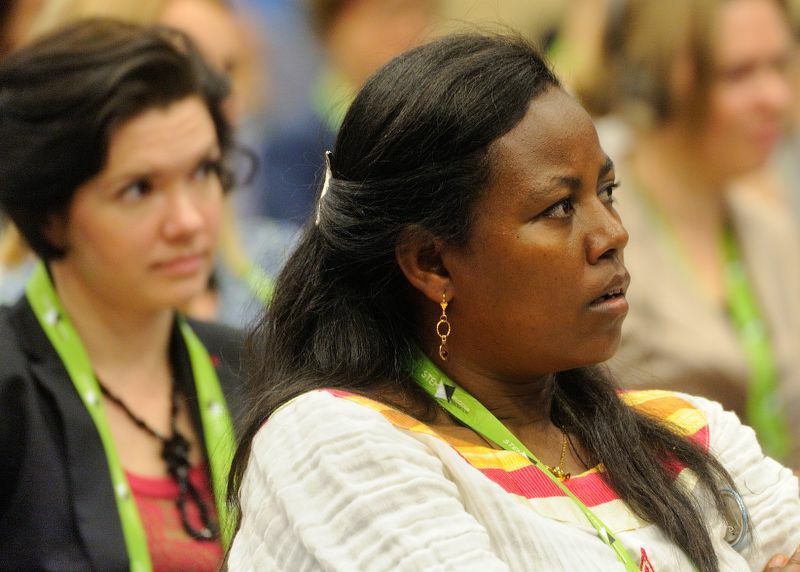 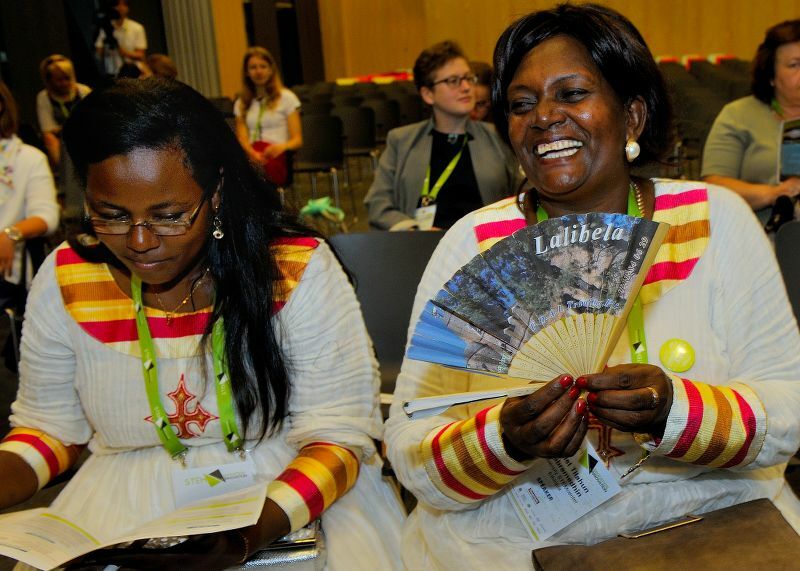 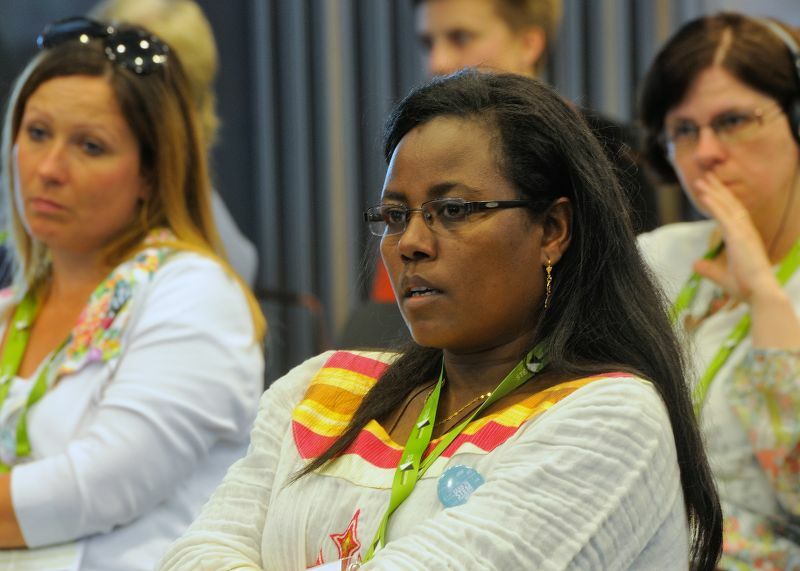 International conference on STEM and the role of women in innovative development. 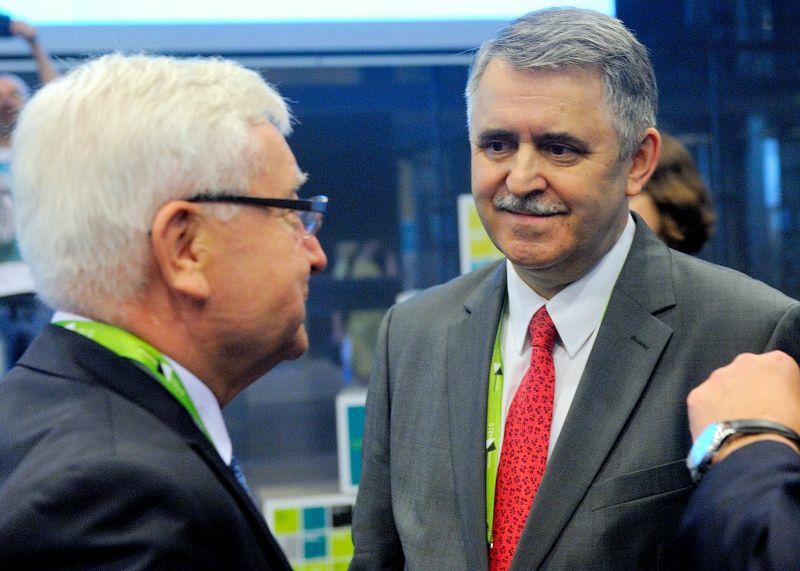 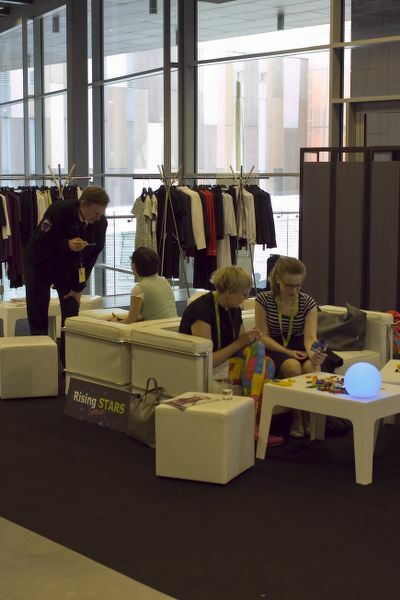 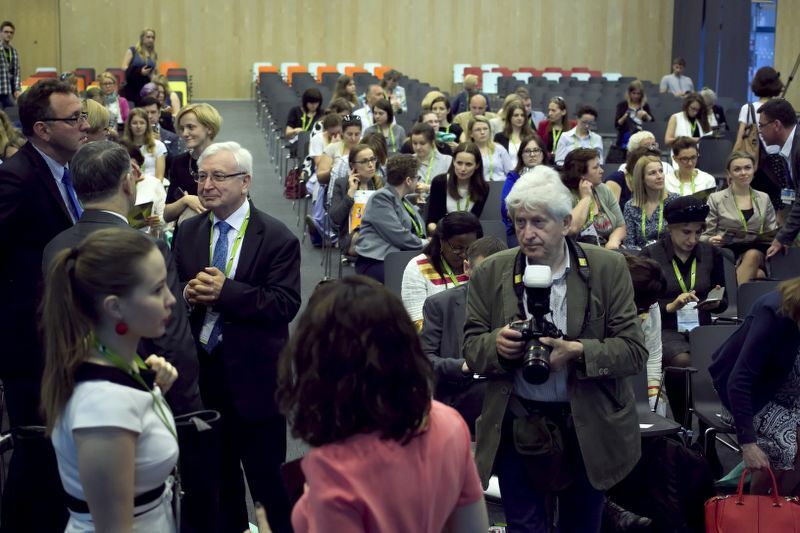 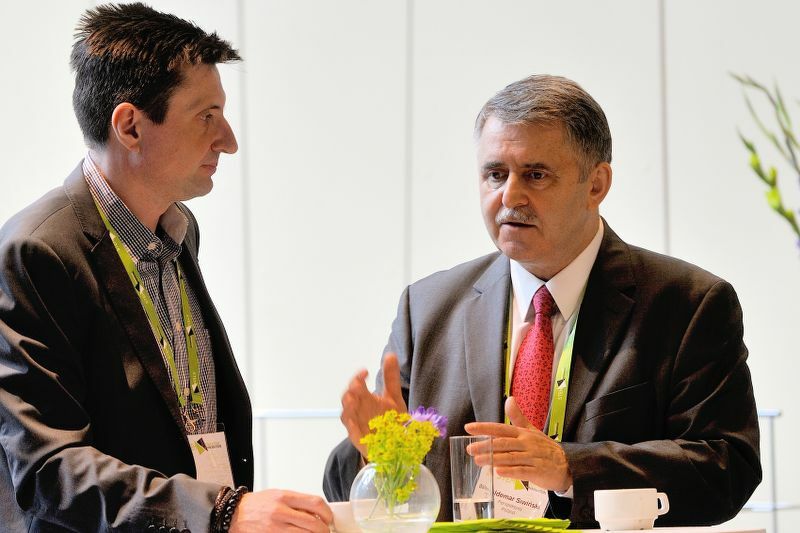 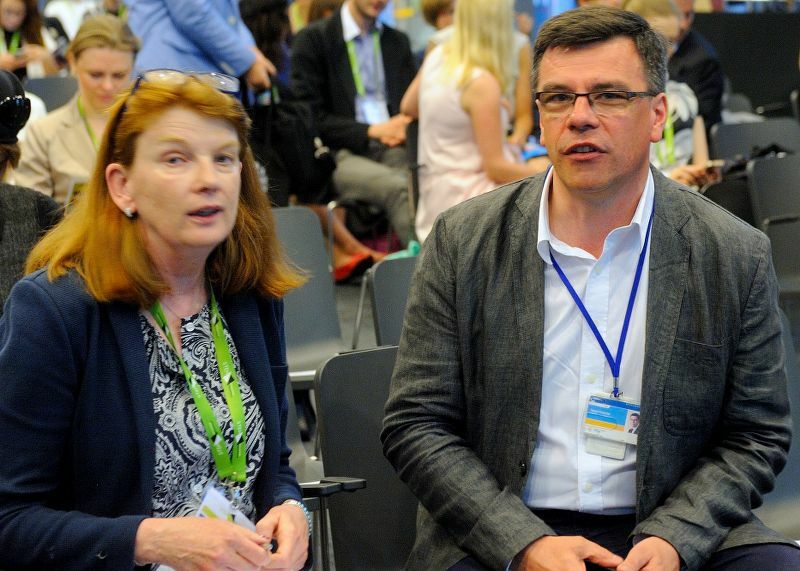 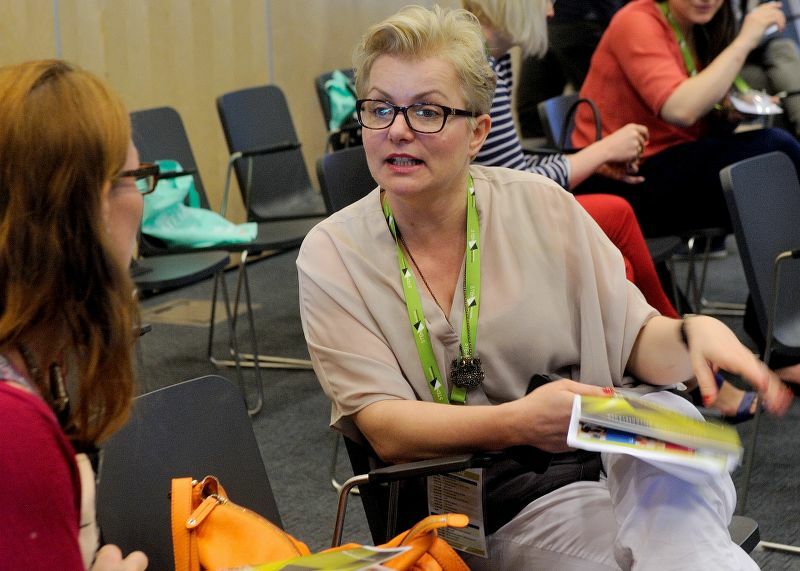 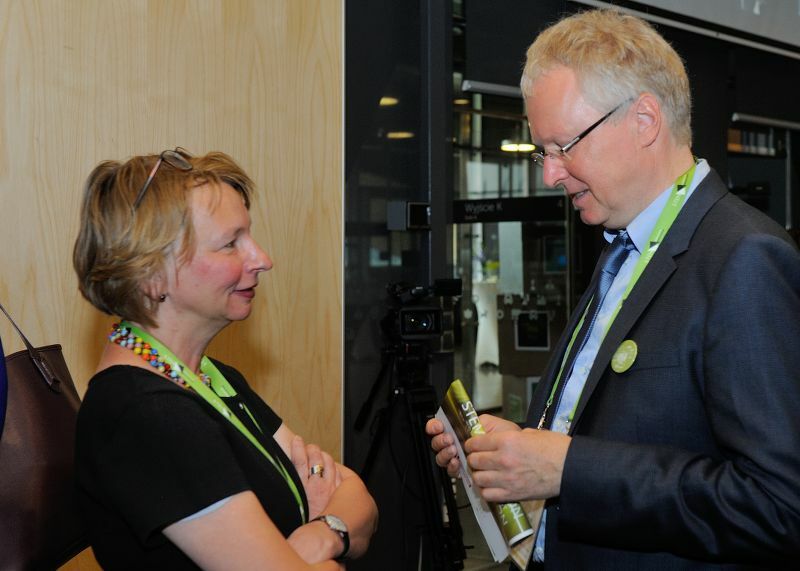 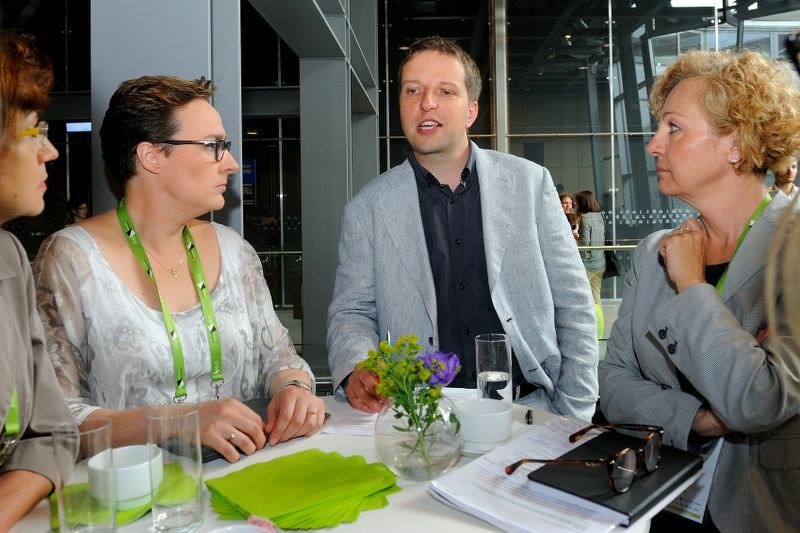 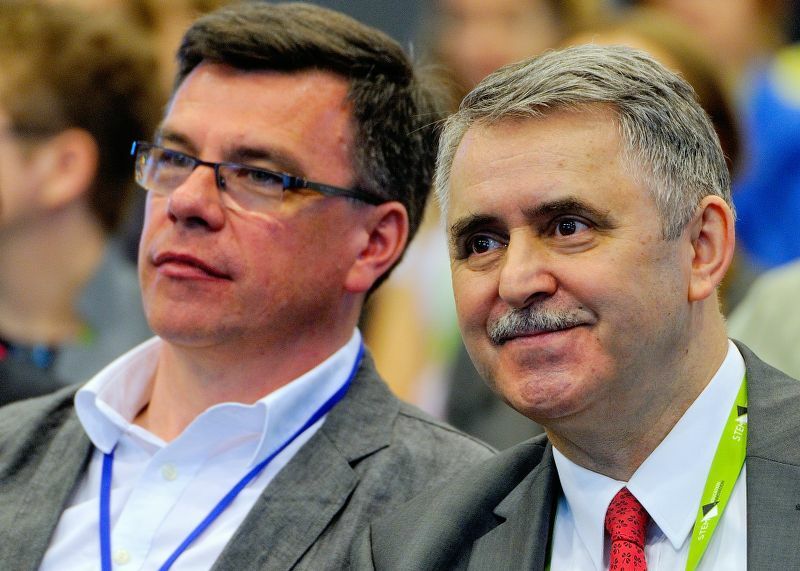 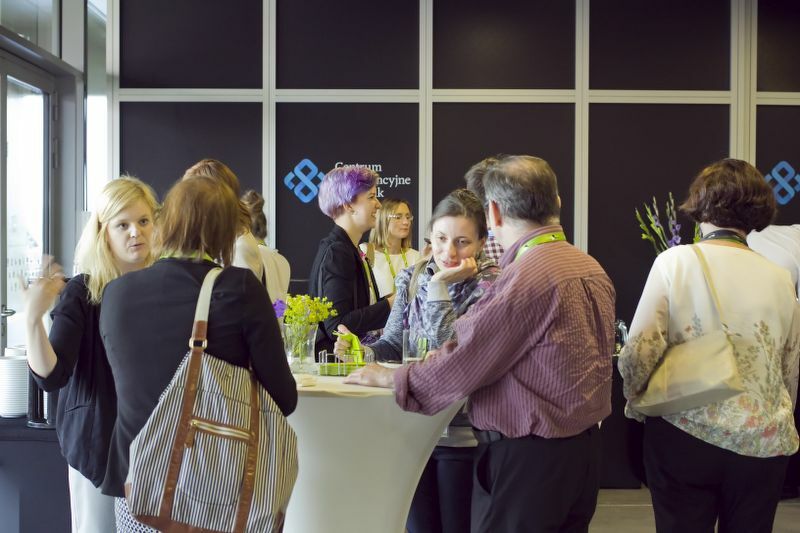 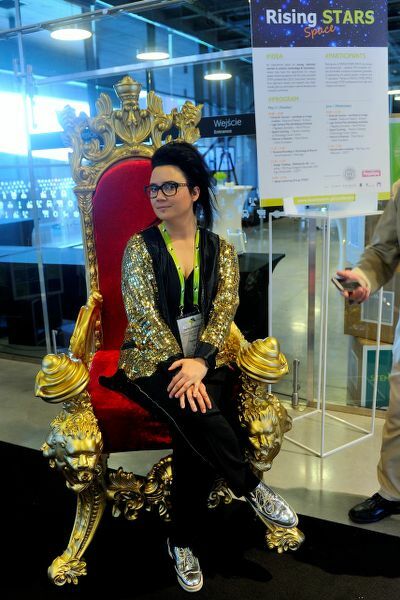 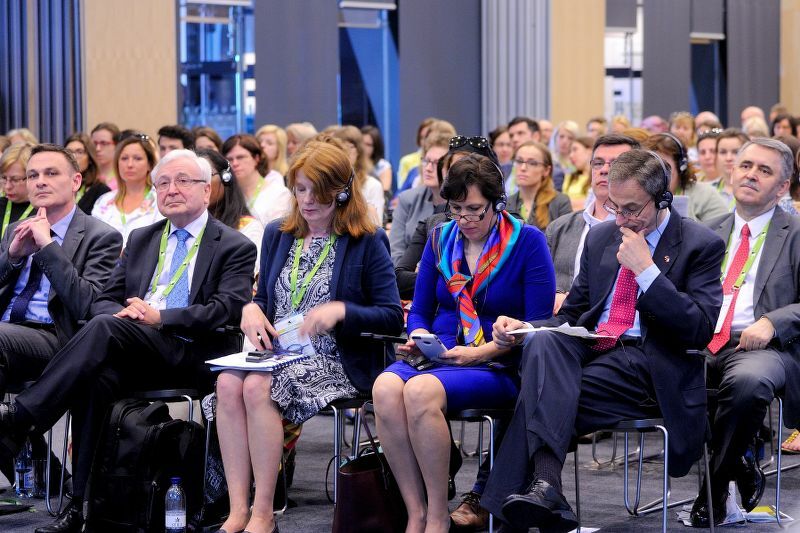 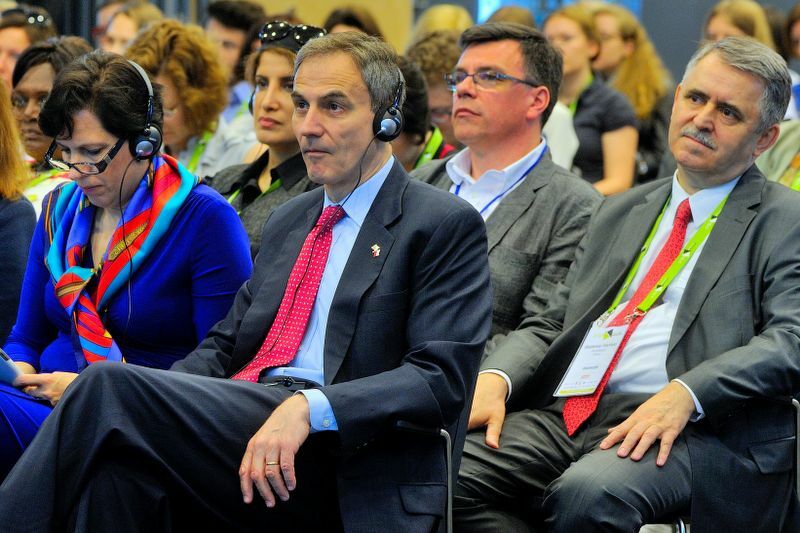 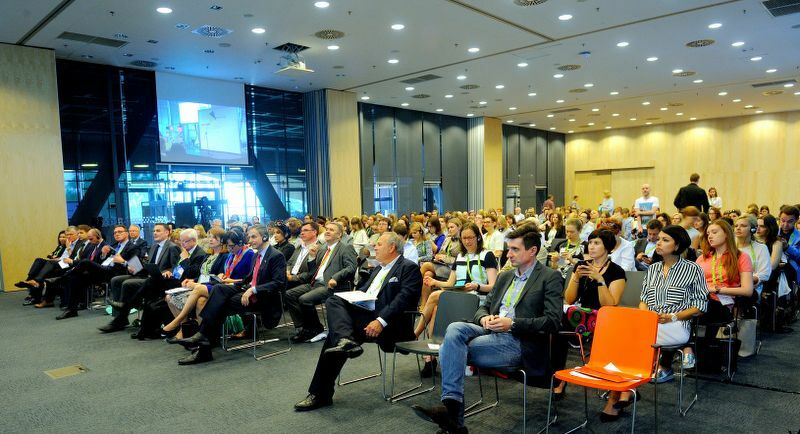 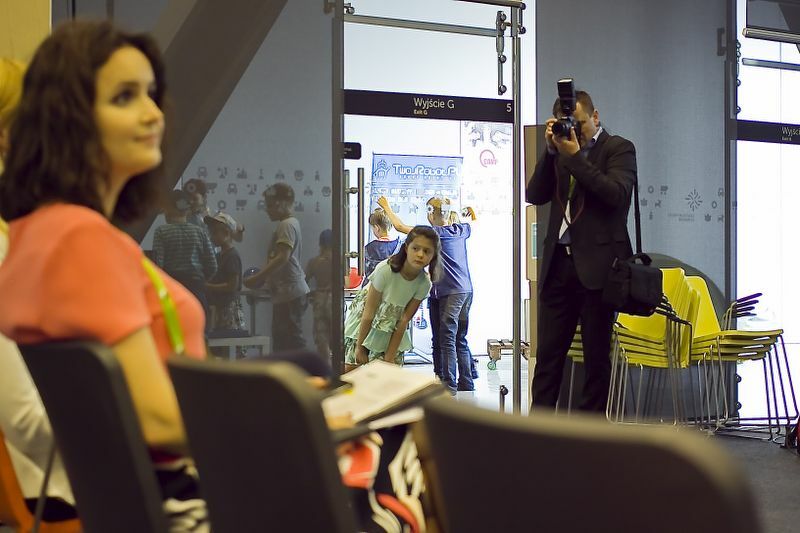 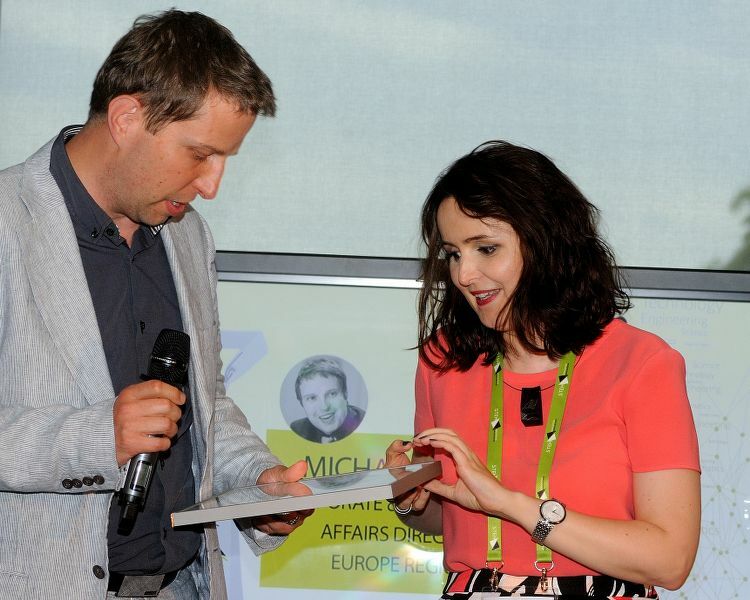 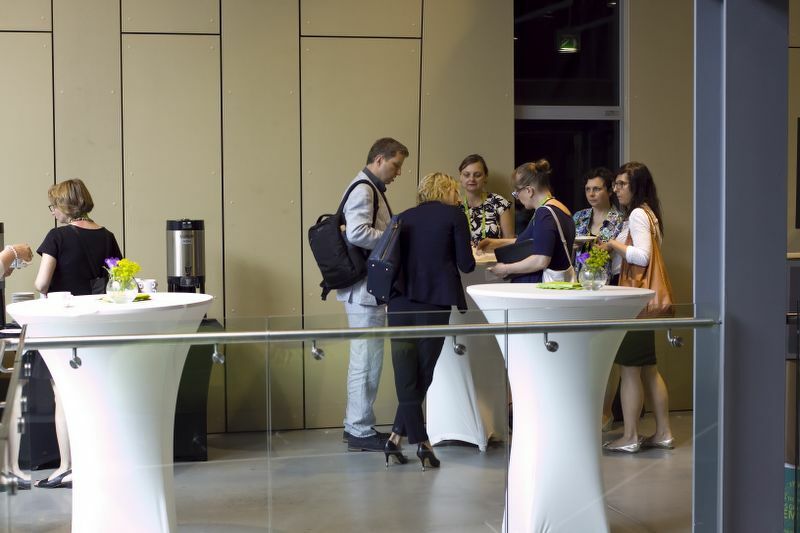 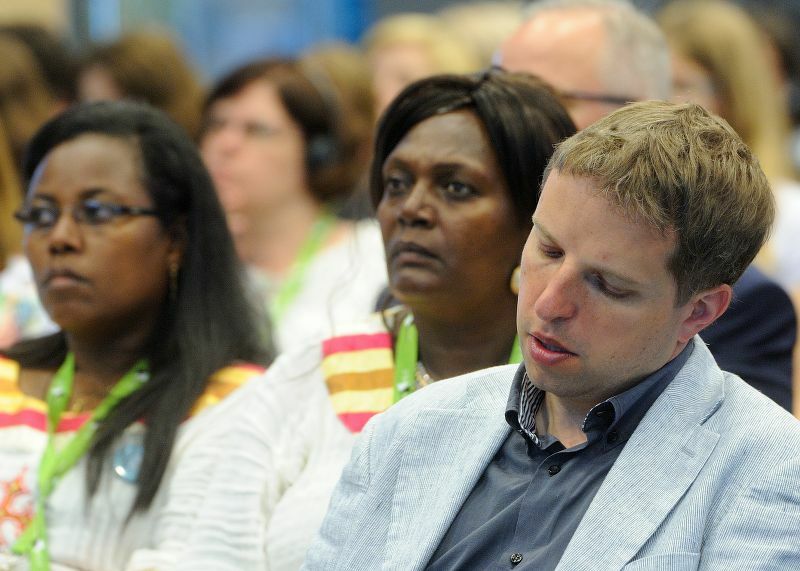 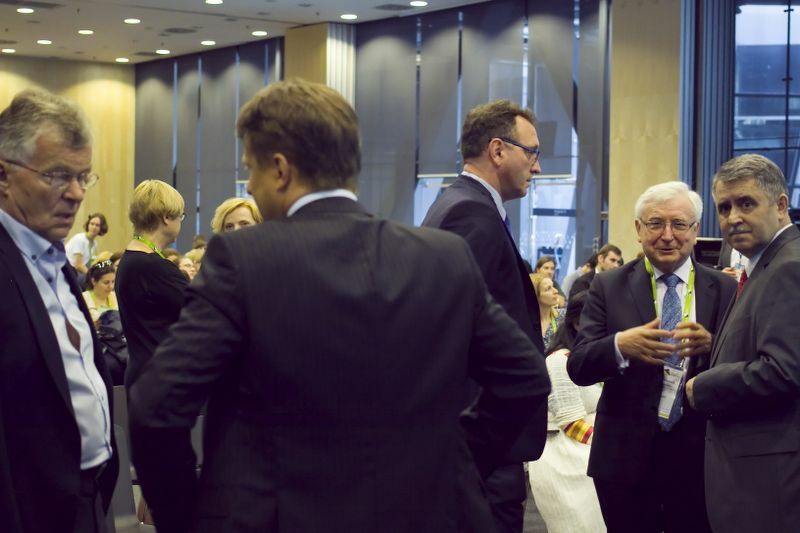 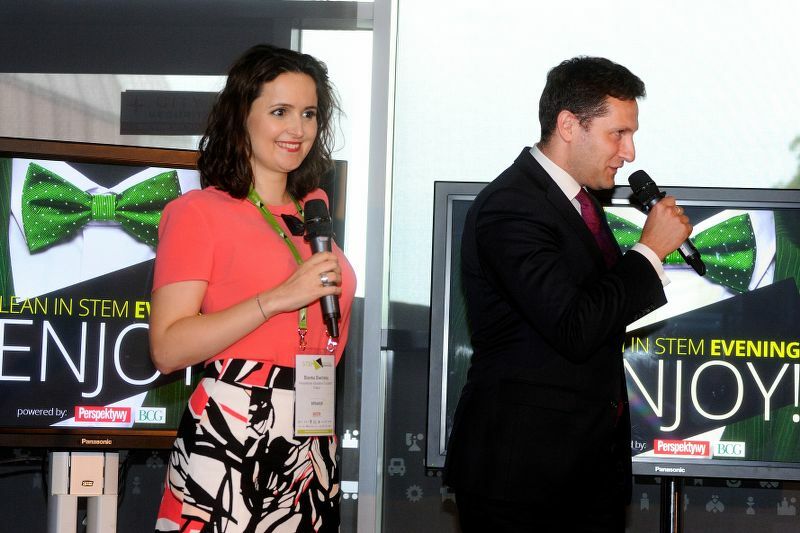 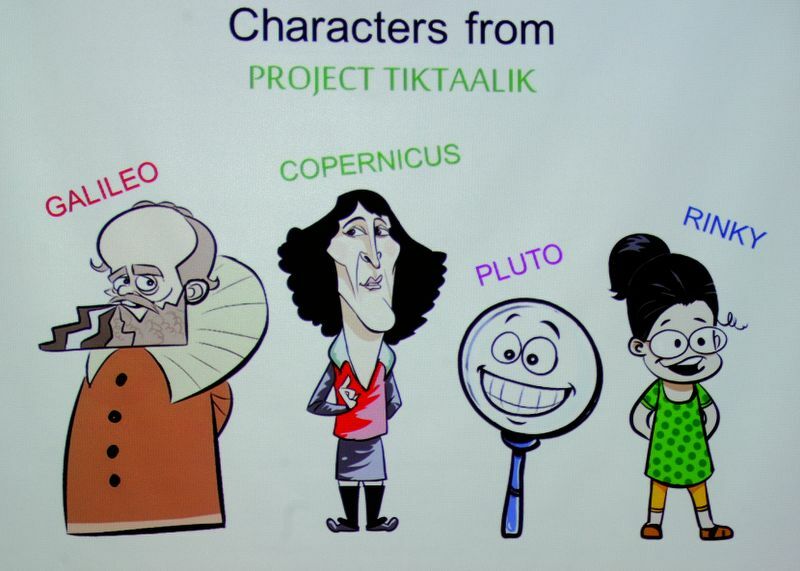 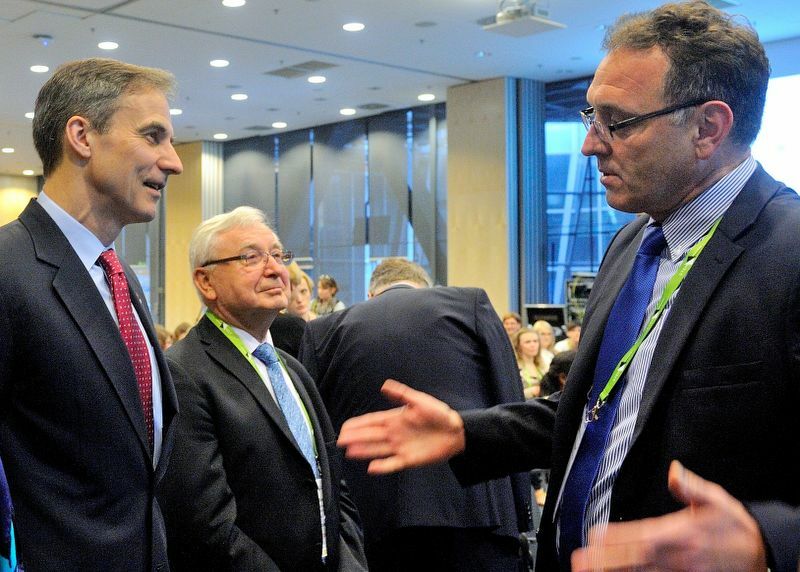 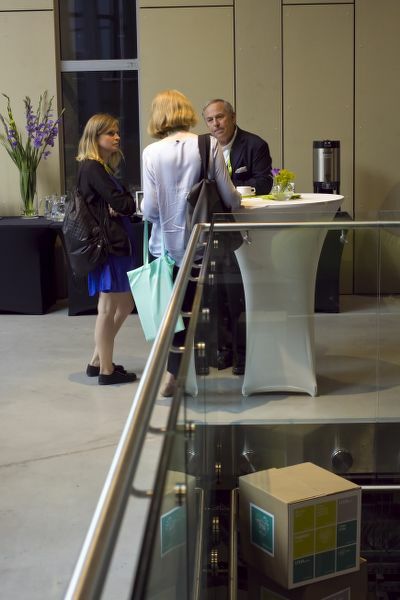 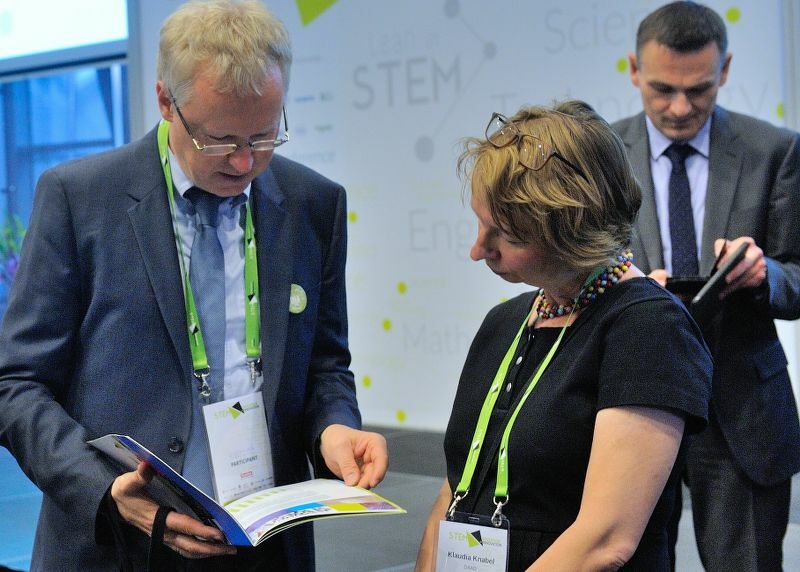 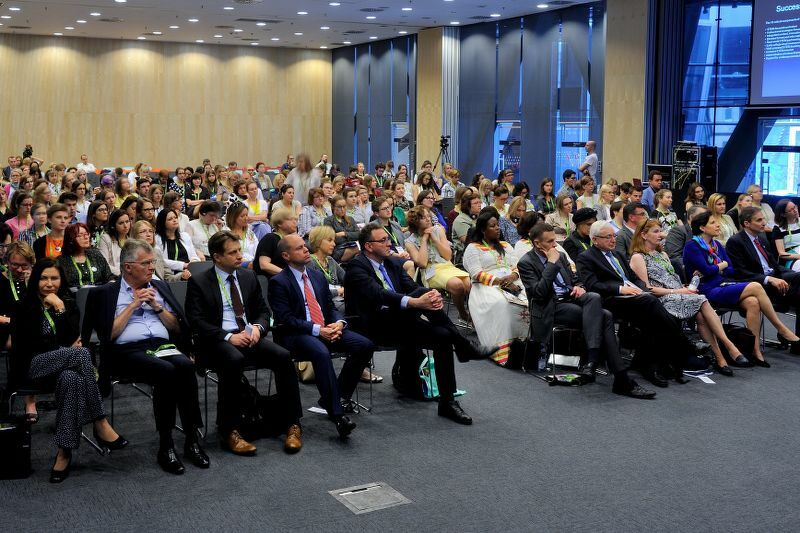 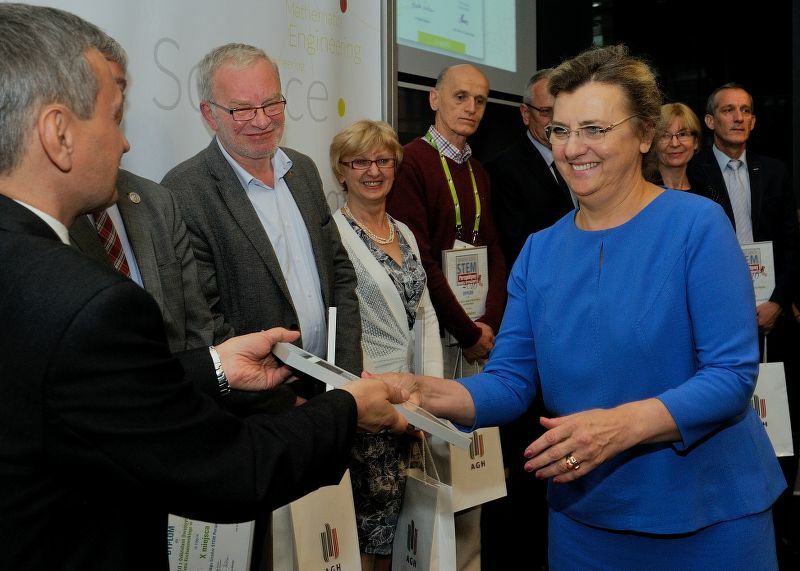 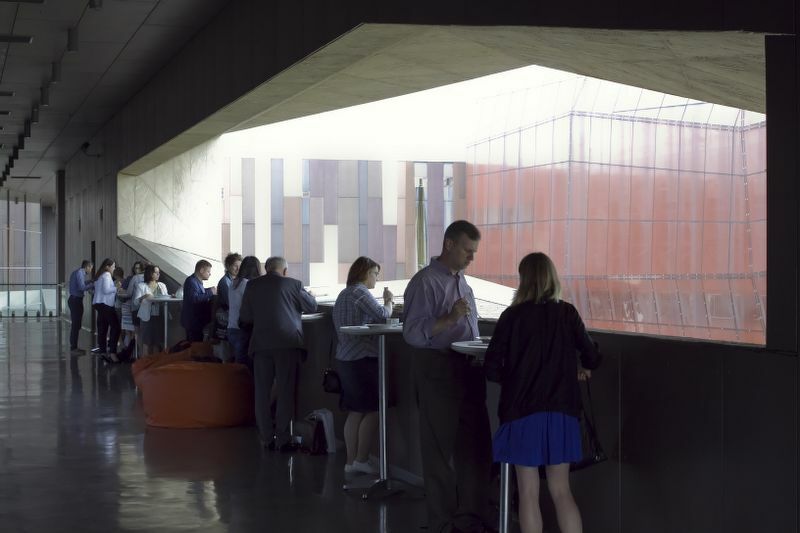 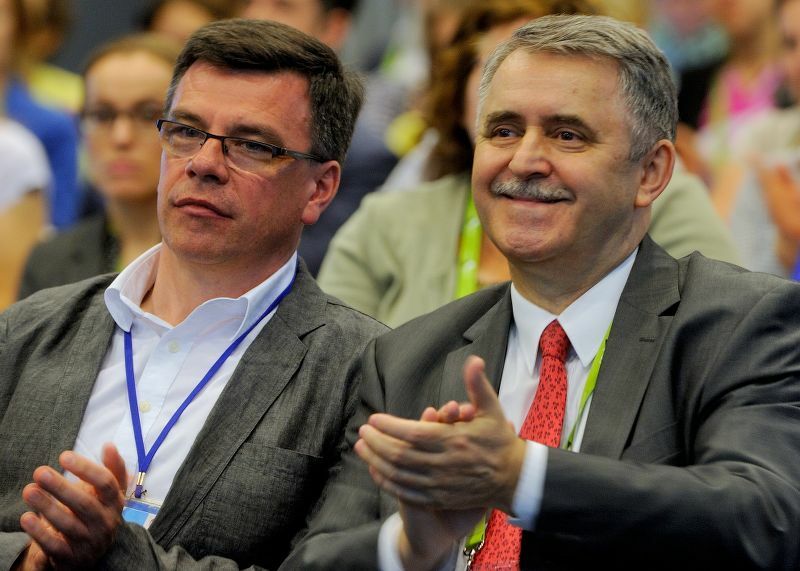 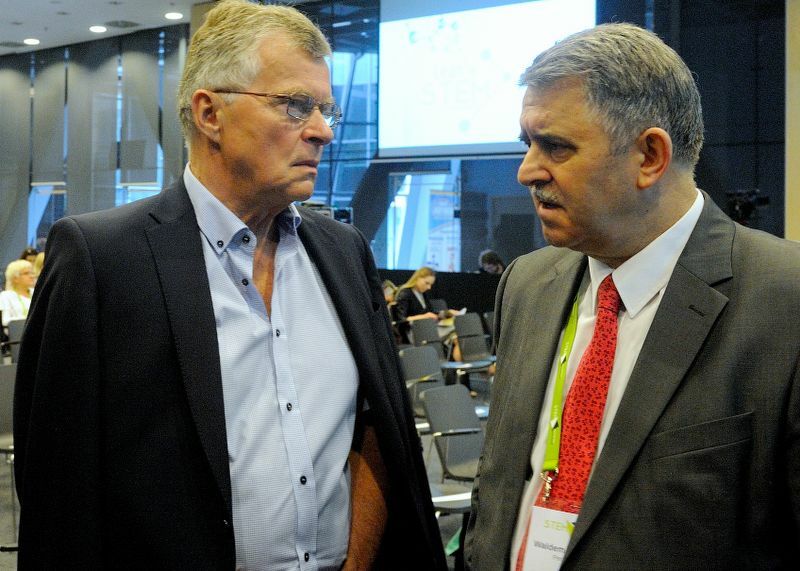 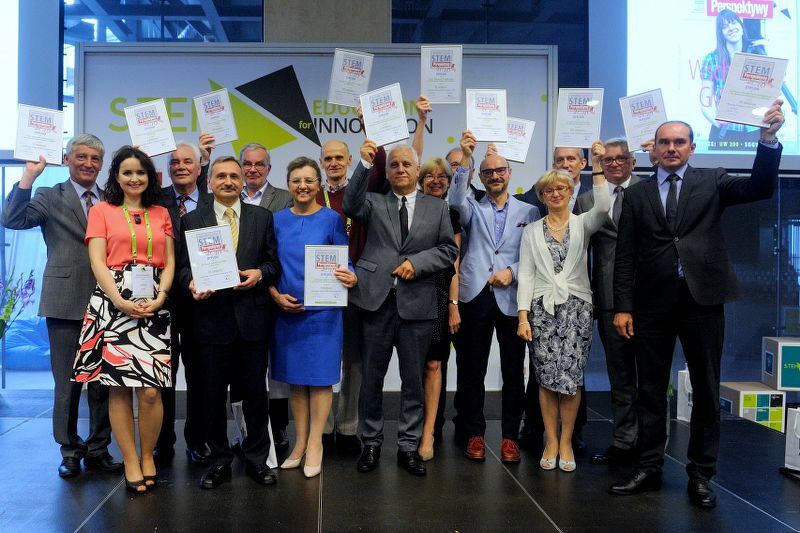 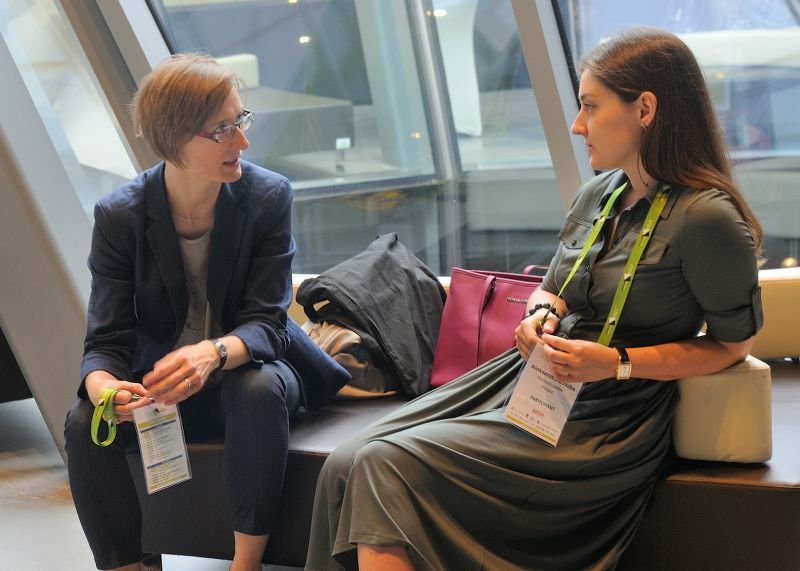 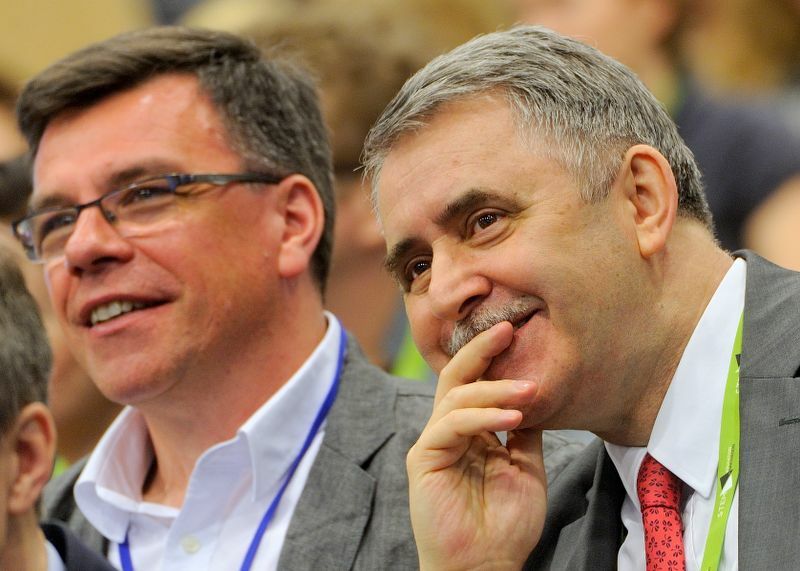 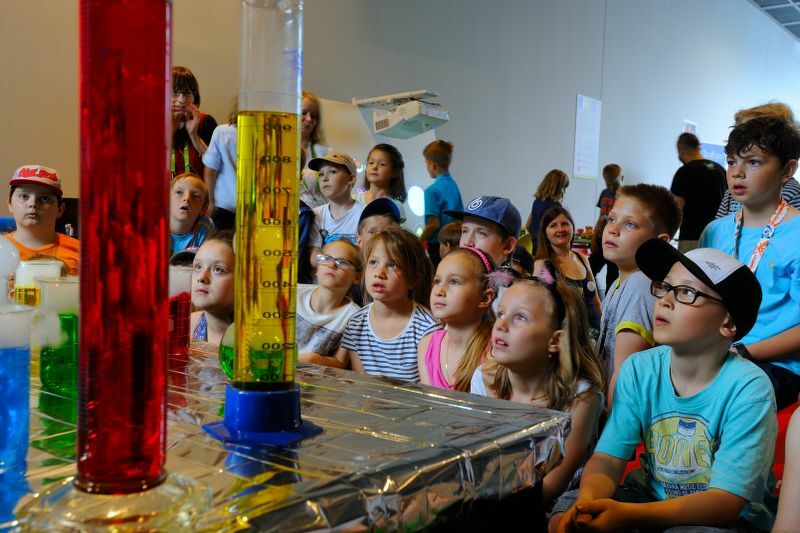 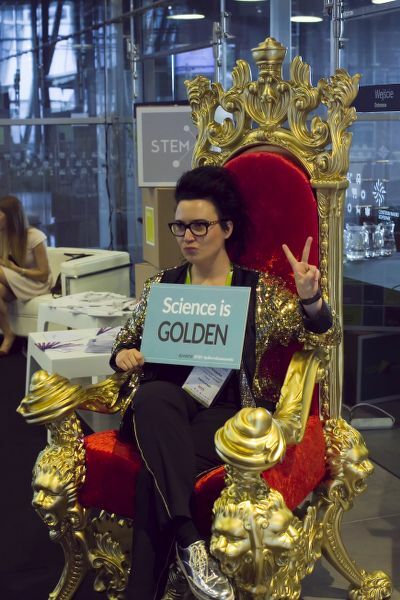 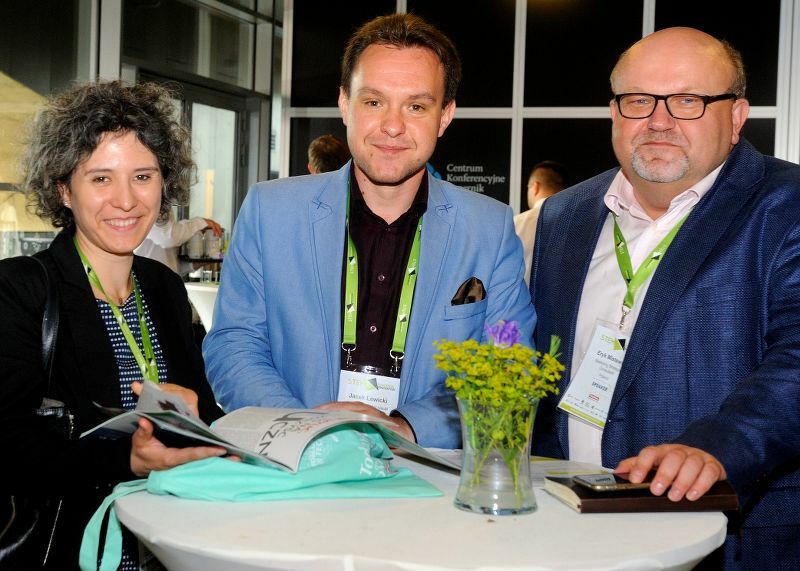 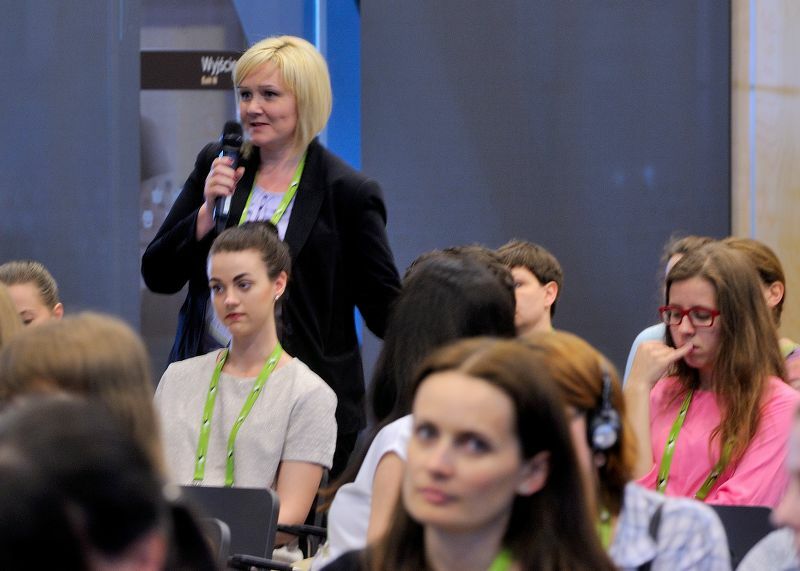 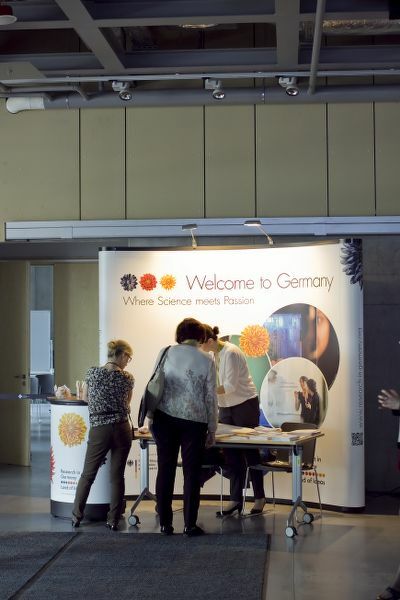 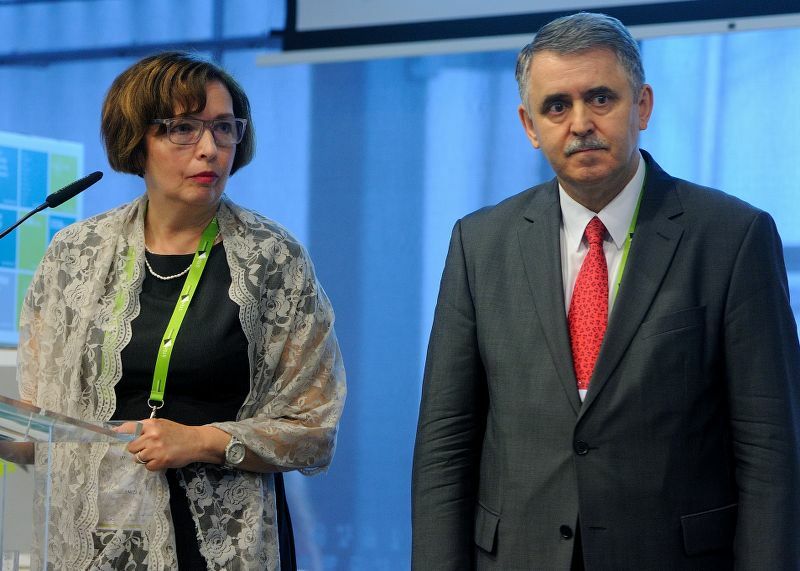 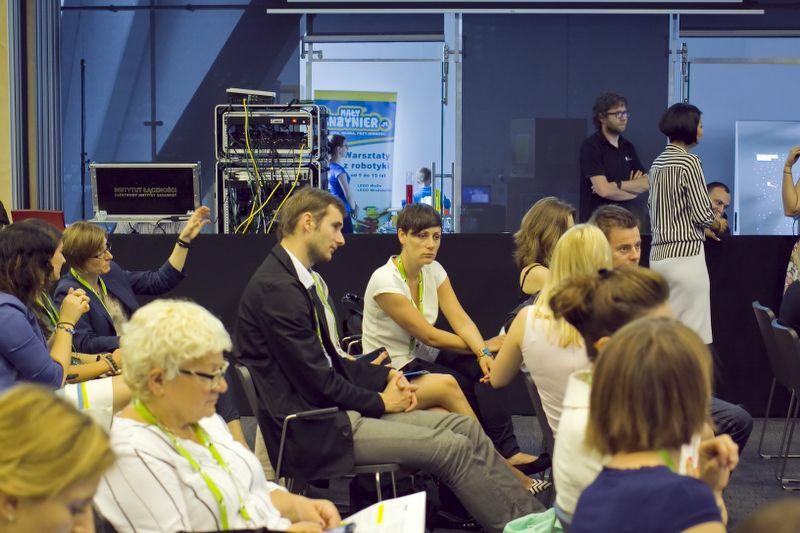 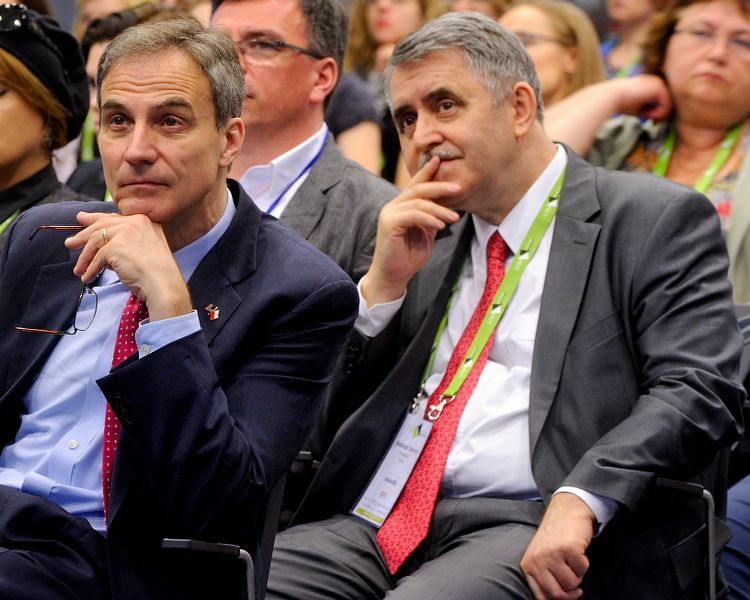 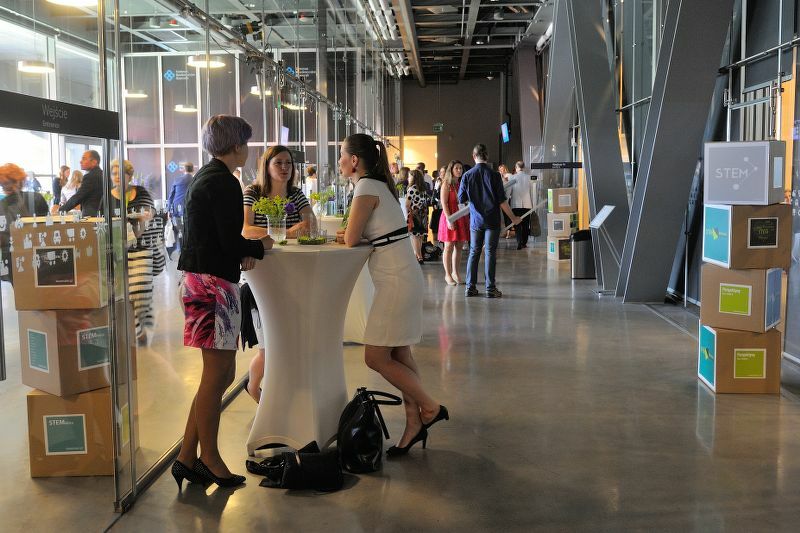 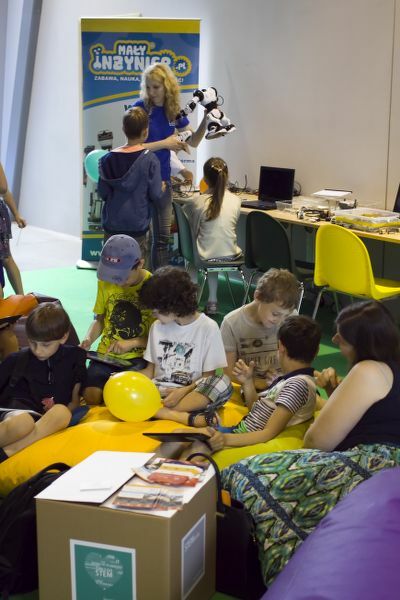 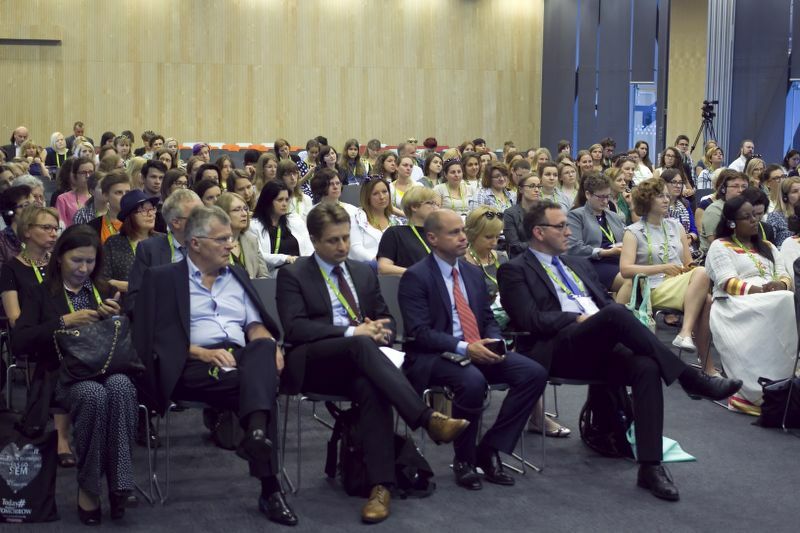 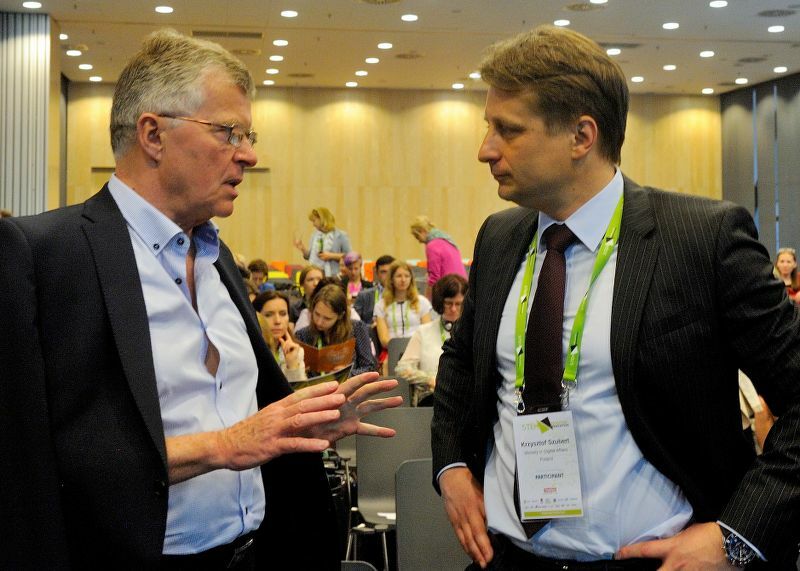 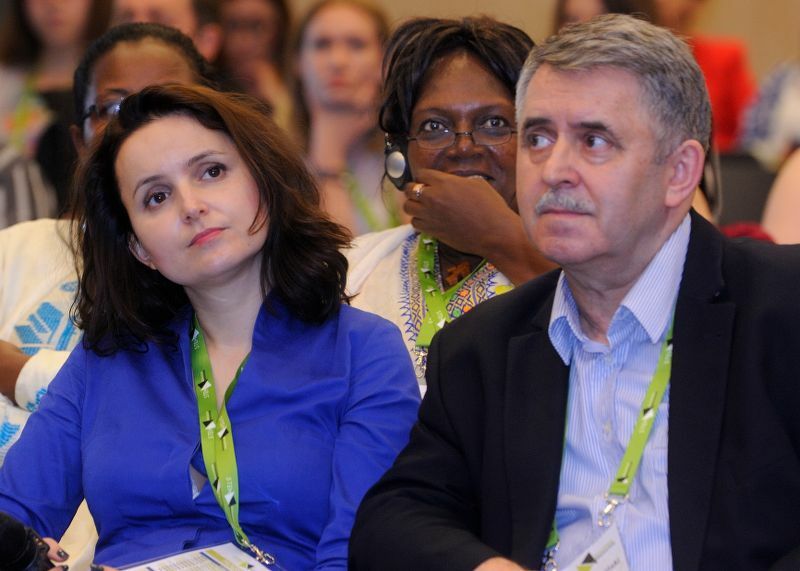 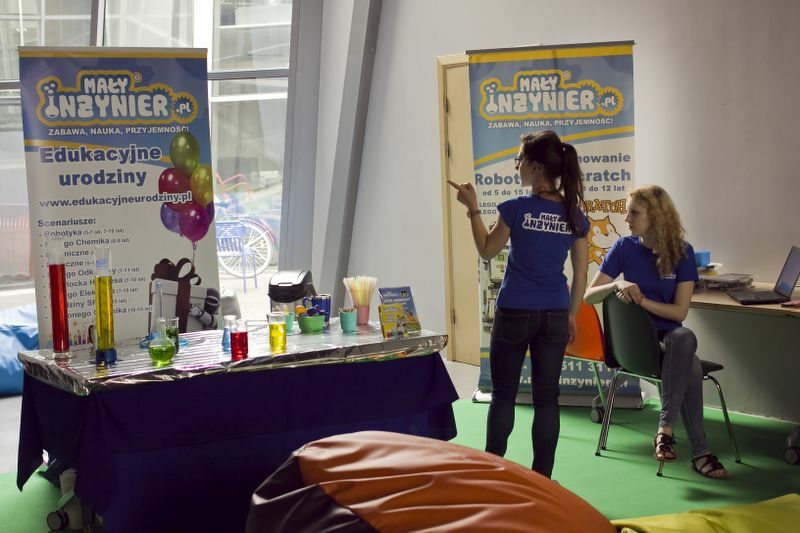 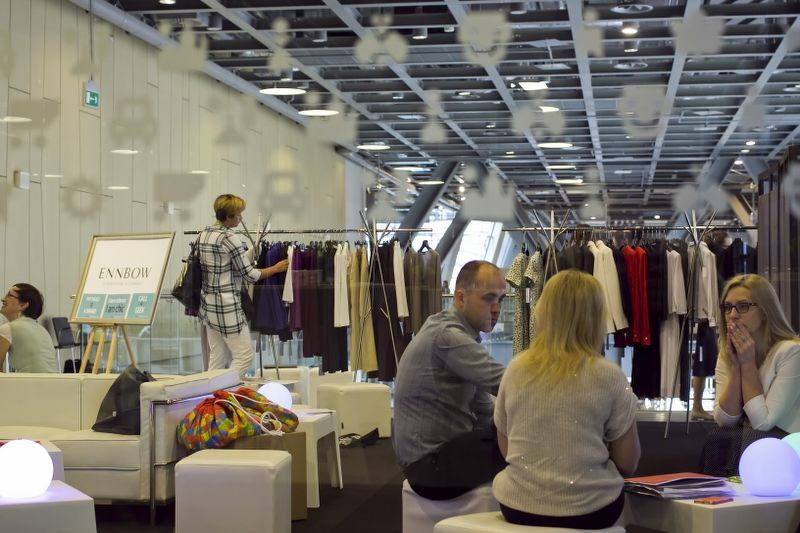 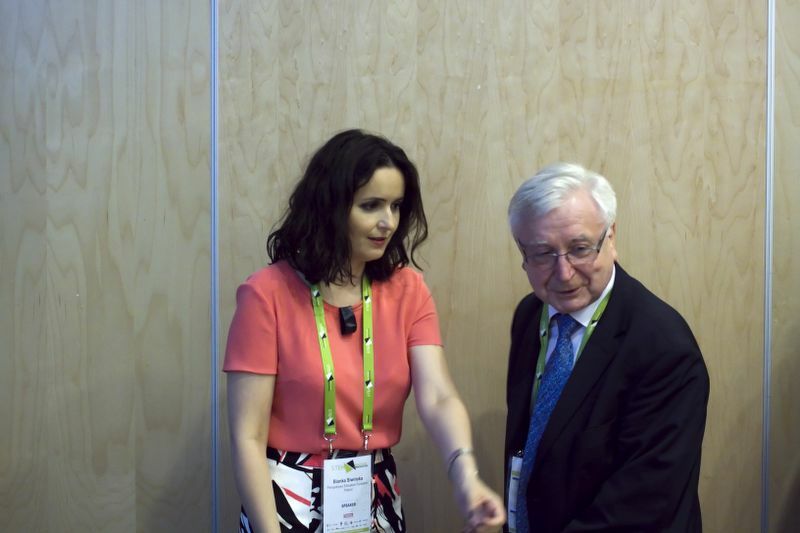 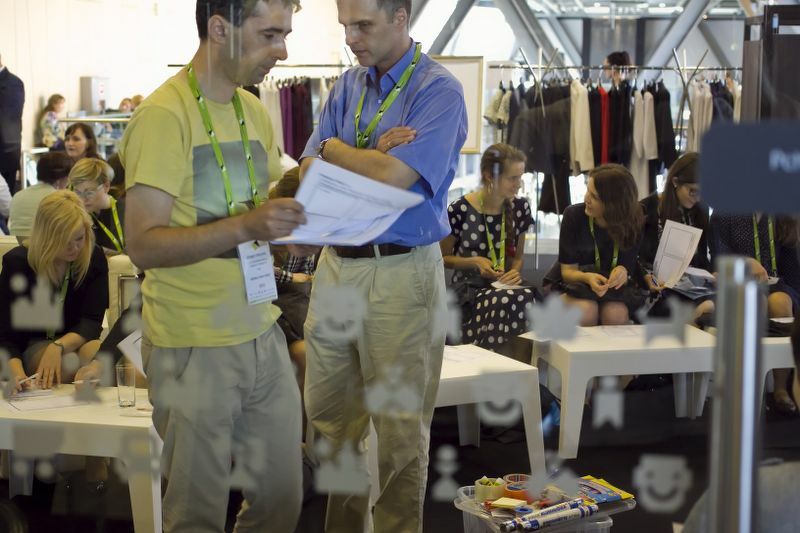 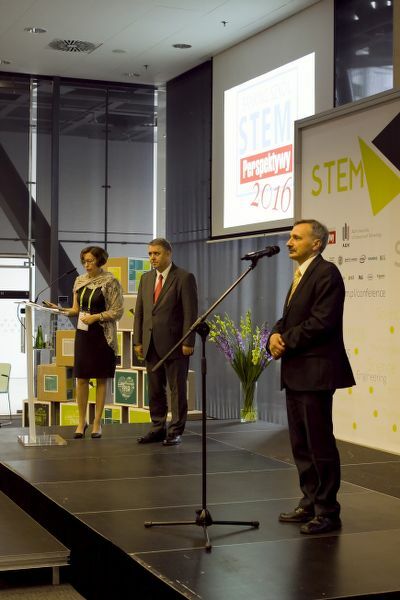 For two days (May 31 and June 1) Copernicus Science Centre changed itself in a big STEM congress. 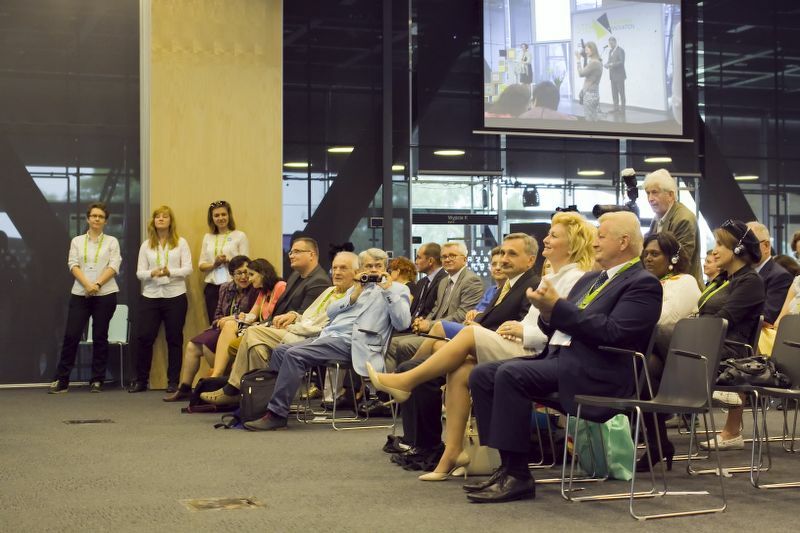 The international team talked about wise, beautiful and important things, about the great power to change reality and to solve problems. 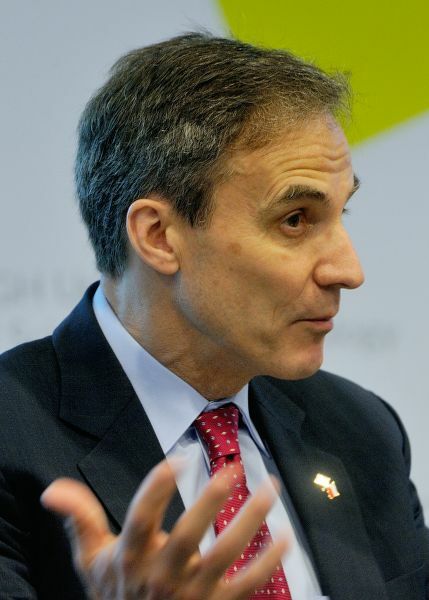 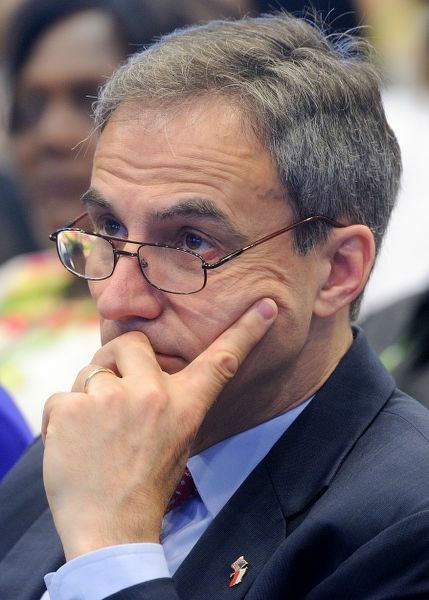 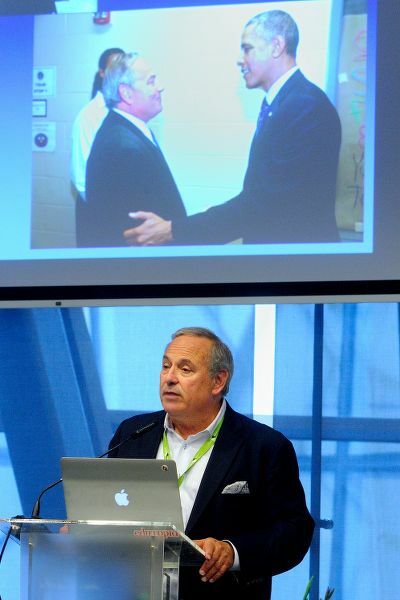 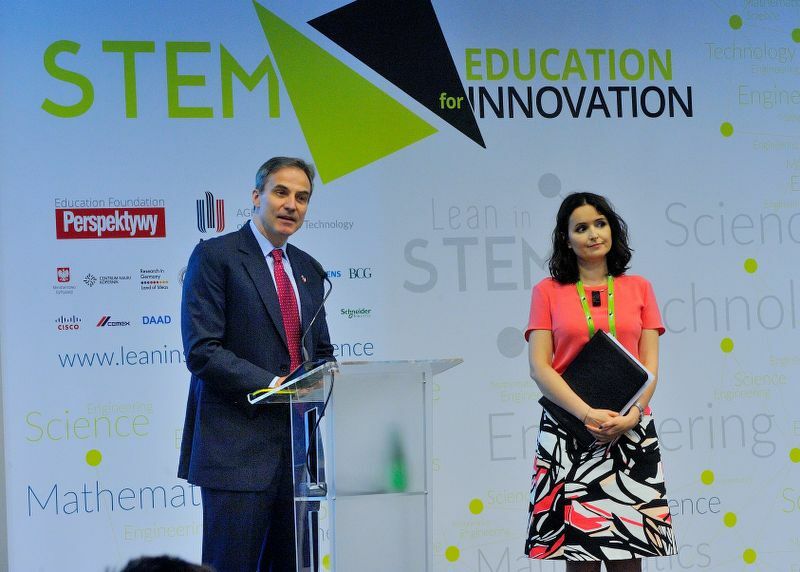 Because, as a winner of the STEM Visionary Award, Steven Zipkes said in the opening speech - "STEM changes the world." 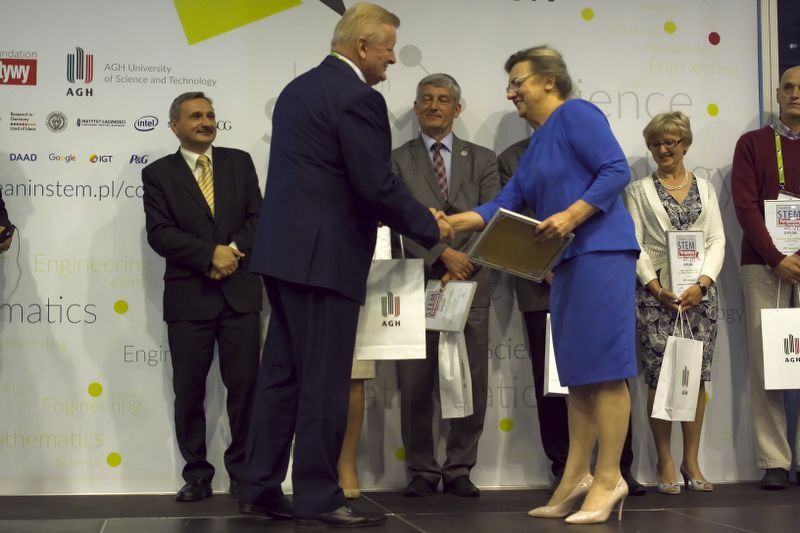 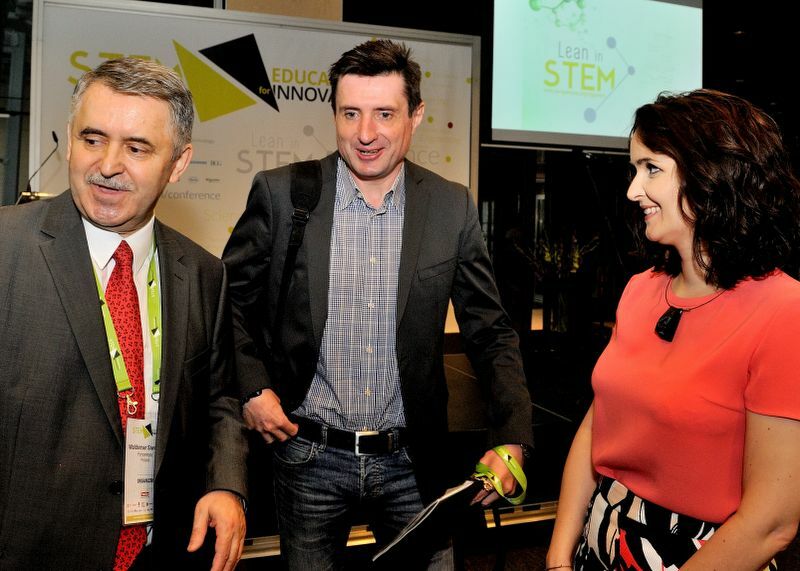 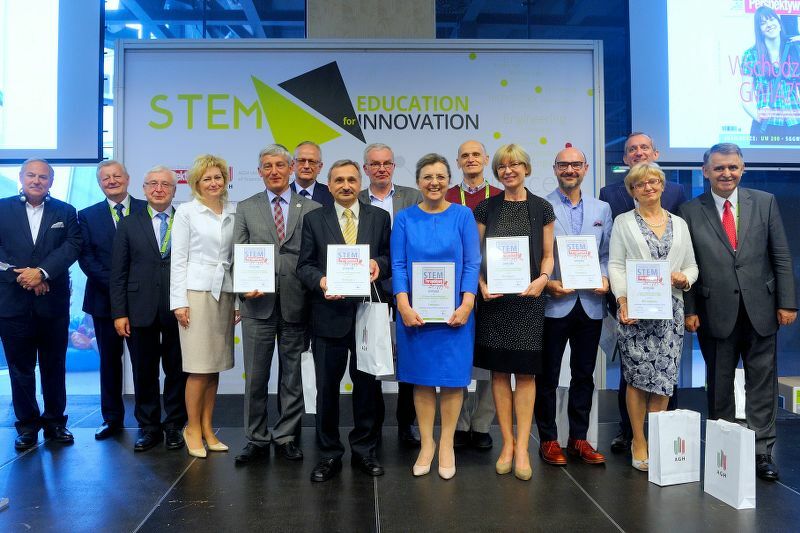 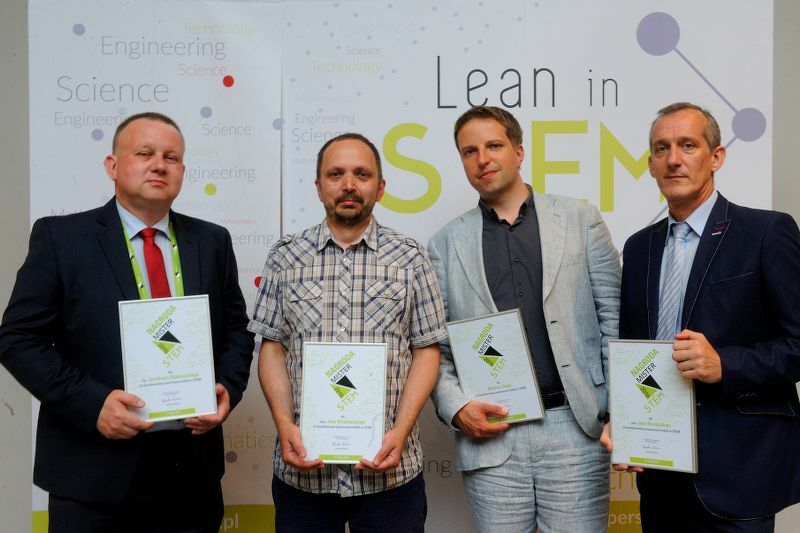 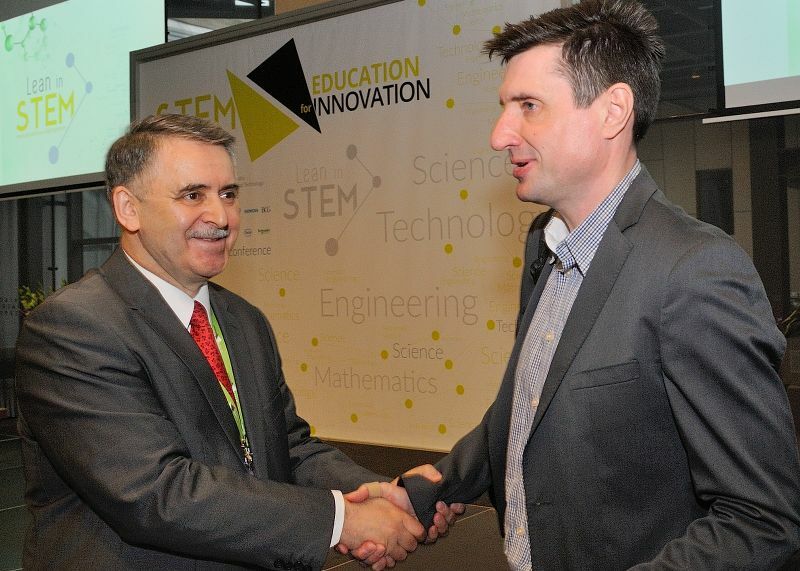 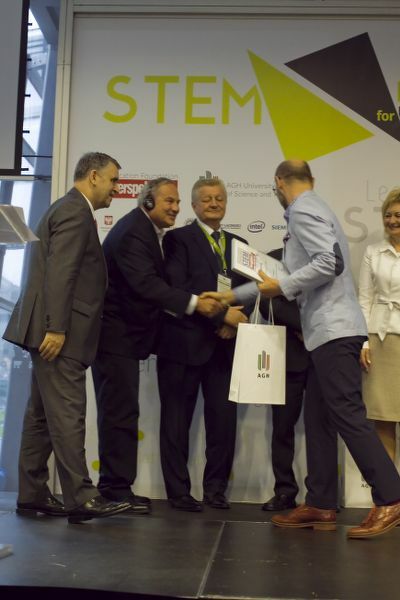 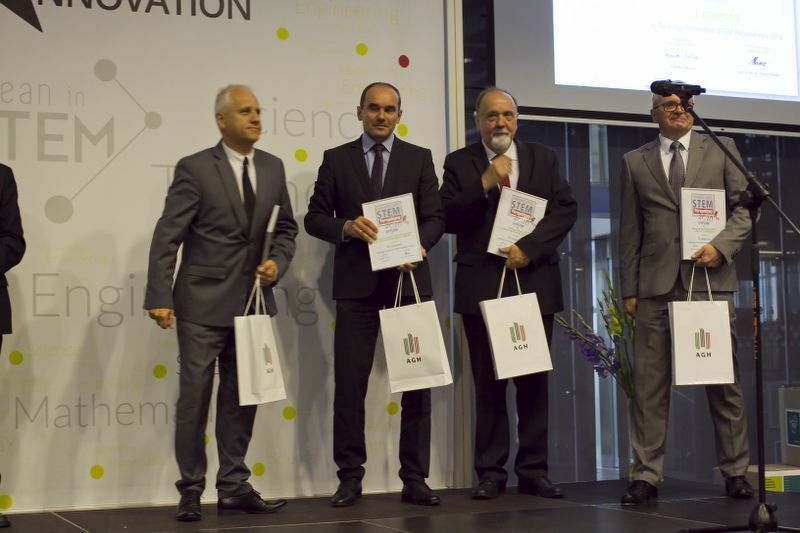 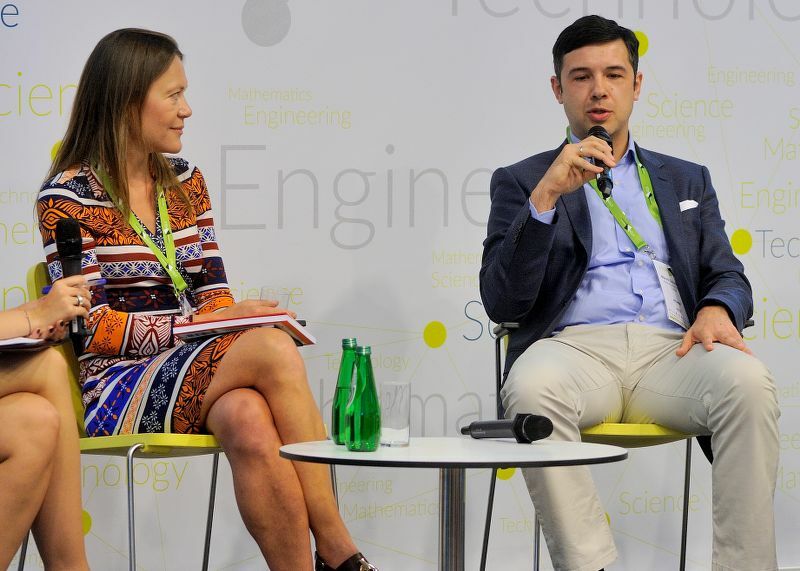 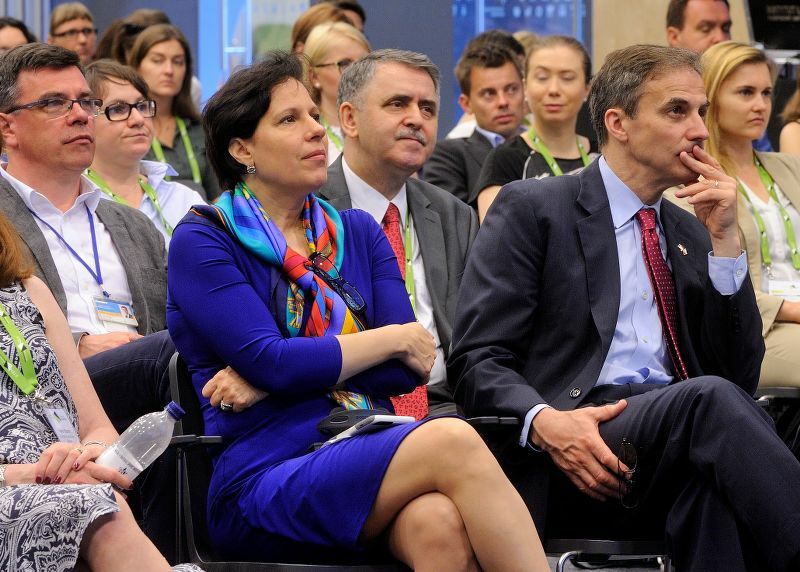 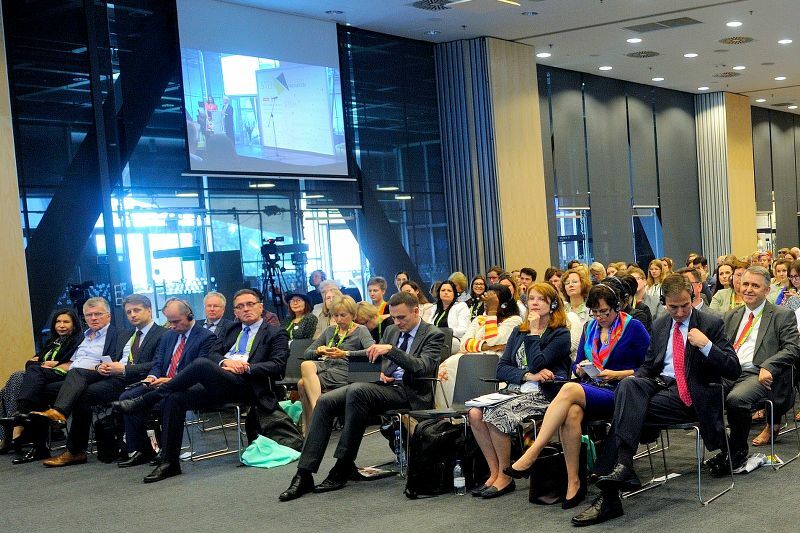 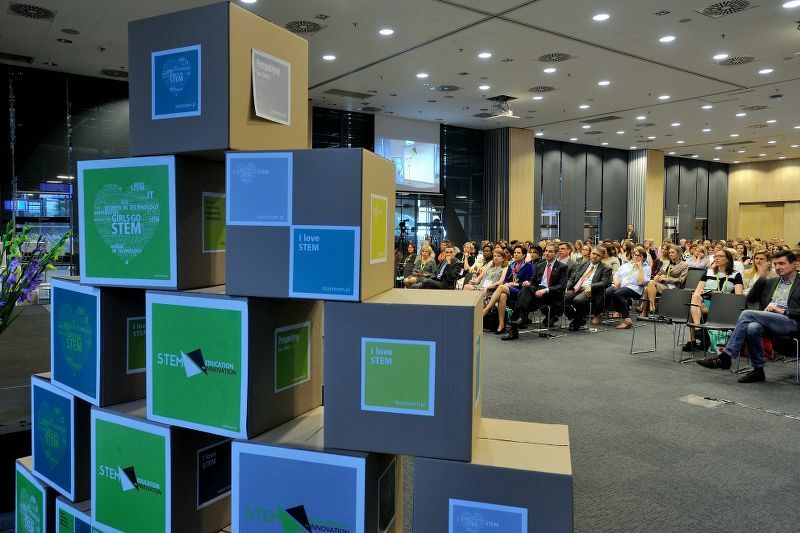 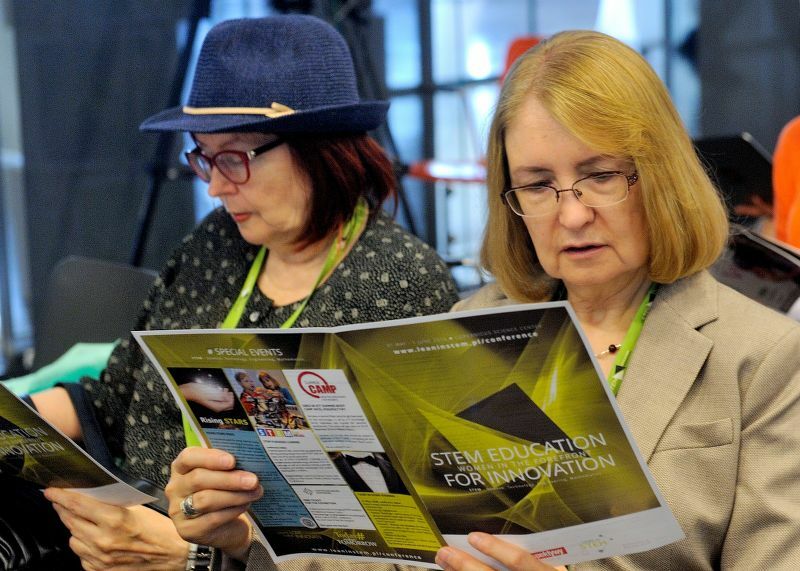 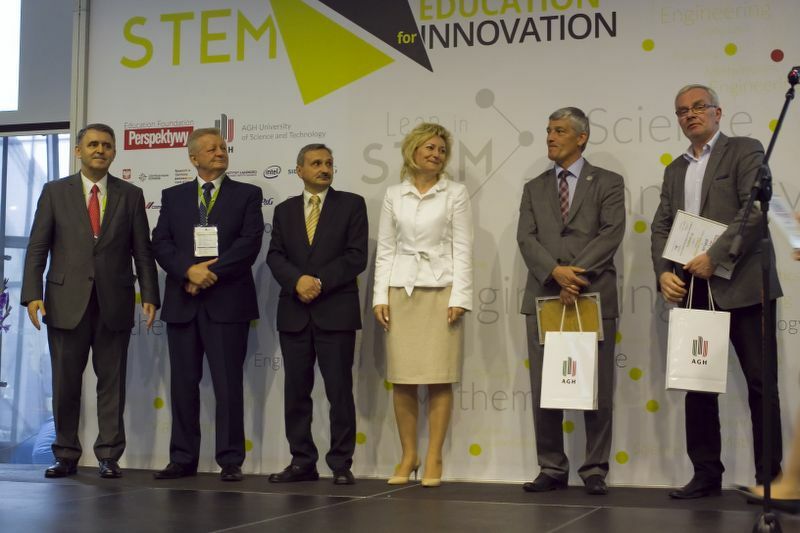 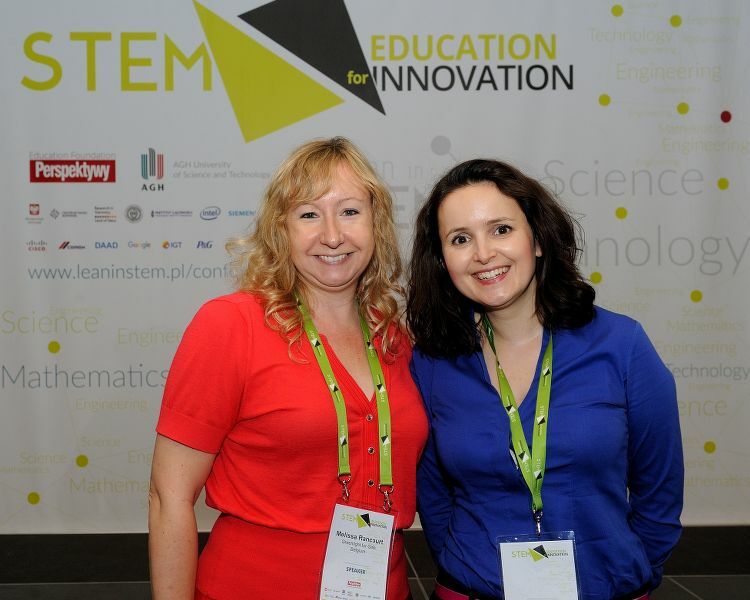 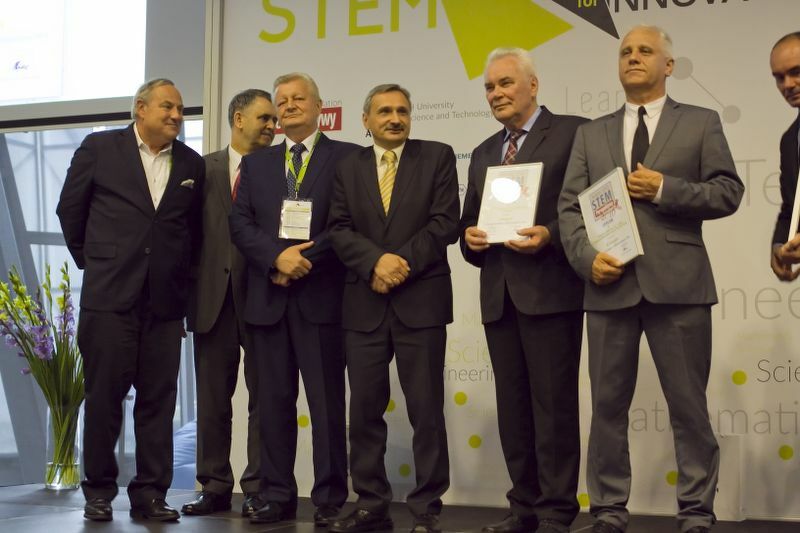 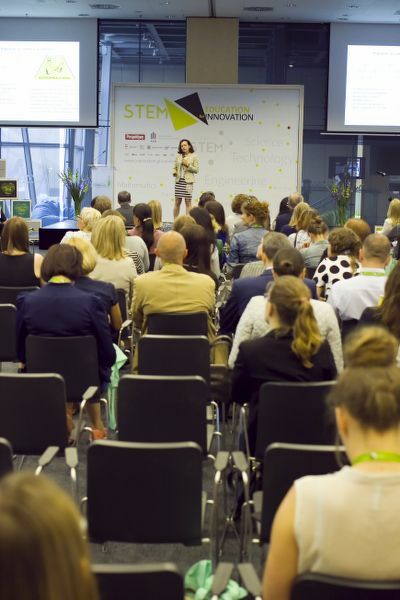 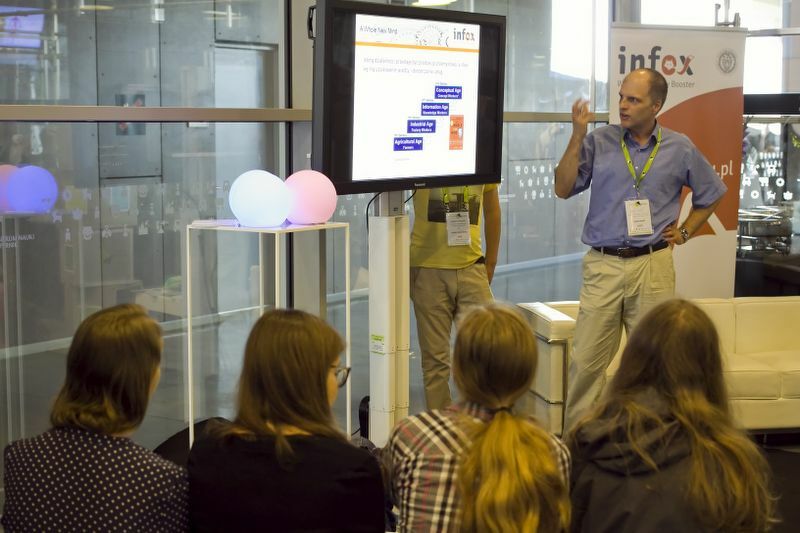 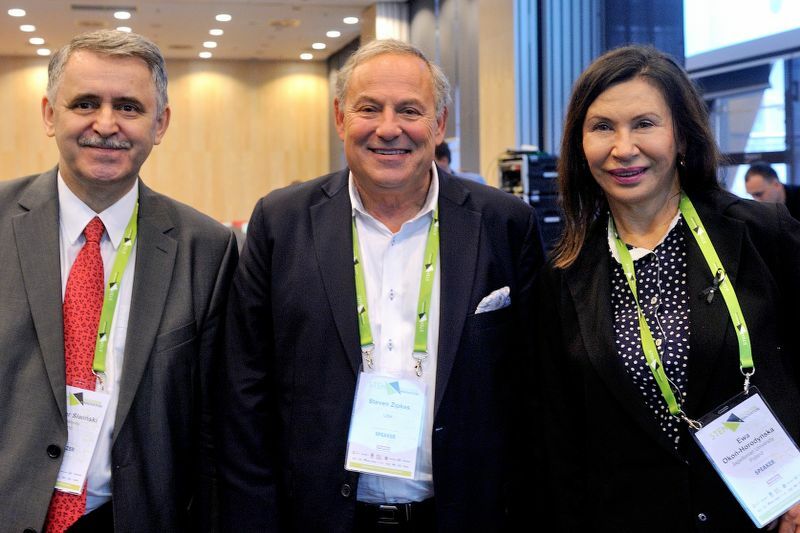 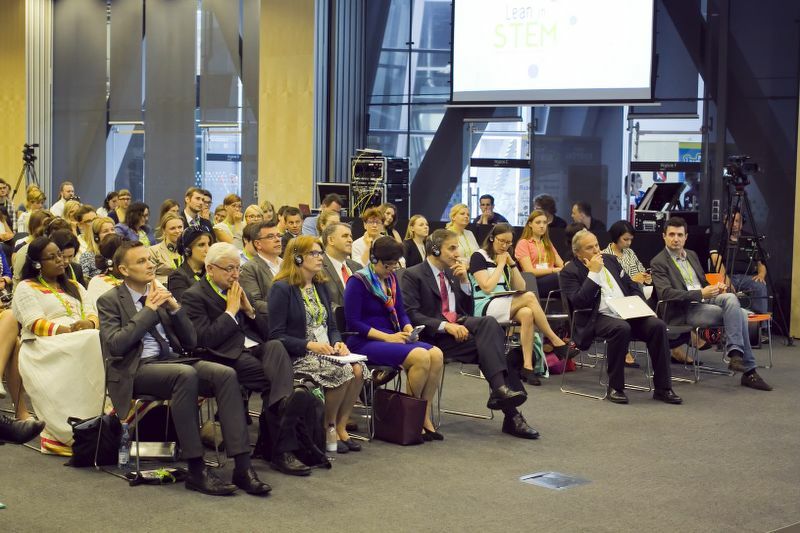 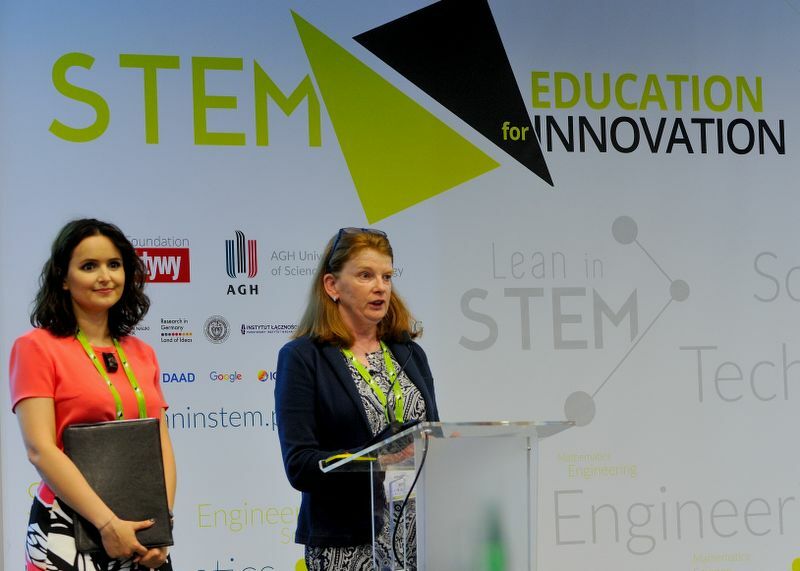 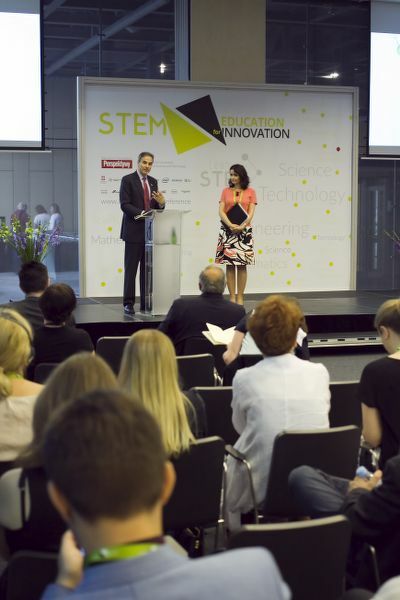 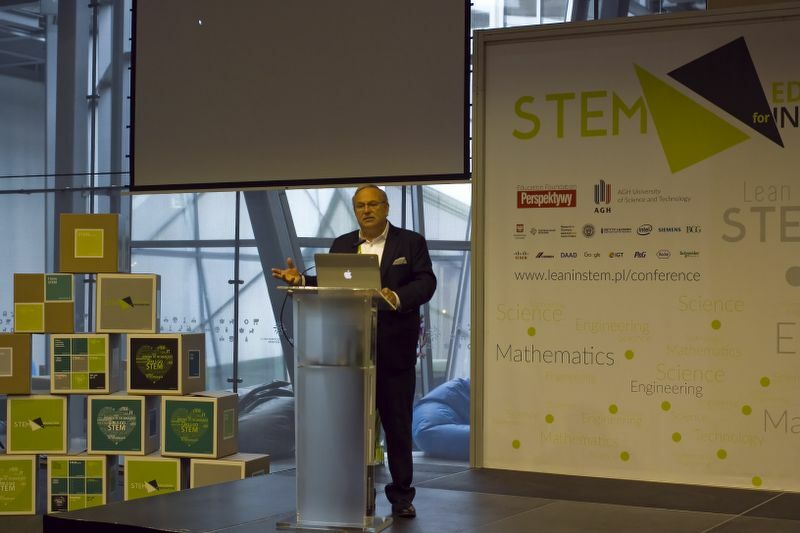 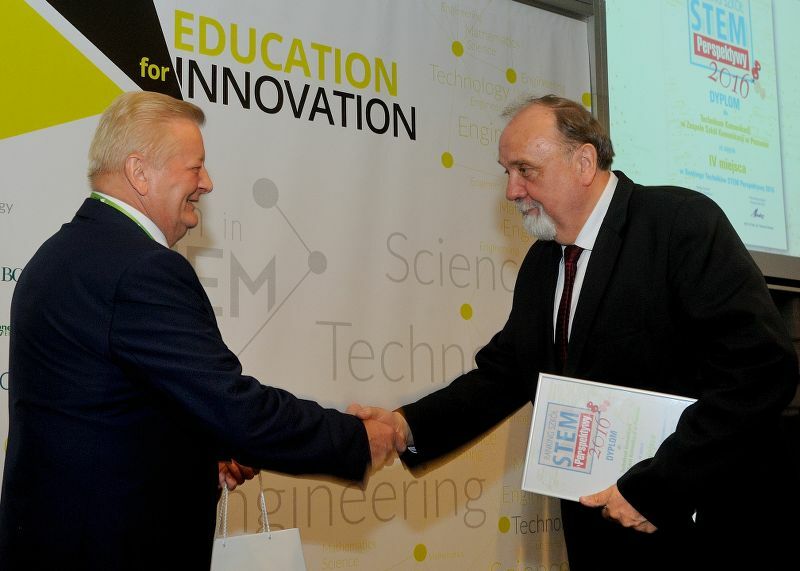 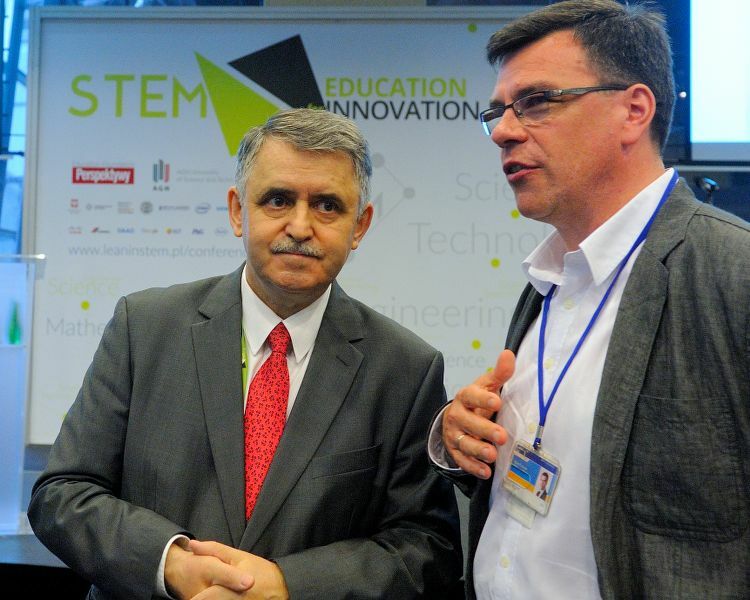 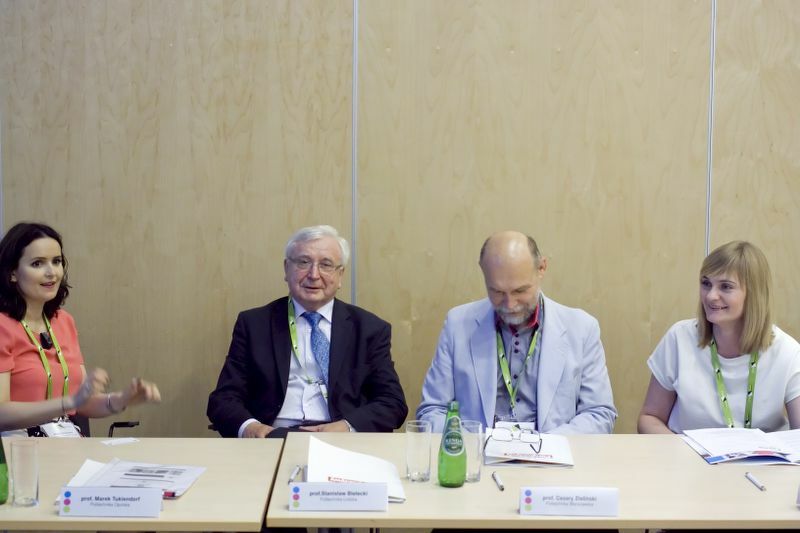 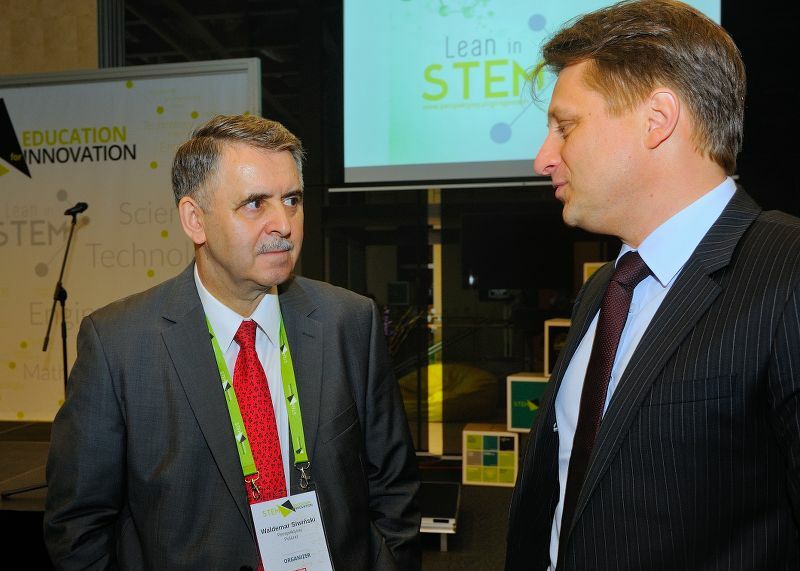 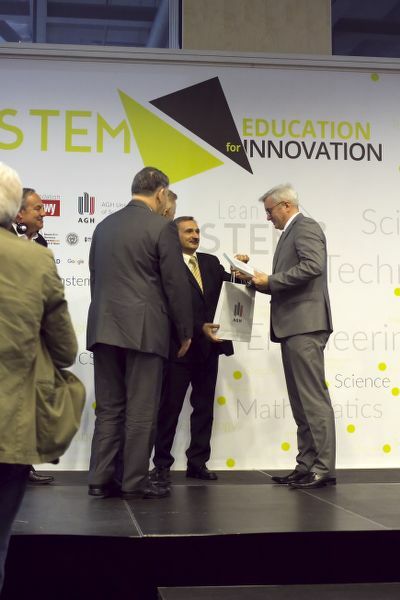 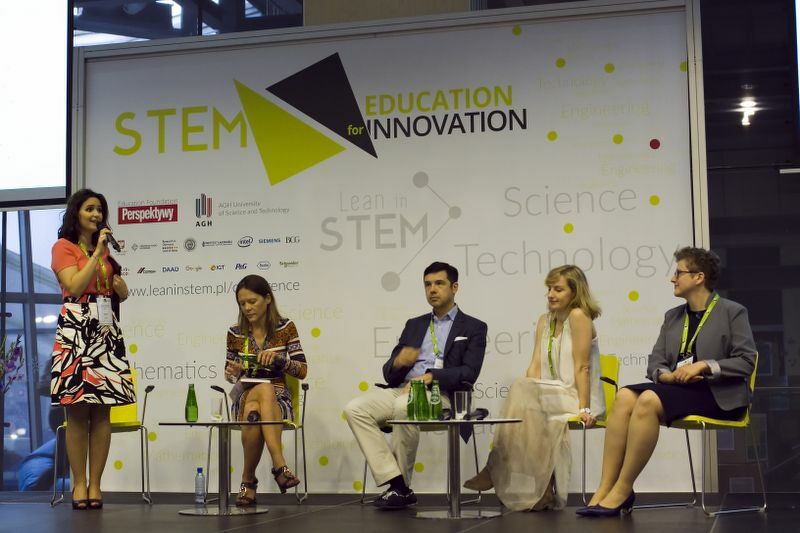 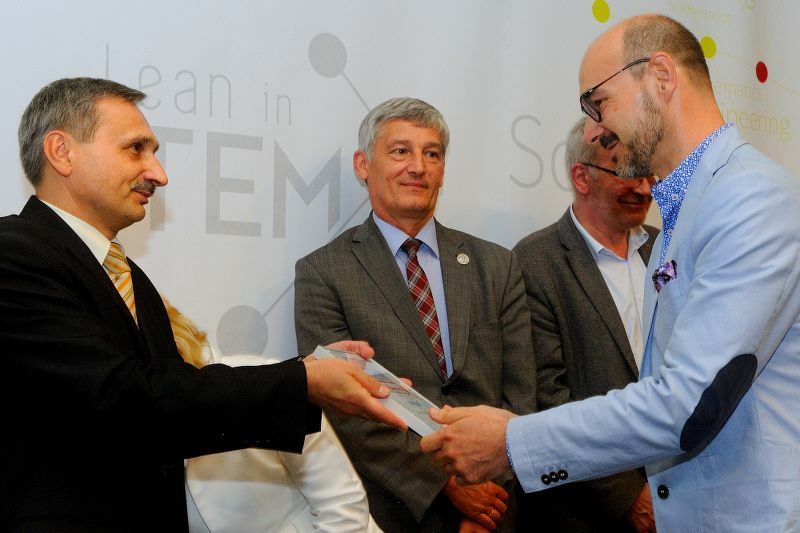 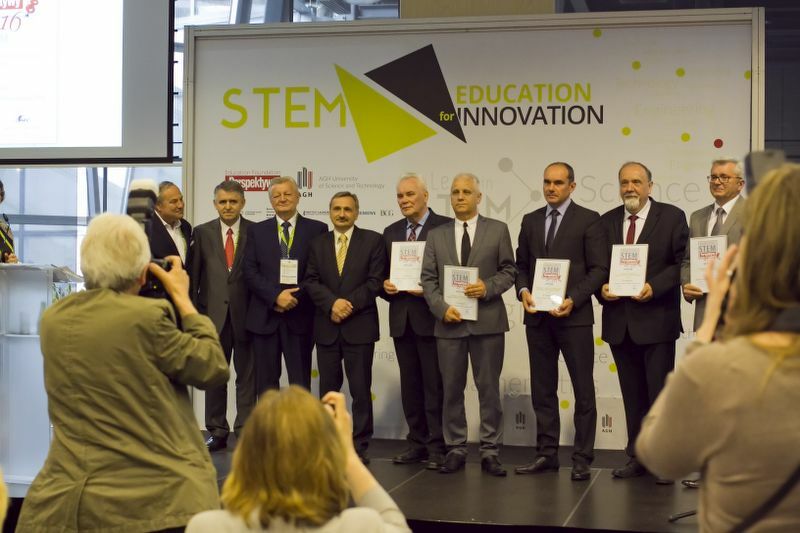 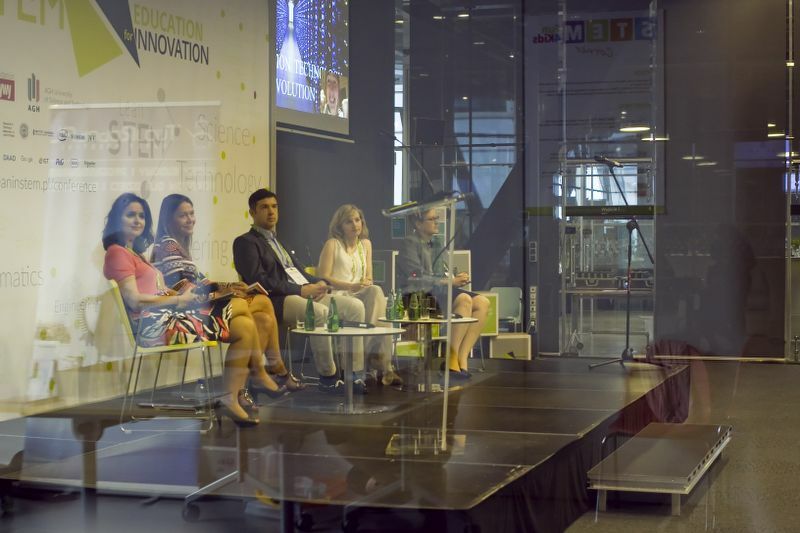 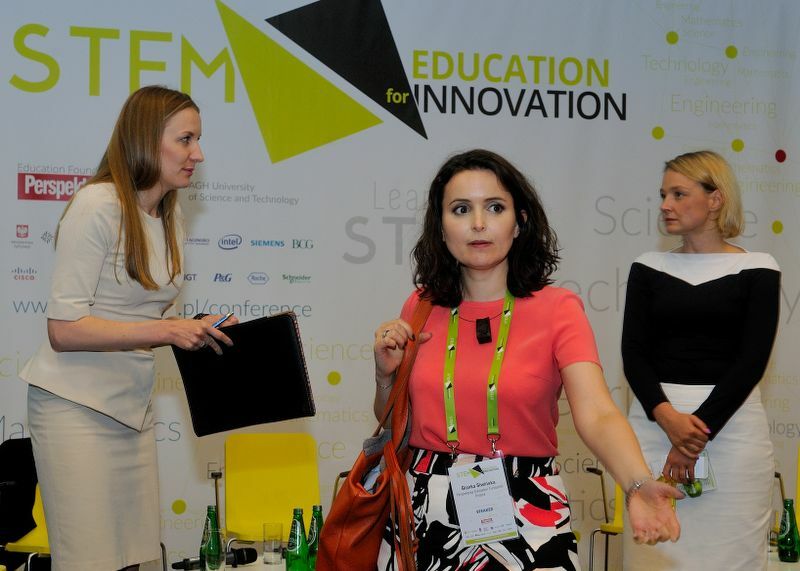 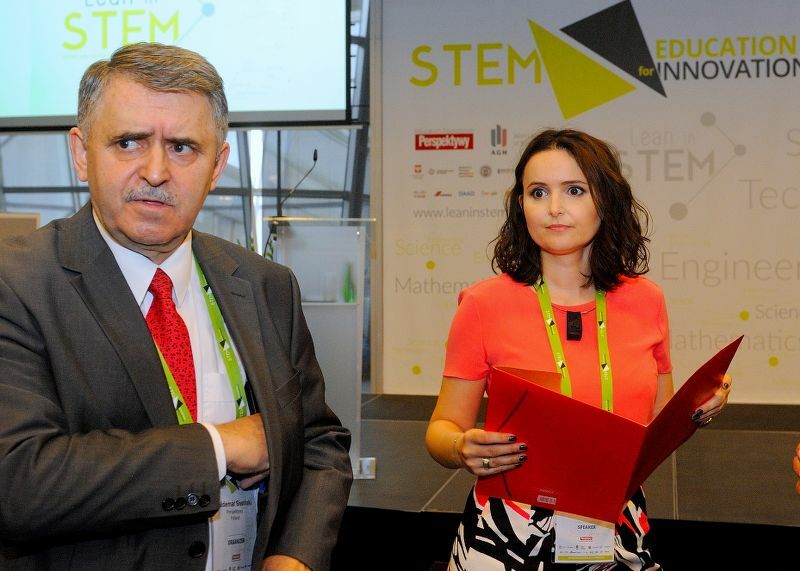 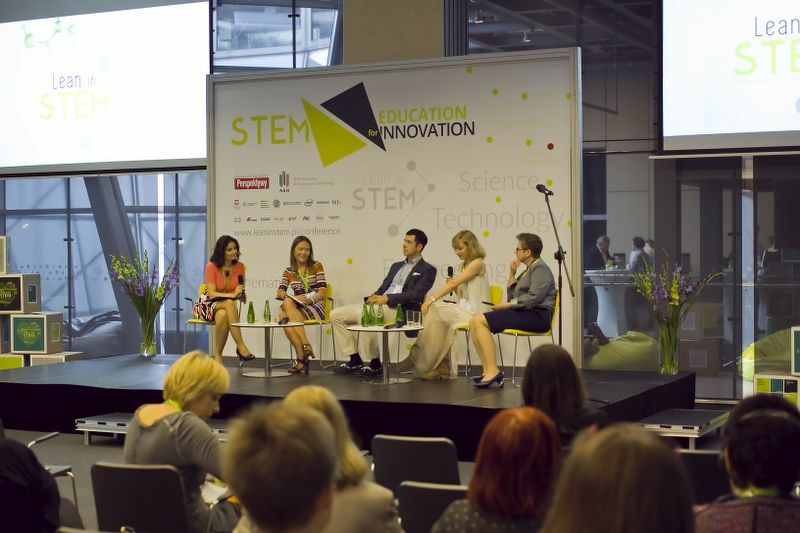 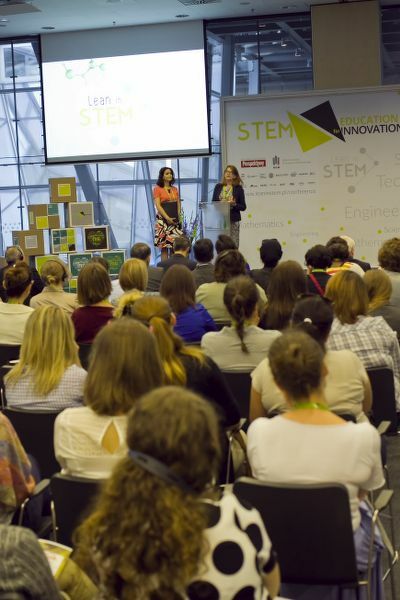 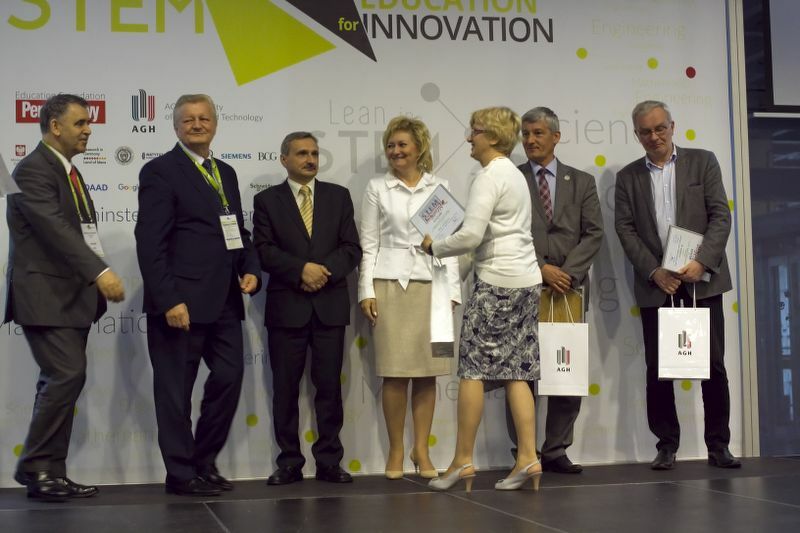 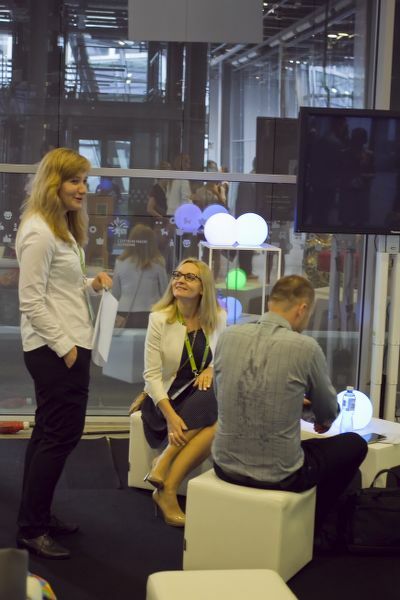 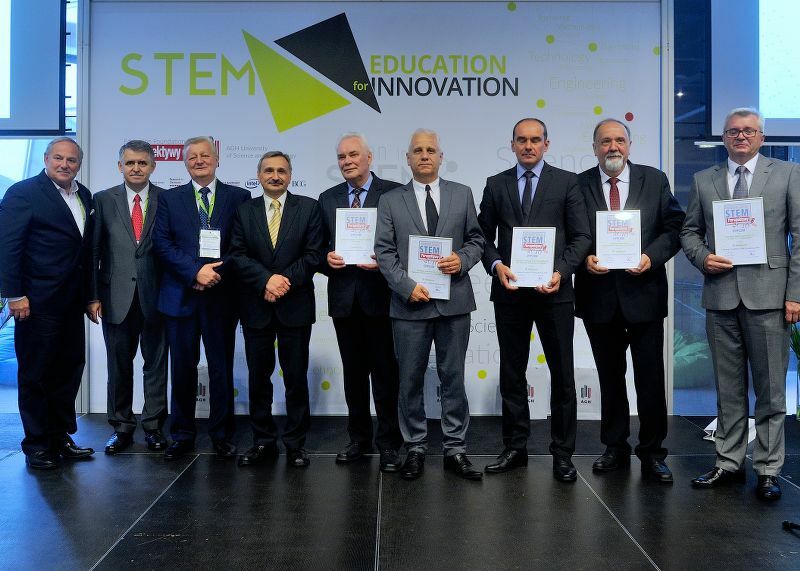 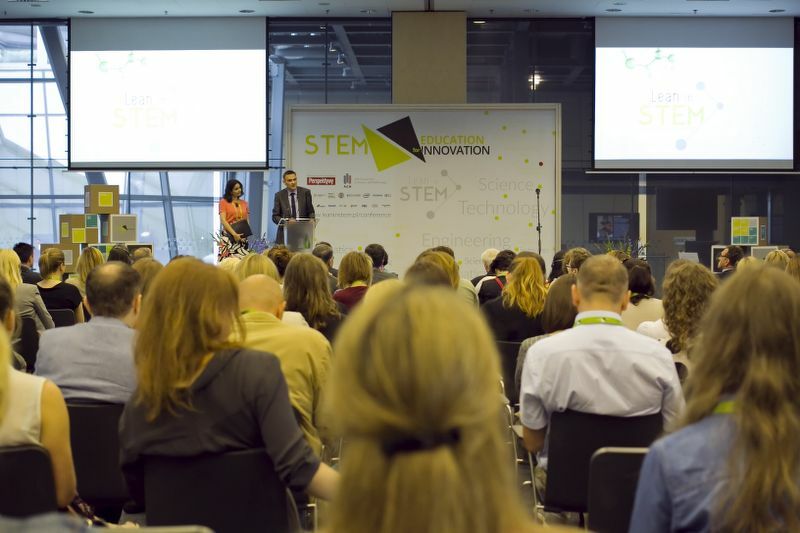 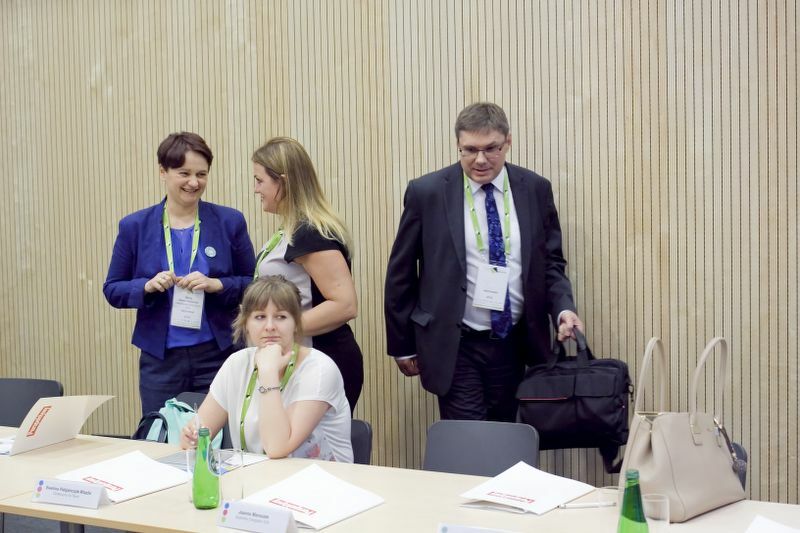 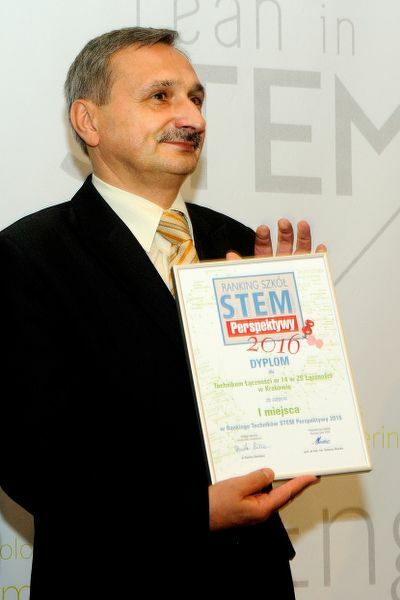 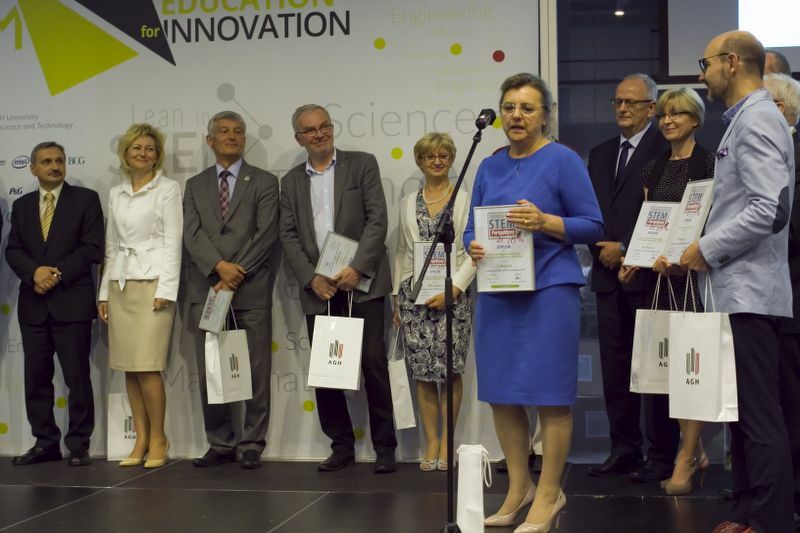 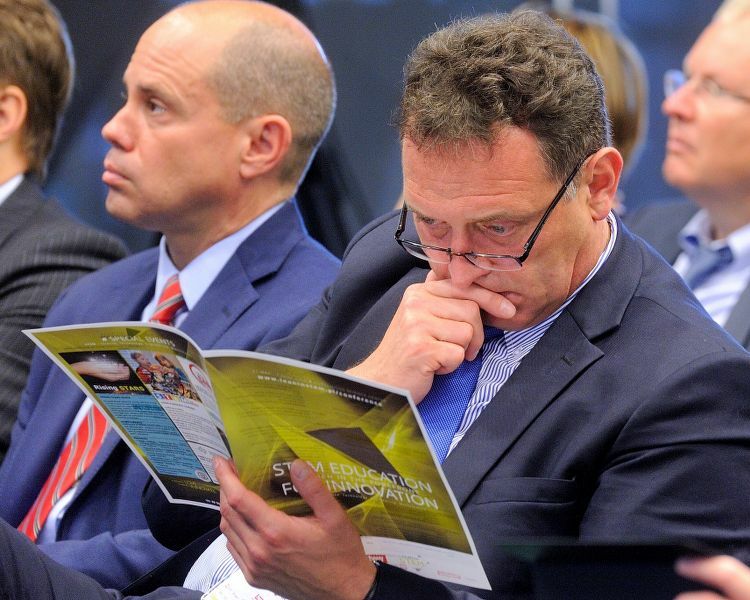 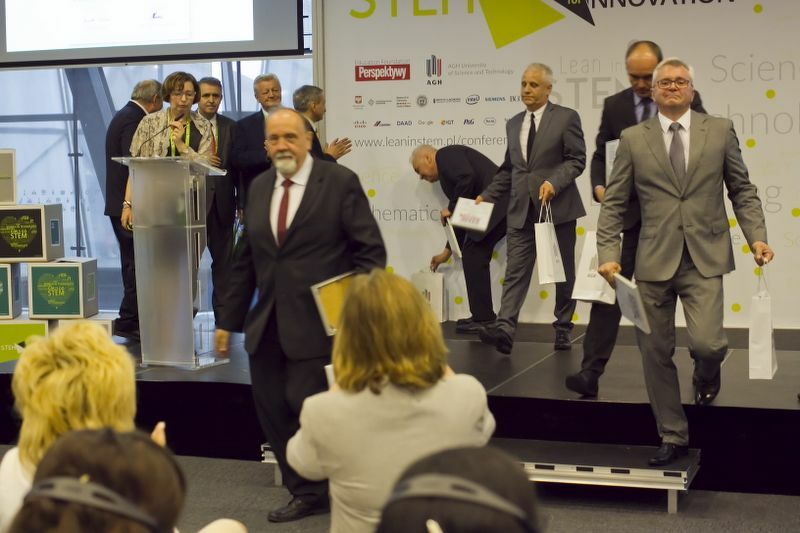 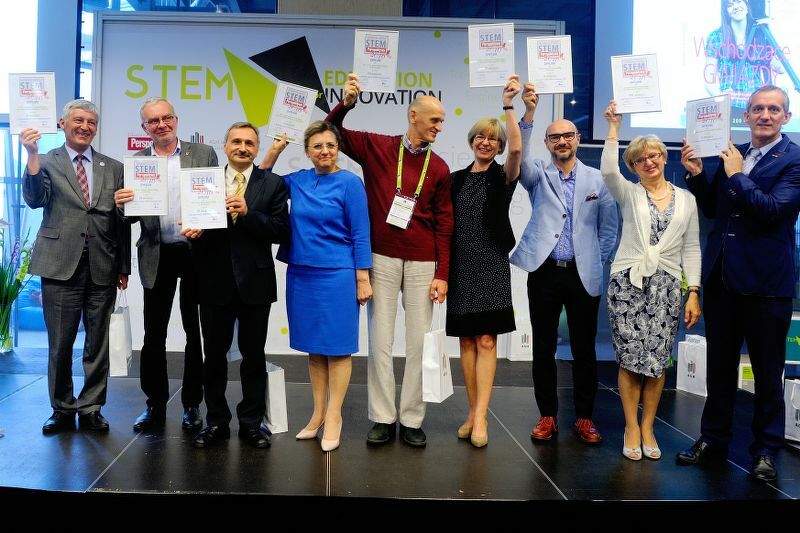 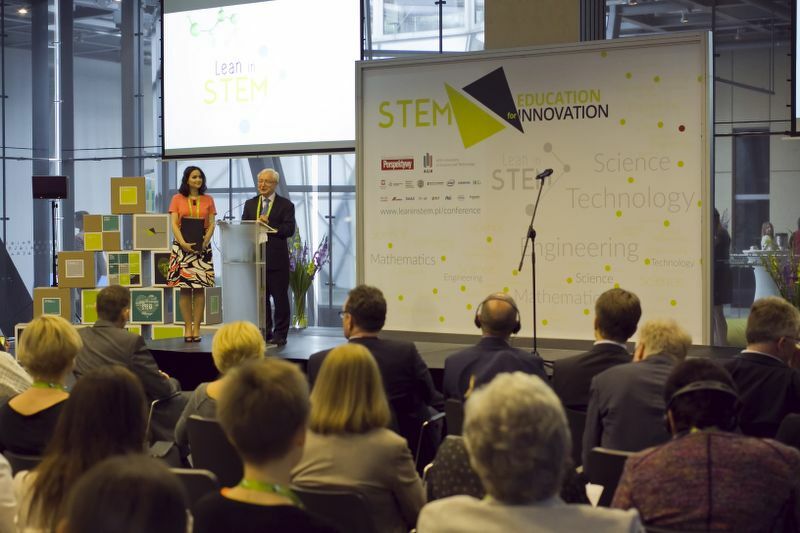 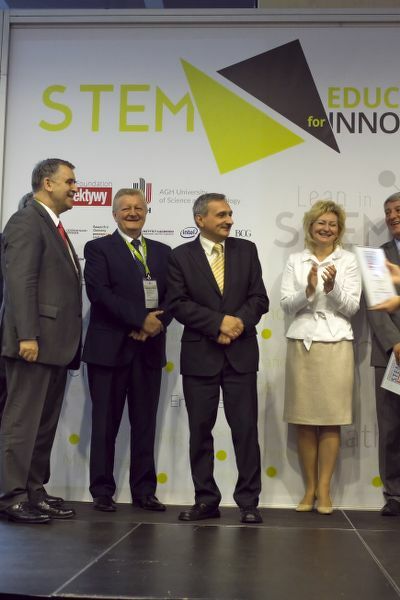 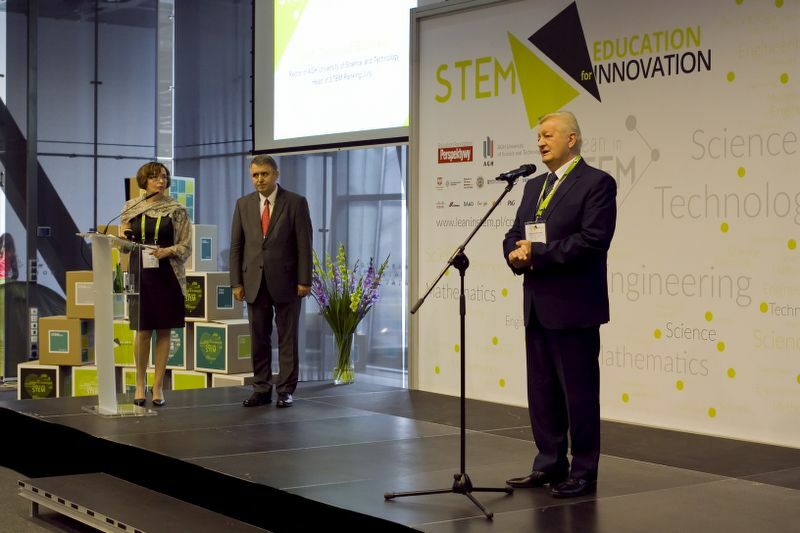 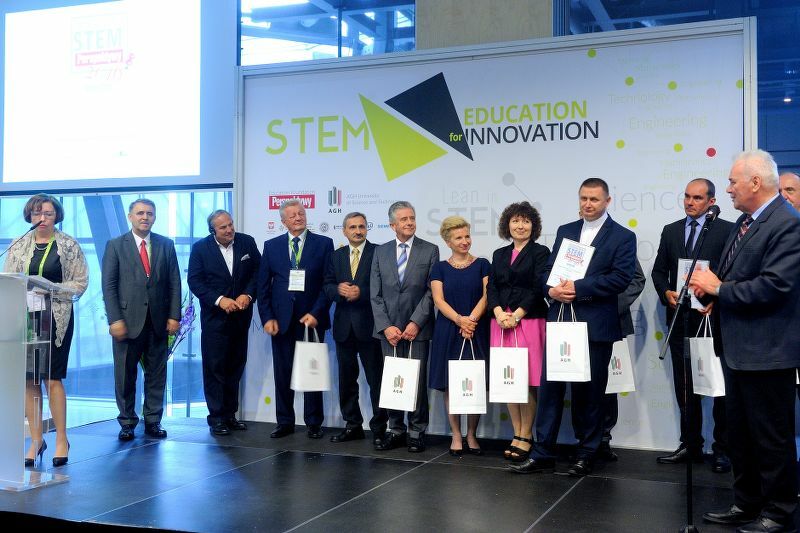 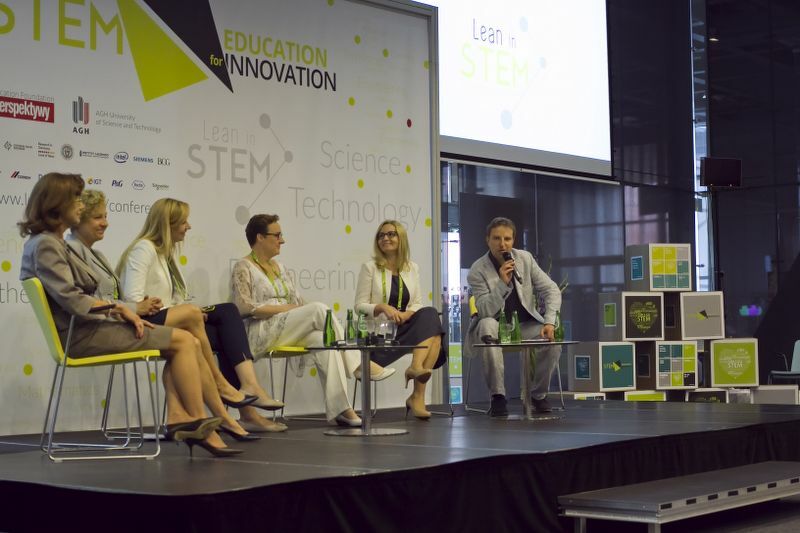 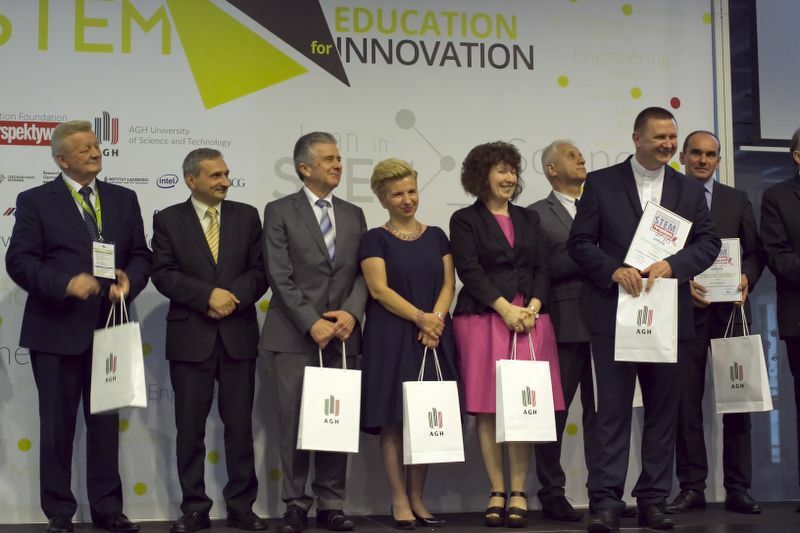 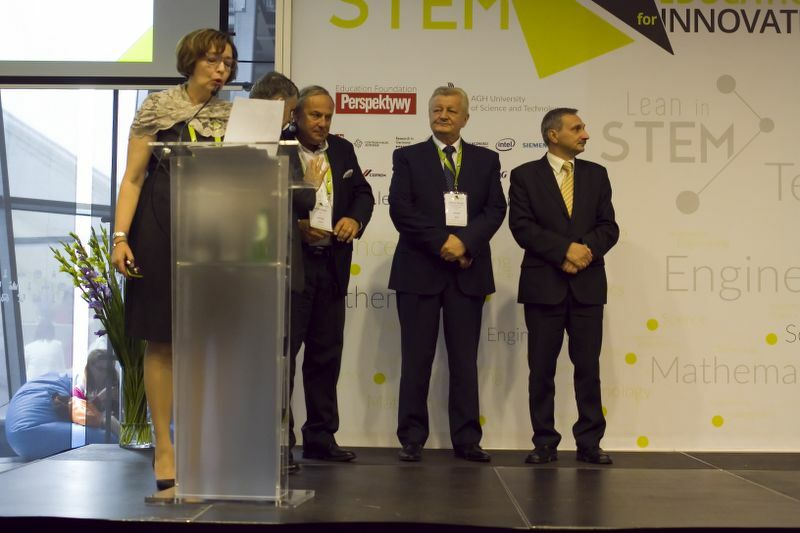 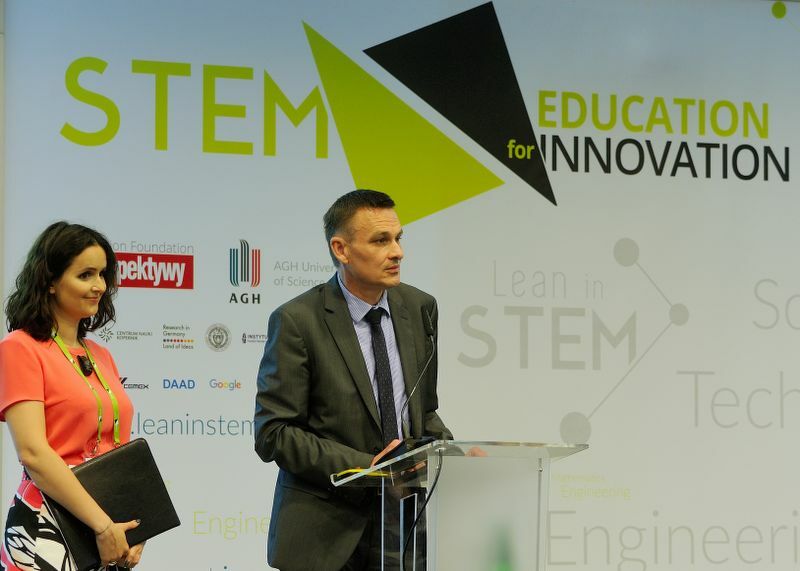 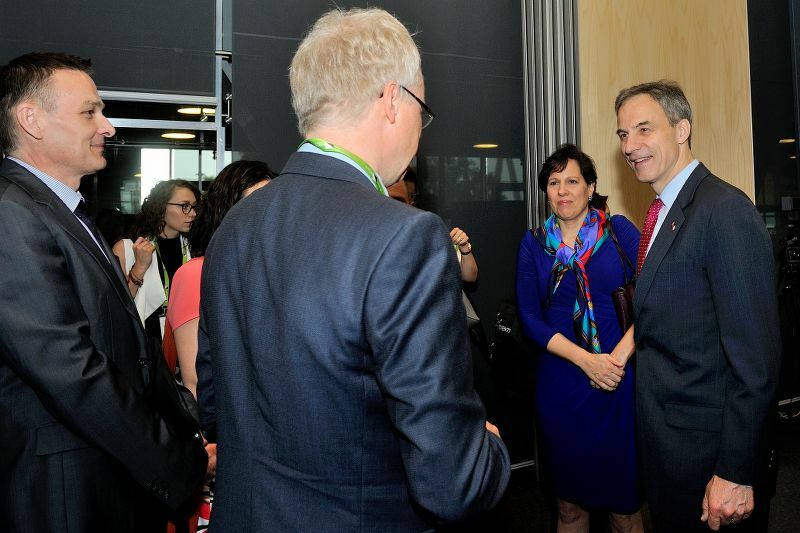 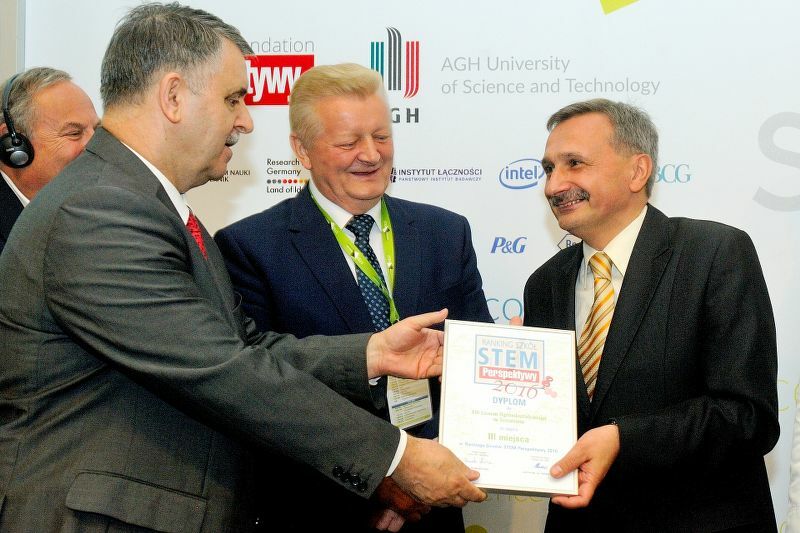 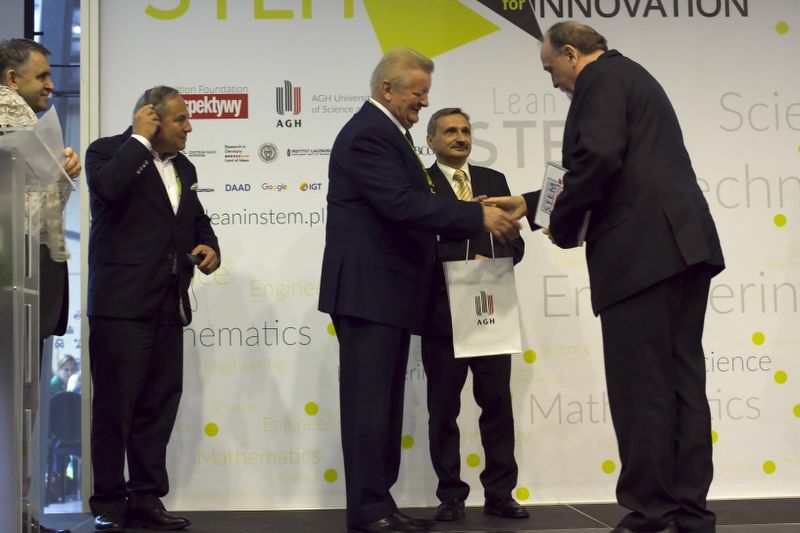 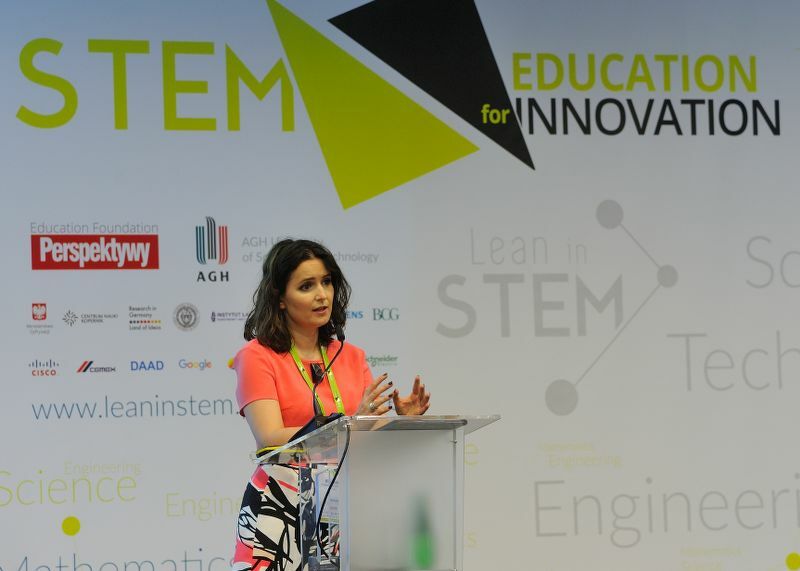 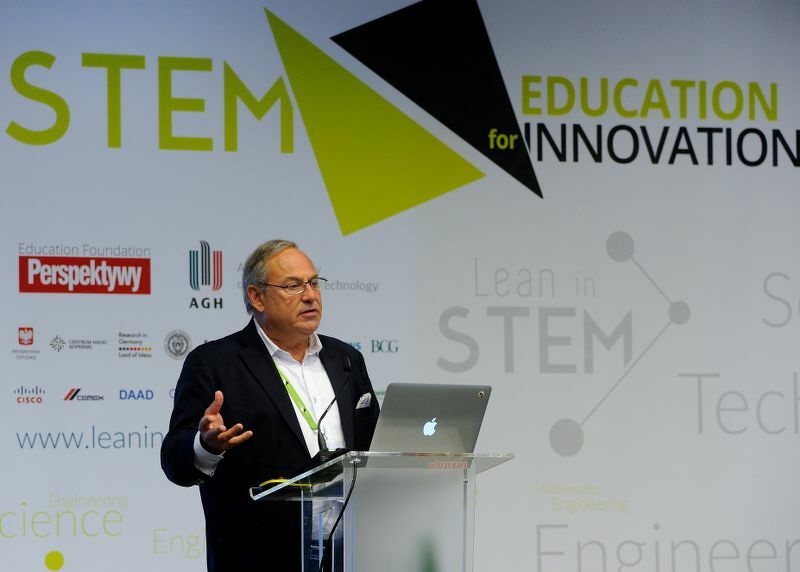 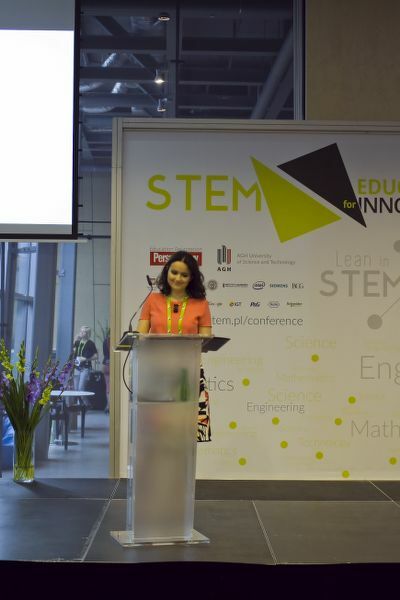 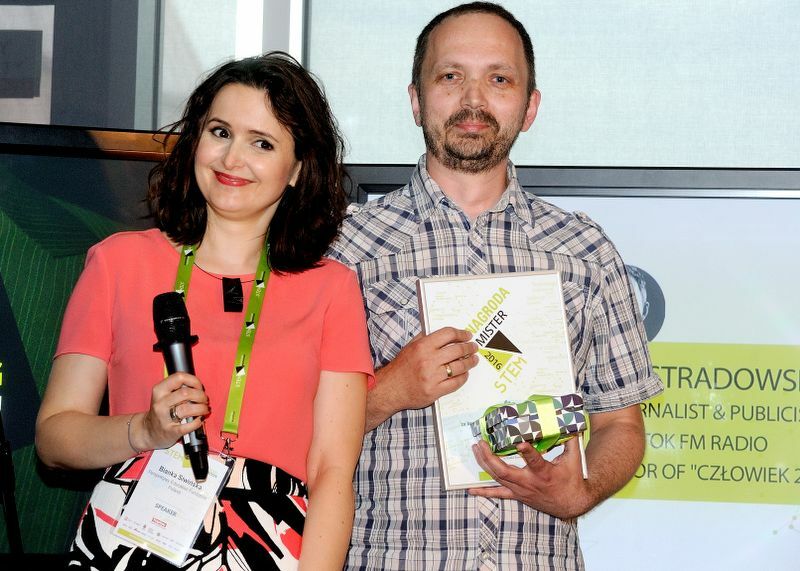 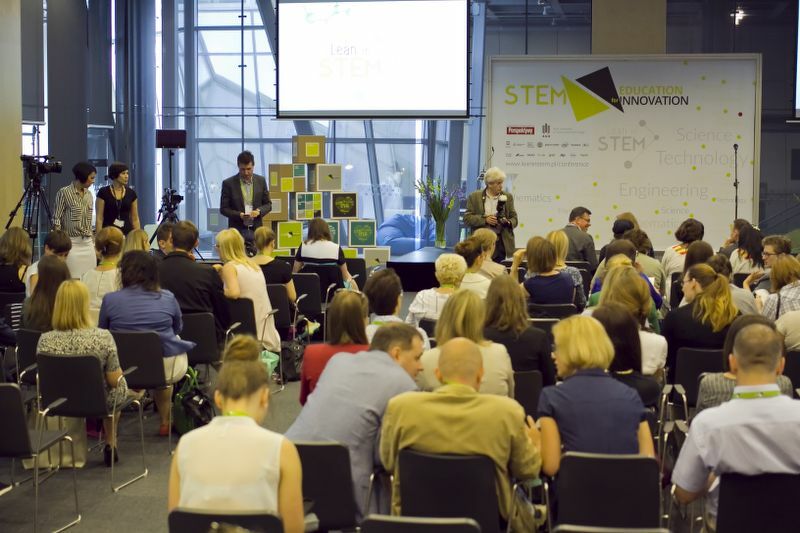 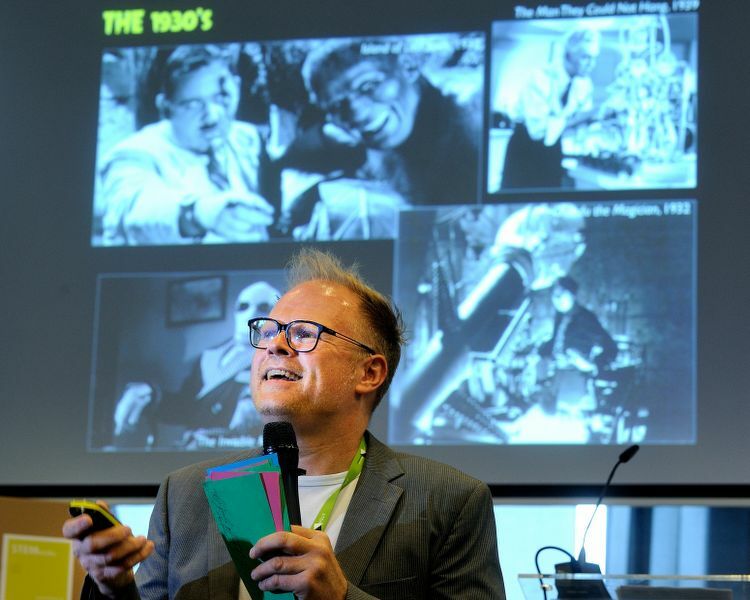 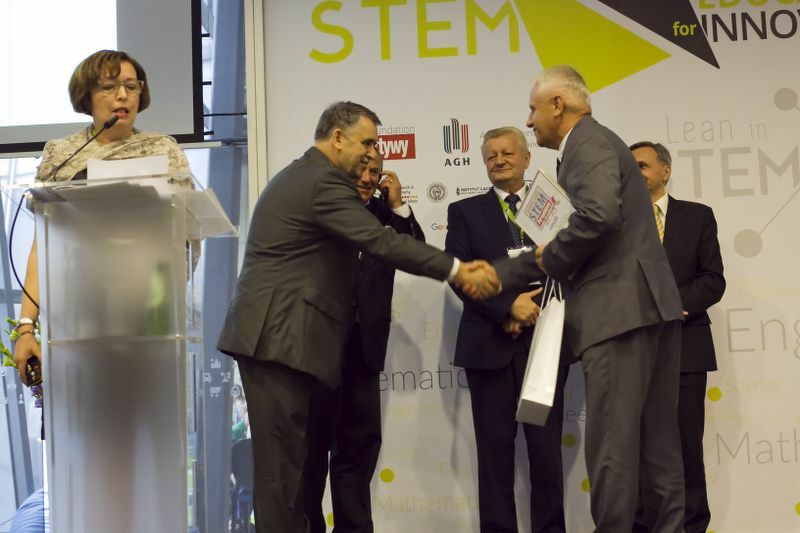 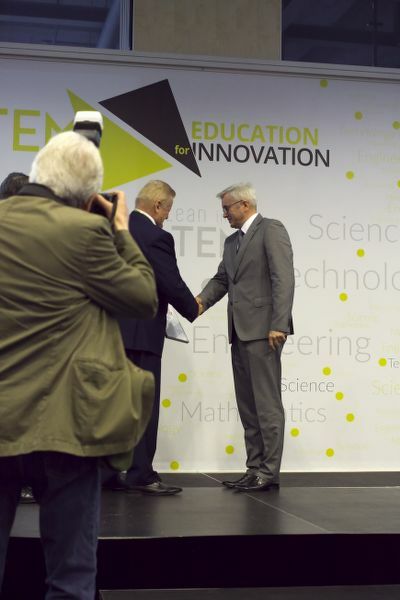 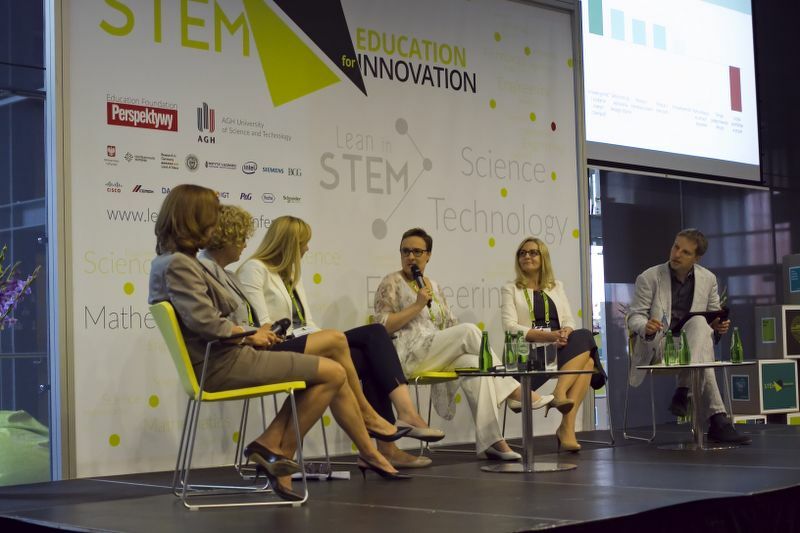 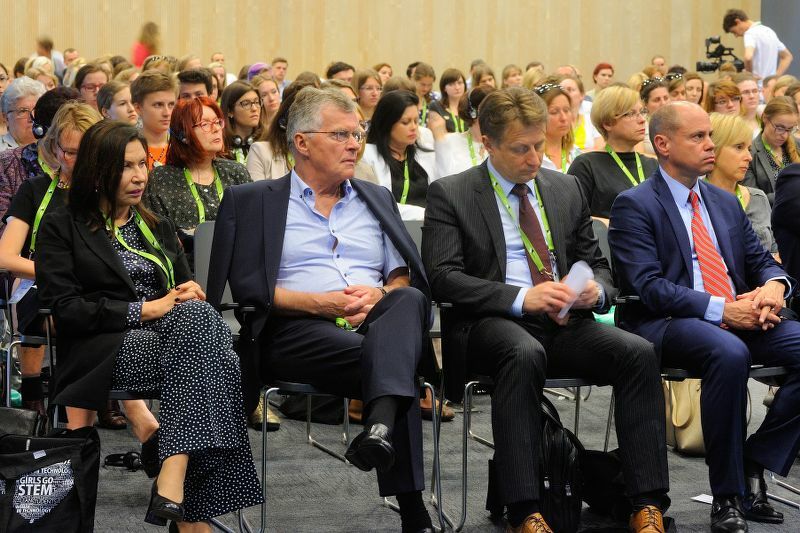 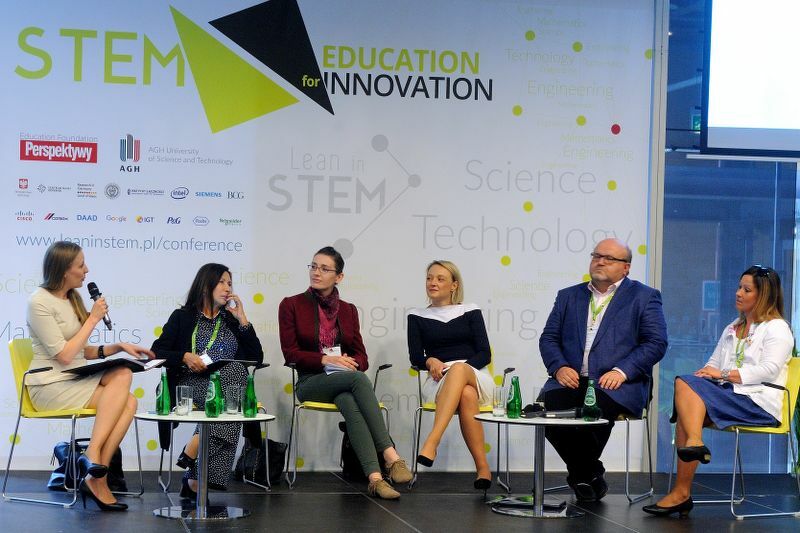 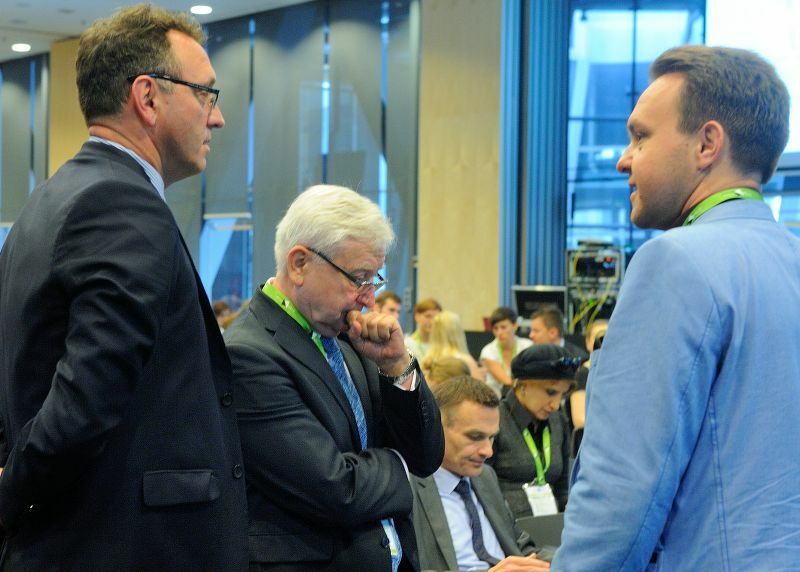 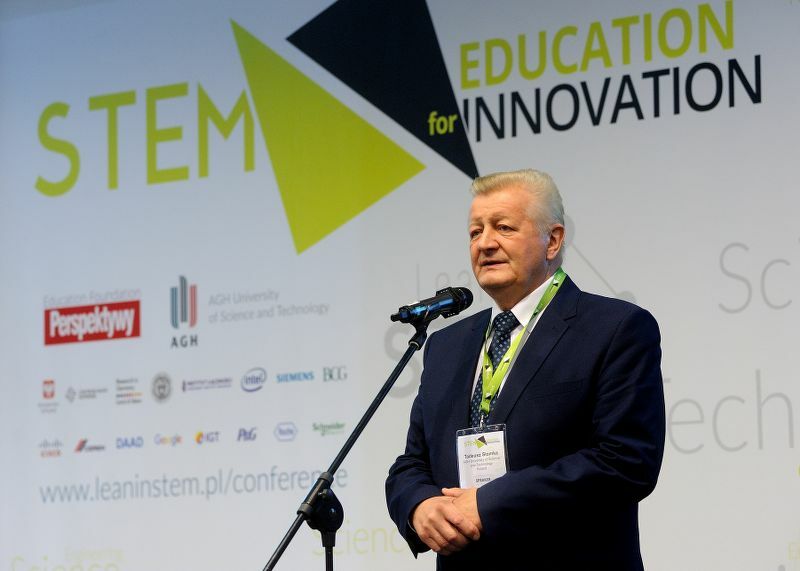 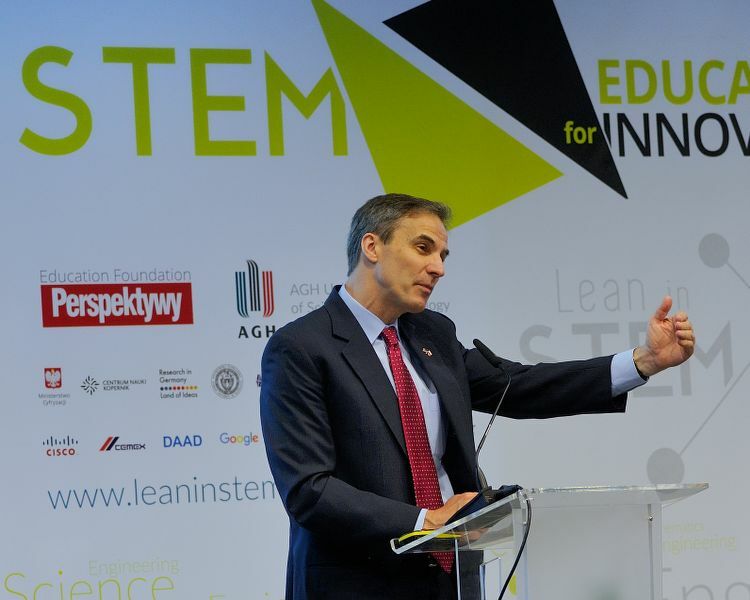 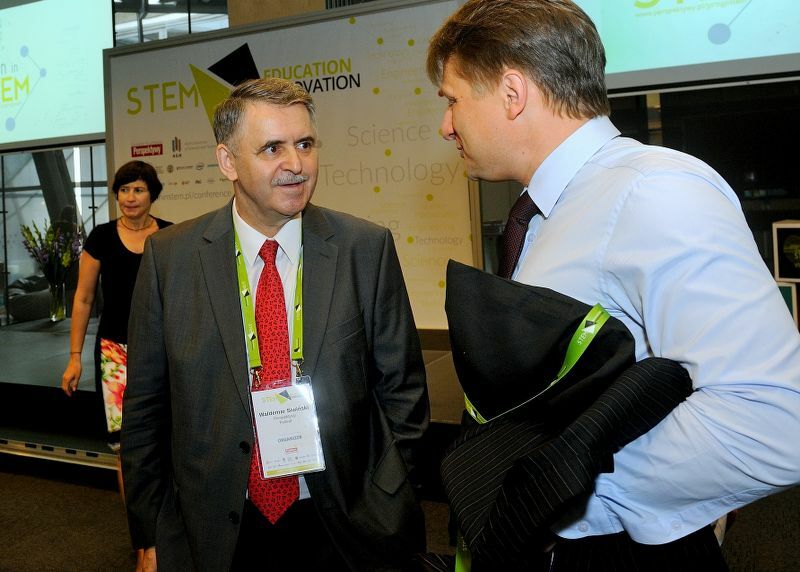 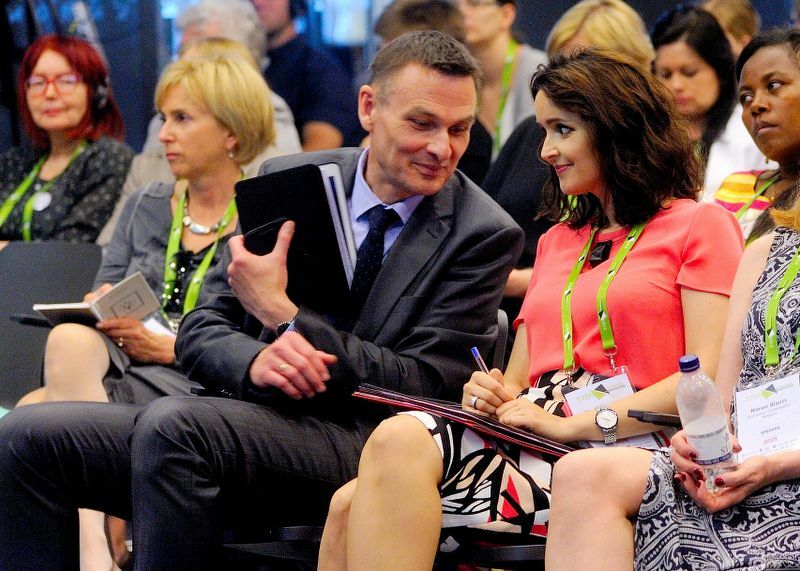 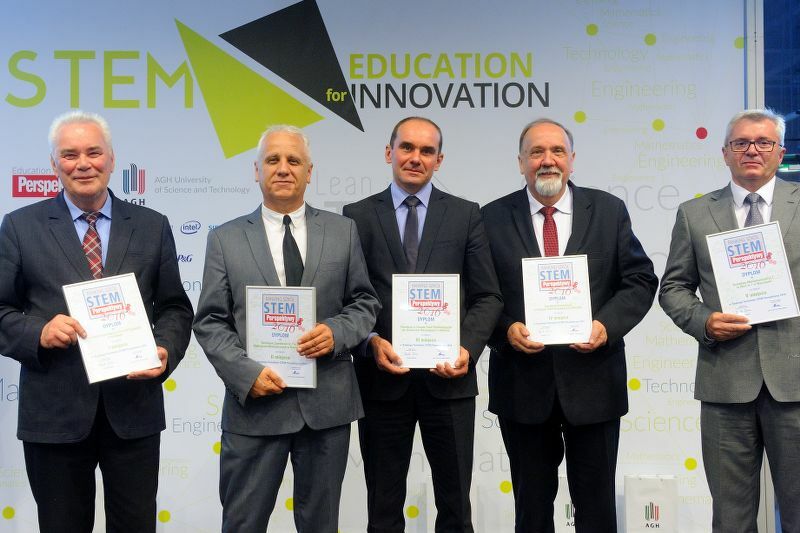 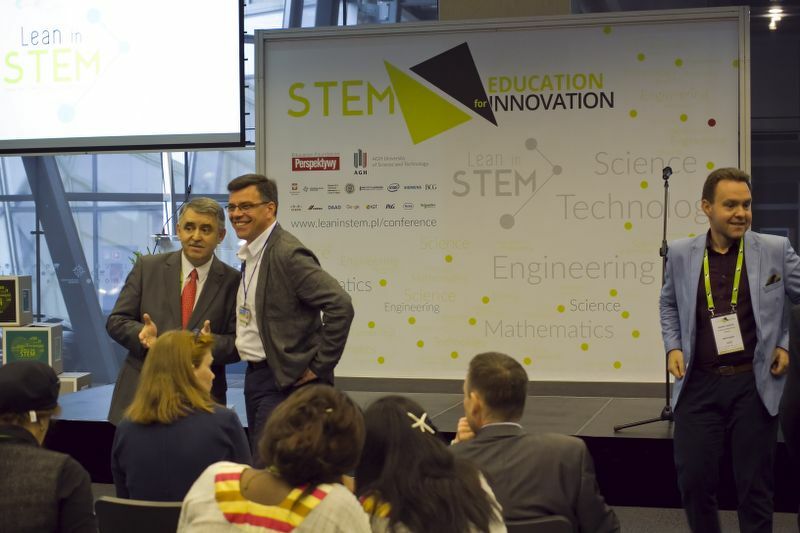 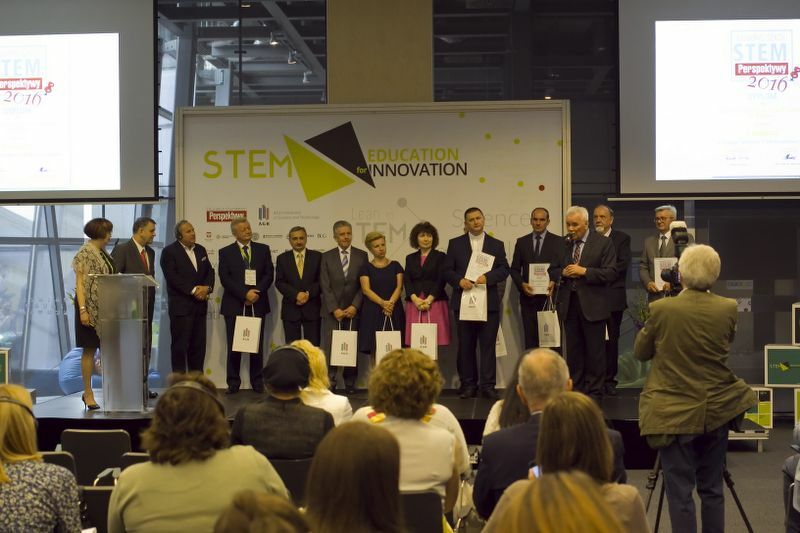 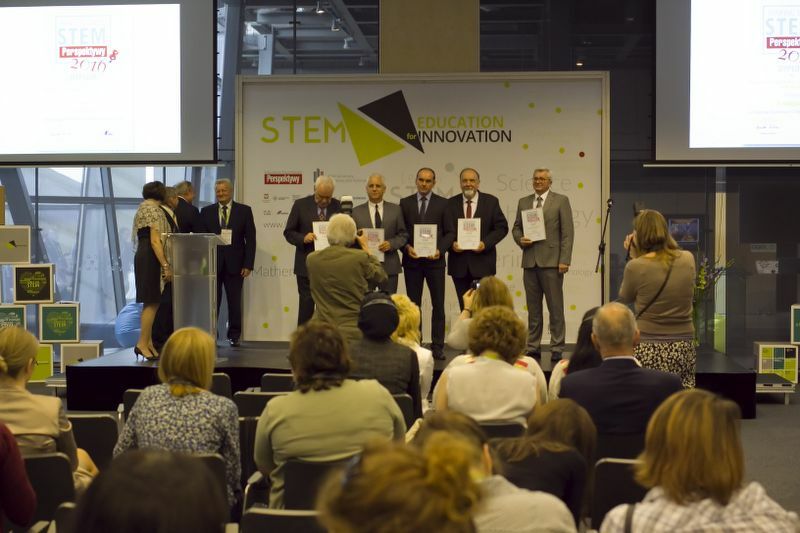 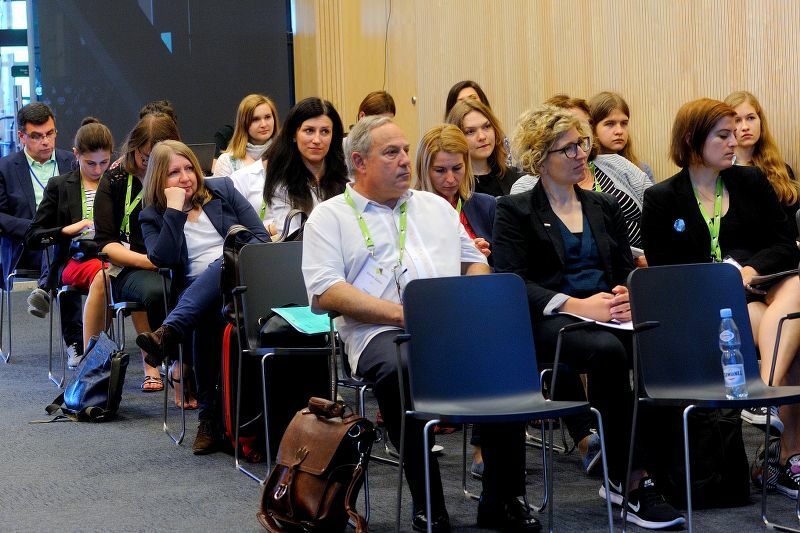 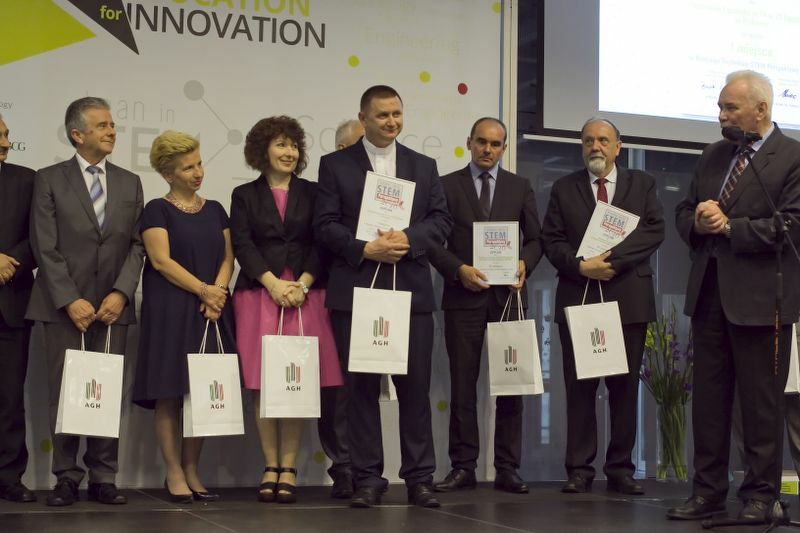 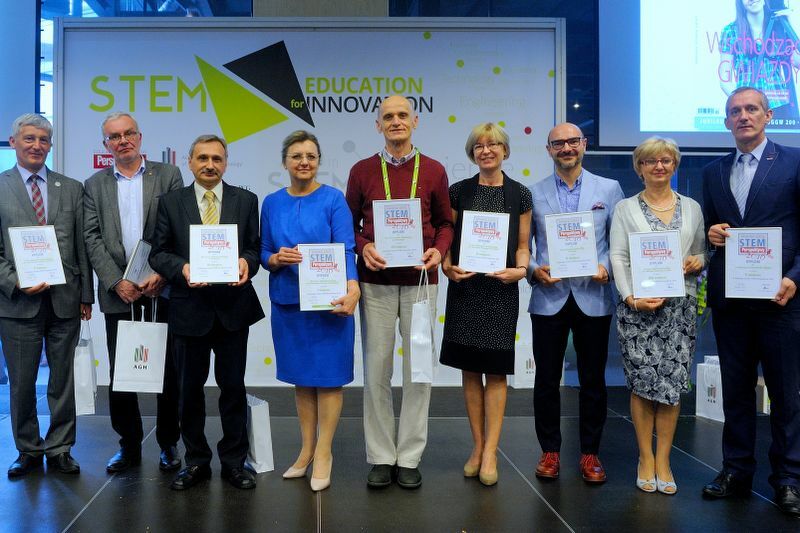 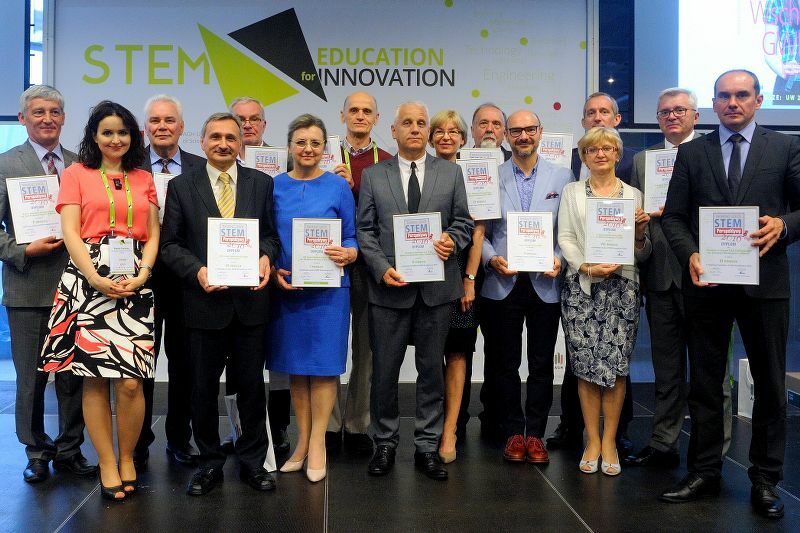 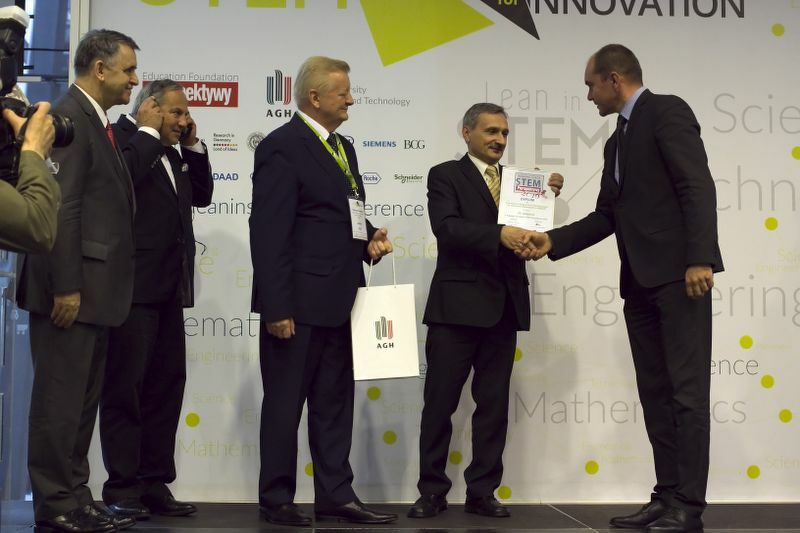 The main objective of the "STEM Education for Innovation" conference was to develop solutions for accelerating the development of Polish civilization through better teaching of STEM and more efficient development of careers in science and engineering. 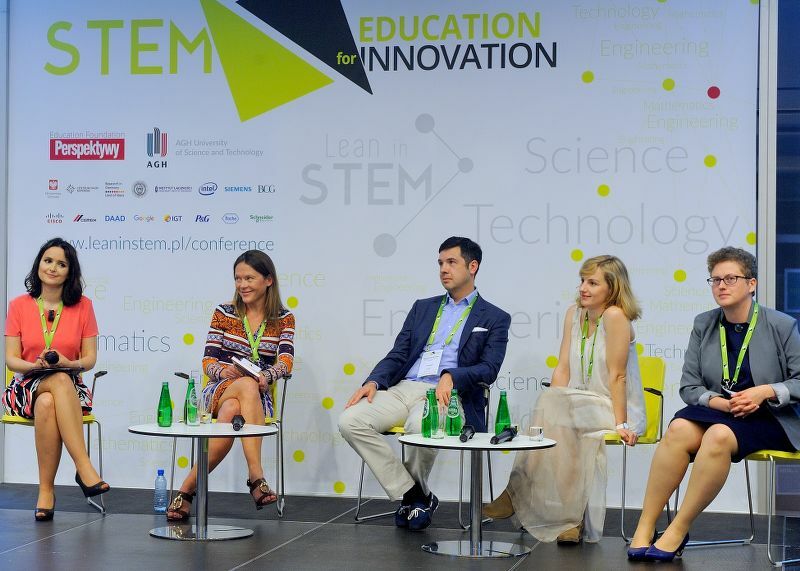 We debated the value of education and professional activity in the area of science and technology with speakers and panelists from 15 countries. 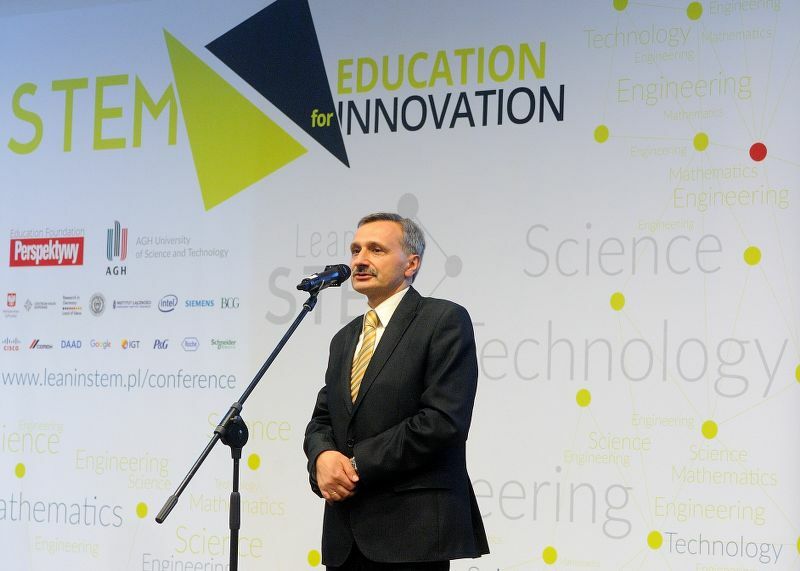 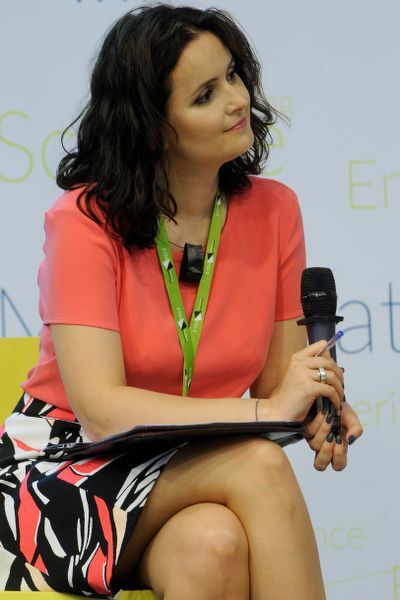 About contact with the academic world and the world of high-tech industry, about innovation, about science and technology start-ups, human creativity and the value of STEM for building a good, competent, prosperous and harmonious society, capable of solving the challenges of the present and to continue wise development. 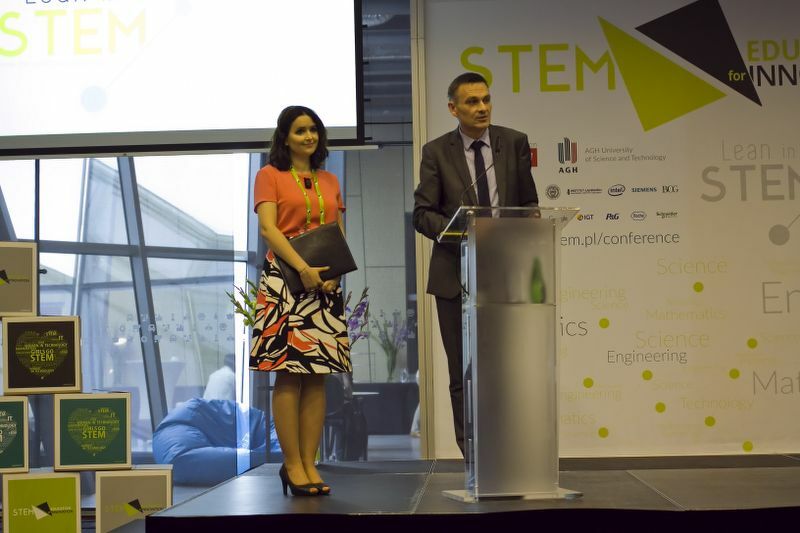 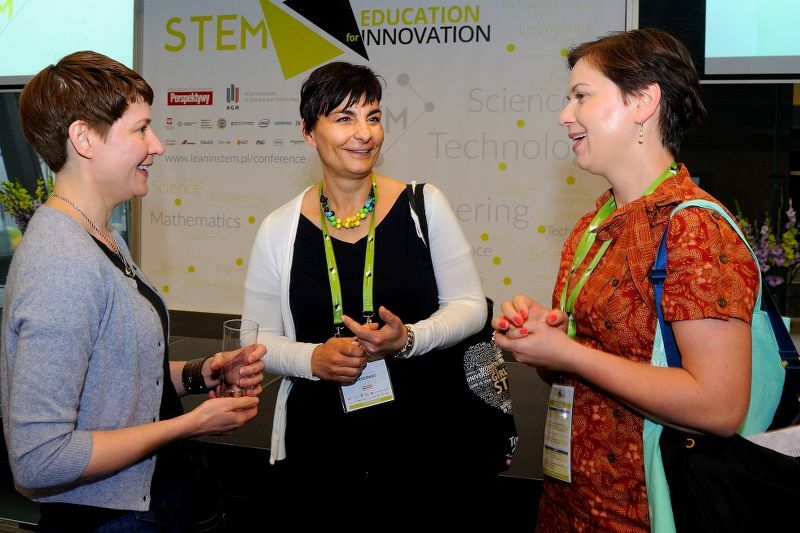 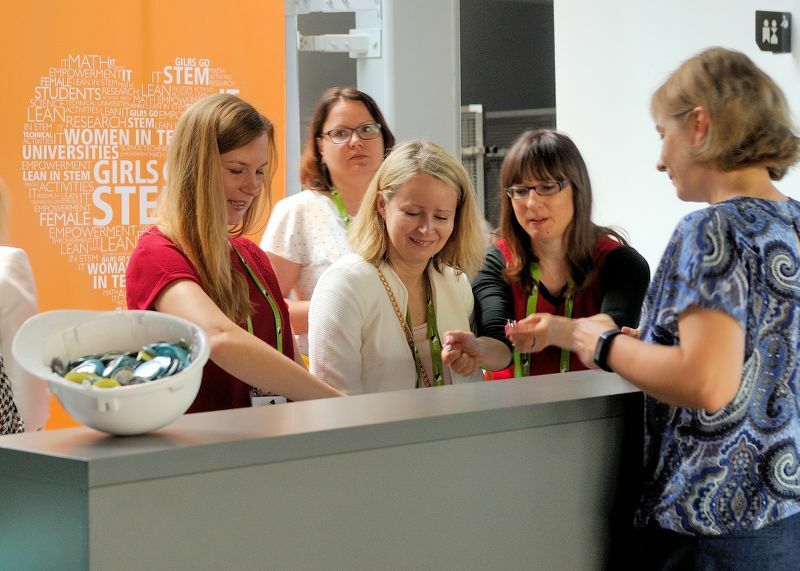 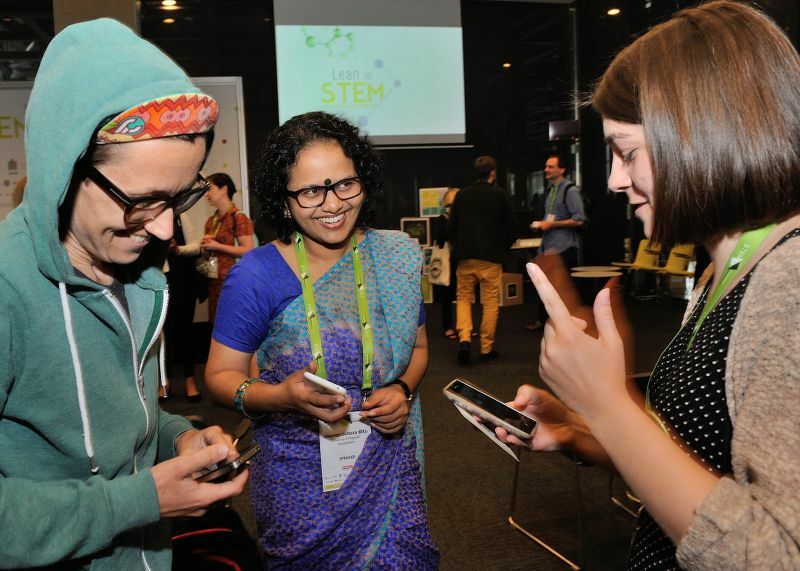 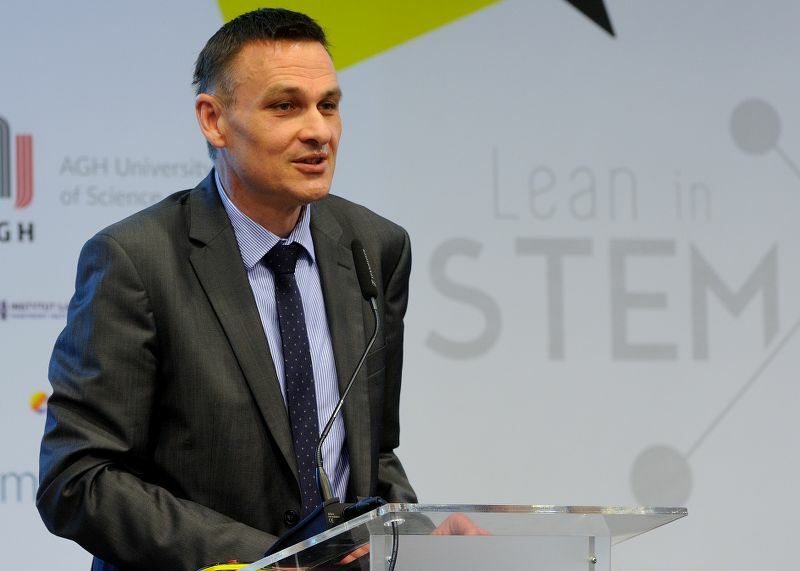 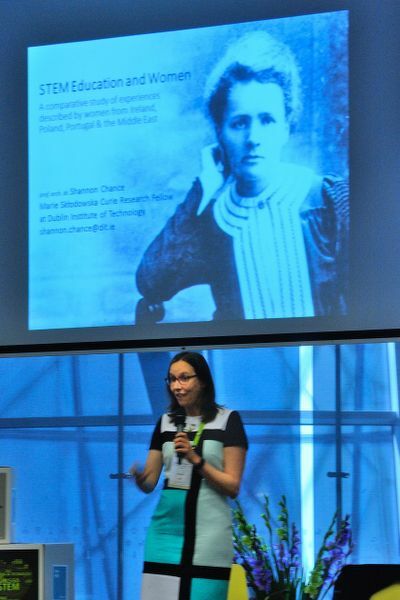 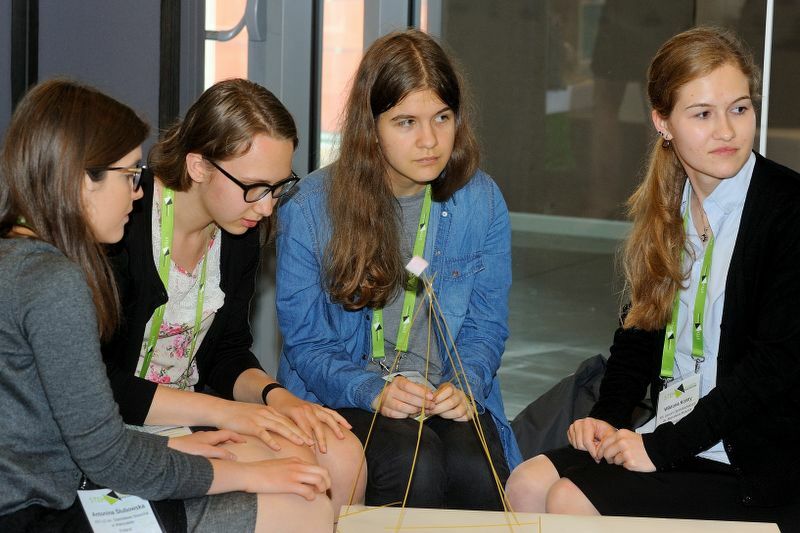 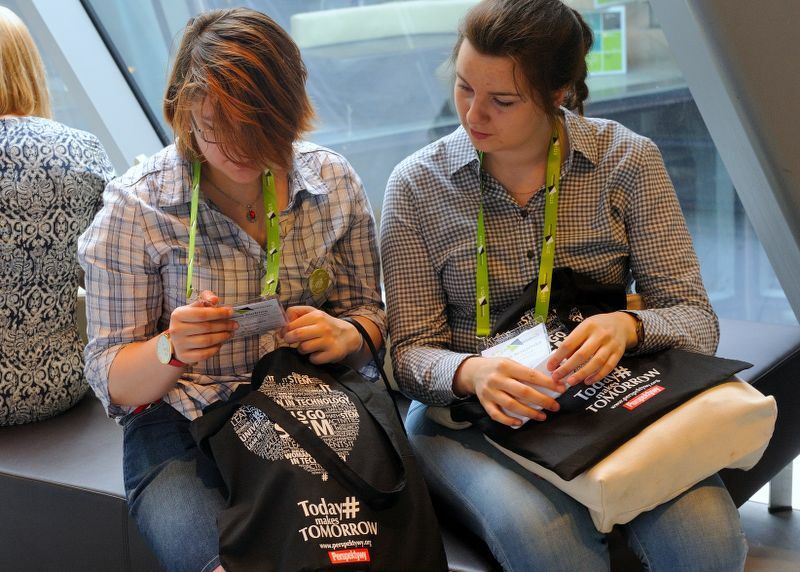 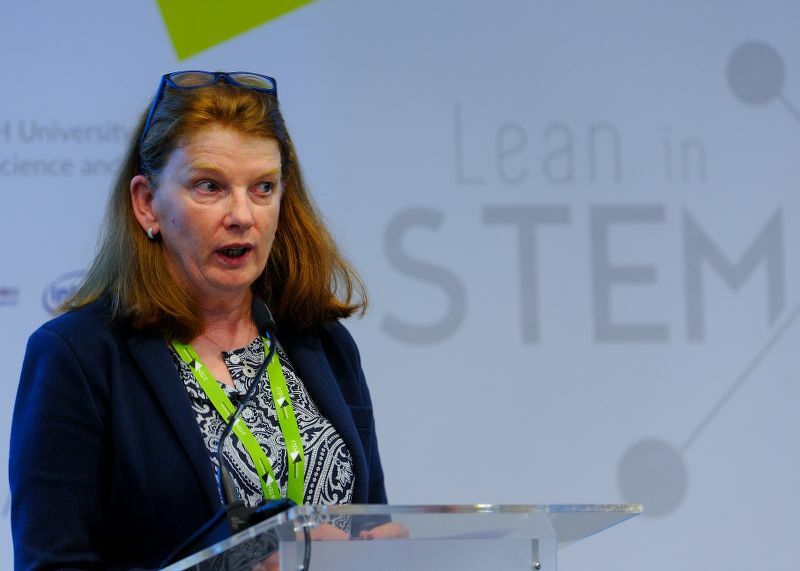 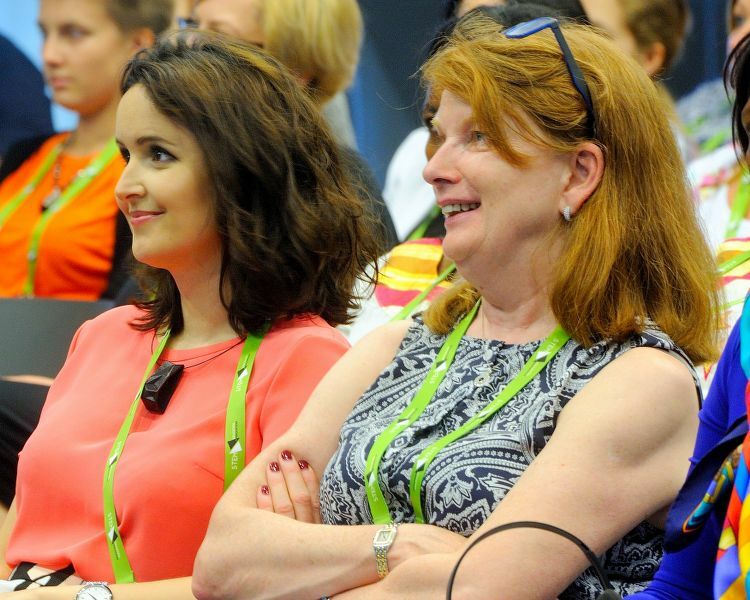 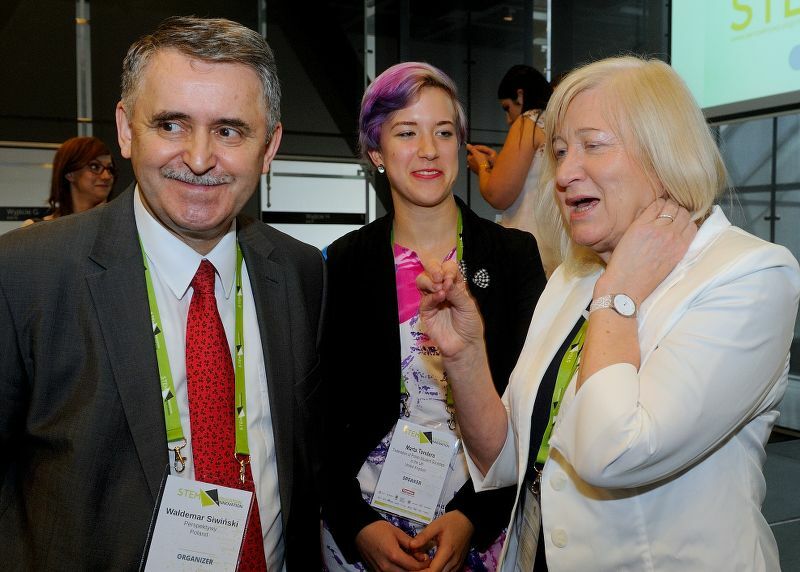 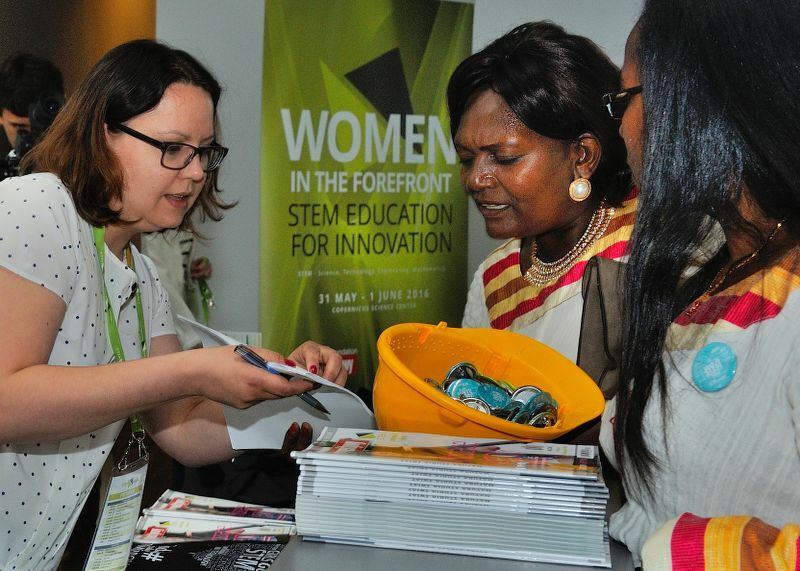 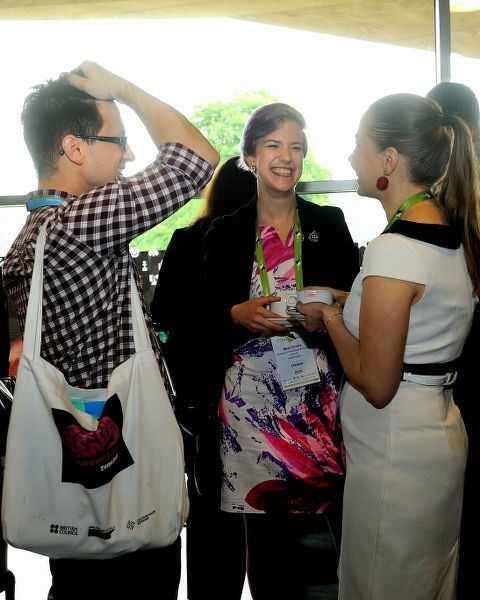 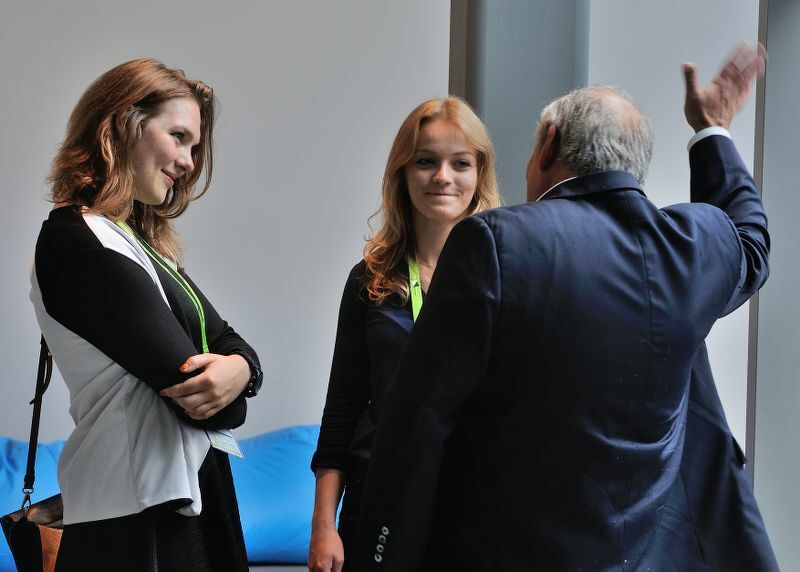 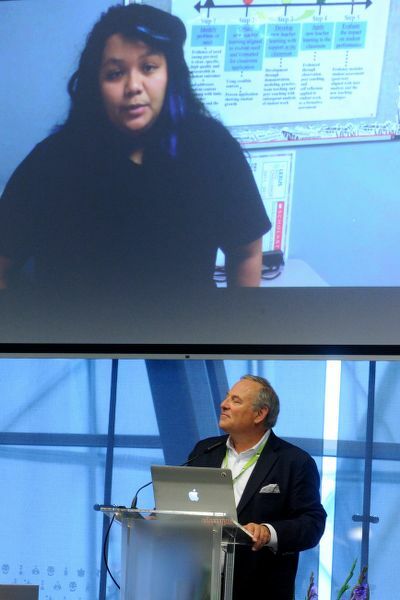 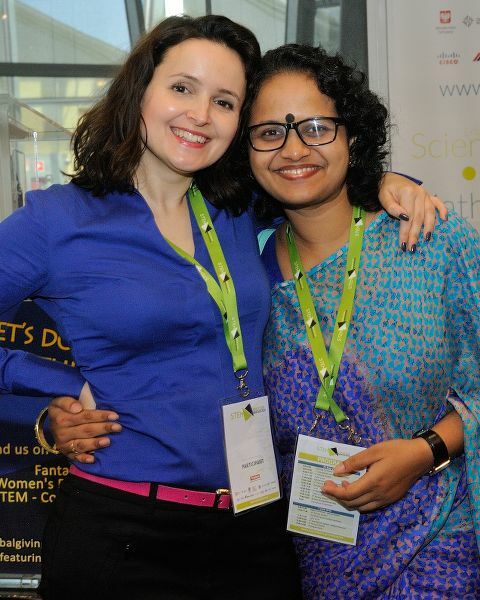 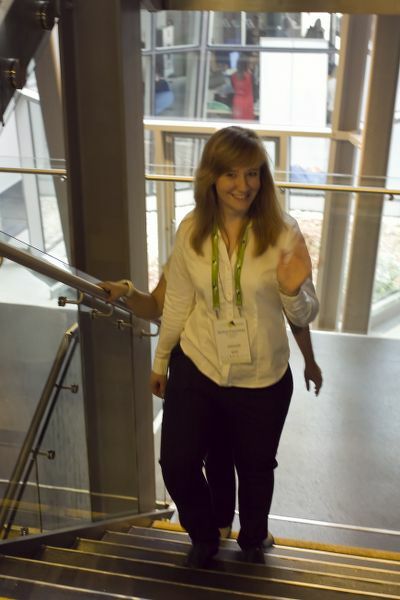 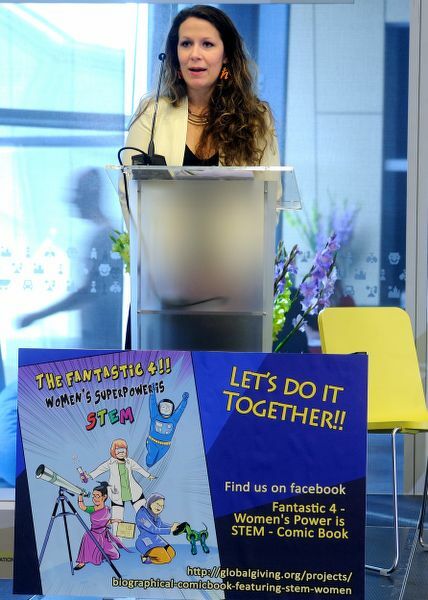 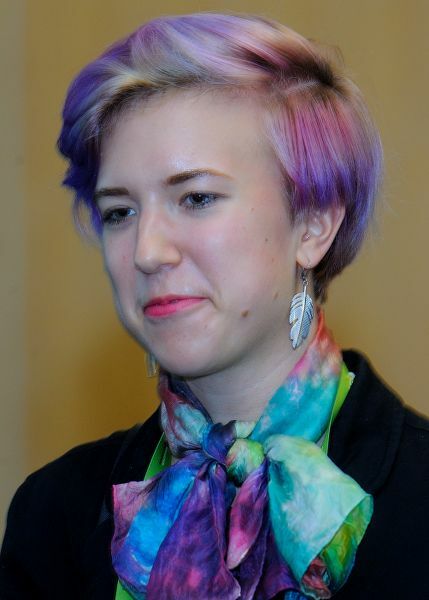 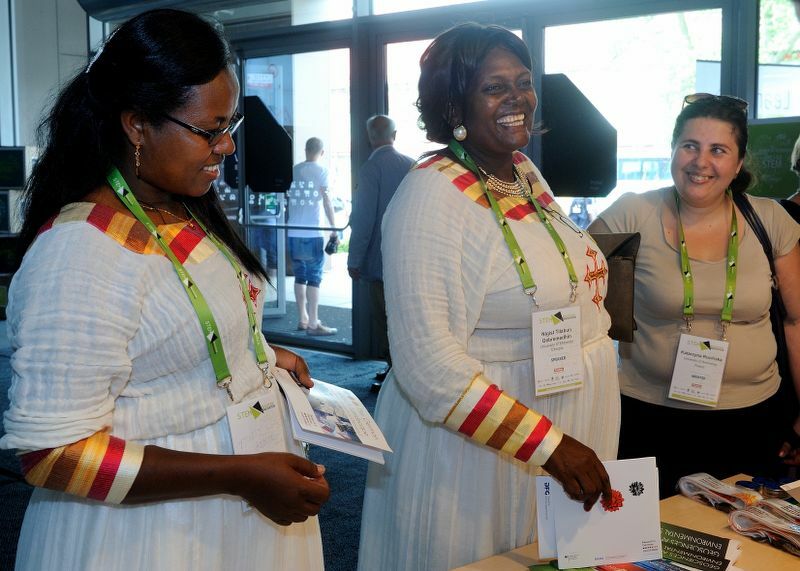 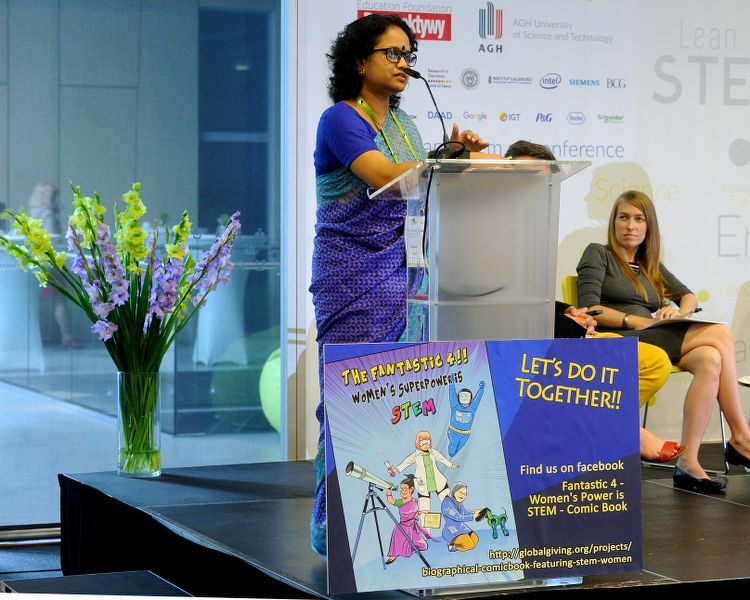 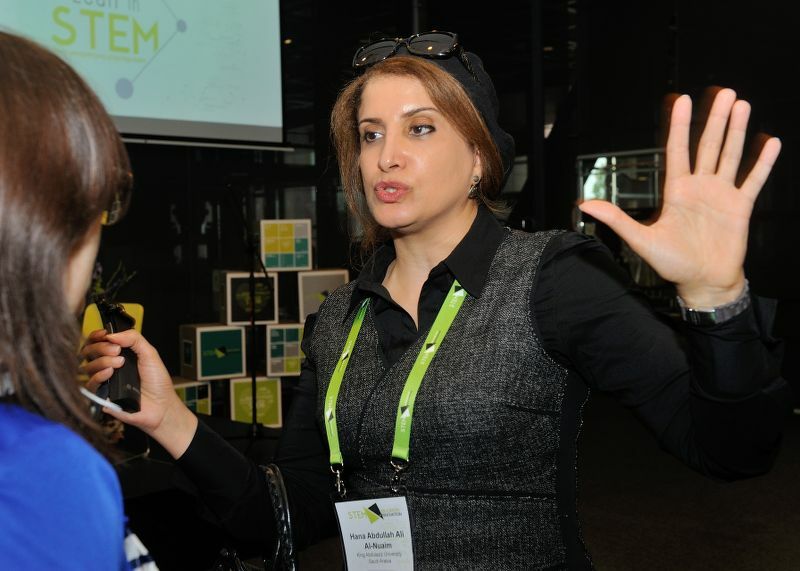 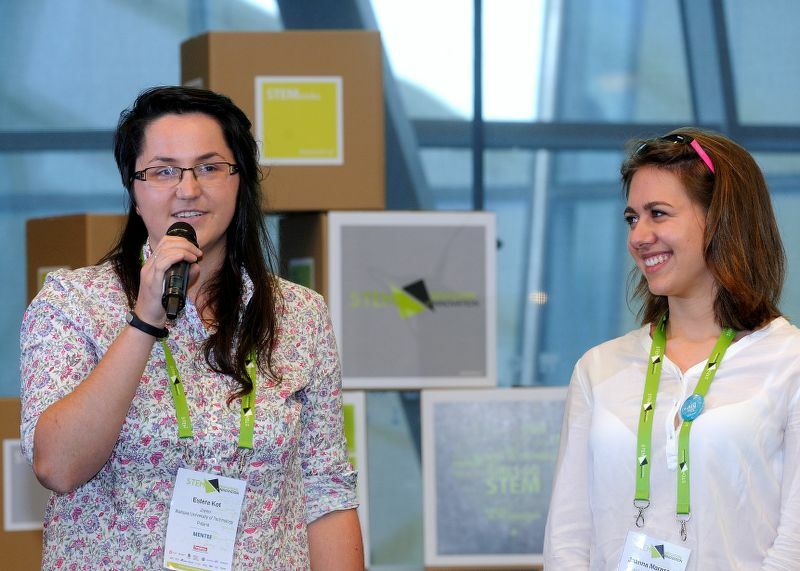 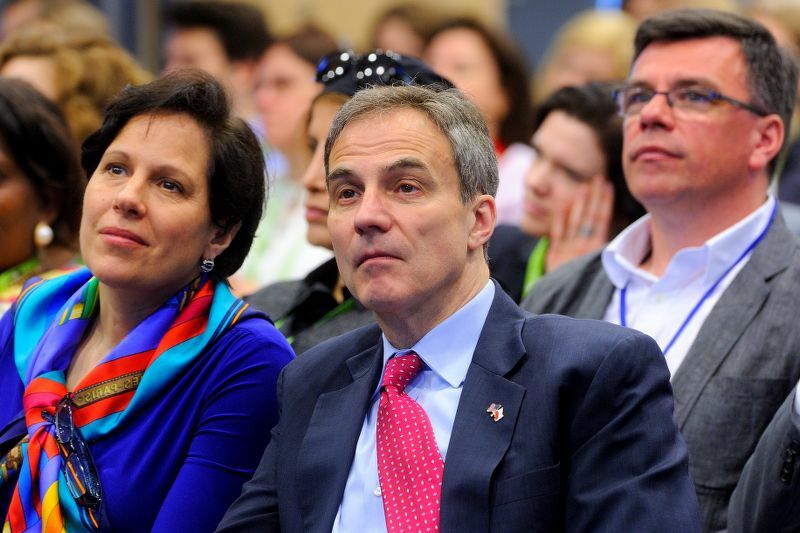 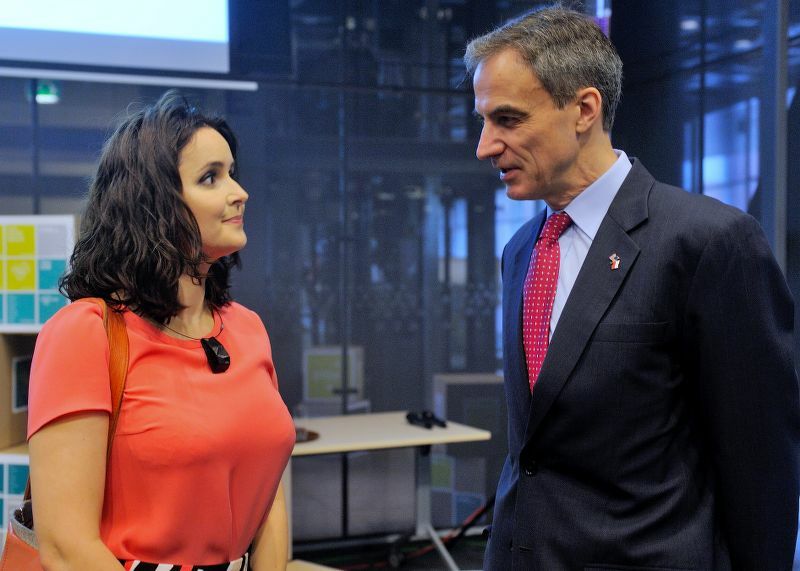 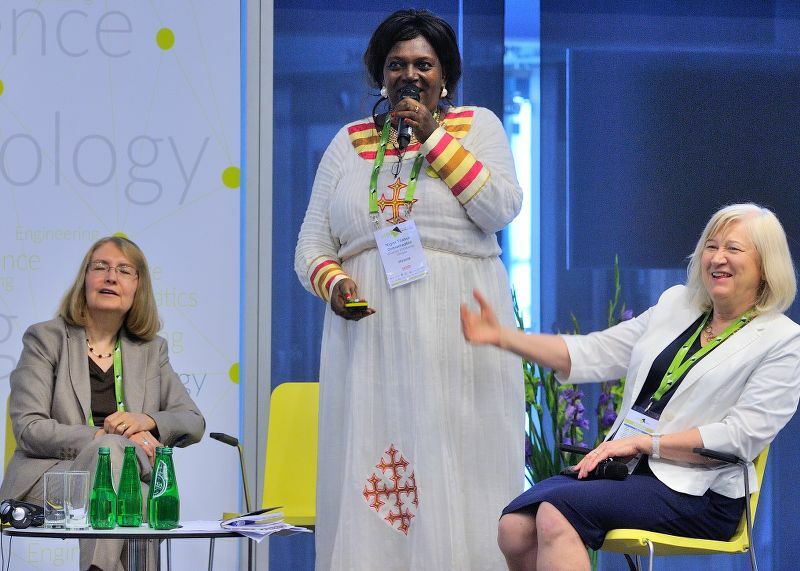 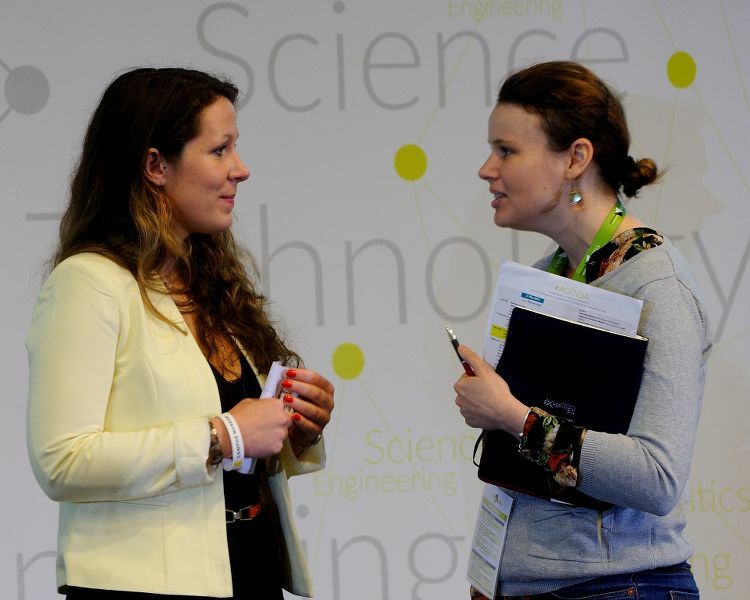 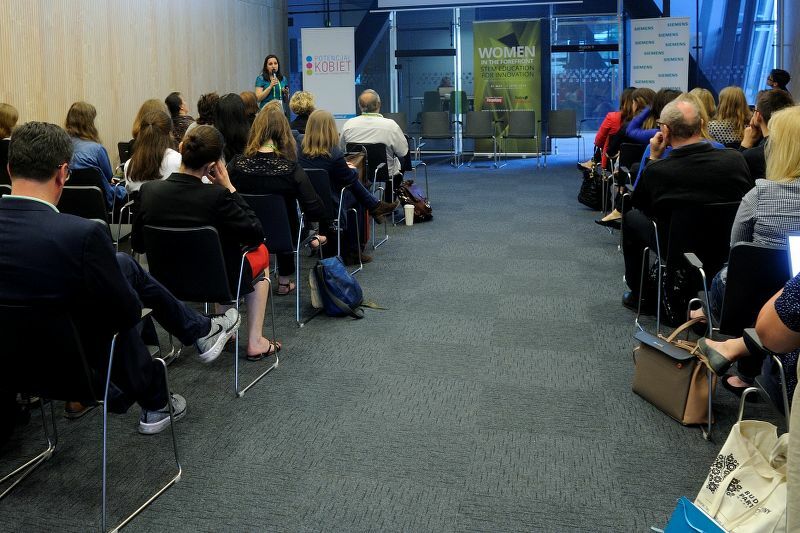 An important theme of the conference was to challenge the full potential of women in the STEM. 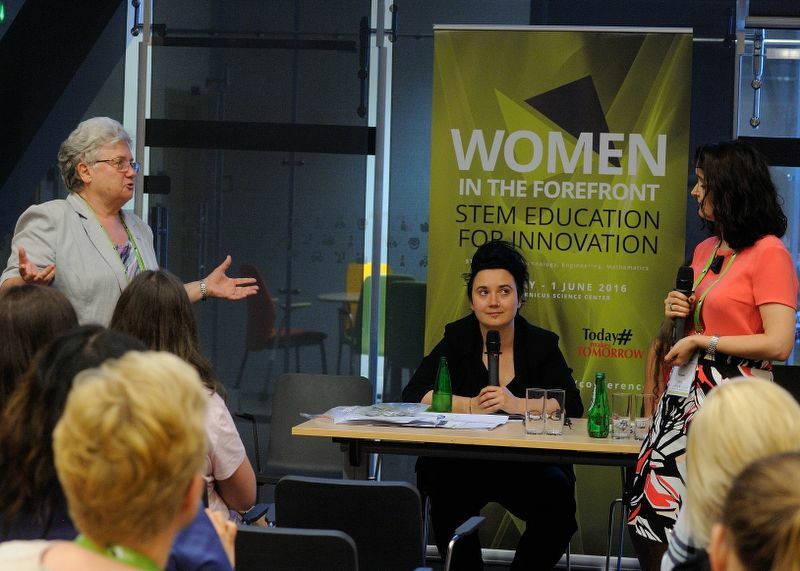 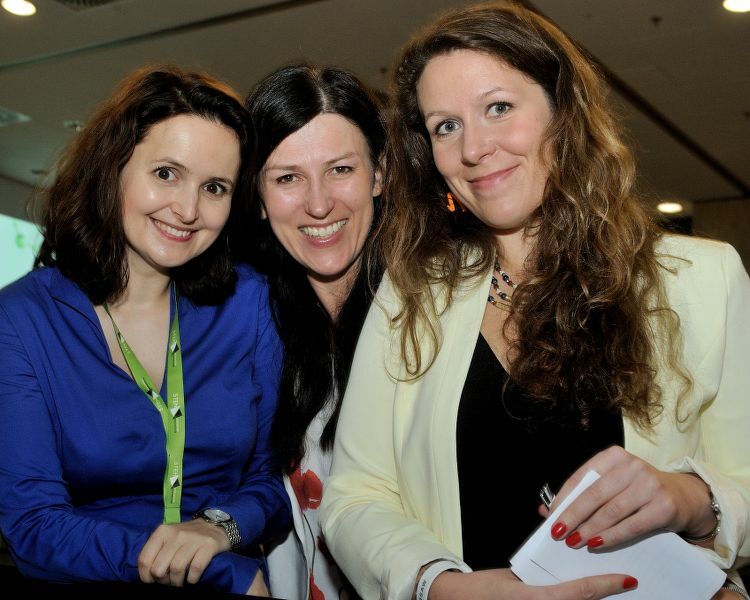 Hence the postscript in the title: "Women in the forefront". 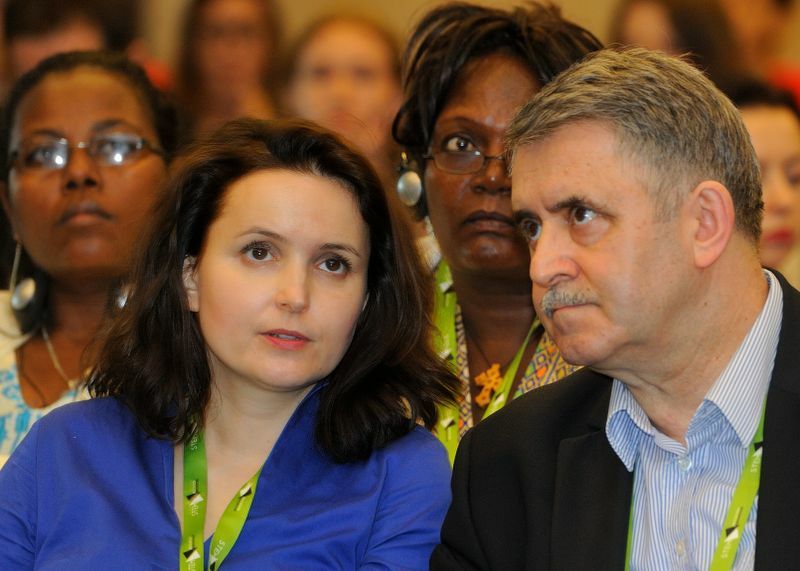 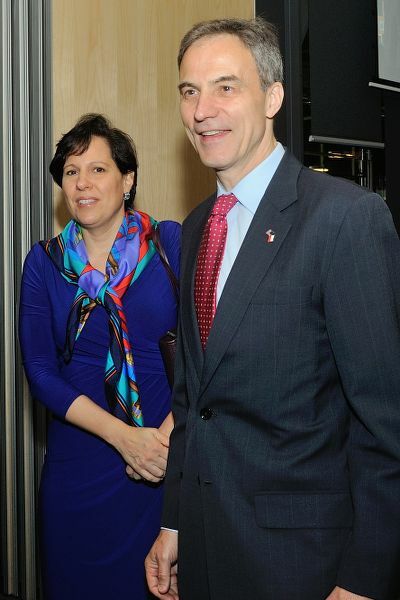 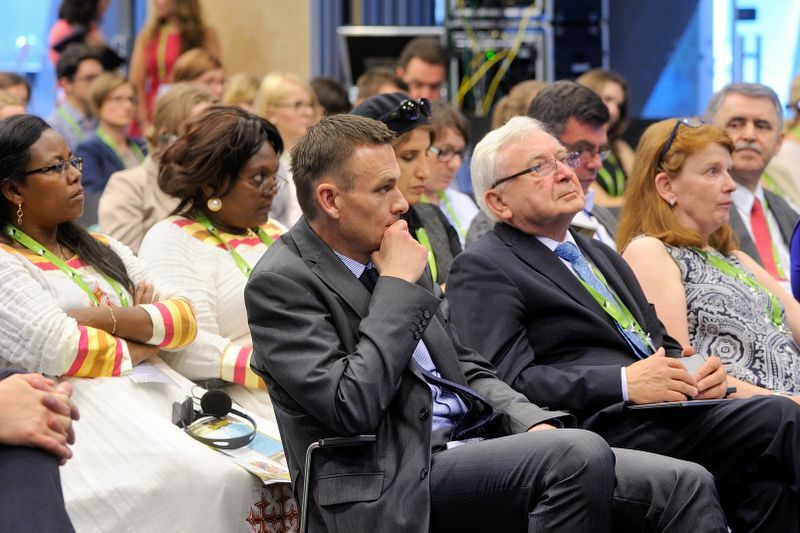 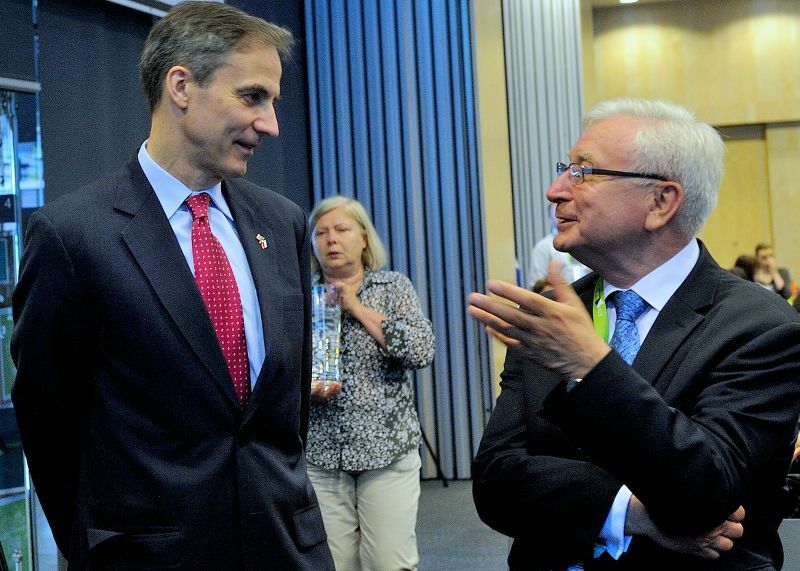 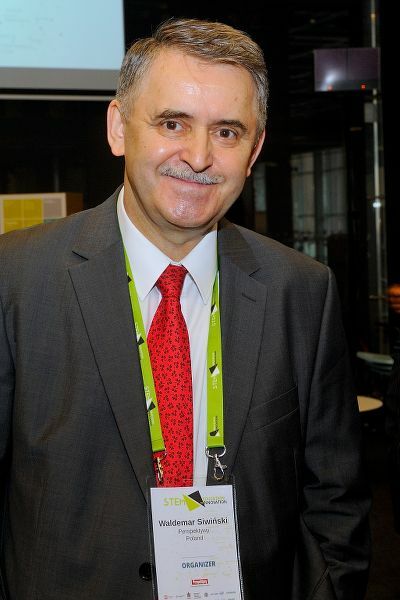 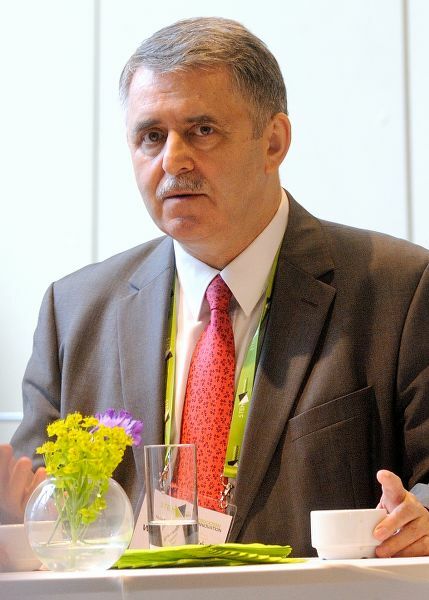 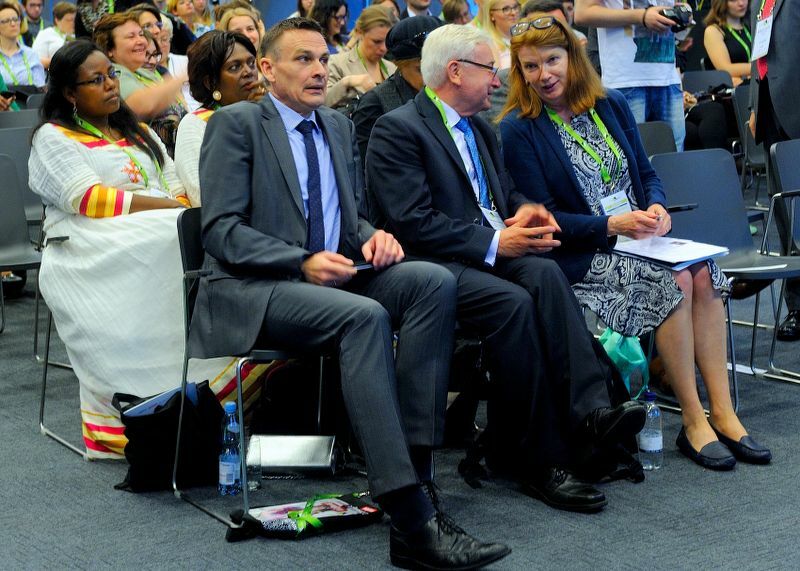 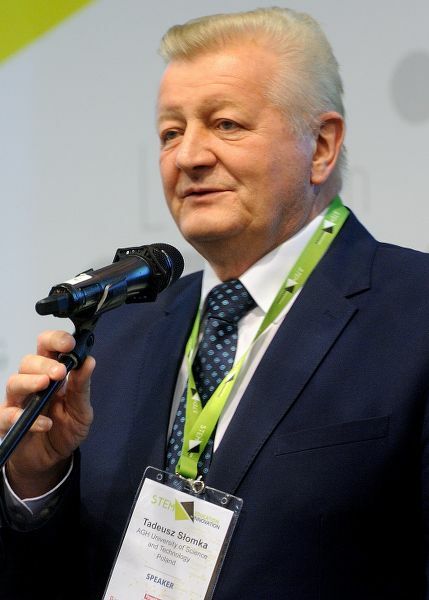 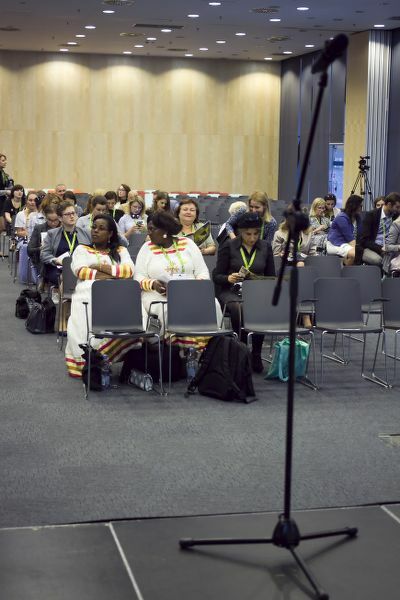 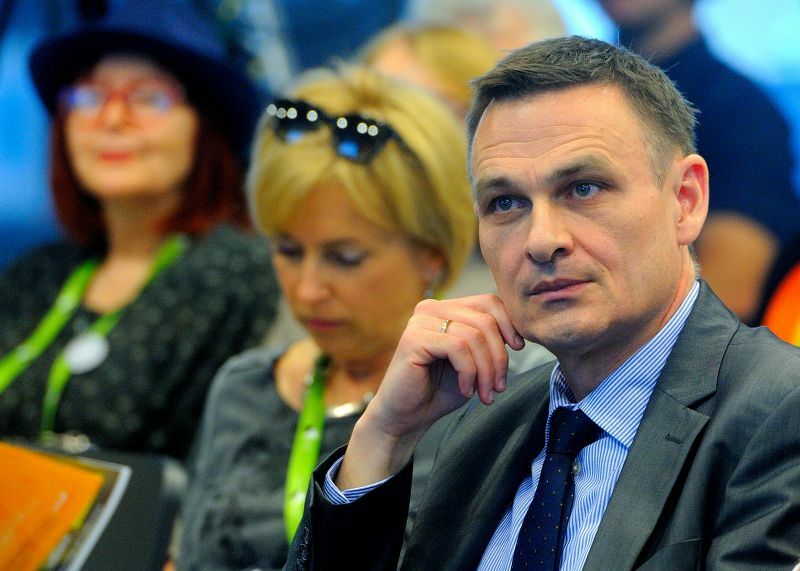 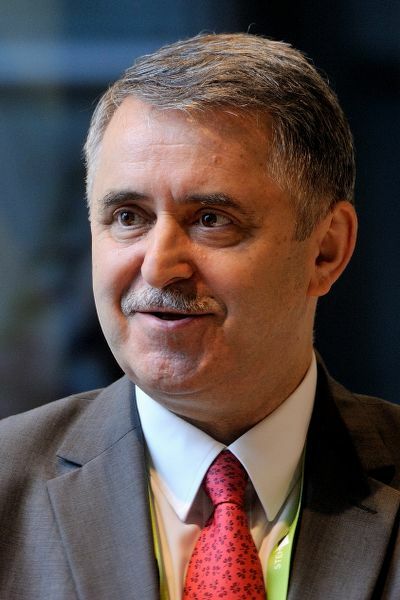 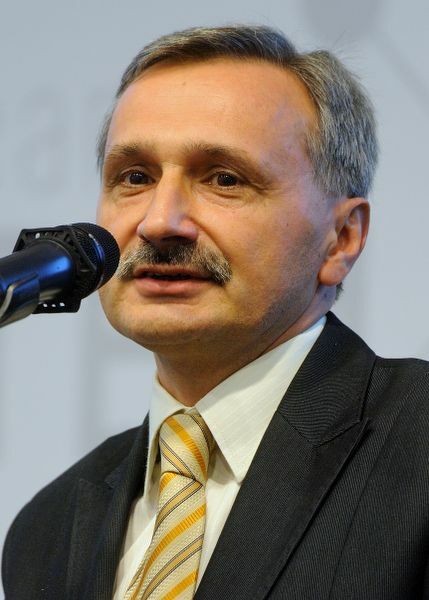 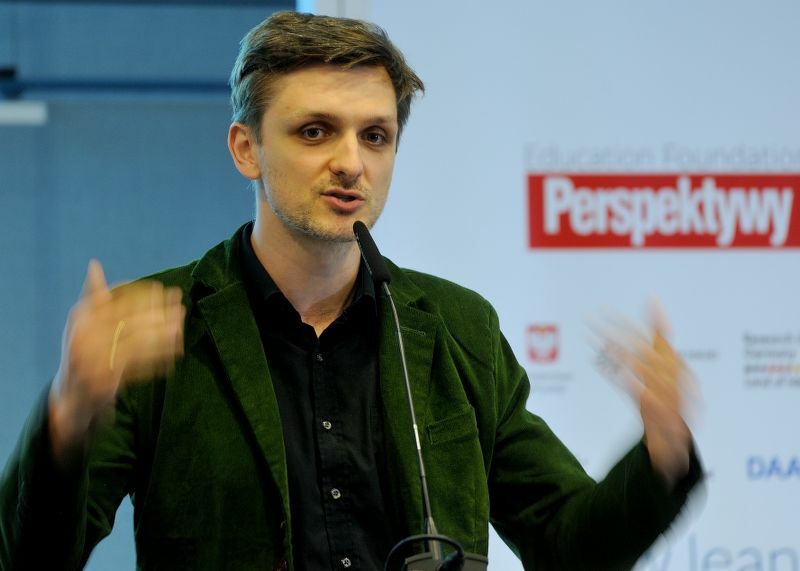 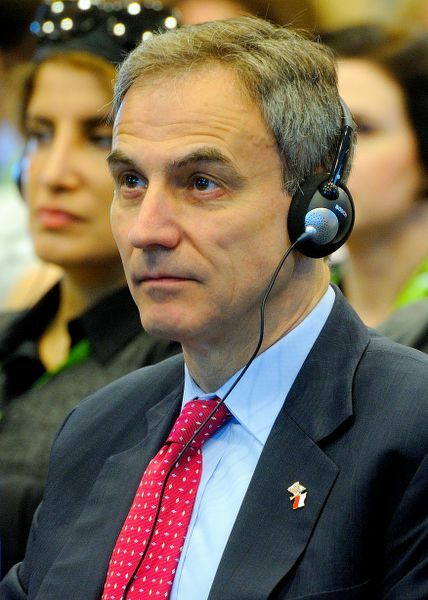 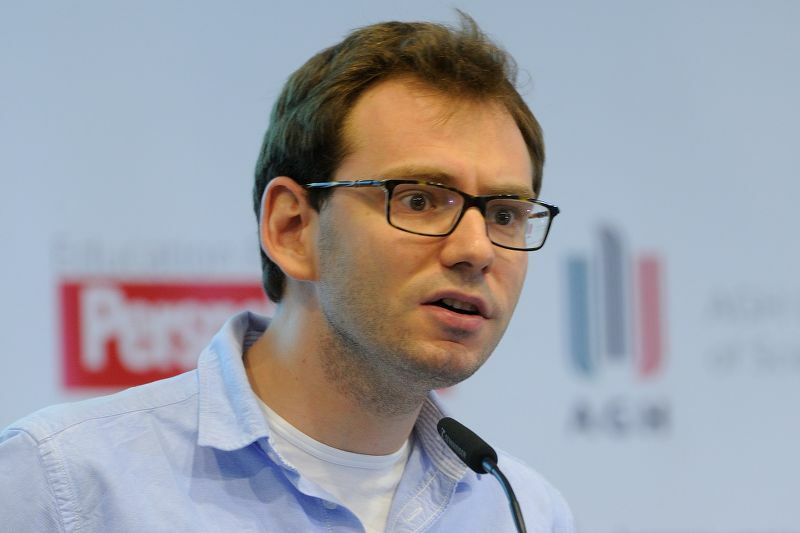 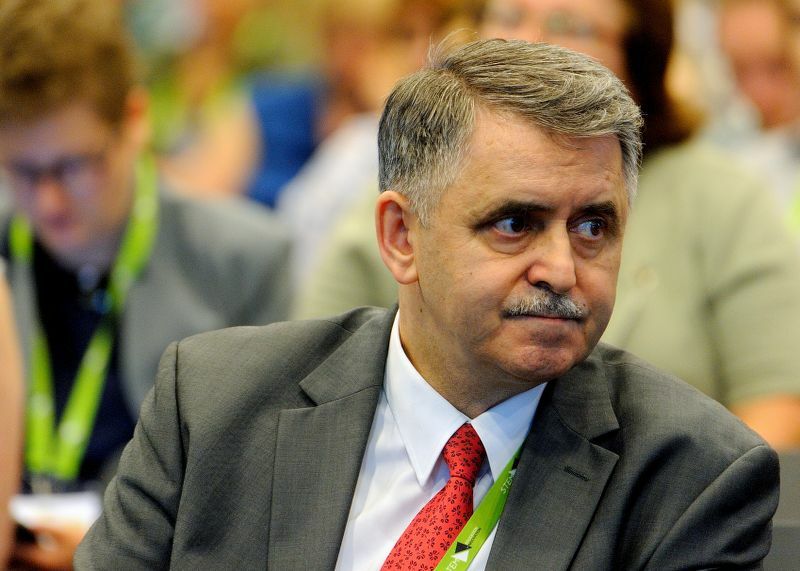 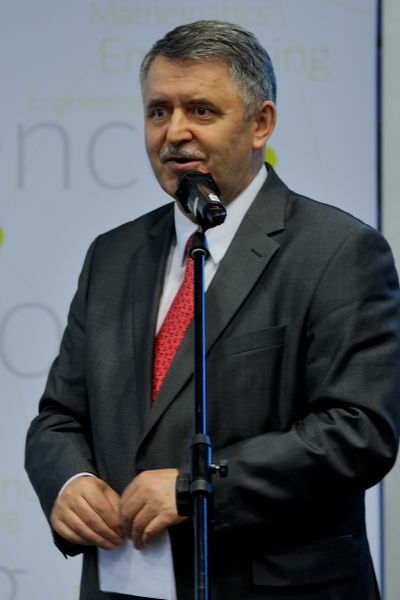 Wojciech Kaczmarczyk, the Government Plenipotentiary for Civil Society and Equal Treatment opening the event pointed out that equality legislation must be converted into a reality of equality. 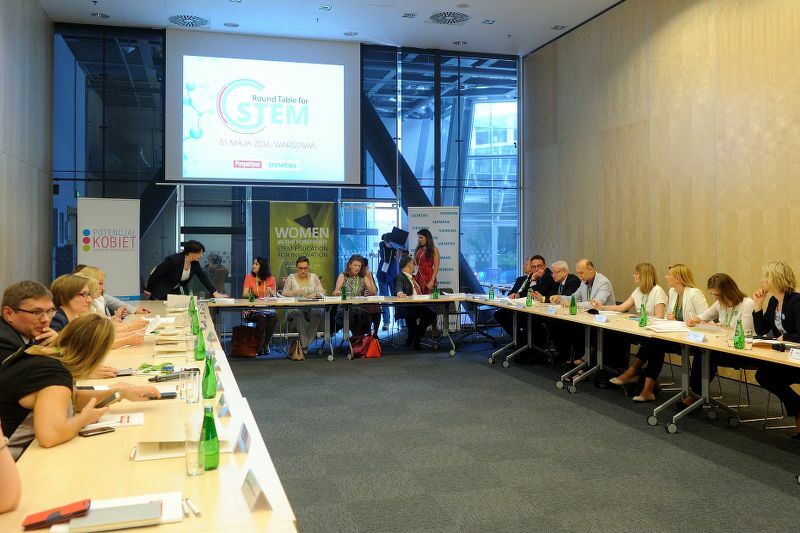 An important step on this road was the Round Table for STEM - partnership initiative of individuals and institutions interested in the popularization of science and technical sciences, creative rapprochement between the world of universities and technology business and to support the potential of women in science, technology and innovative business start ups. 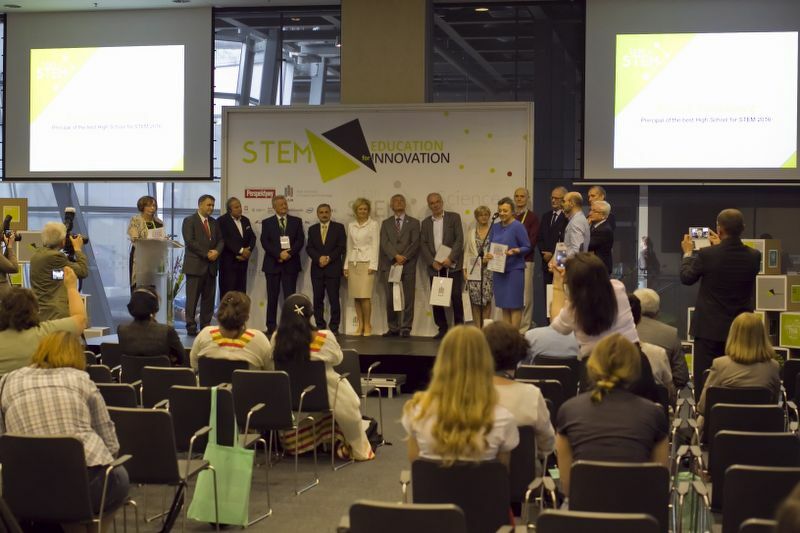 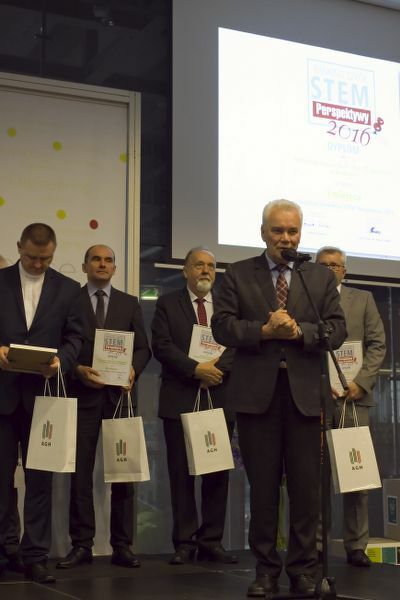 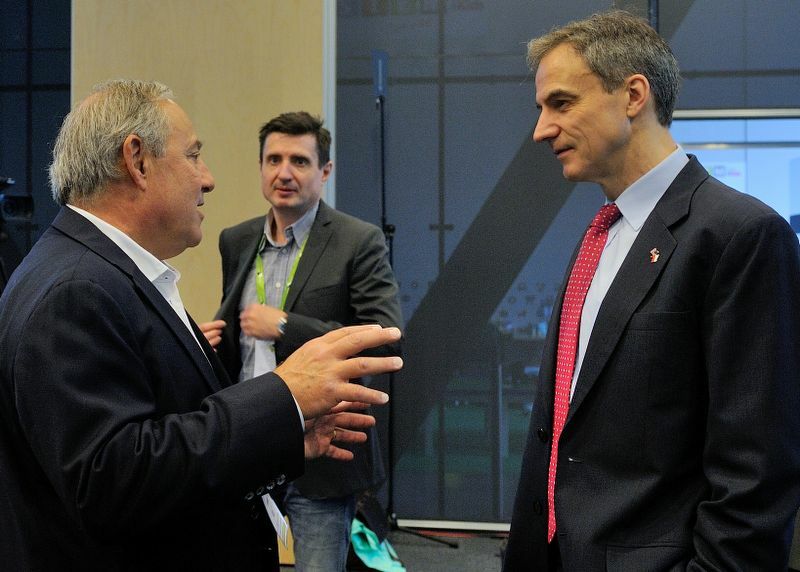 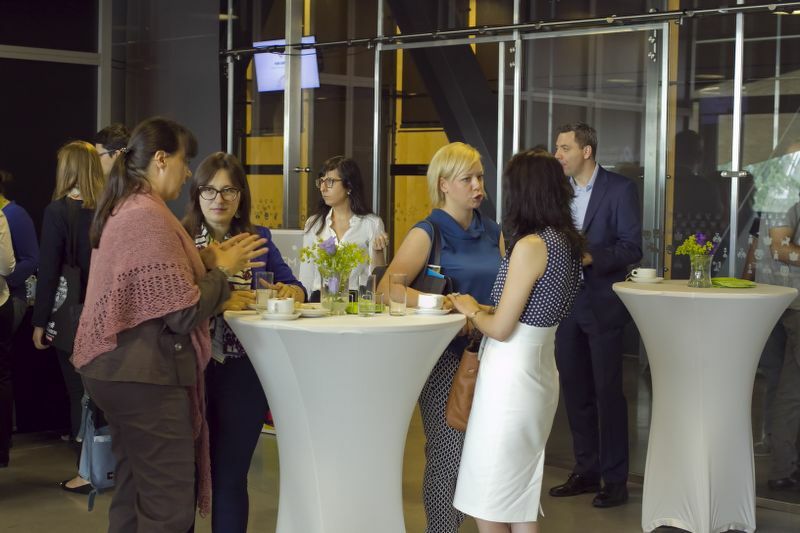 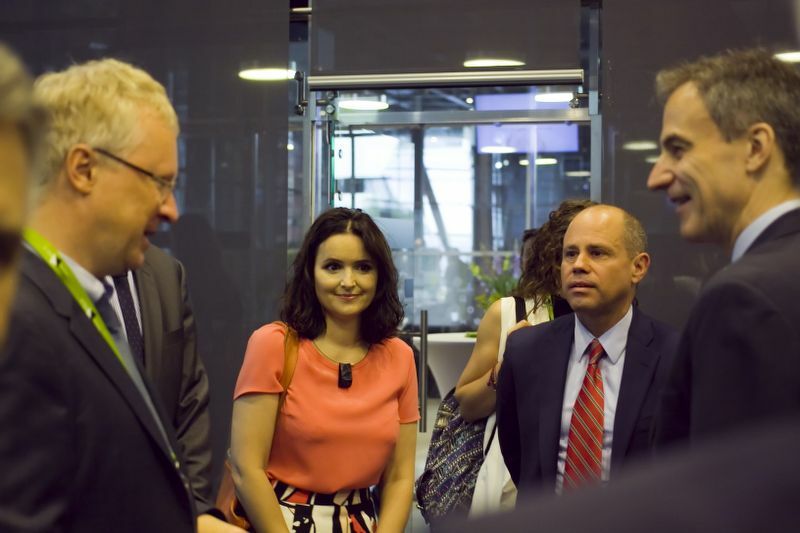 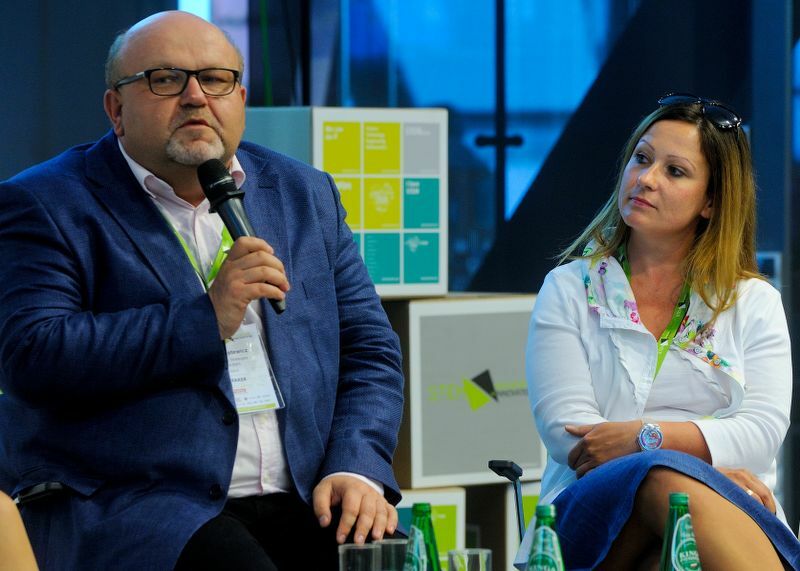 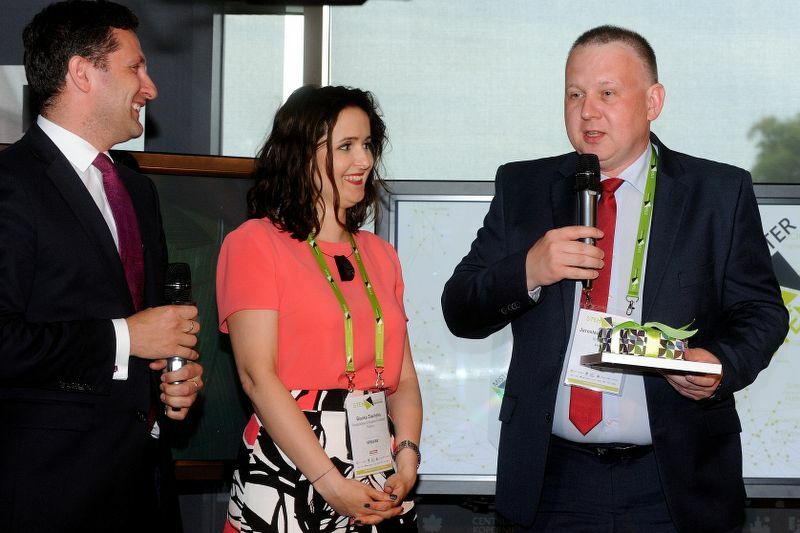 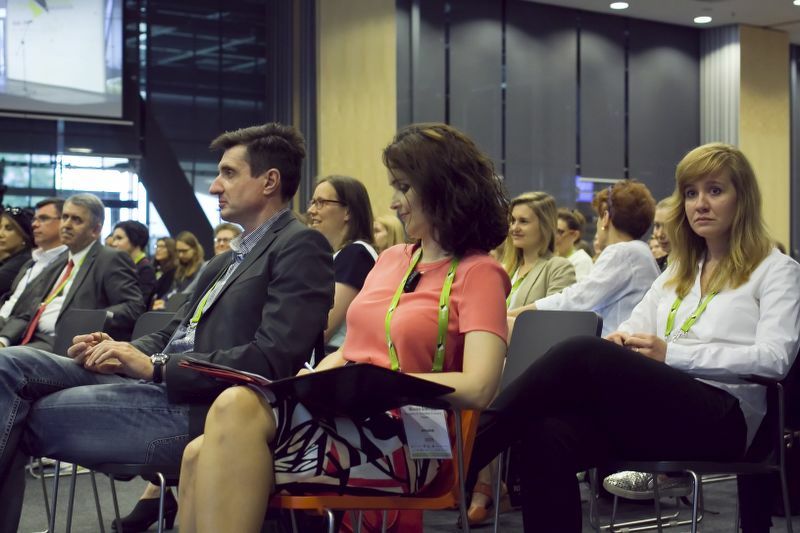 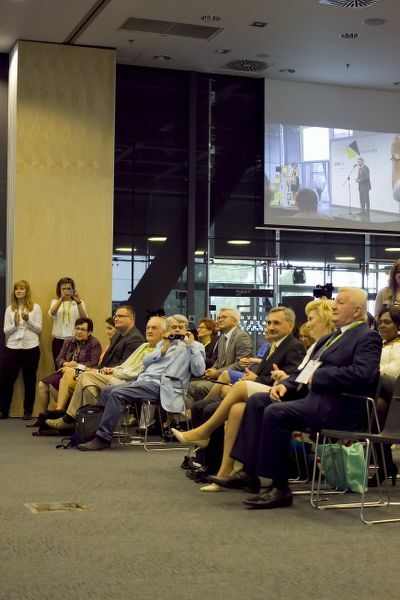 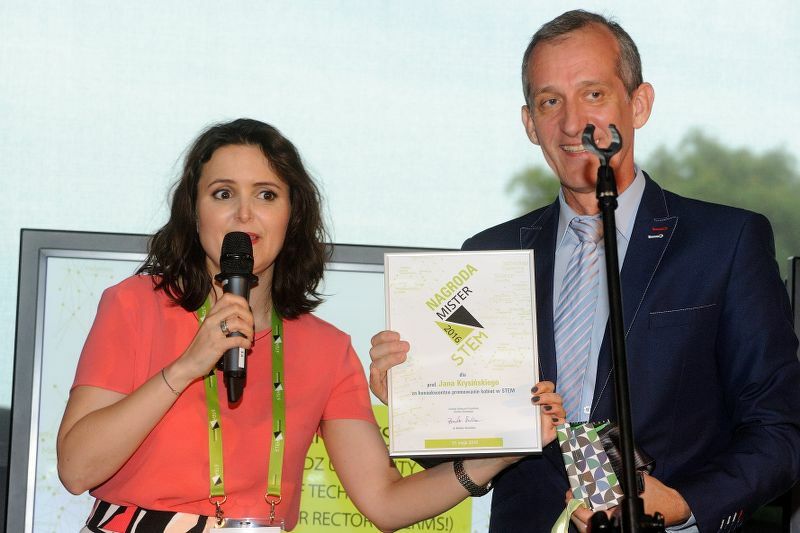 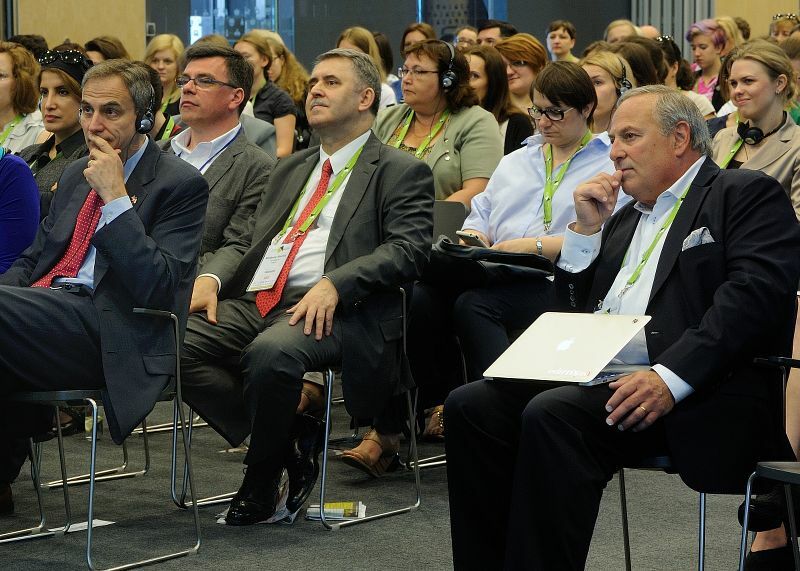 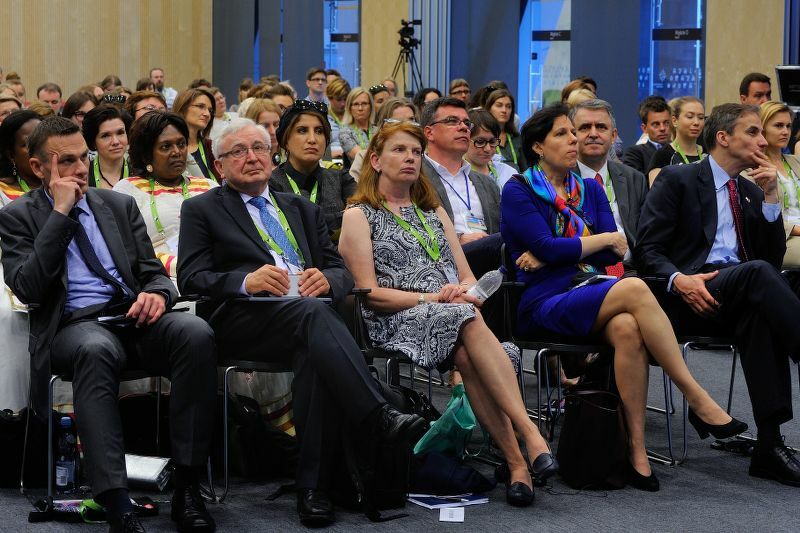 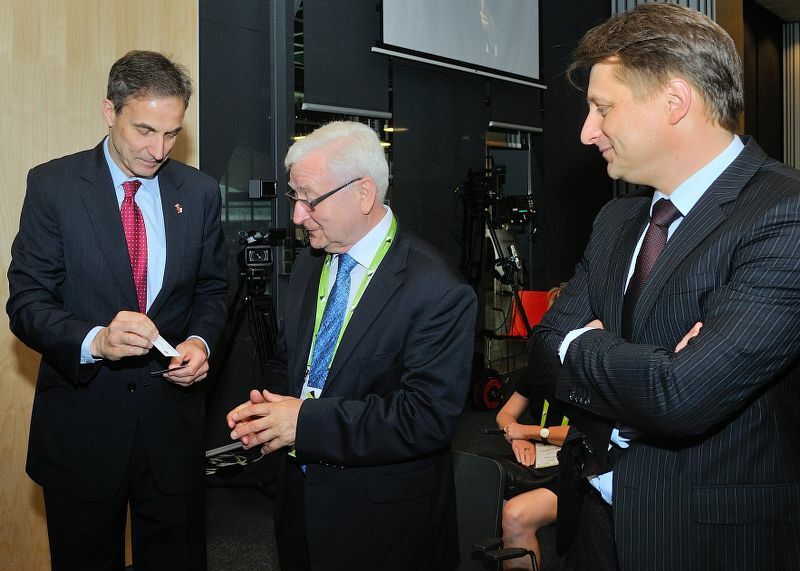 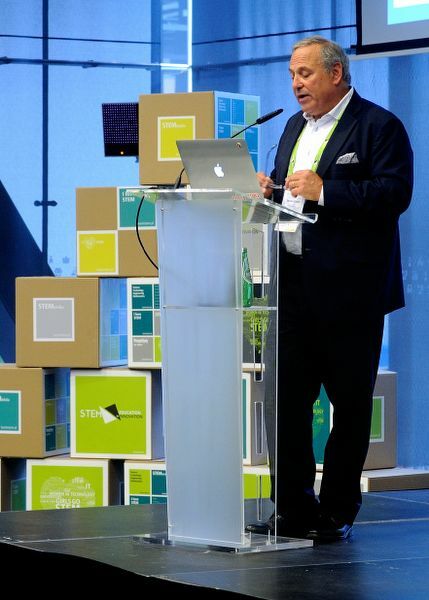 It was attended by, among others, rectors of the best Polish technical universities, heads of 15 technology companies, media representatives and NGO's. 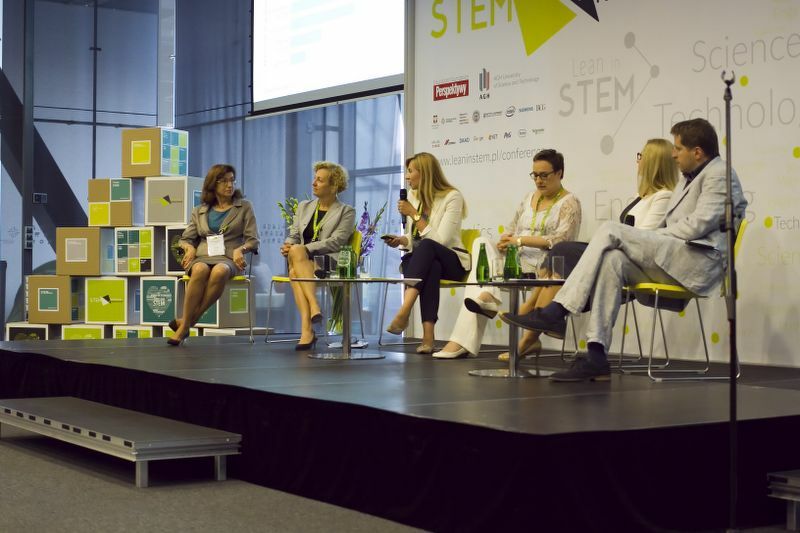 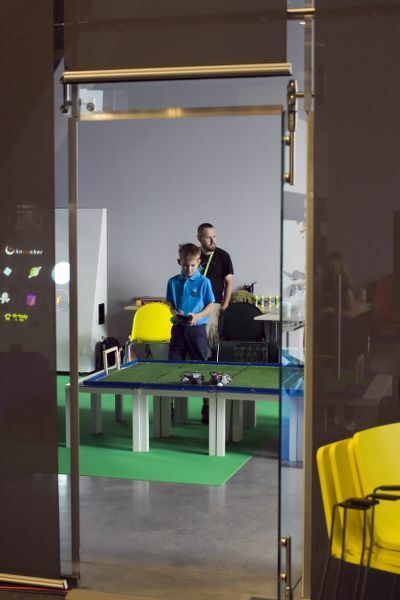 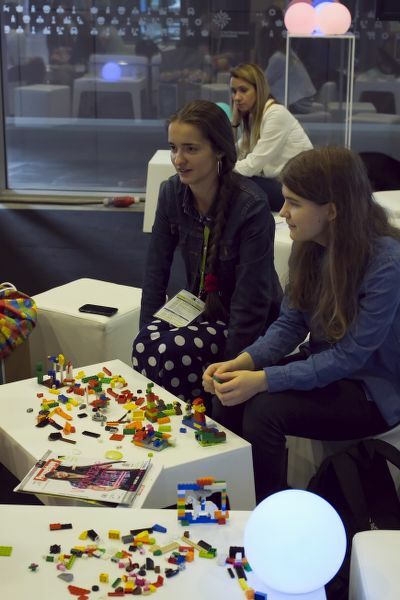 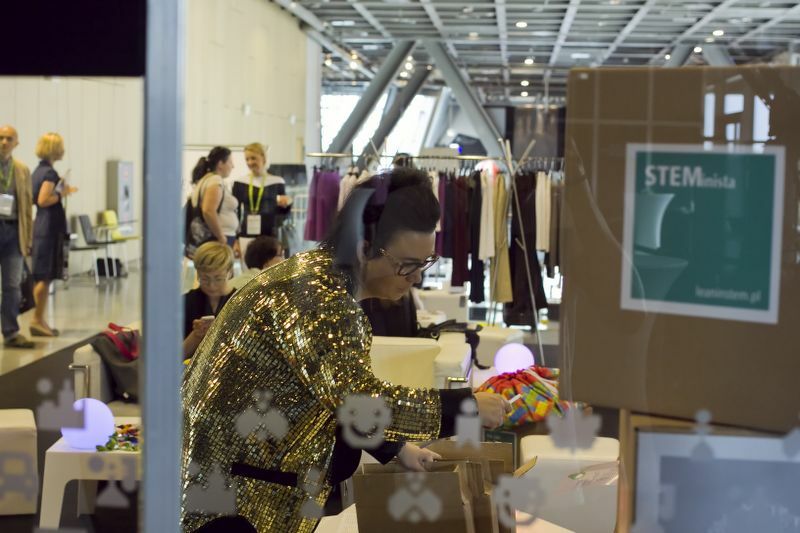 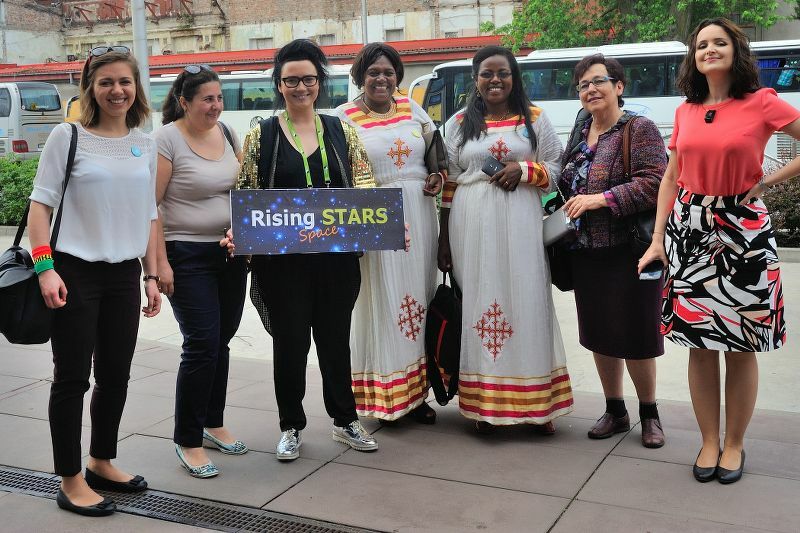 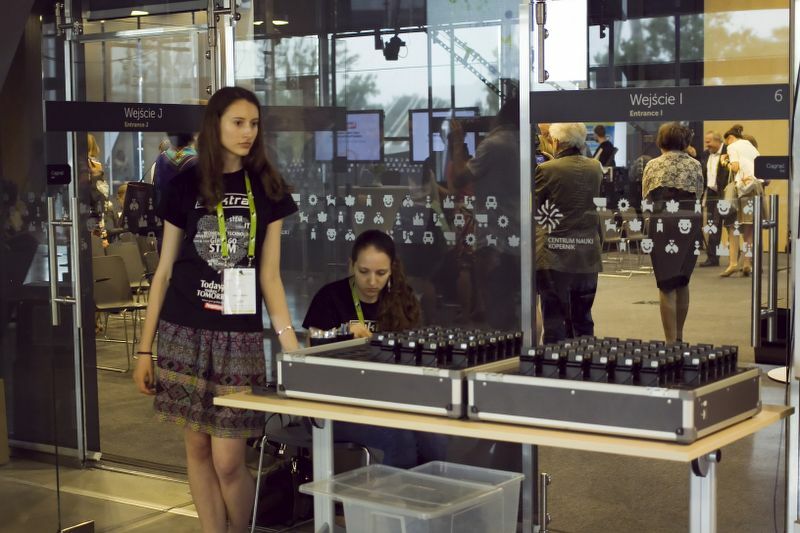 They presented initiatives promoting STEM, such as inspirational Camp for Girls in ICT, a European ranking of engineering faculties, and Start4Stars program - partner placements for students of technology universities in the best high-tech companies. 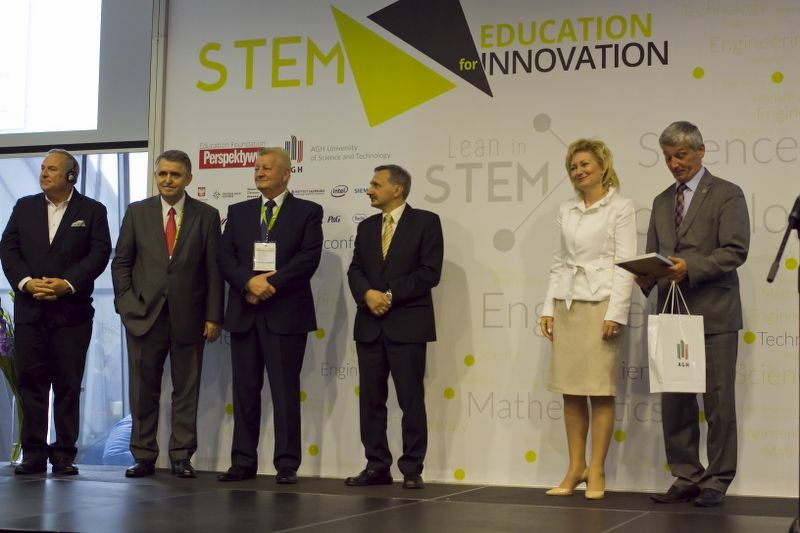 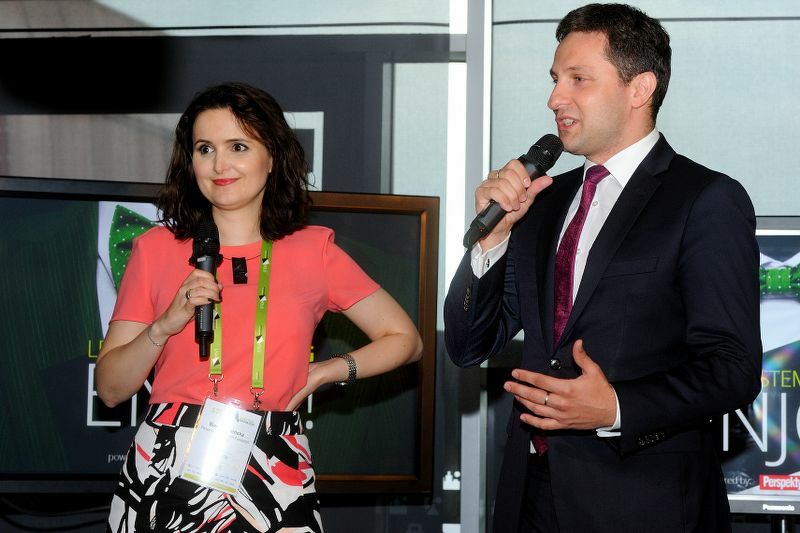 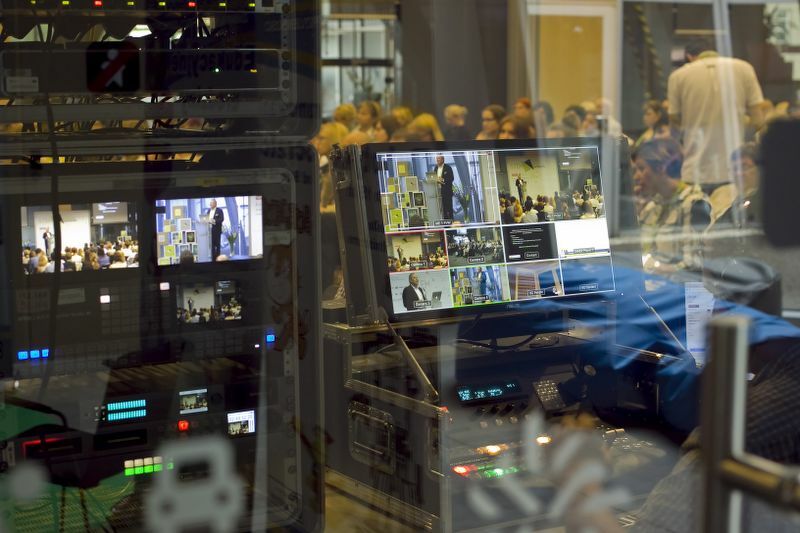 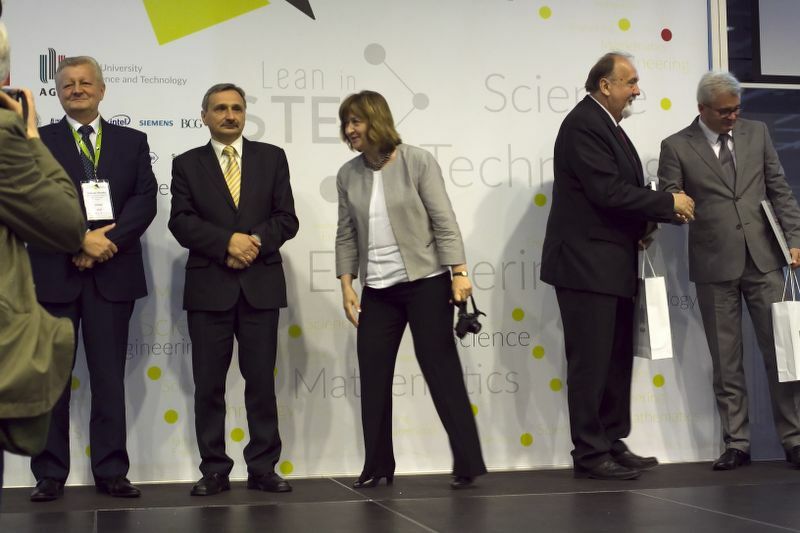 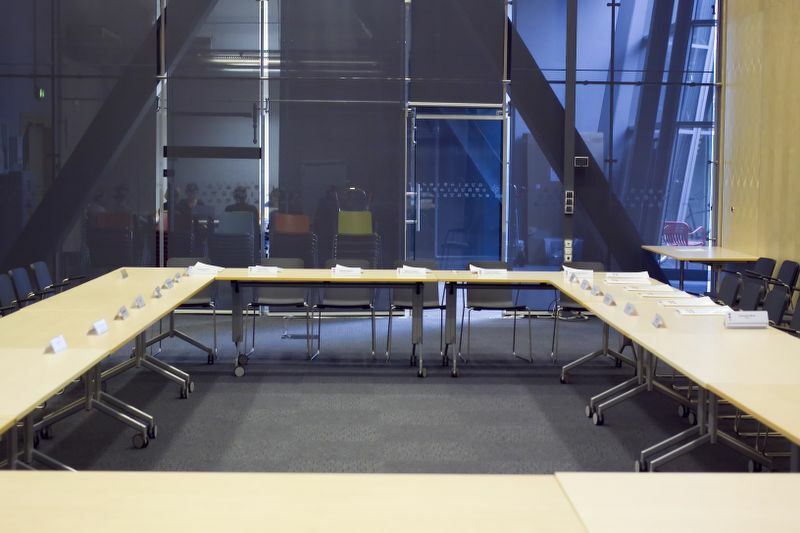 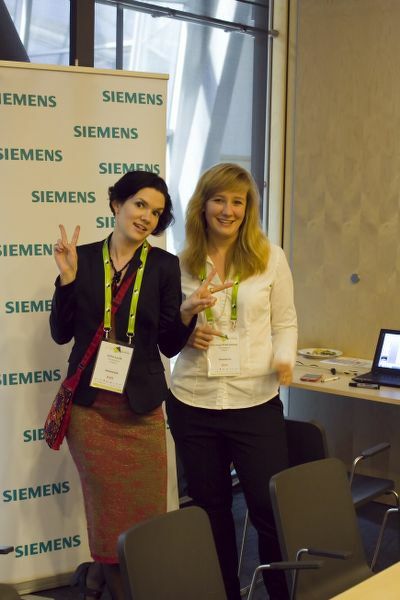 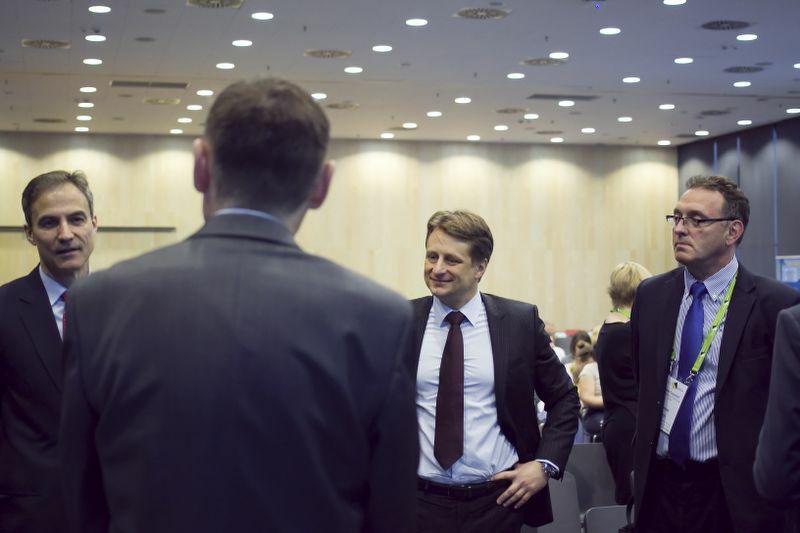 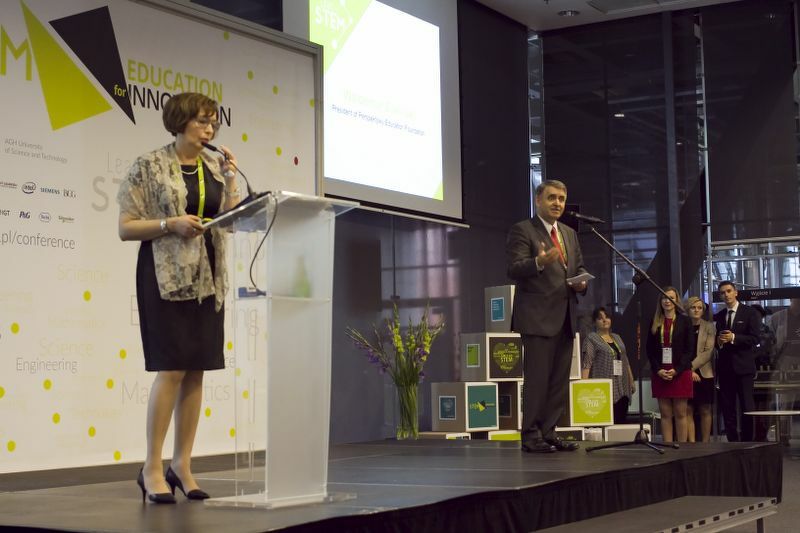 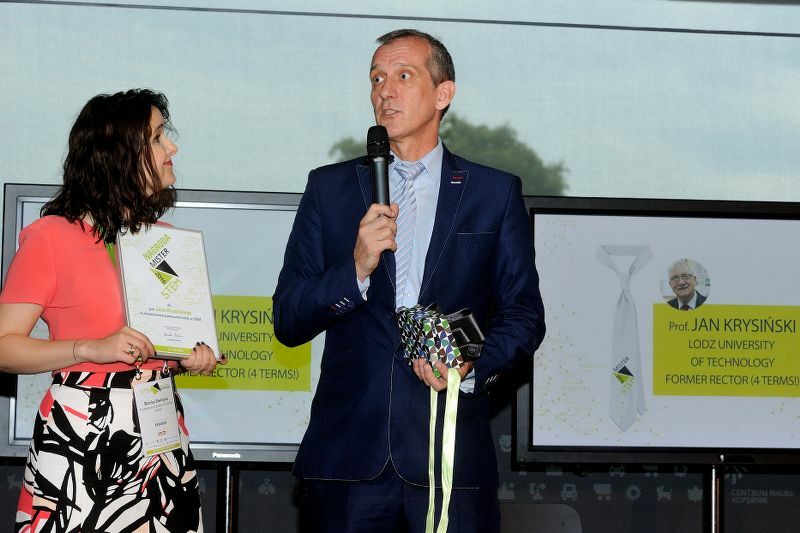 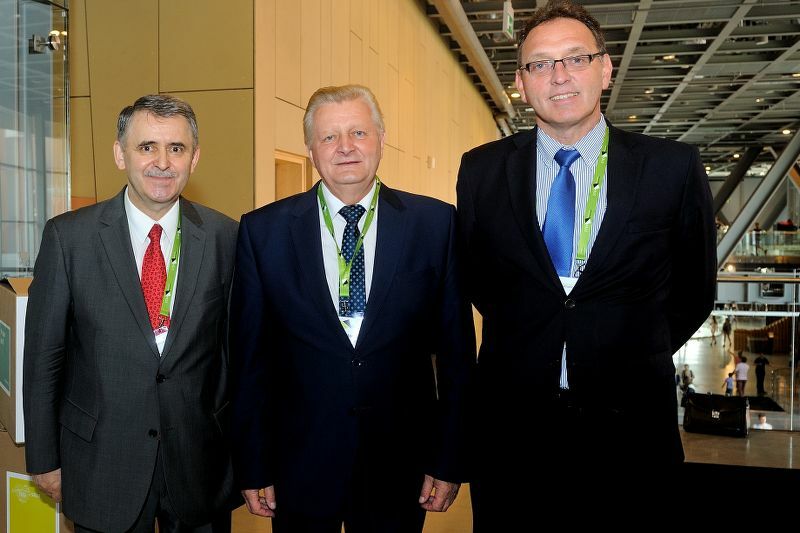 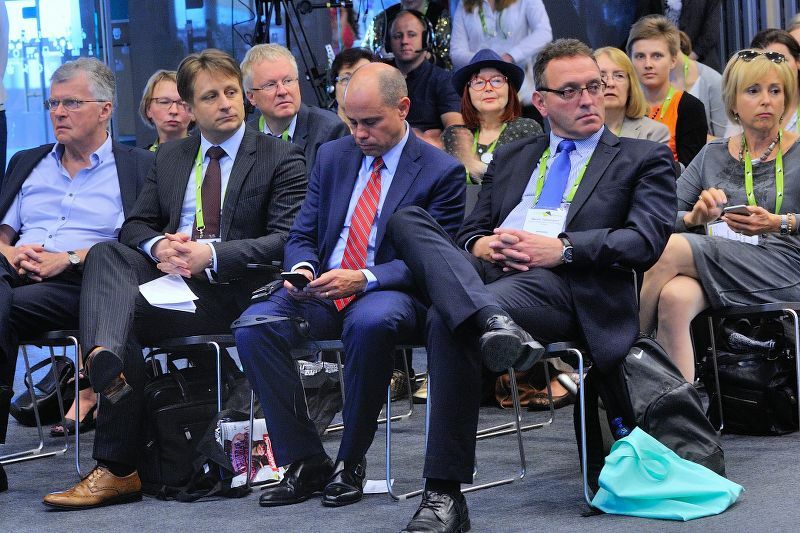 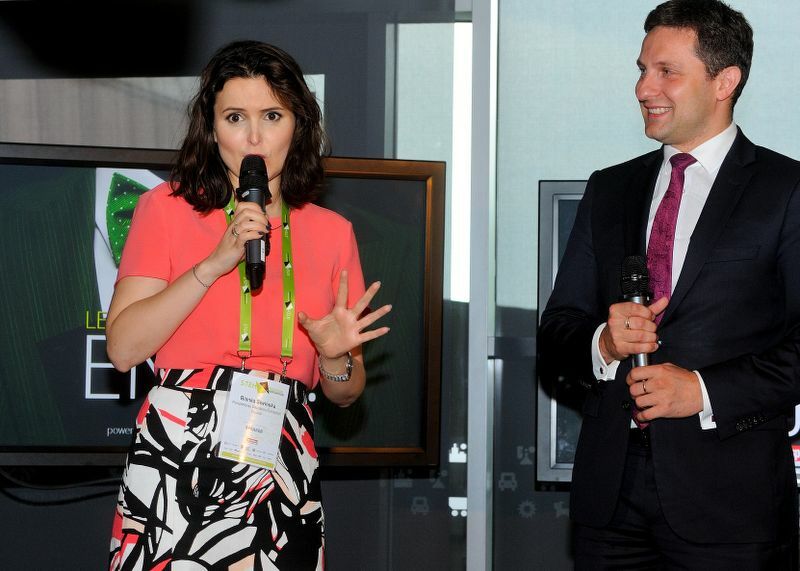 The hosts of the Round Table were the Education Foundation Perspektywy and Siemens. 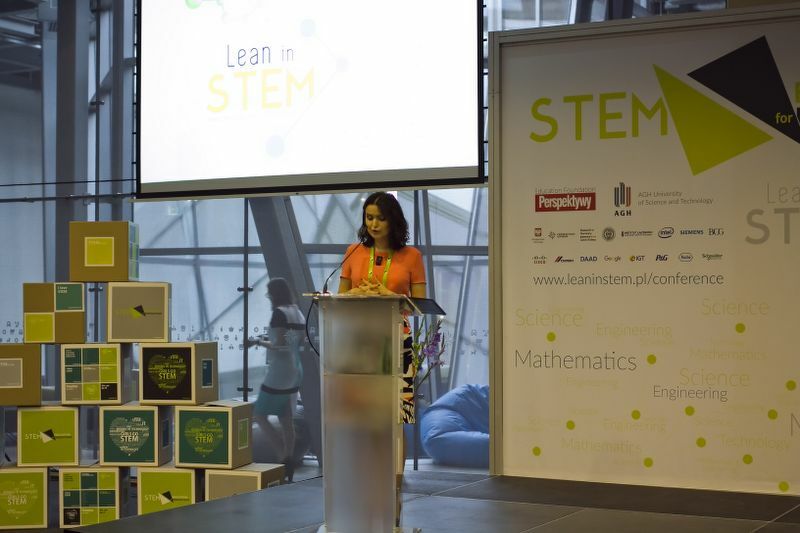 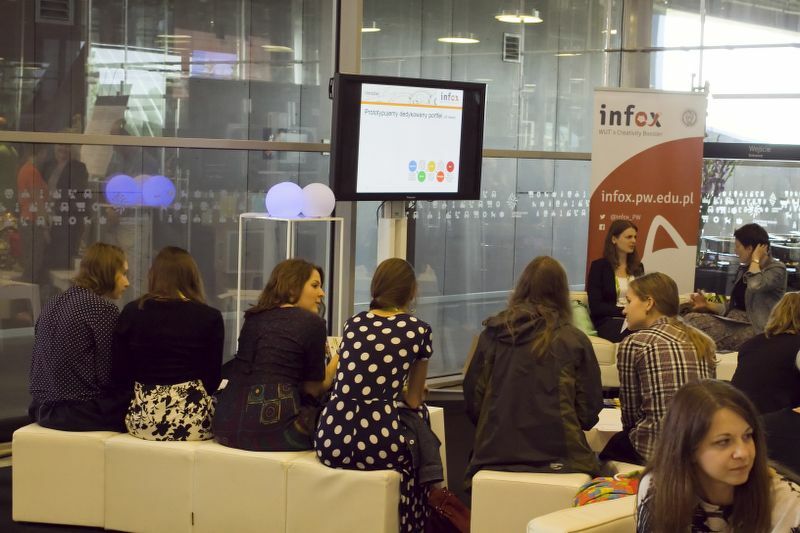 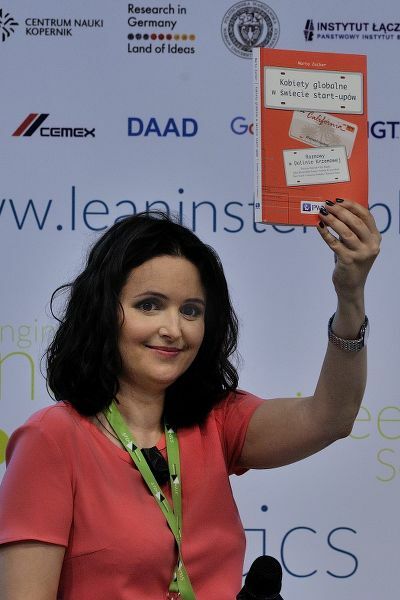 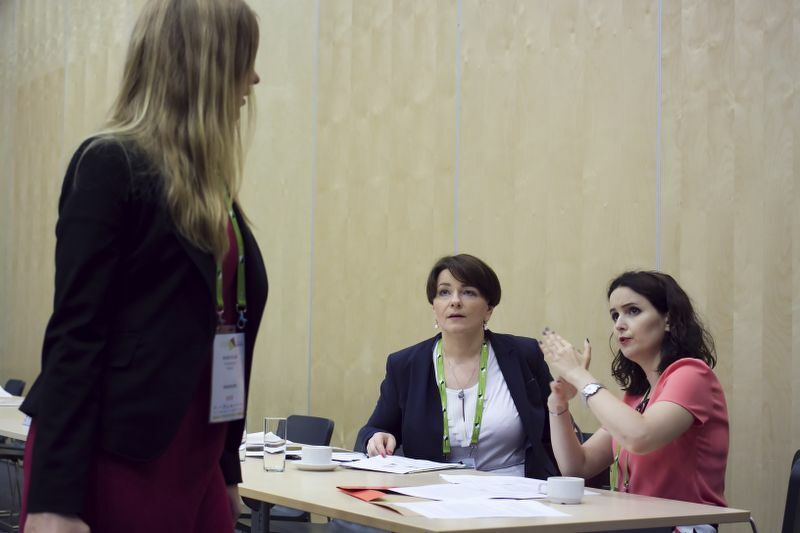 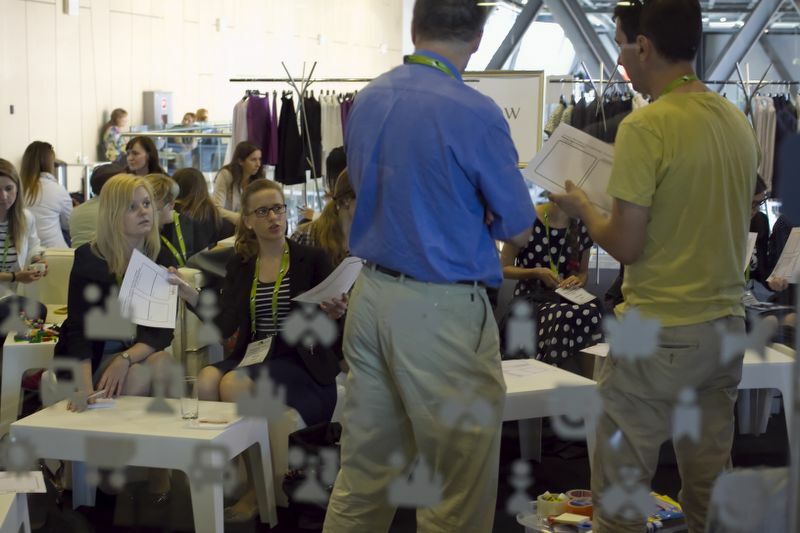 Do you want to know more about Lean in STEM conference 2017? 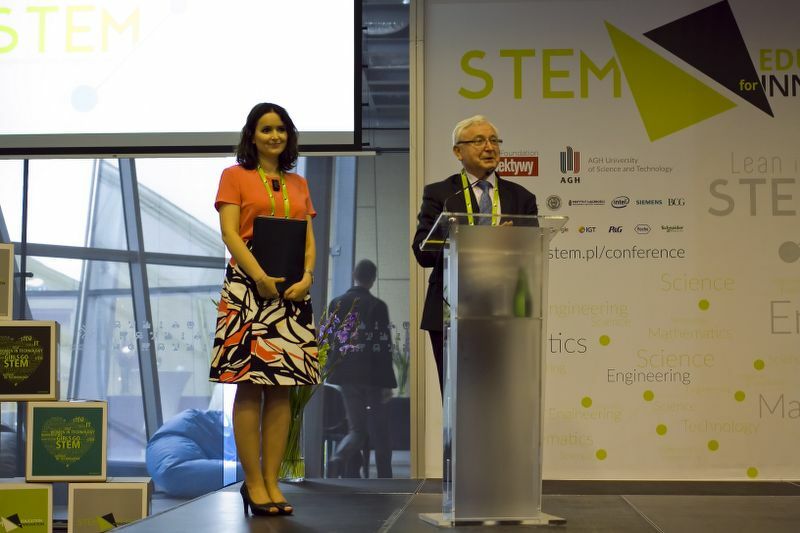 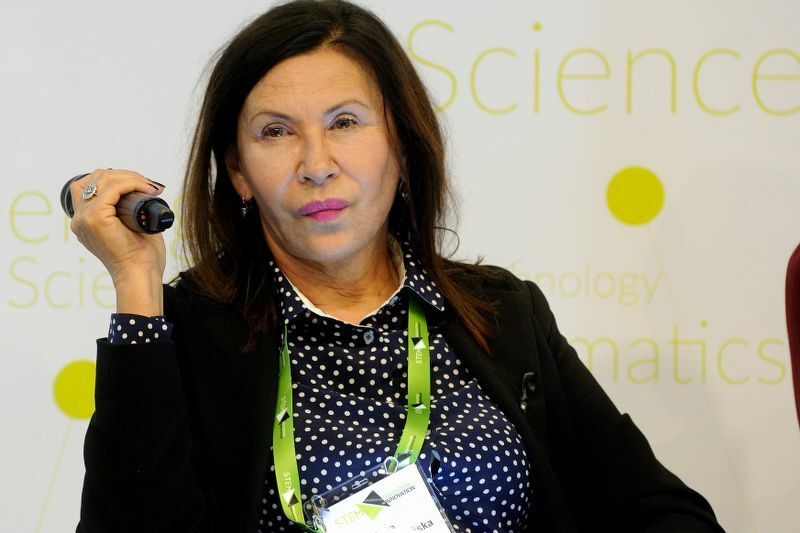 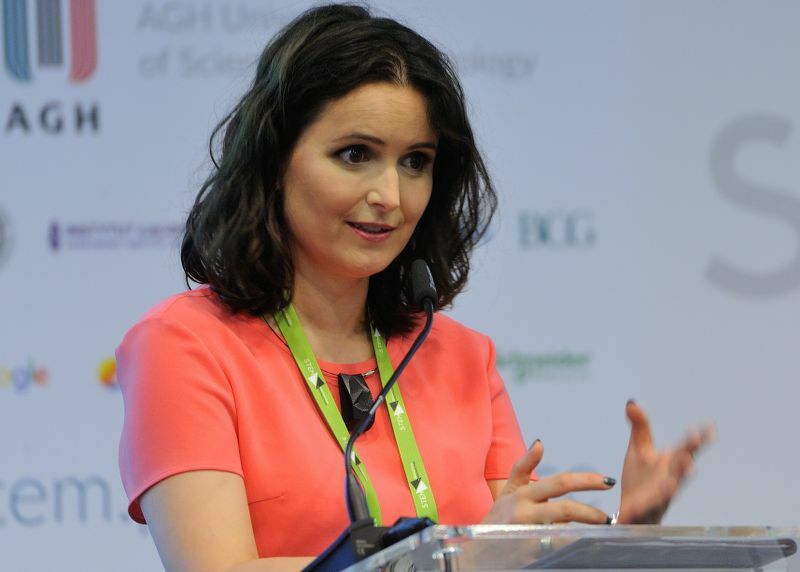 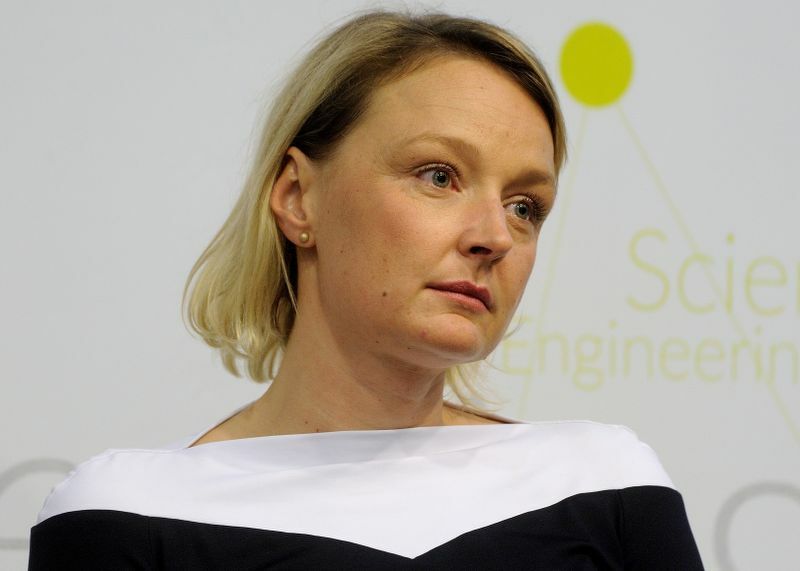 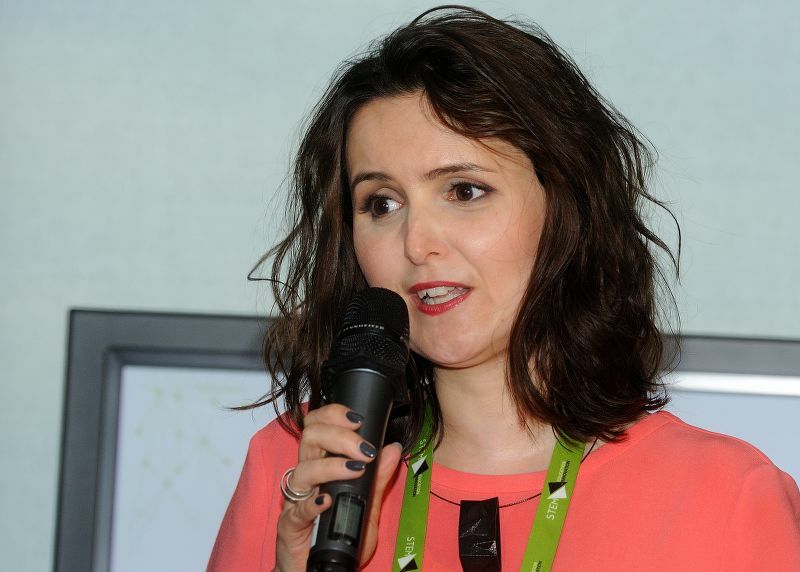 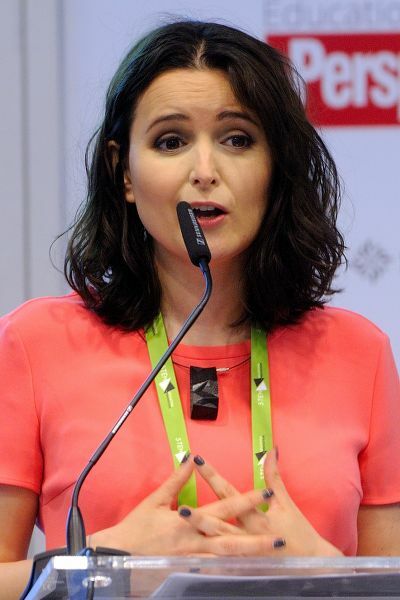 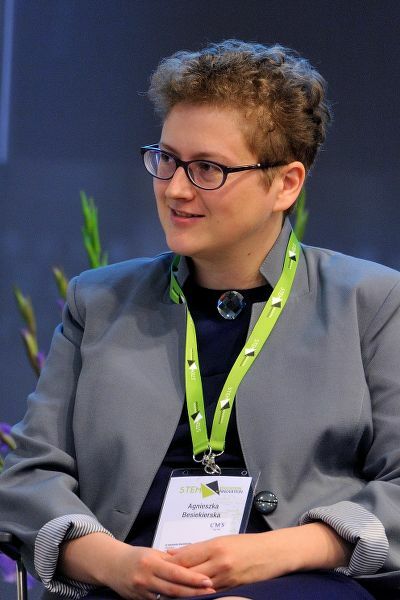 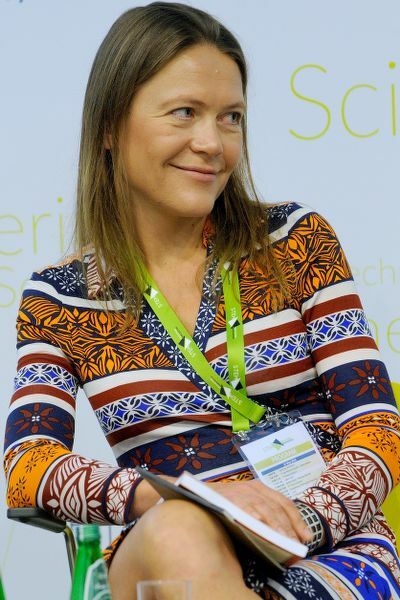 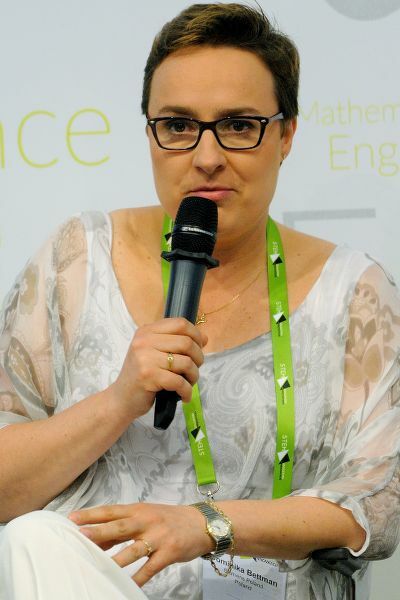 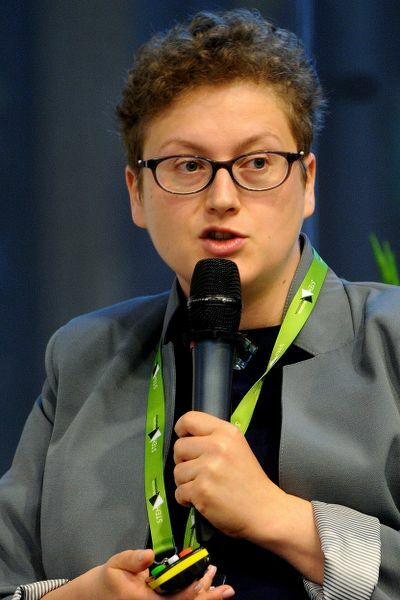 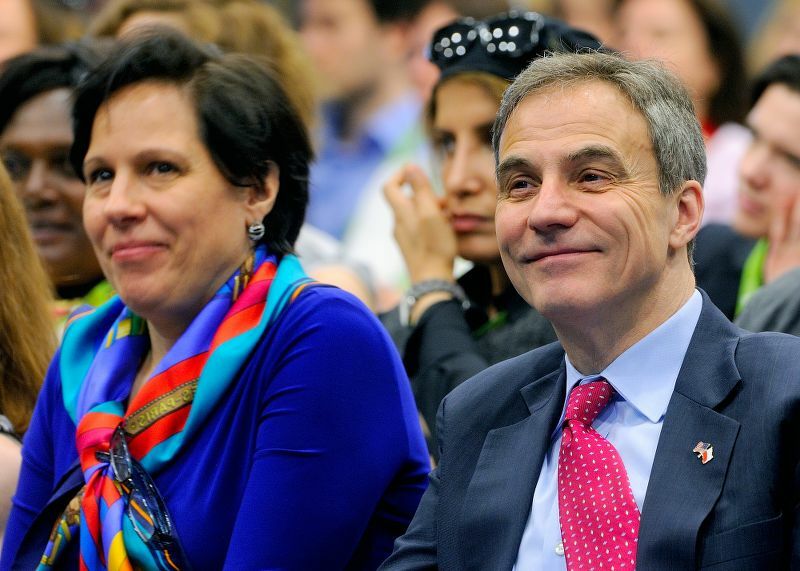 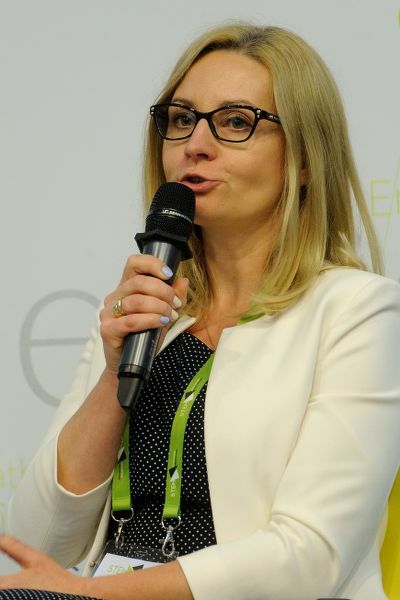 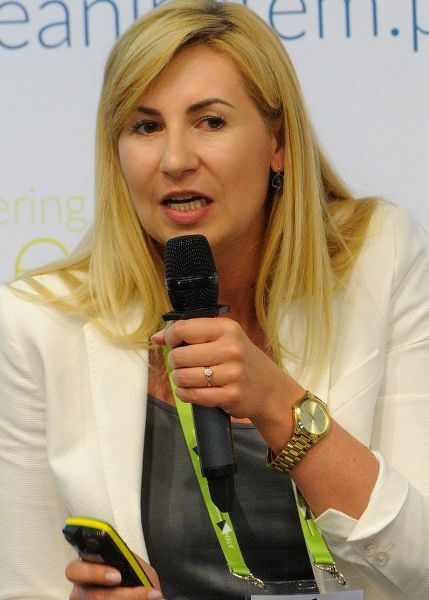 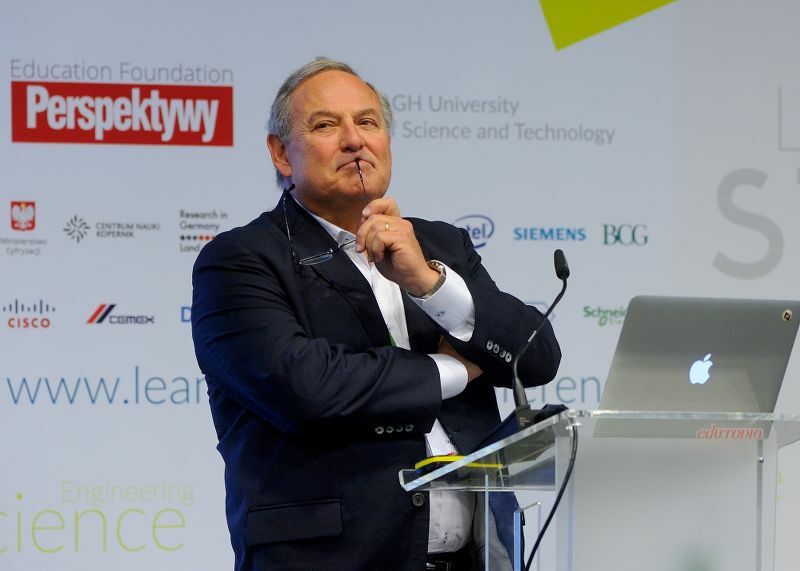 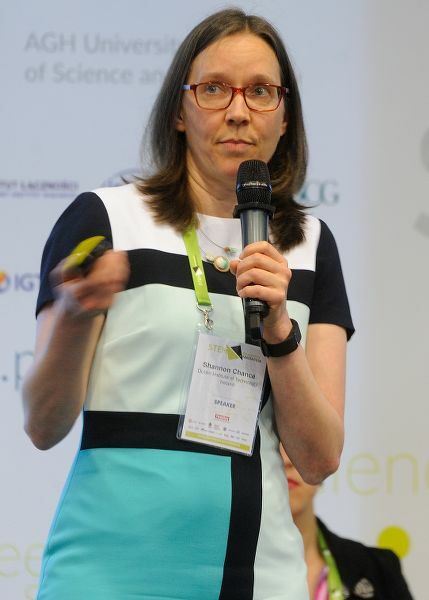 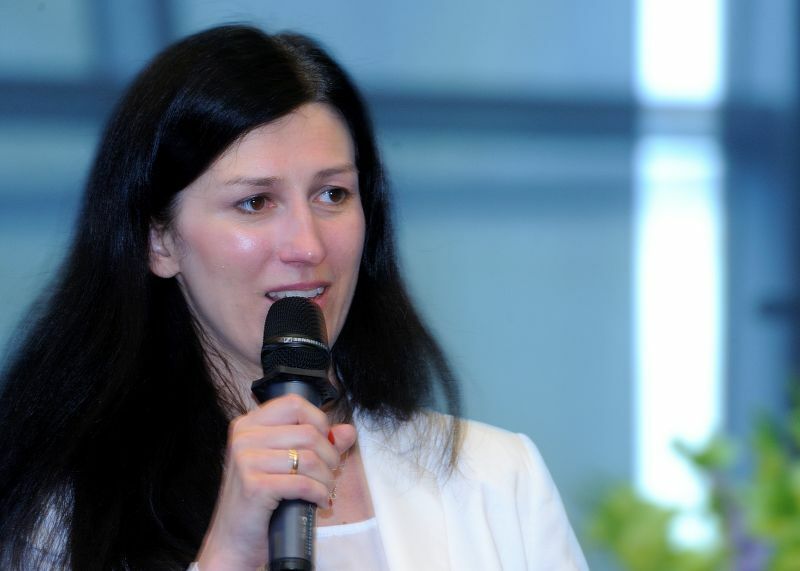 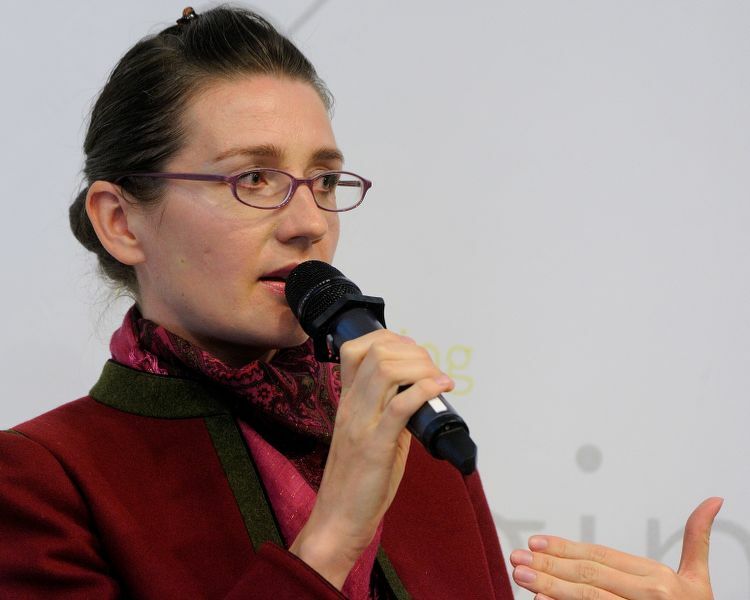 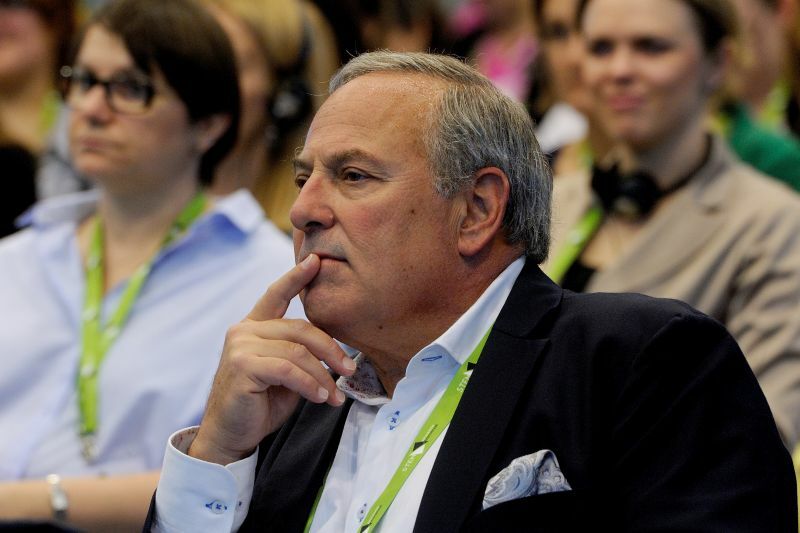 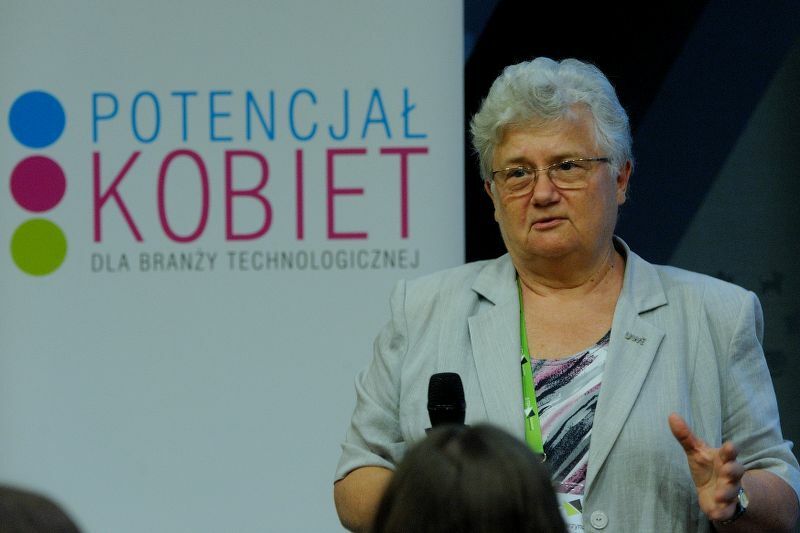 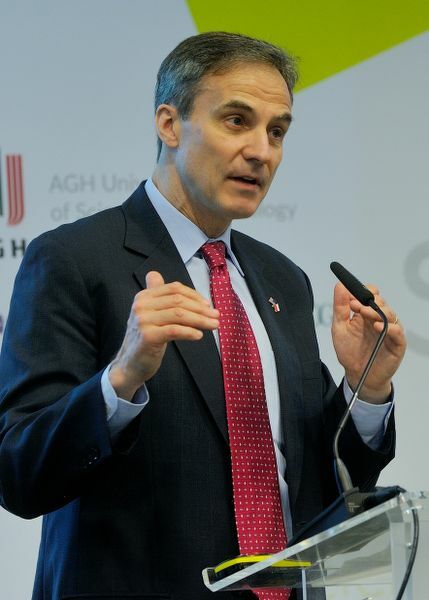 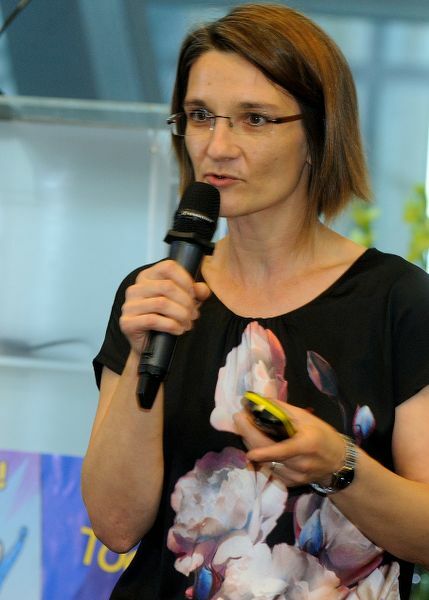 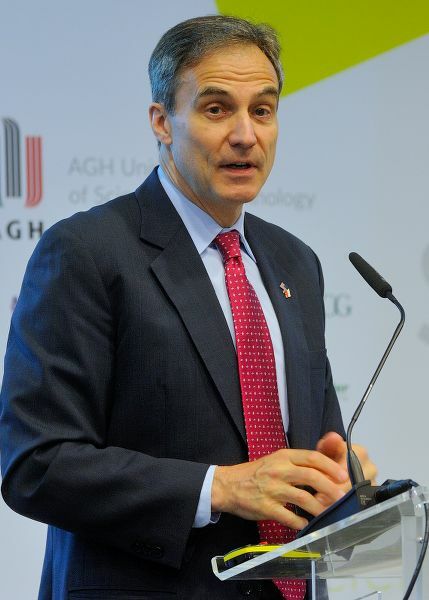 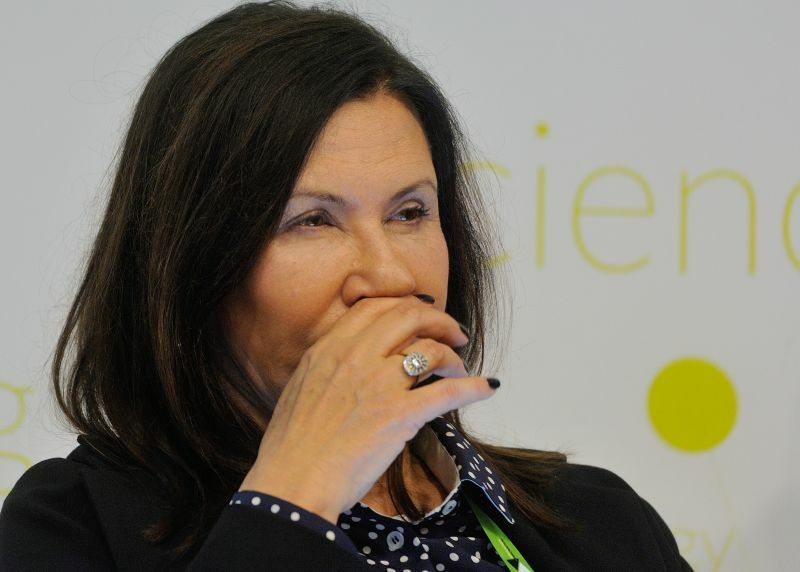 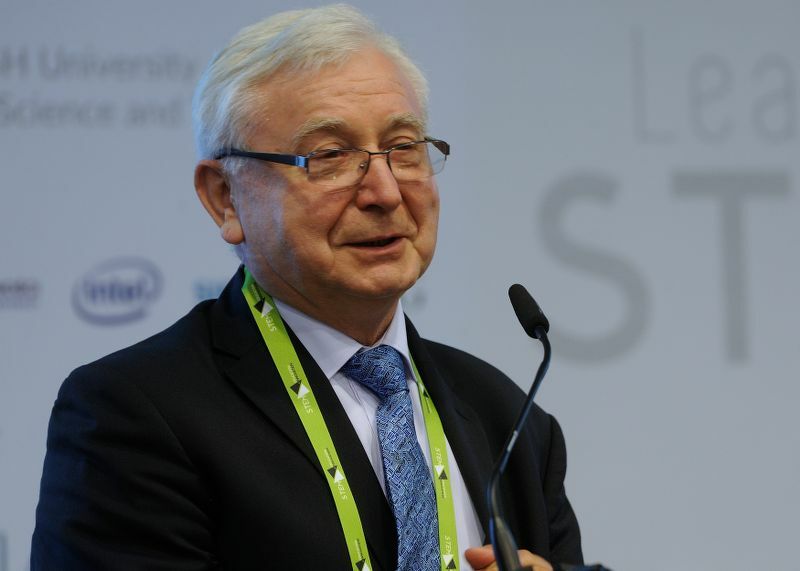 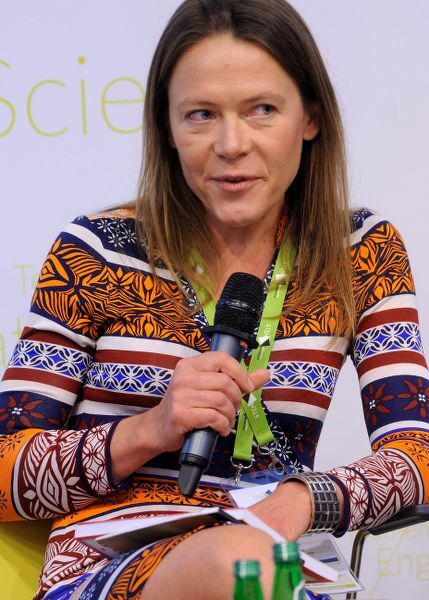 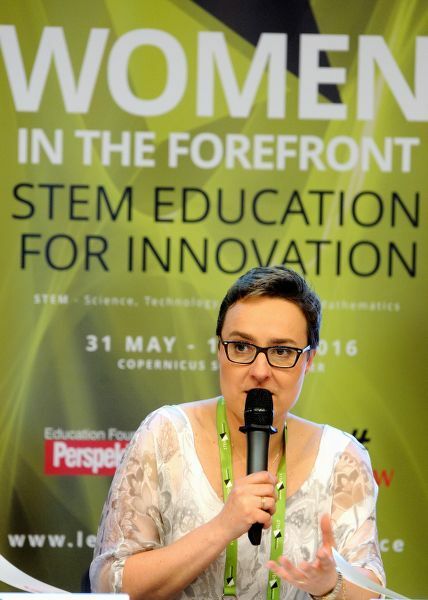 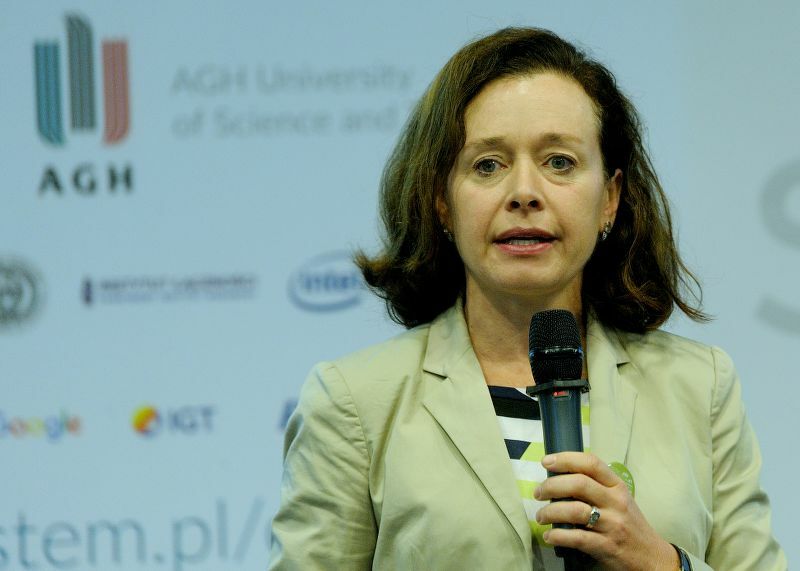 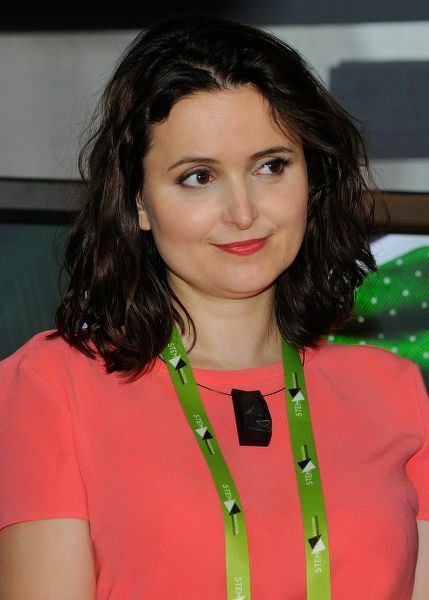 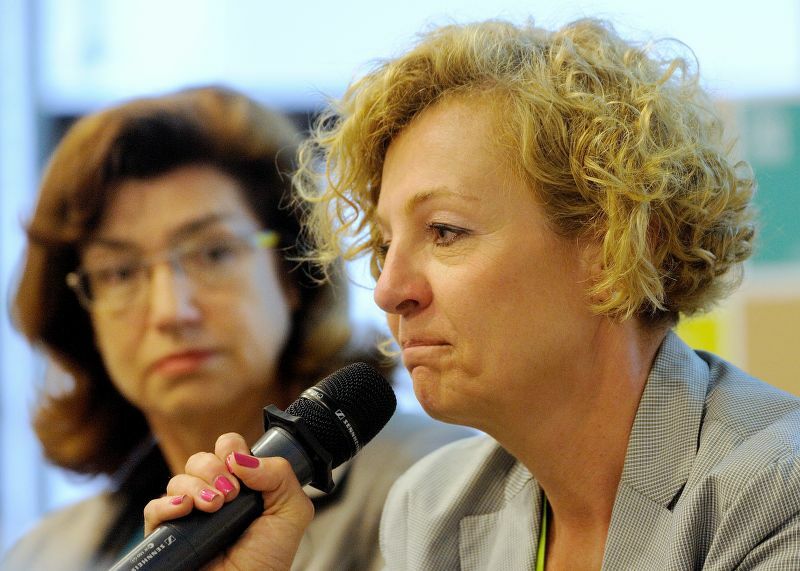 "We choose to take steps to boost STEM area in Poland, in Europe and around the world, not because this is easy, but because it is hard and very important." 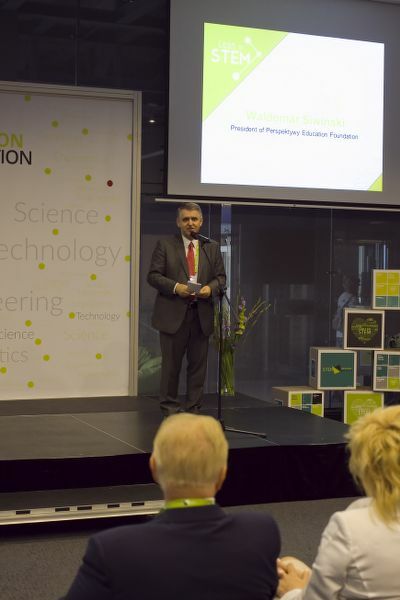 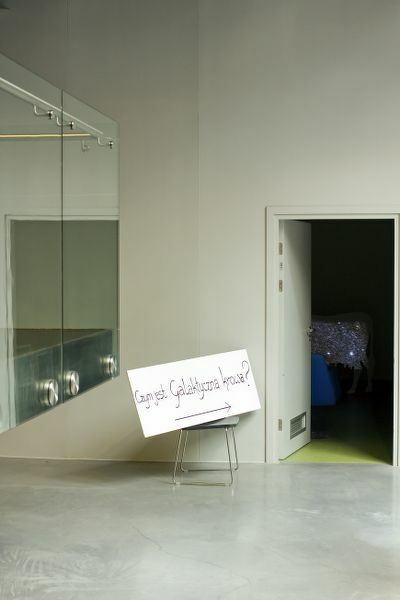 Because Education Foundation Perspektywy has been interested in only wise and important issues for 20 years. 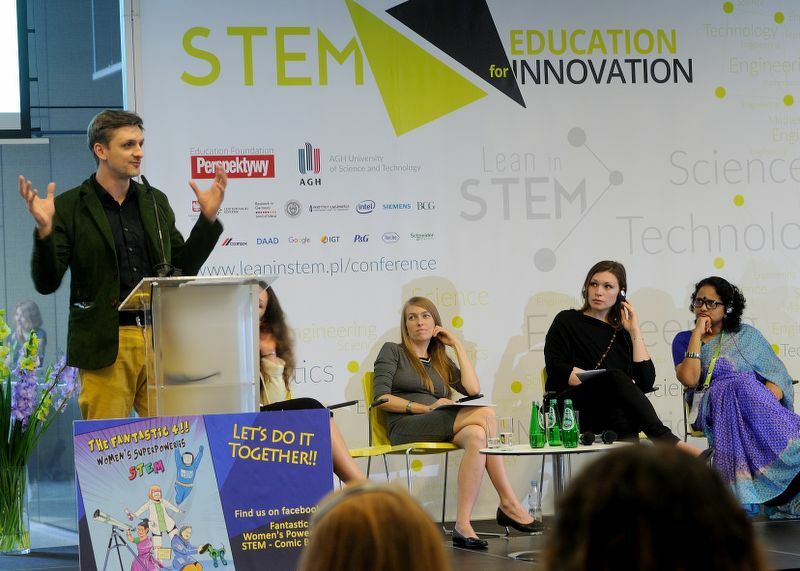 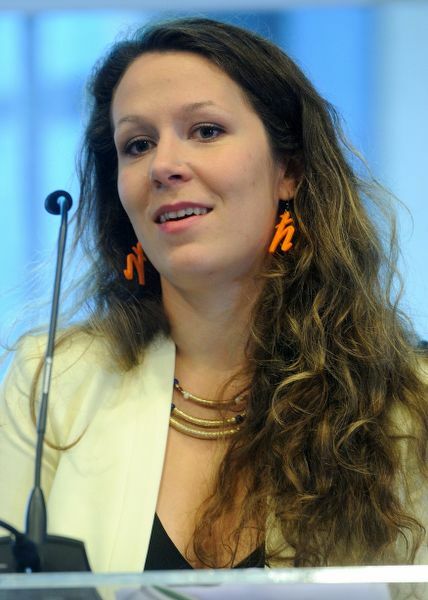 Head of the project "Lean in STEM"
Logistic Officer "Lean in STEM"
Press Officer "Lean in STEM"